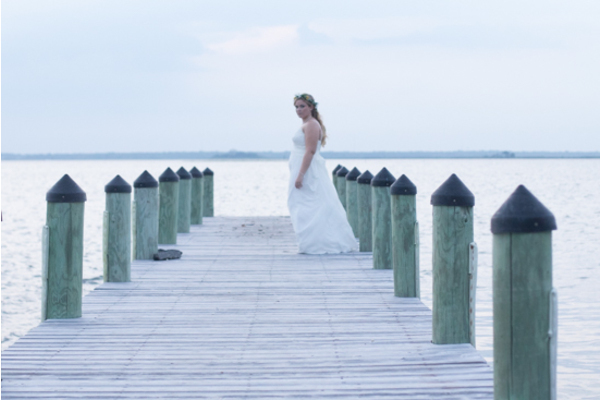 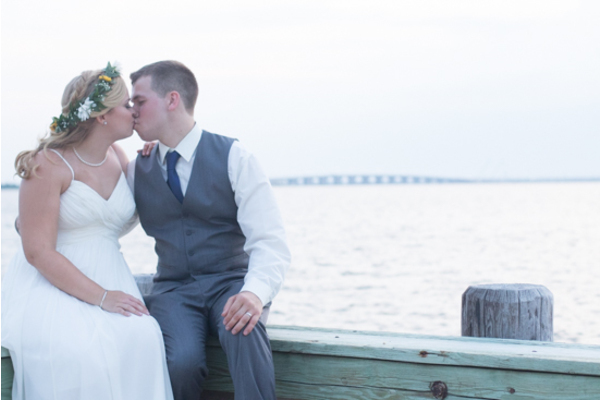 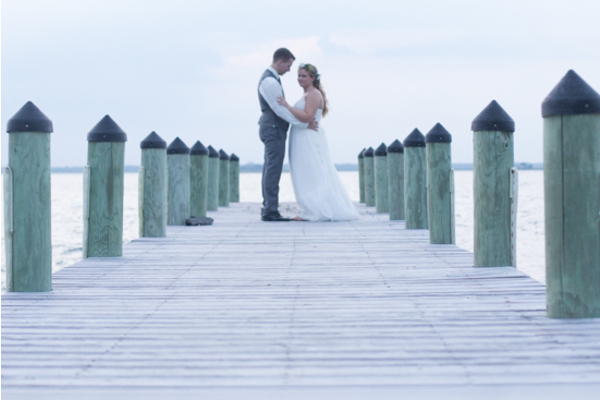 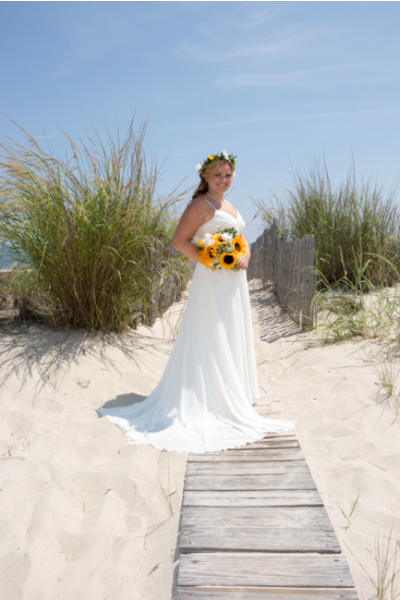 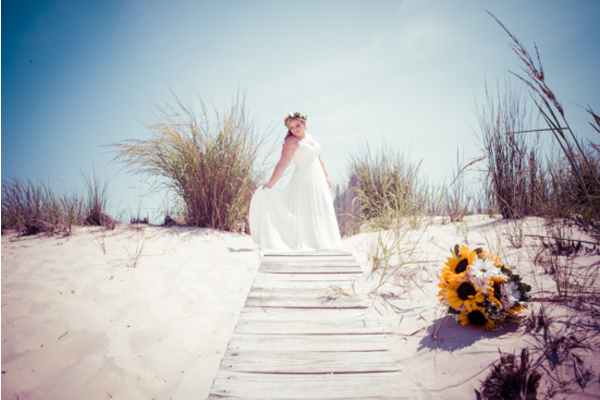 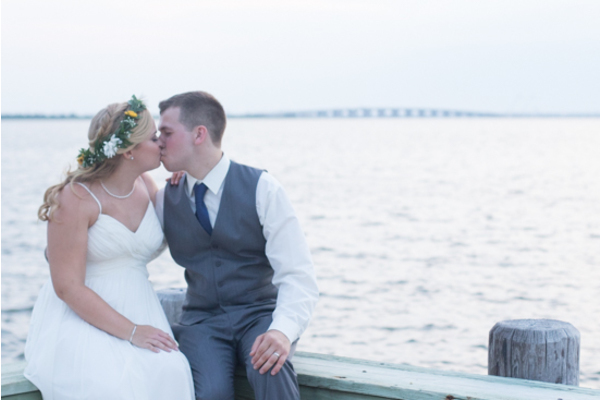 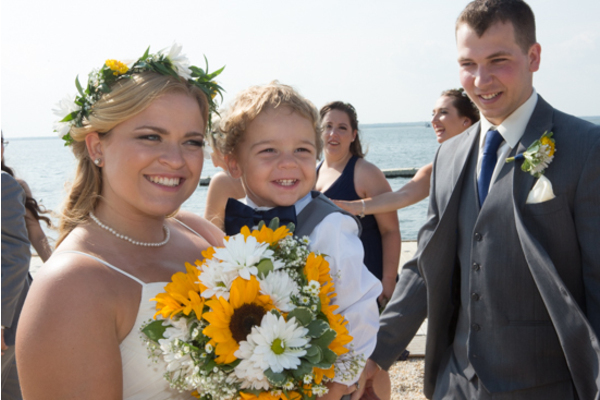 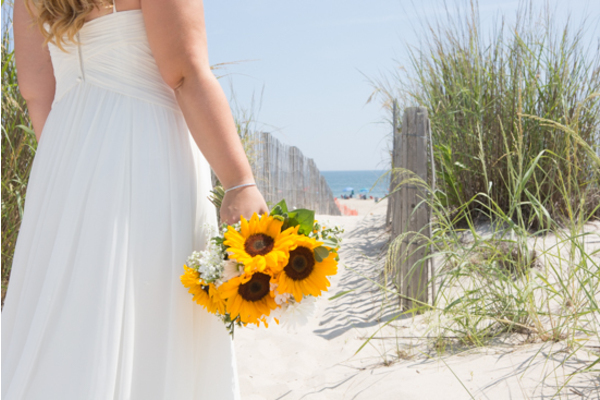 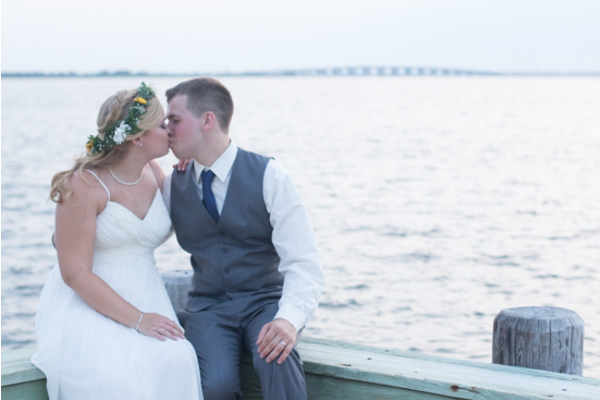 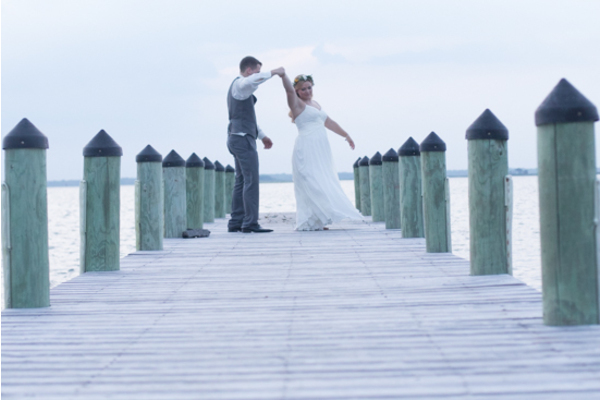 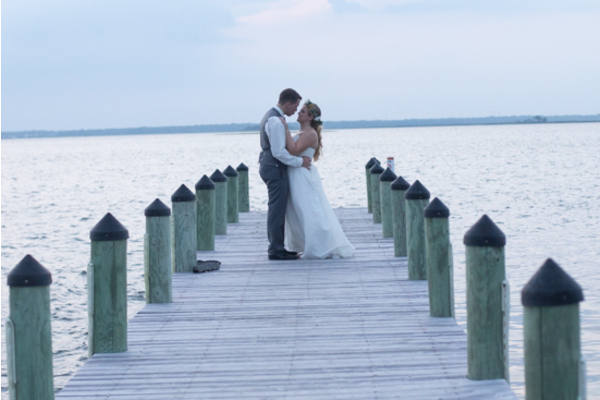 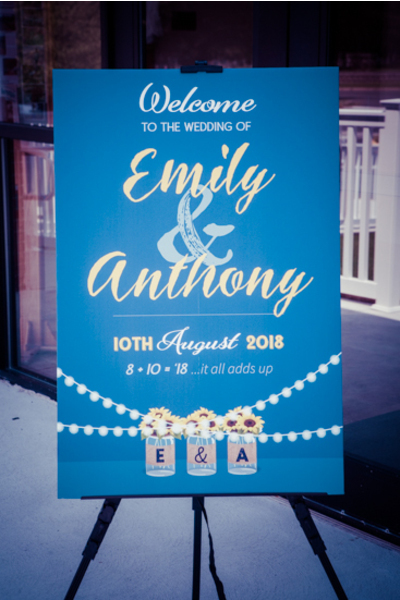 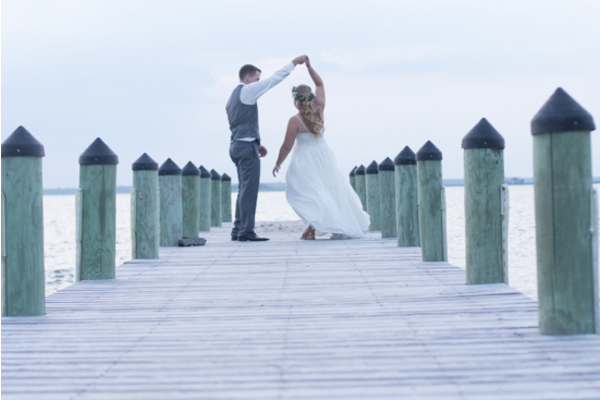 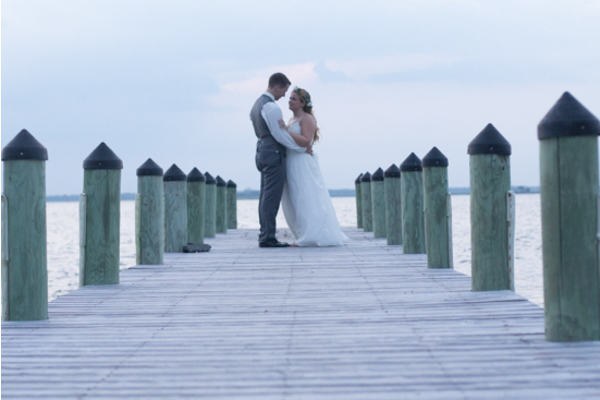 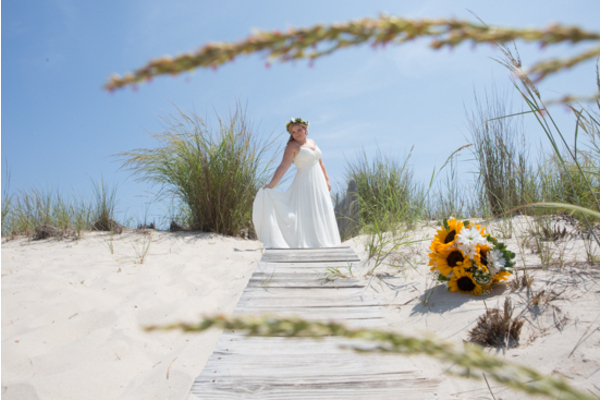 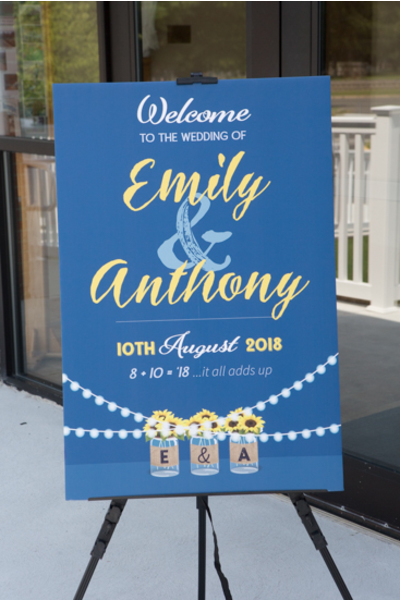 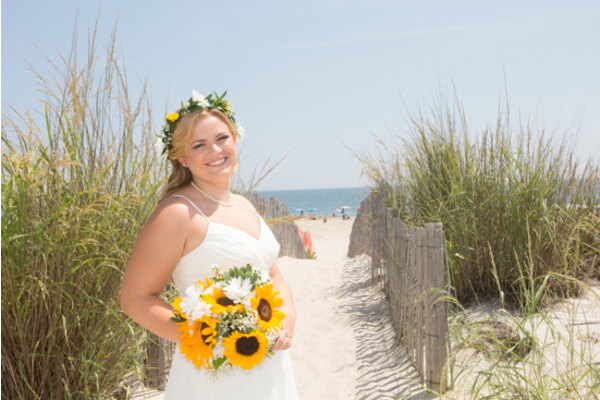 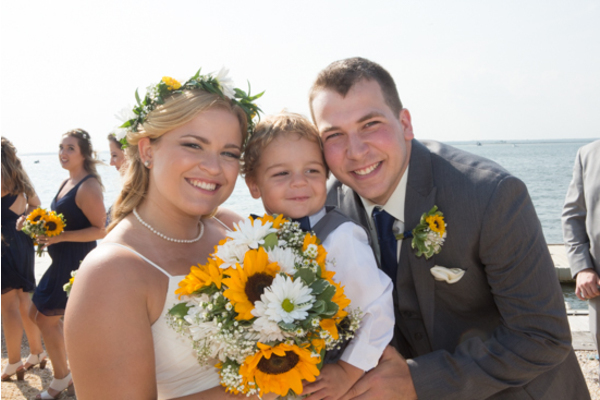 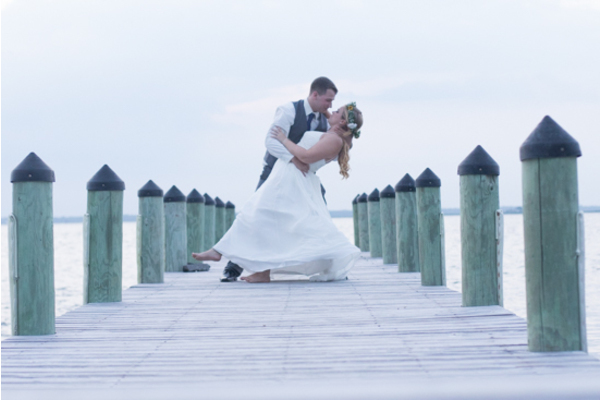 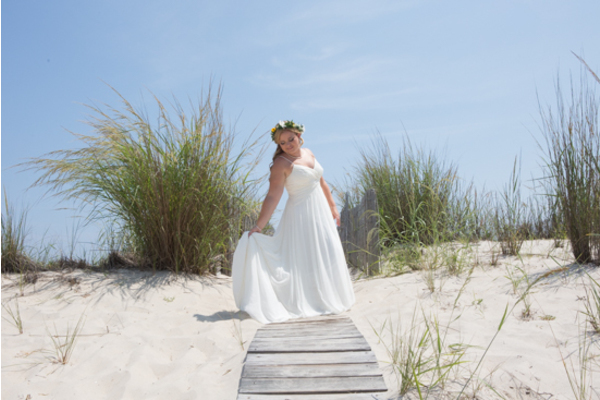 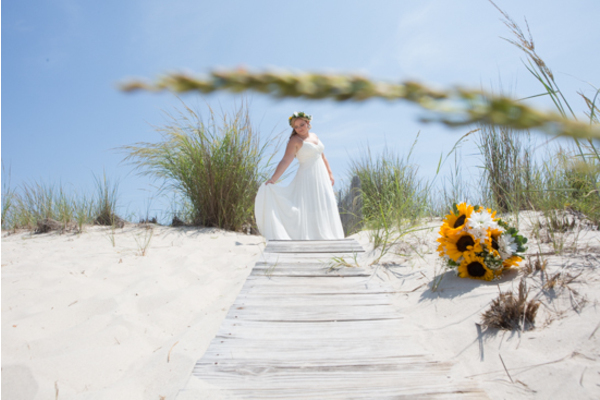 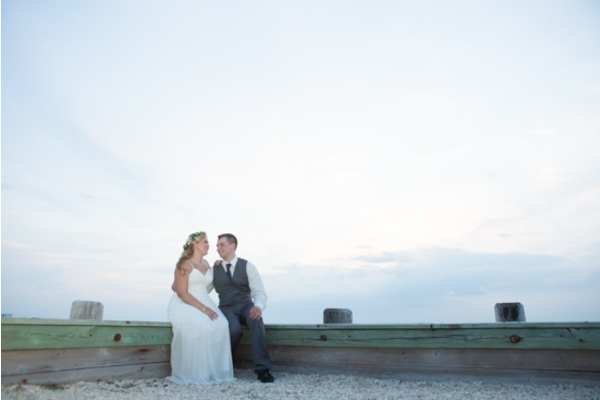 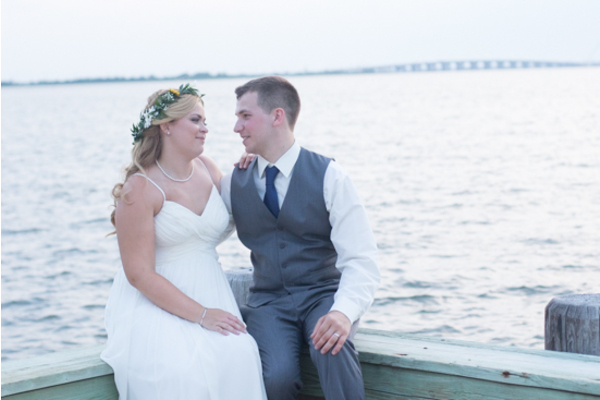 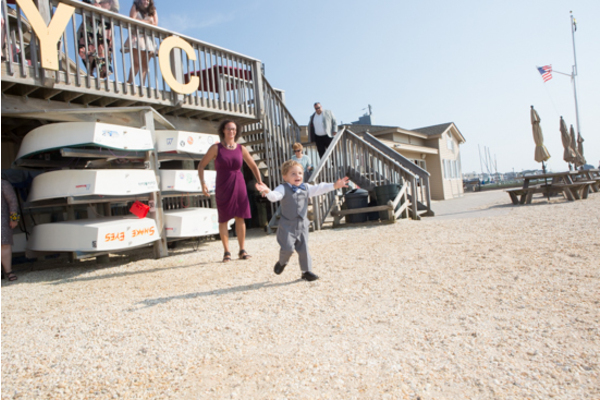 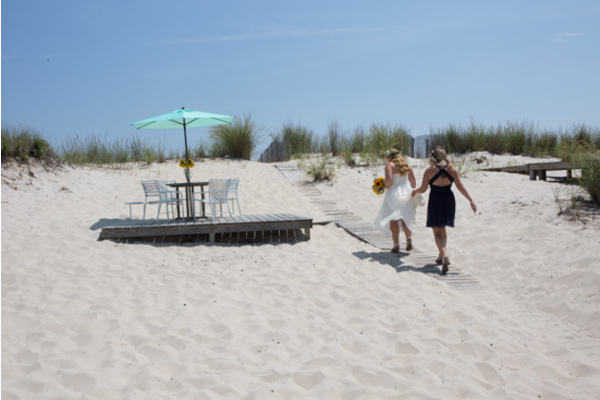 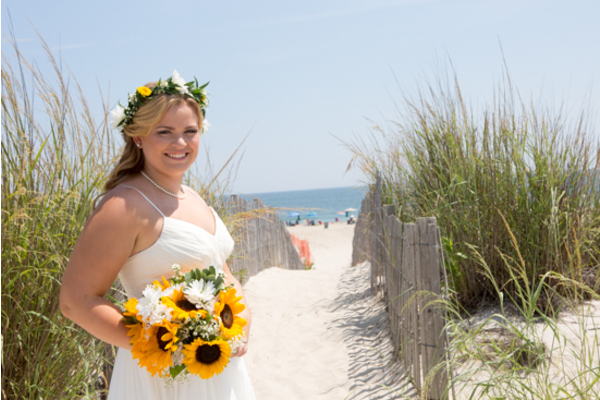 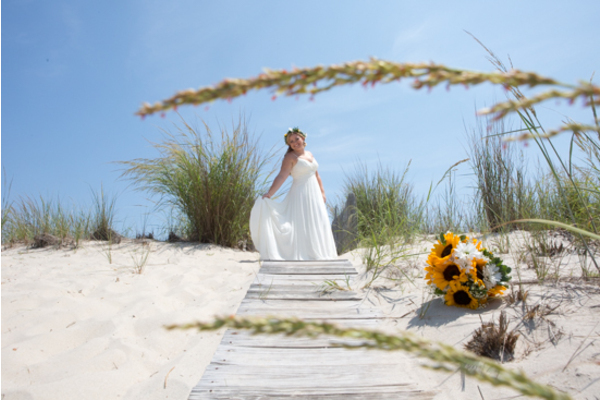 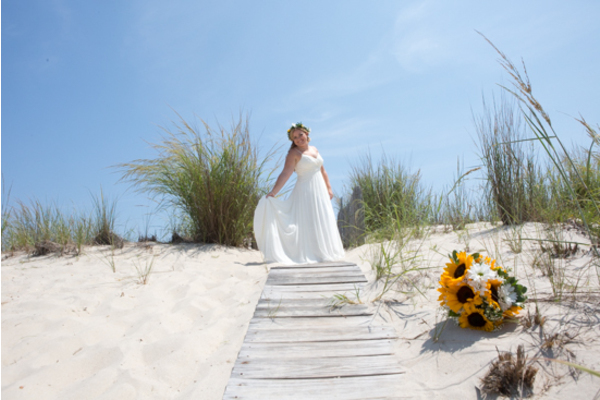 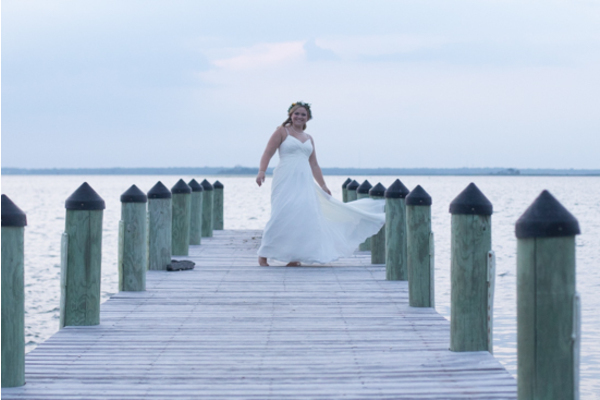 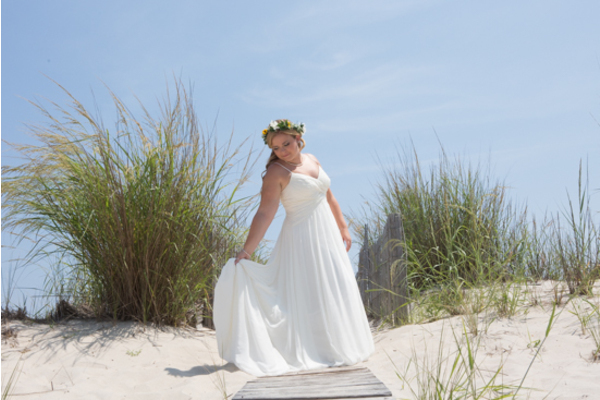 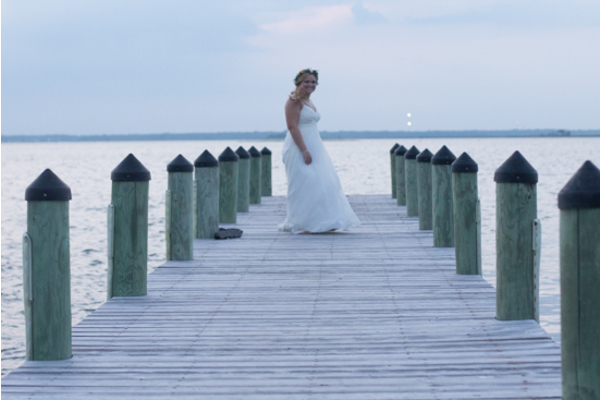 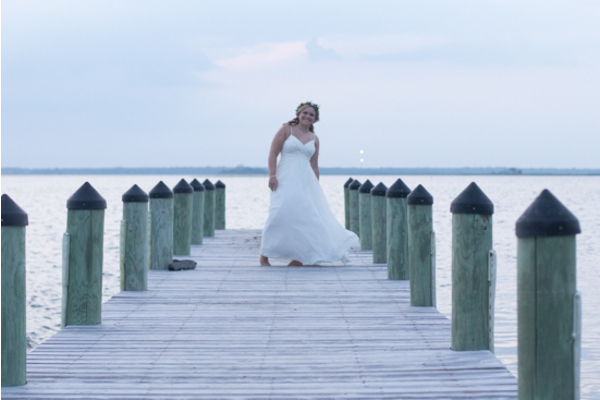 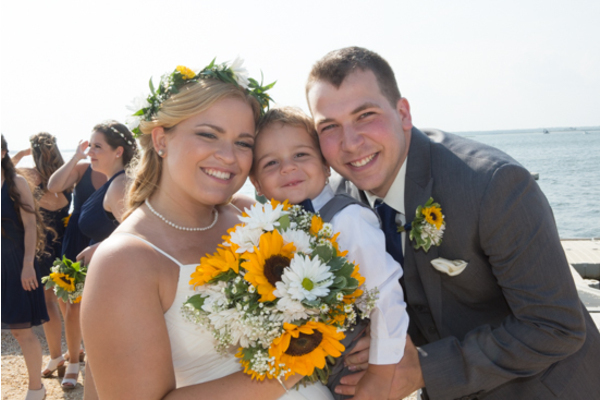 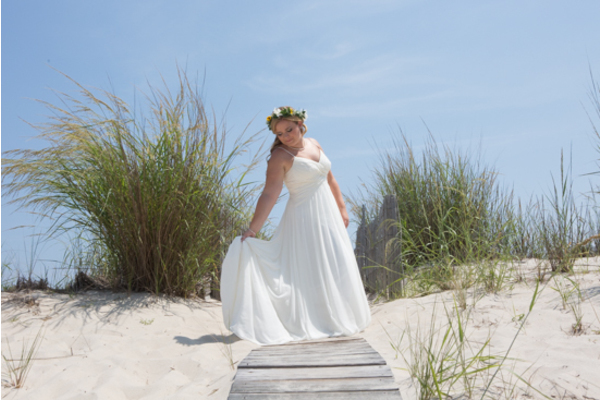 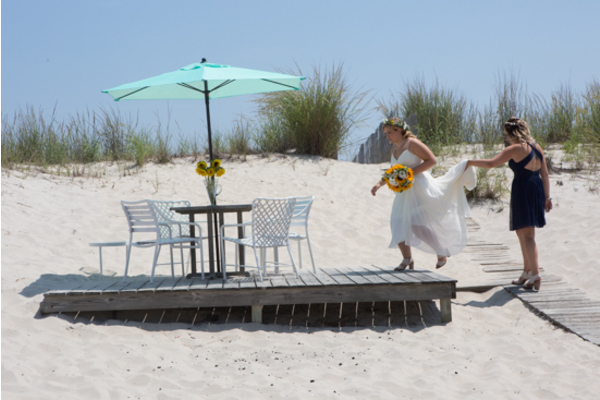 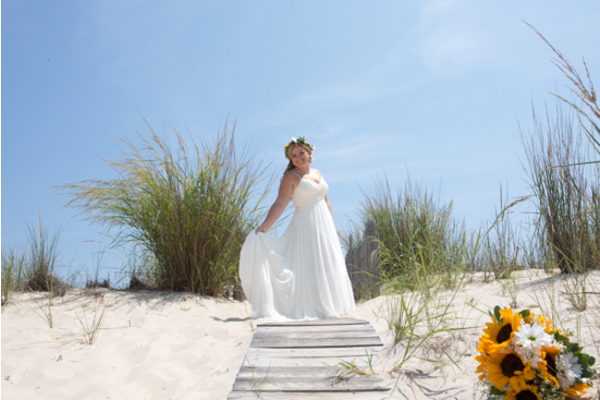 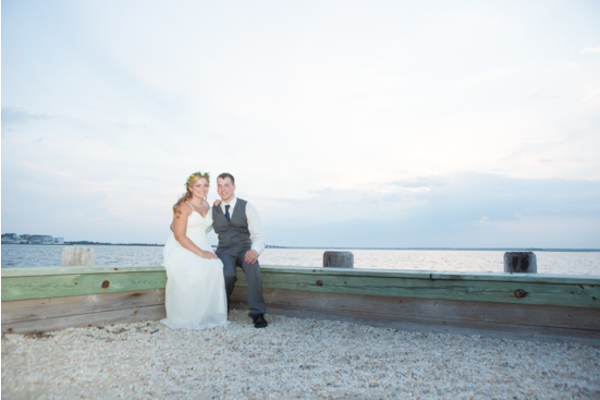 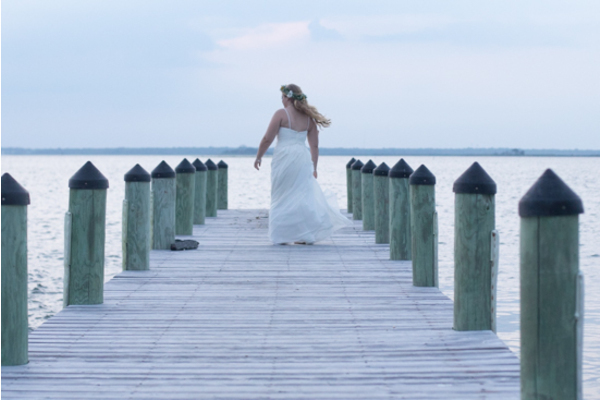 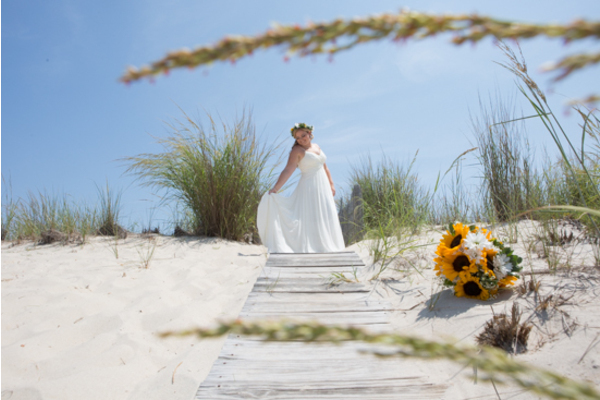 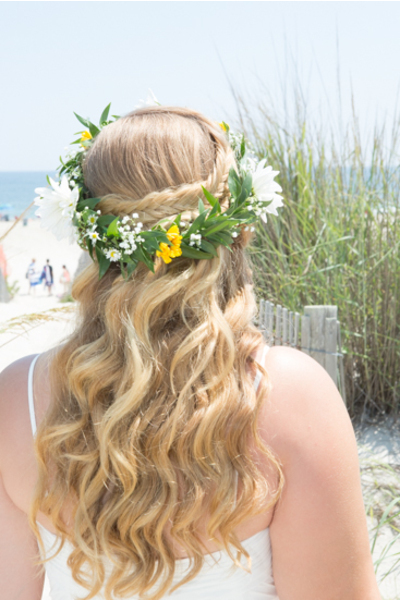 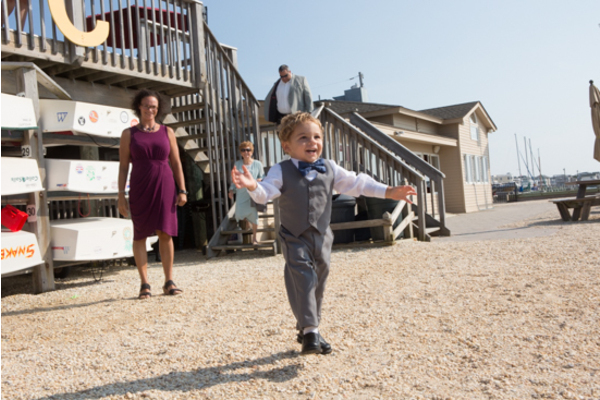 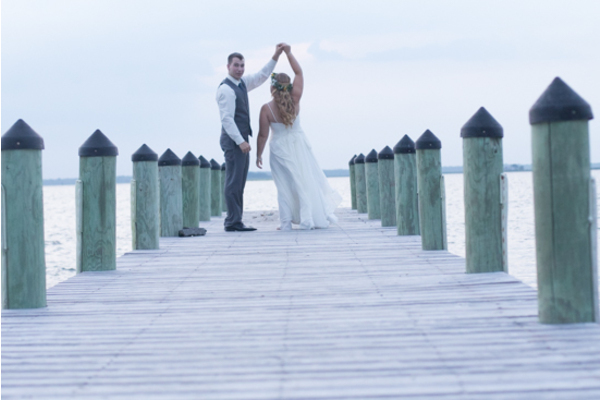 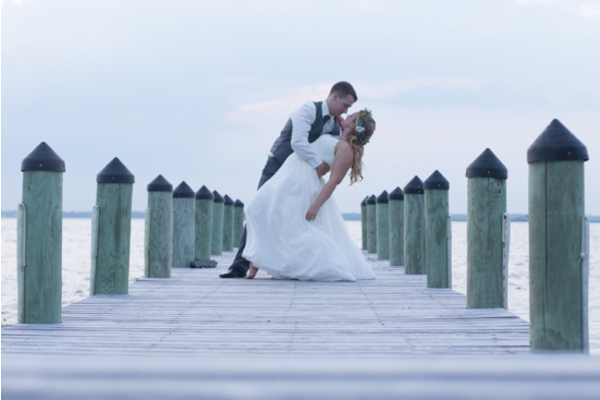 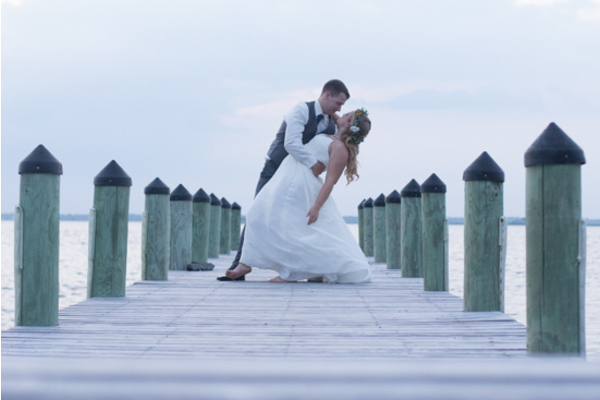 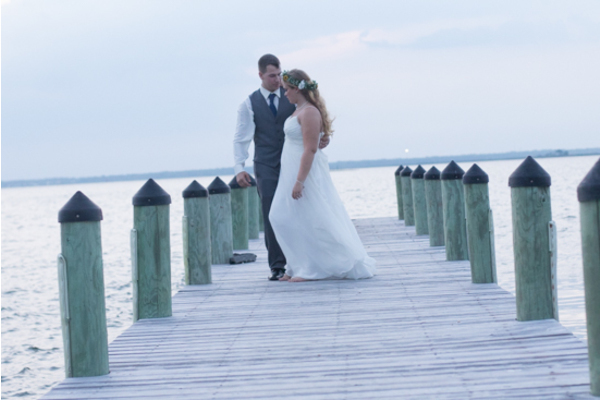 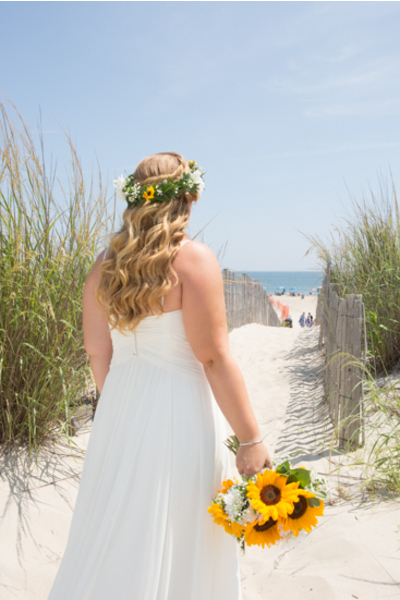 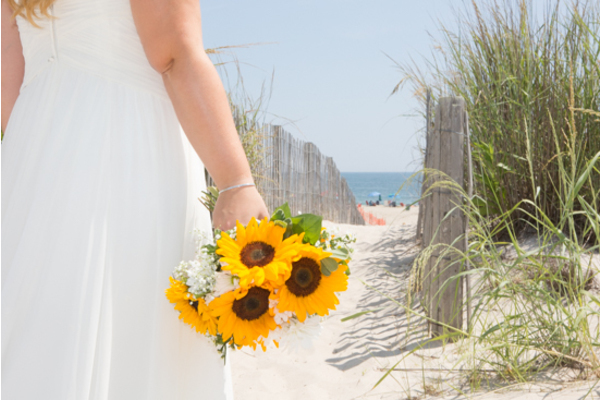 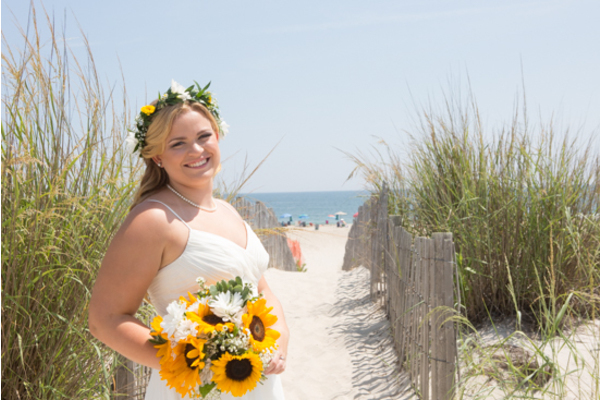 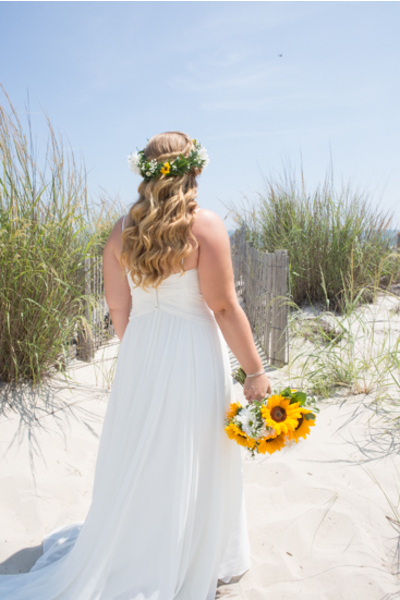 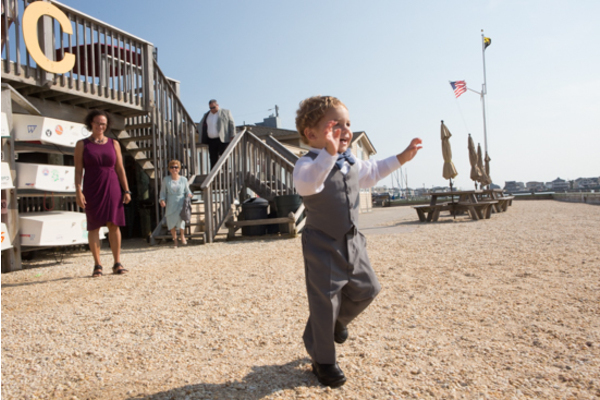 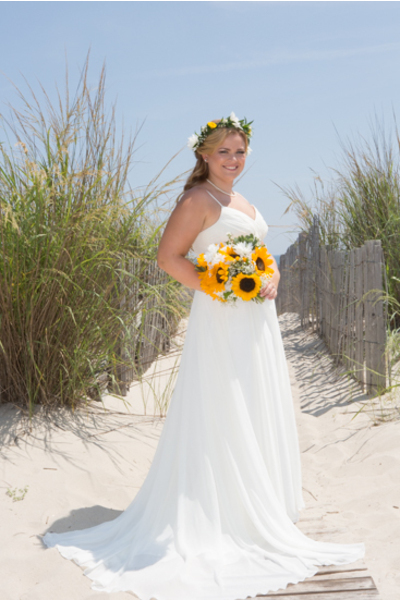 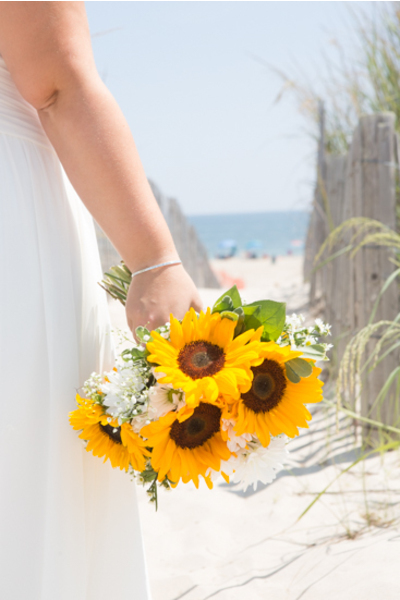 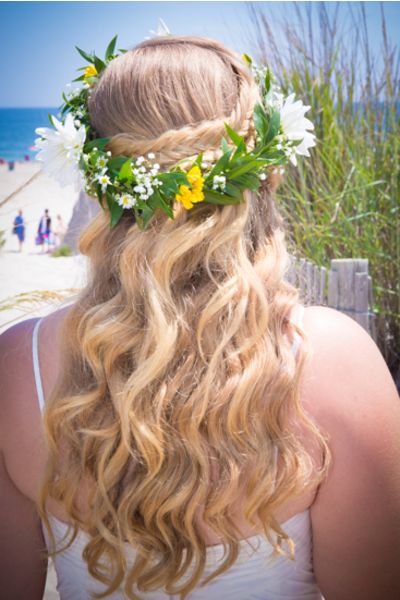 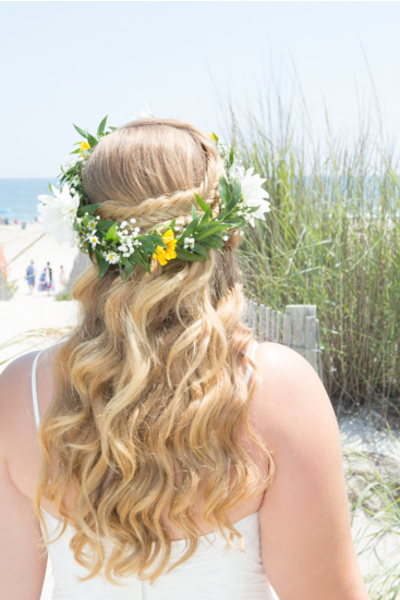 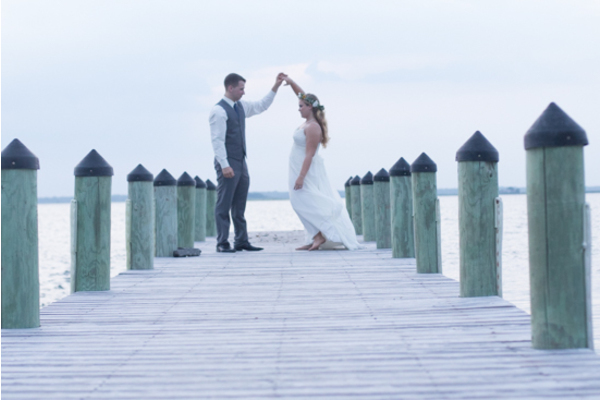 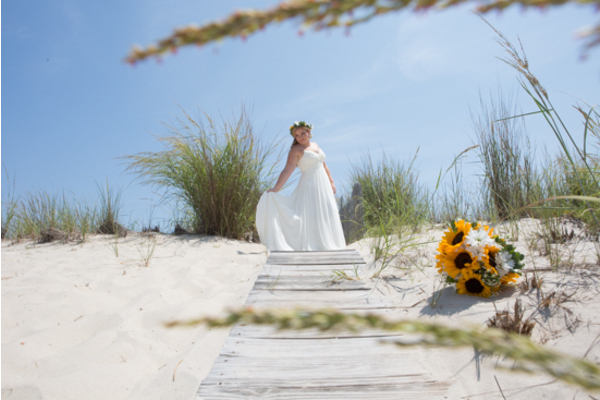 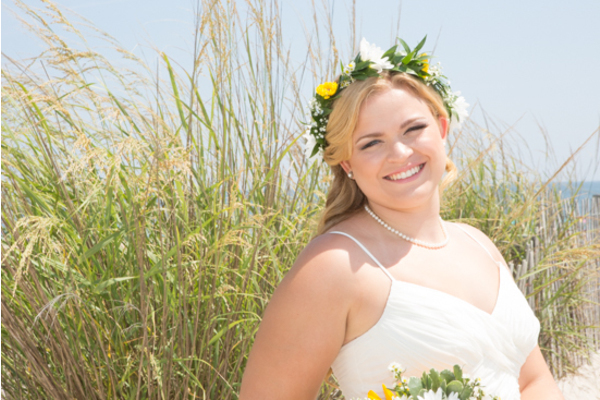 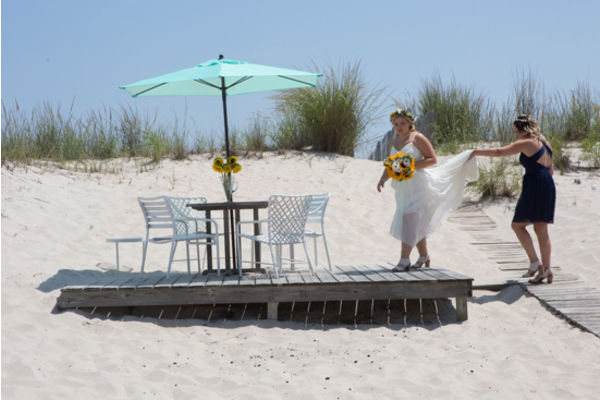 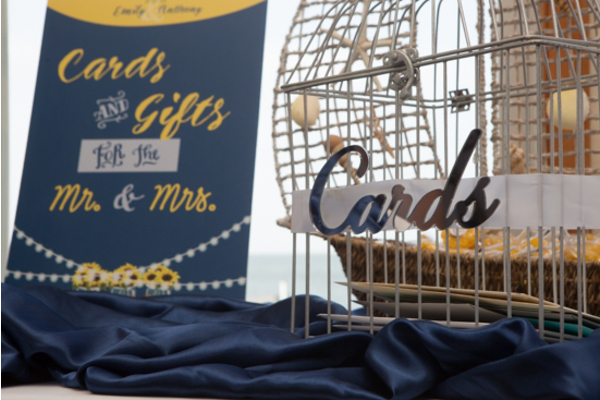 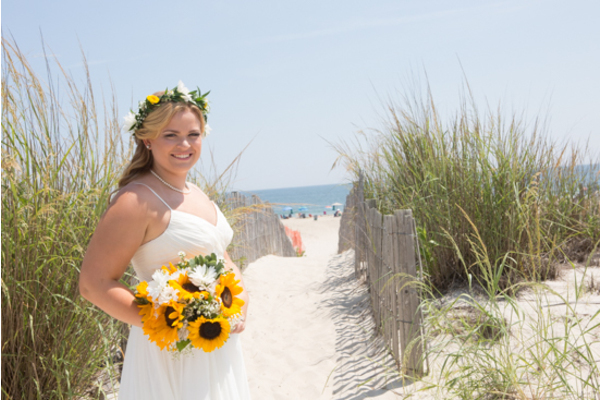 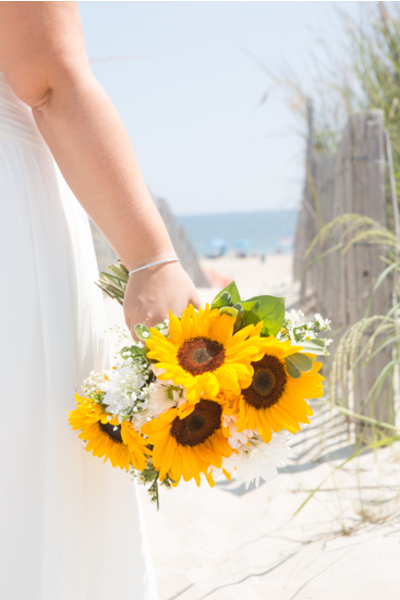 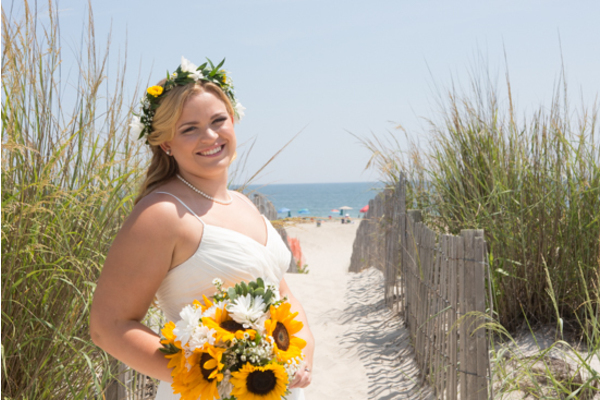 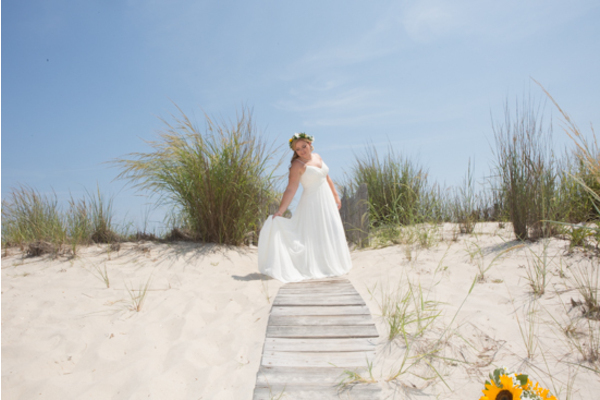 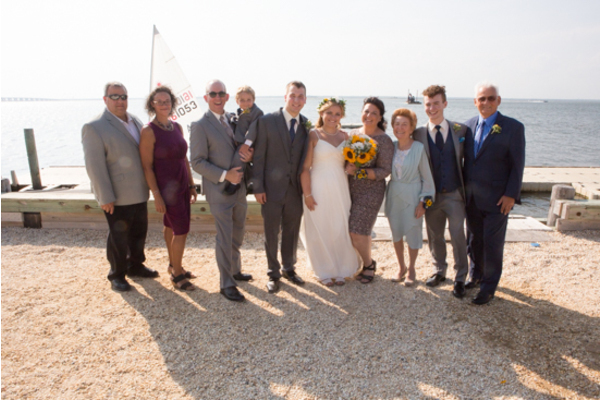 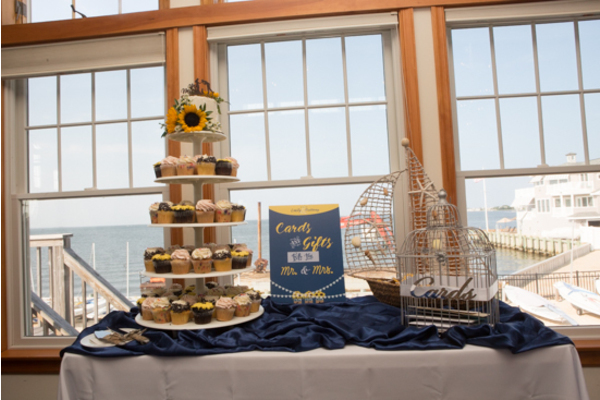 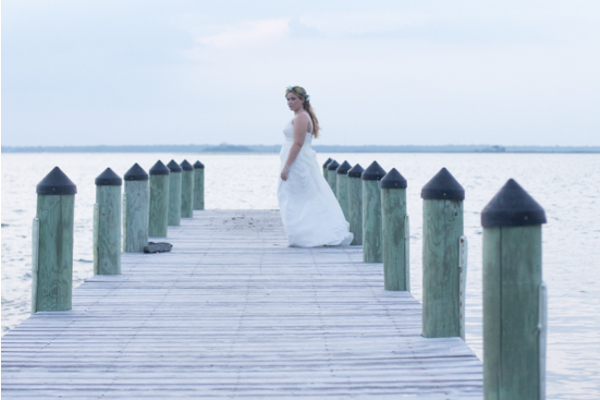 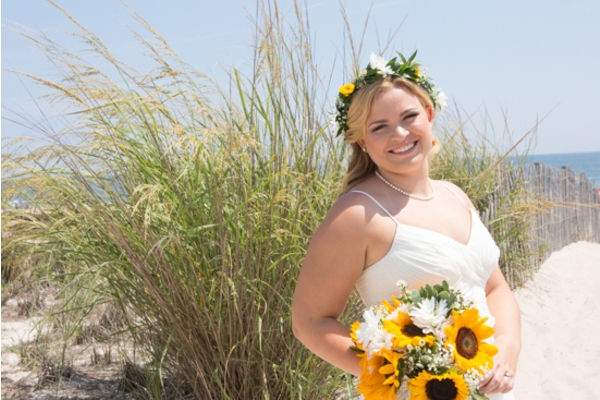 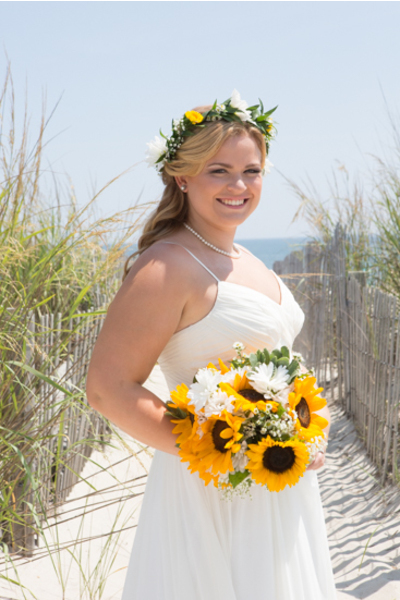 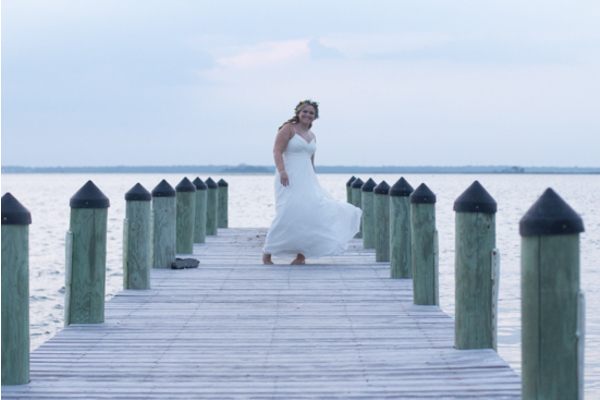 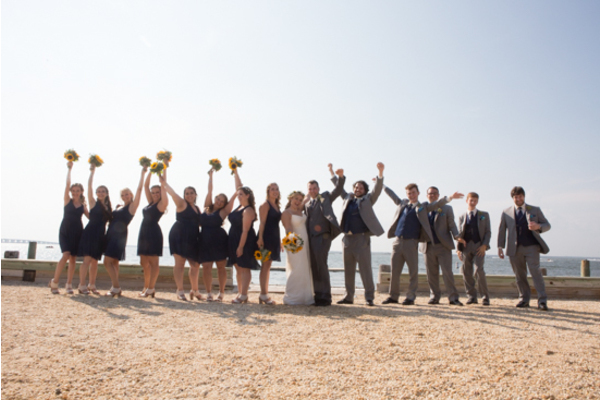 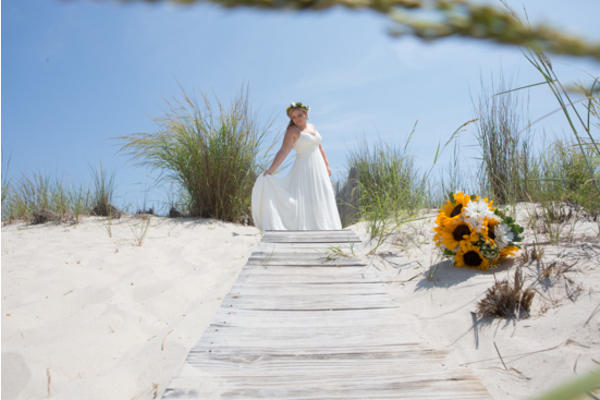 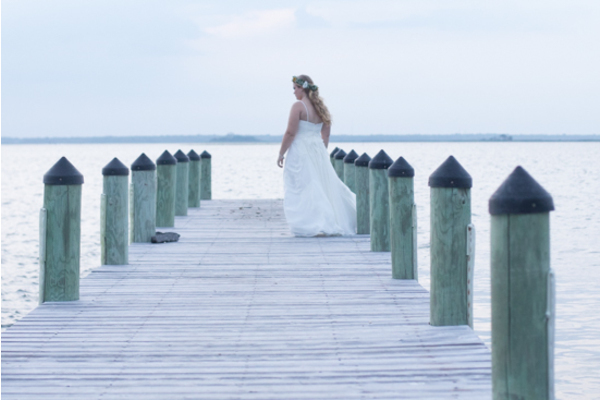 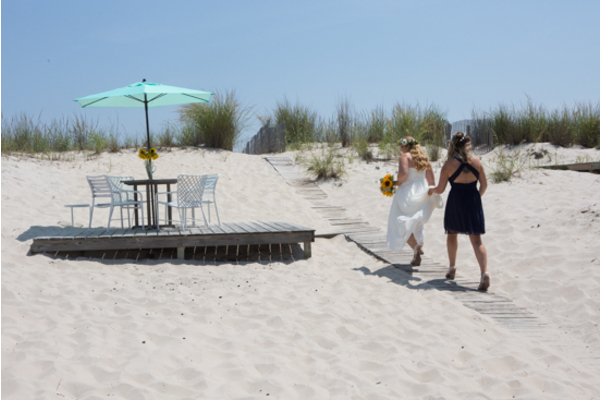 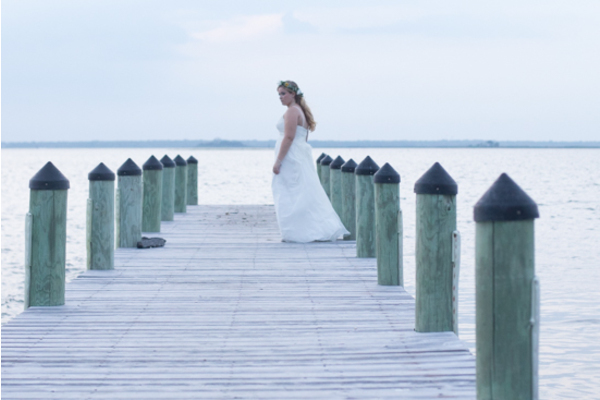 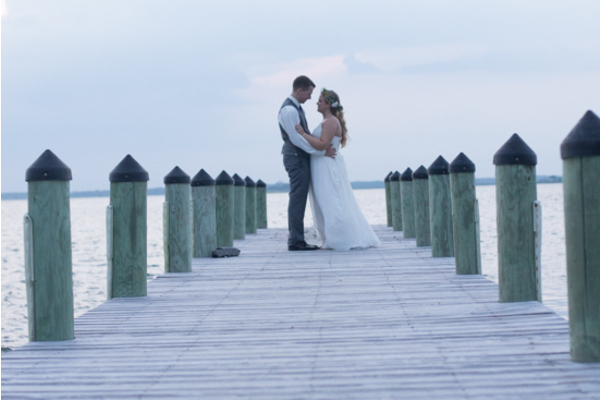 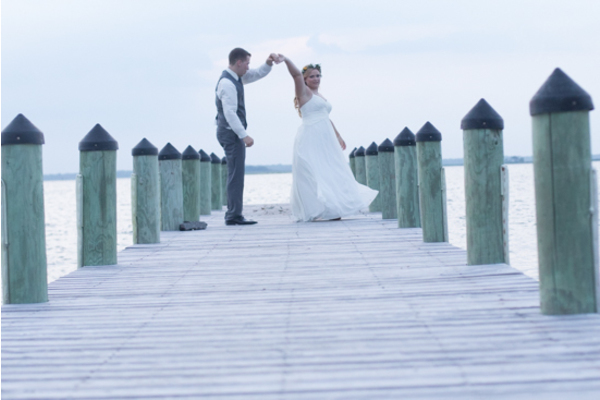 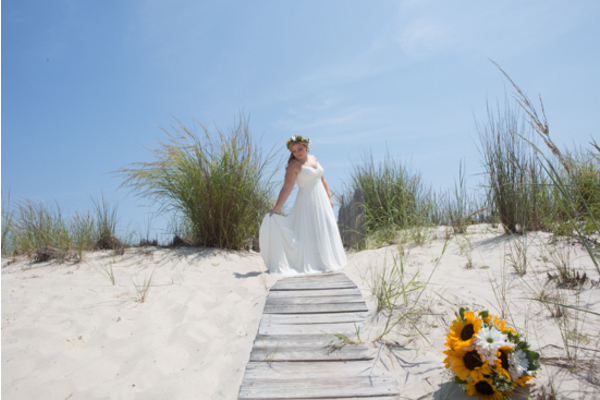 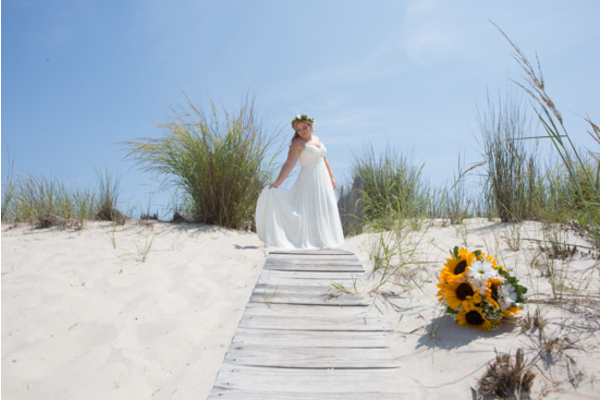 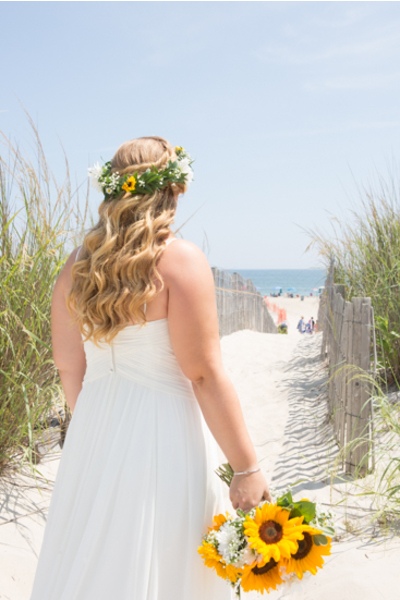 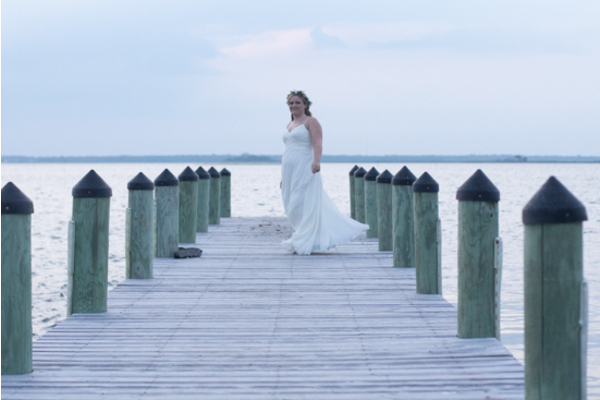 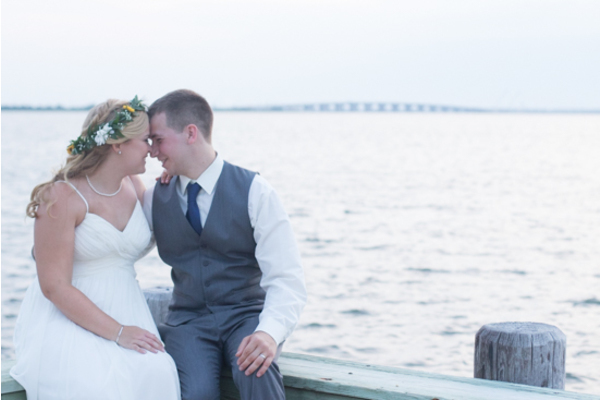 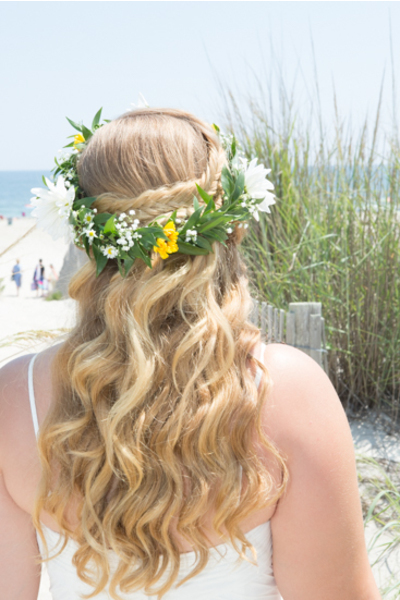 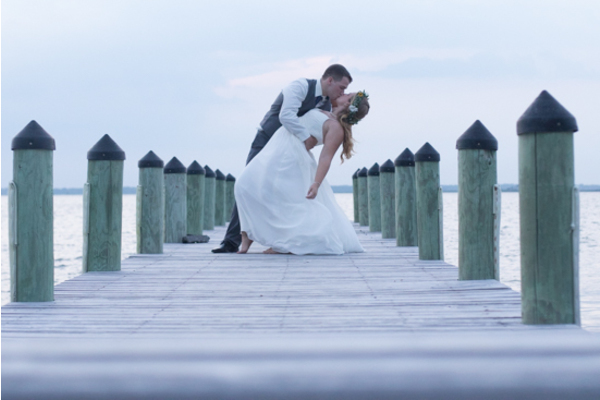 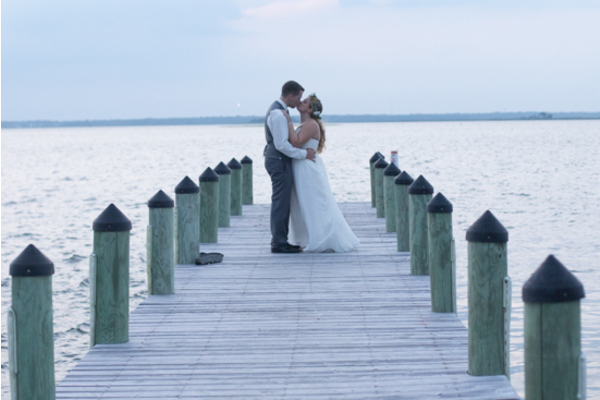 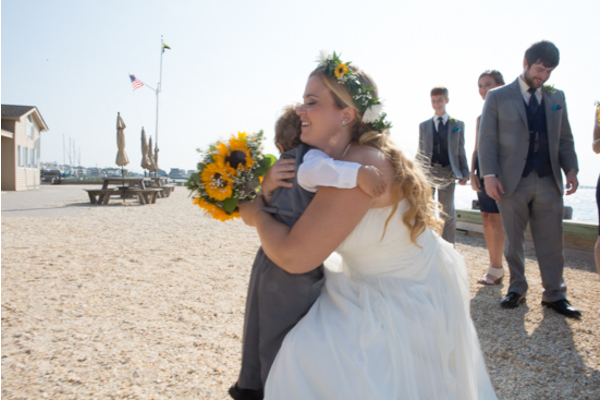 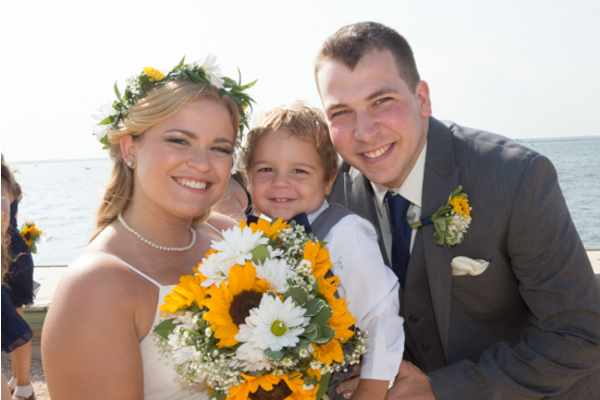 Congratulations to Emily and Anthony on their stunning beach wedding! 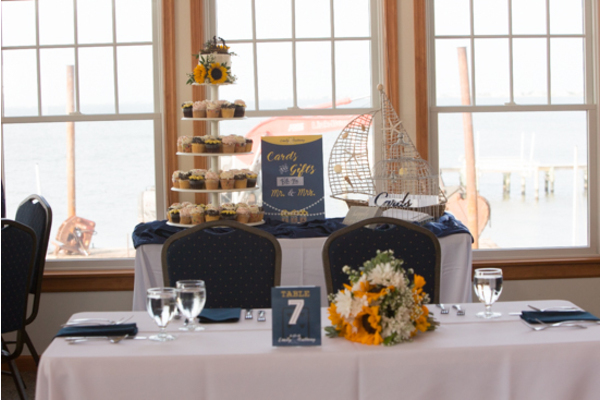 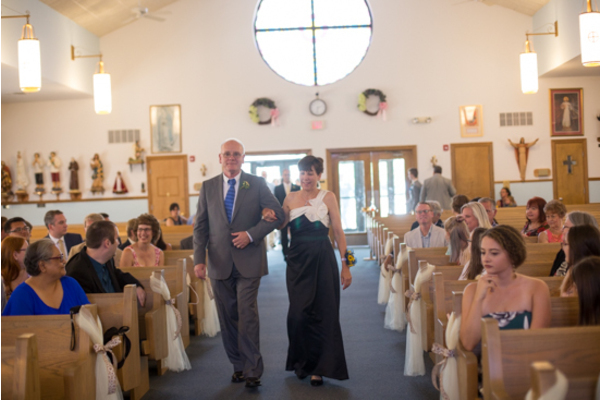 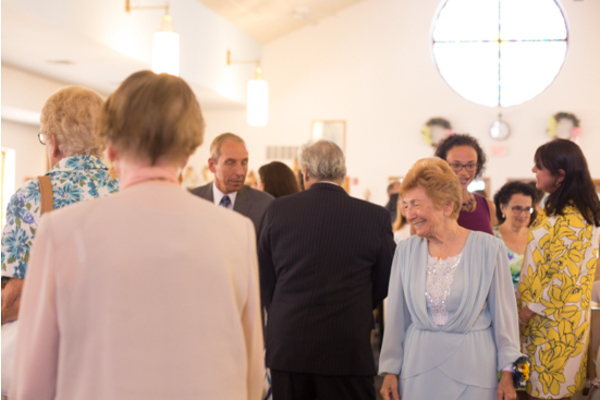 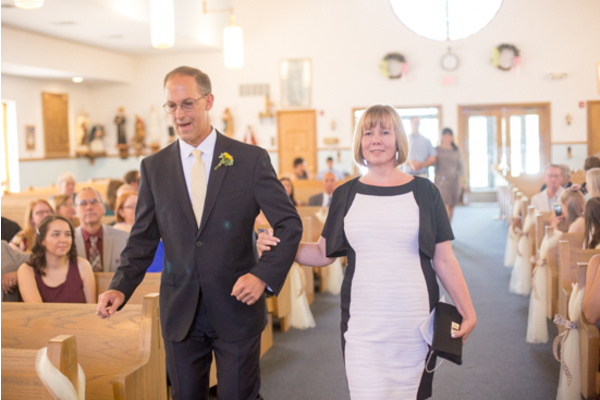 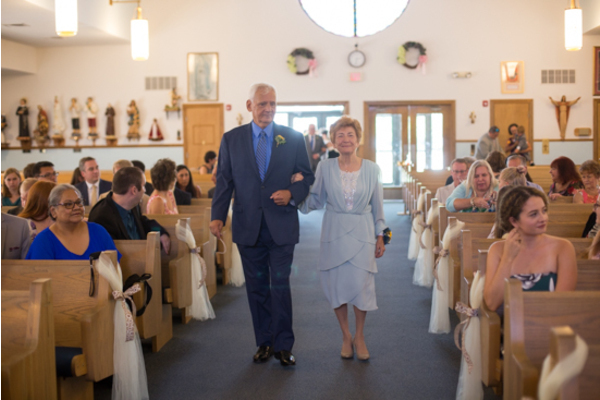 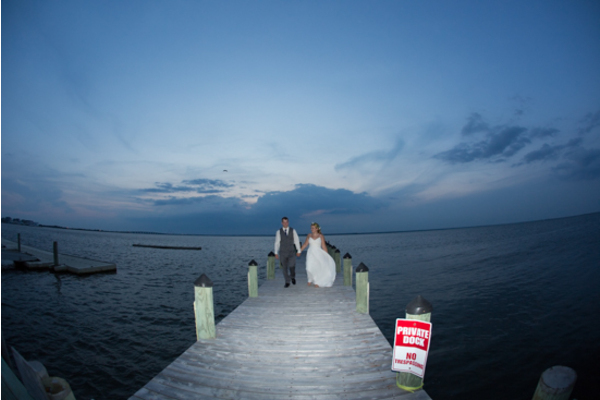 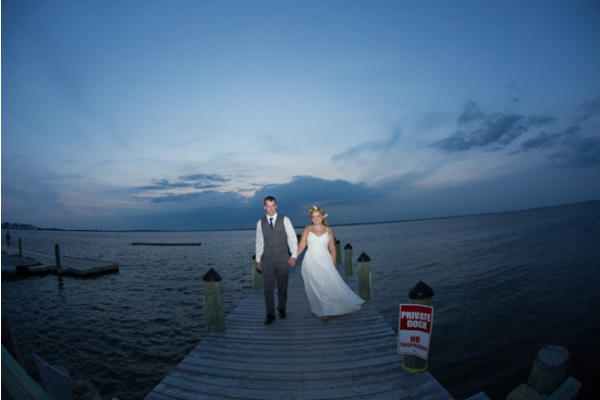 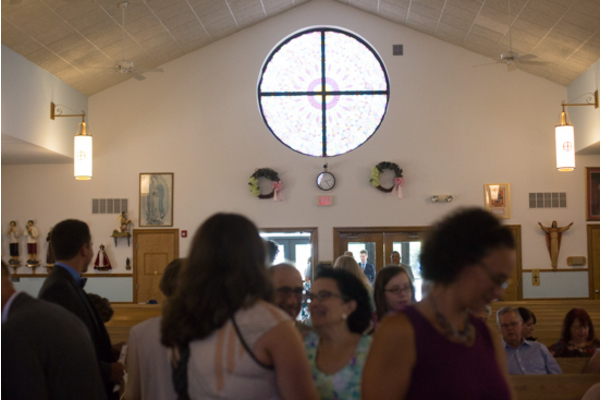 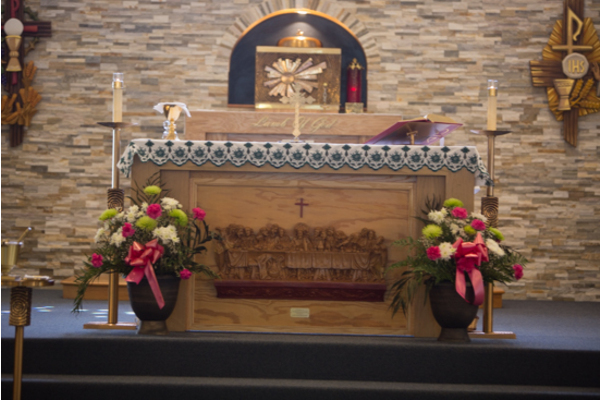 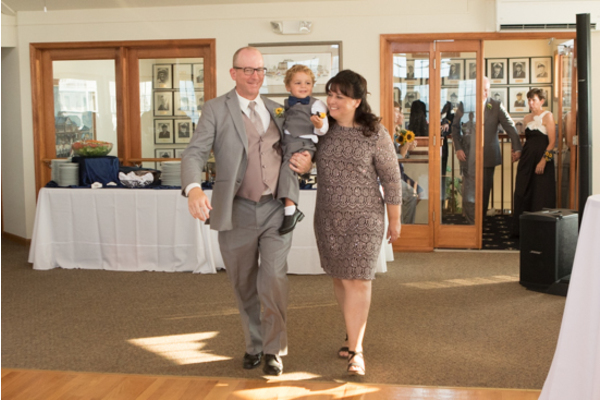 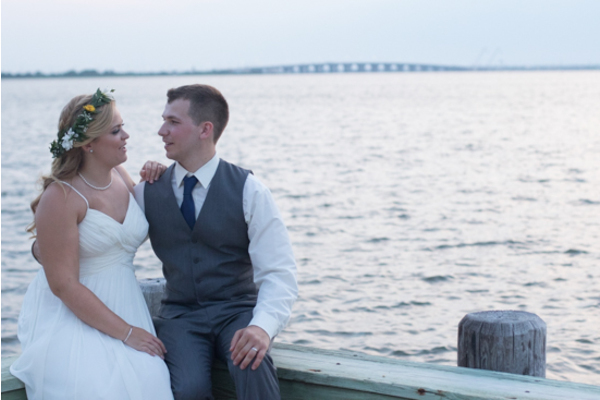 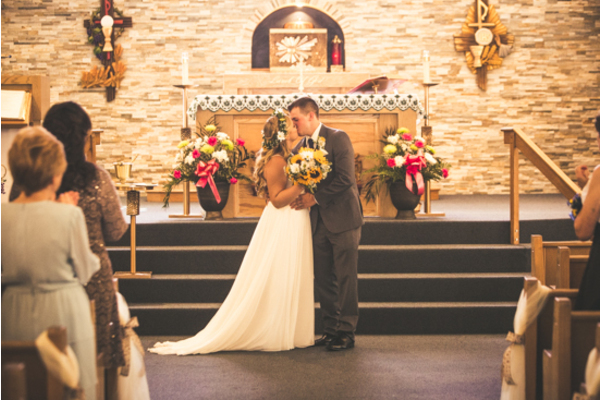 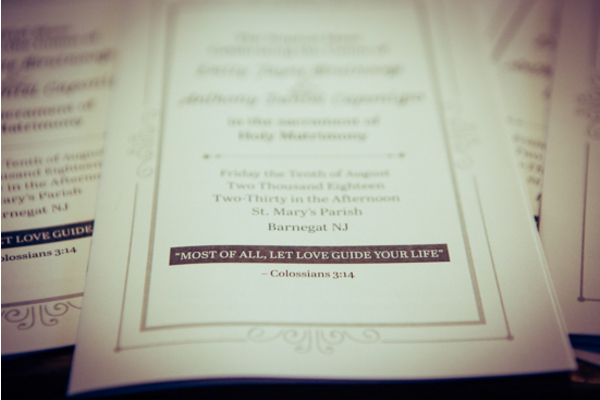 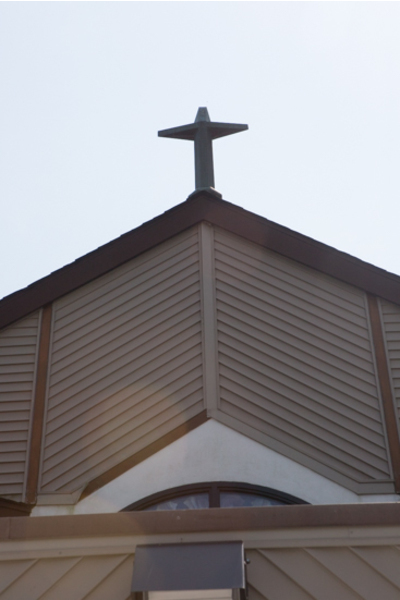 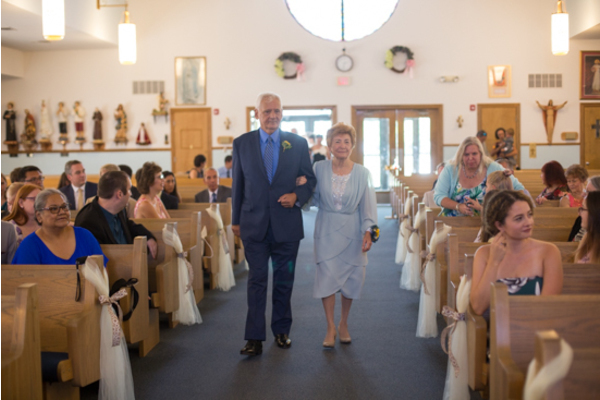 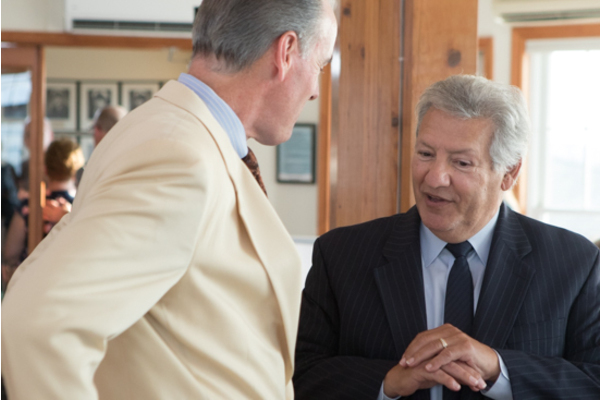 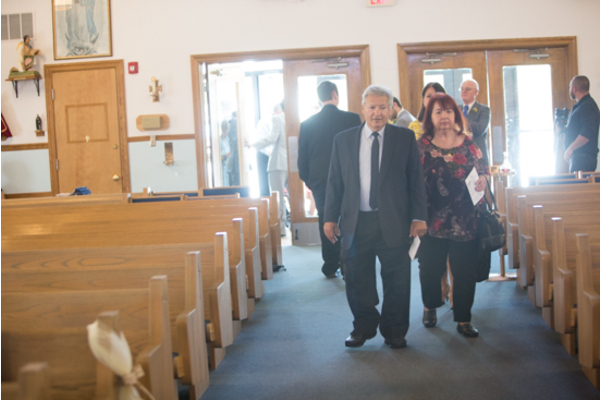 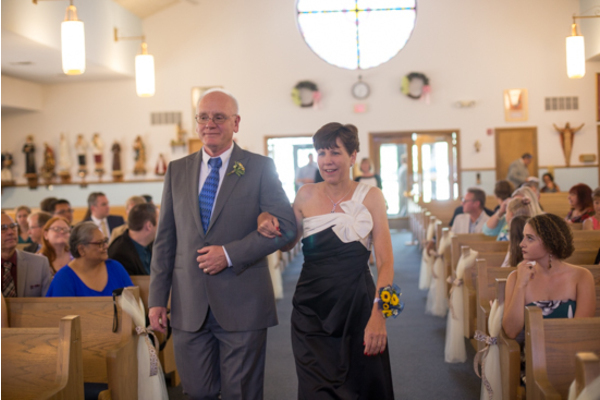 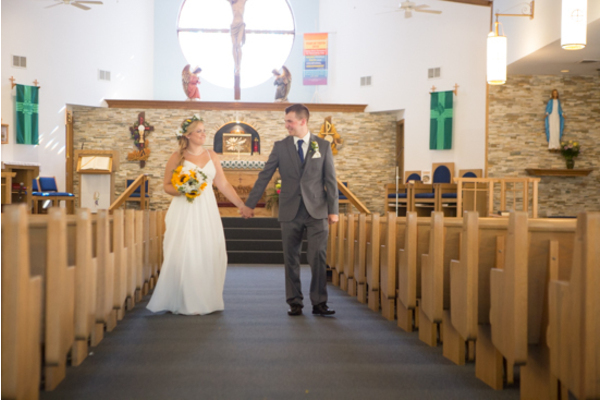 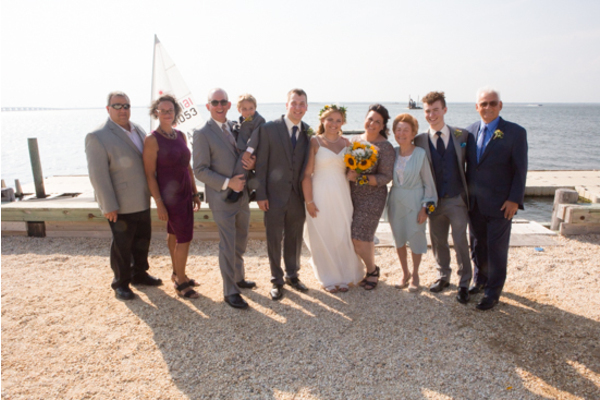 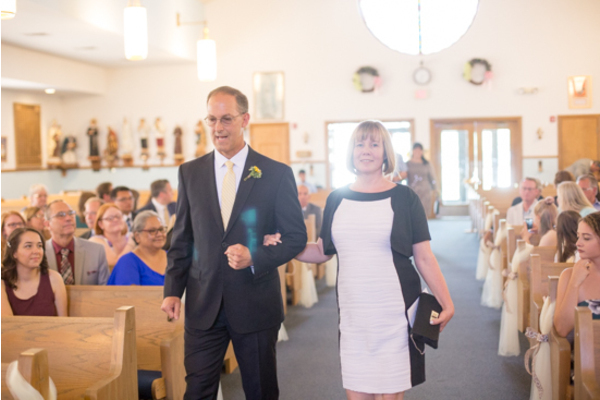 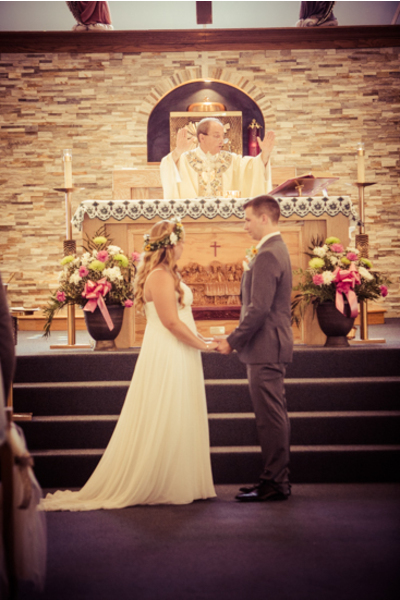 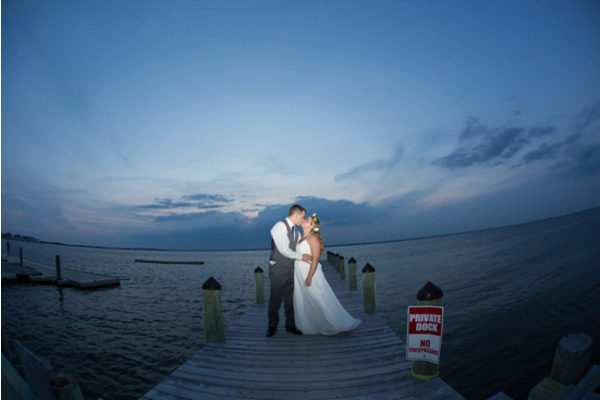 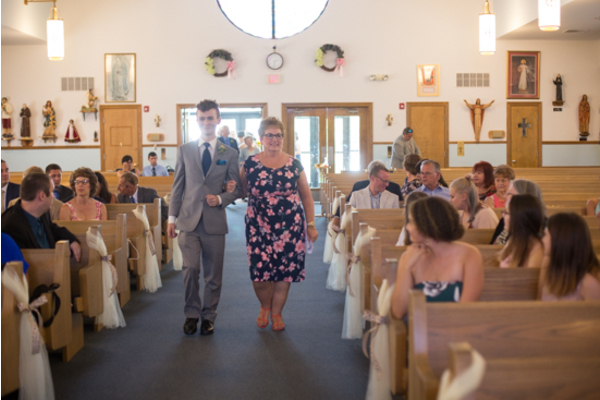 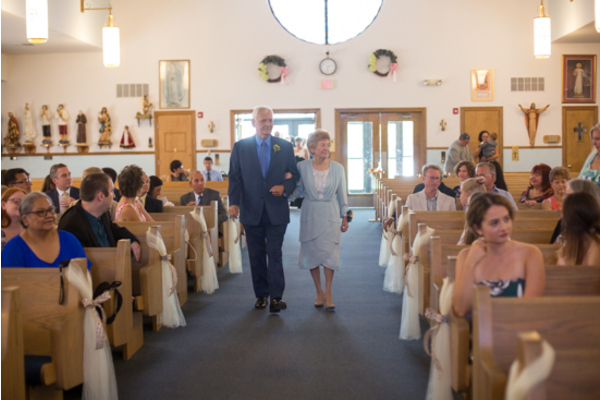 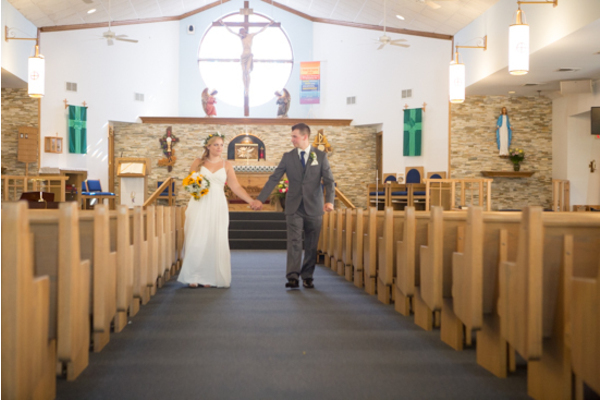 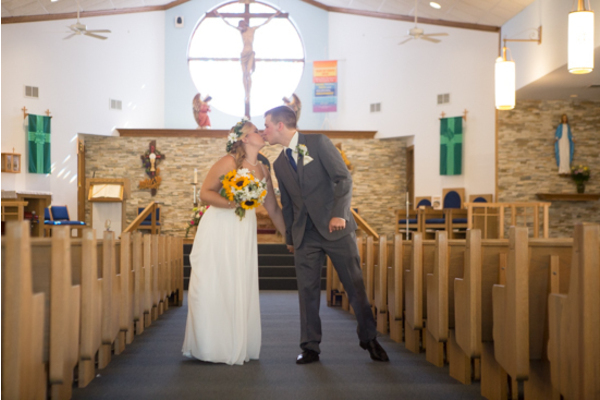 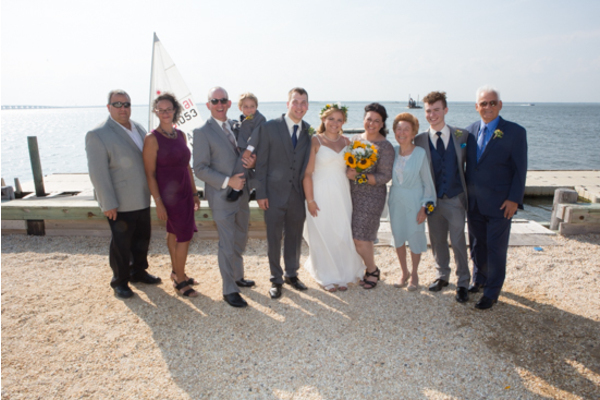 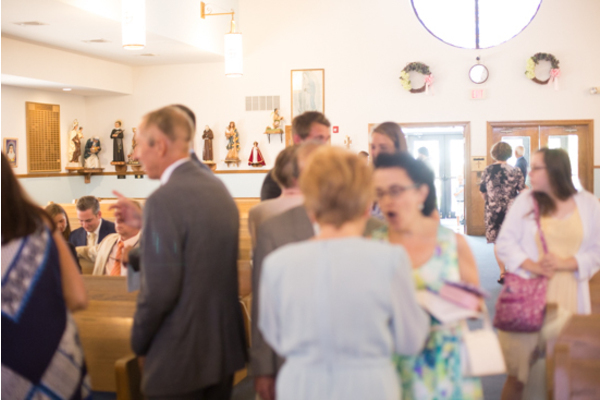 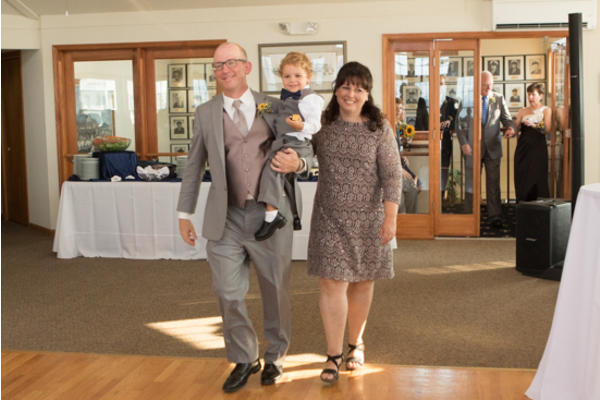 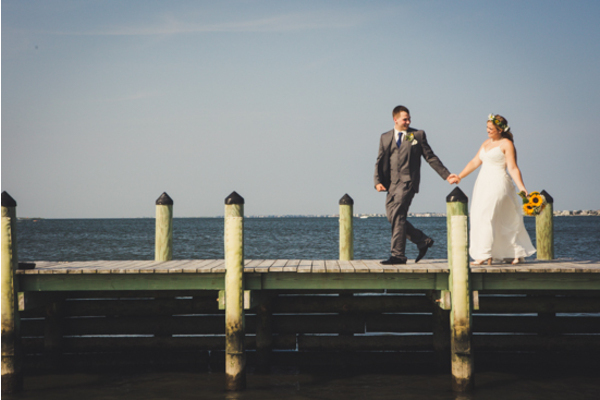 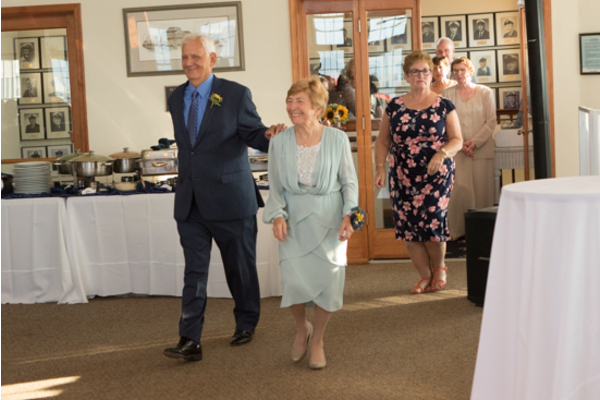 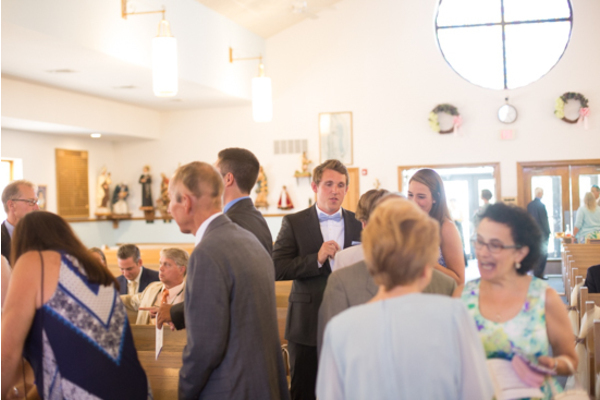 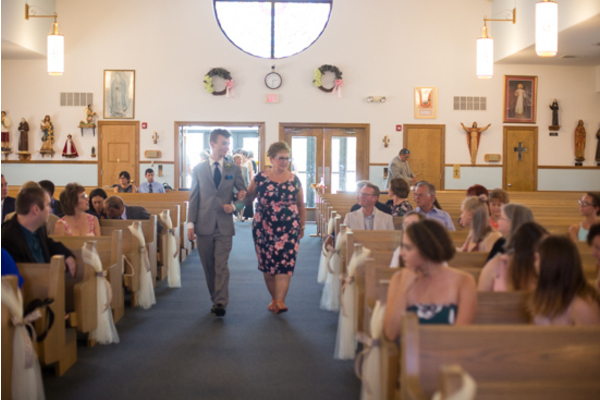 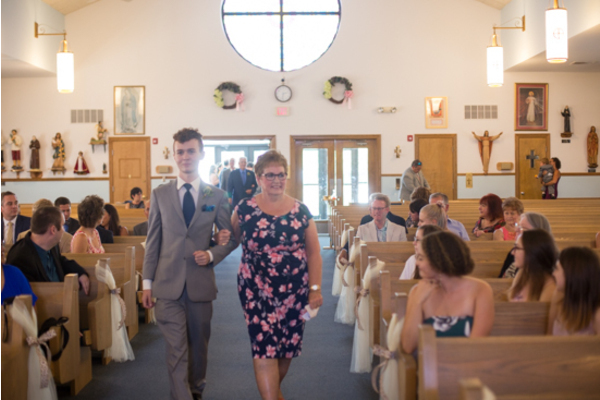 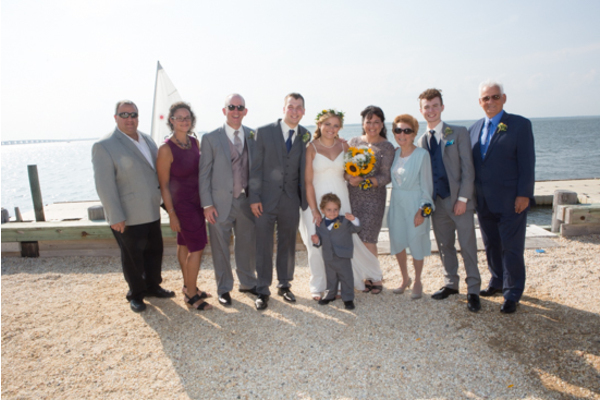 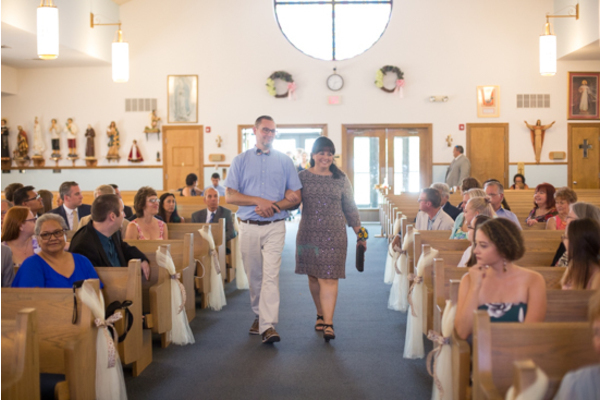 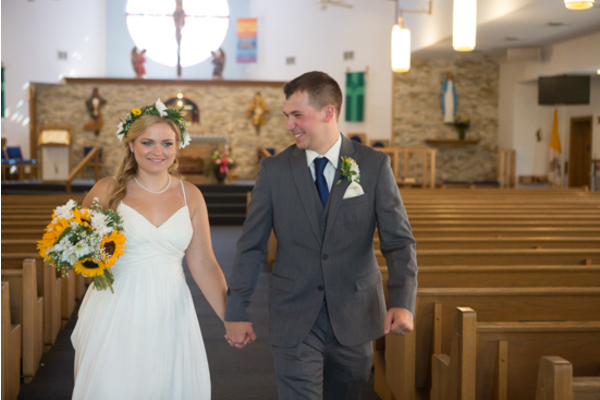 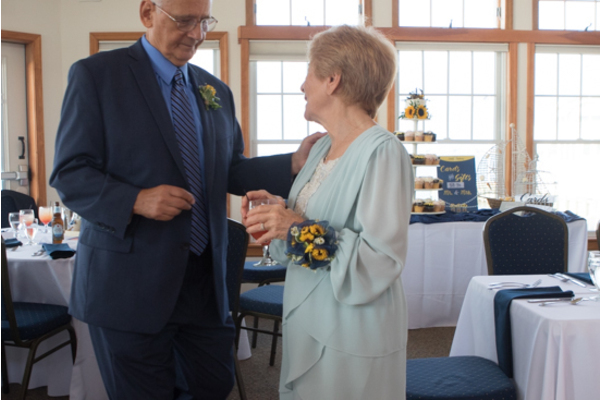 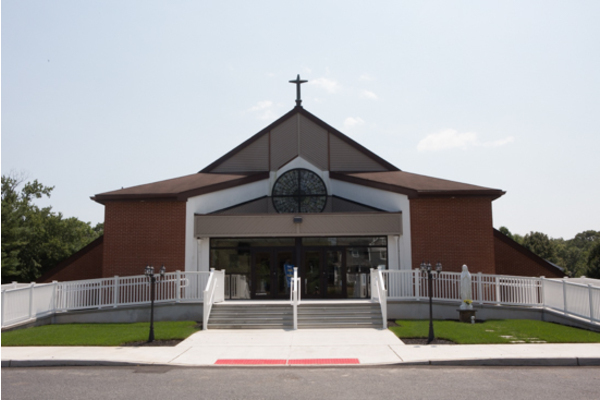 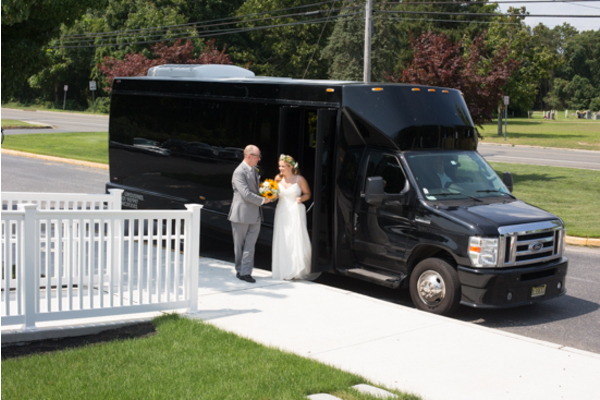 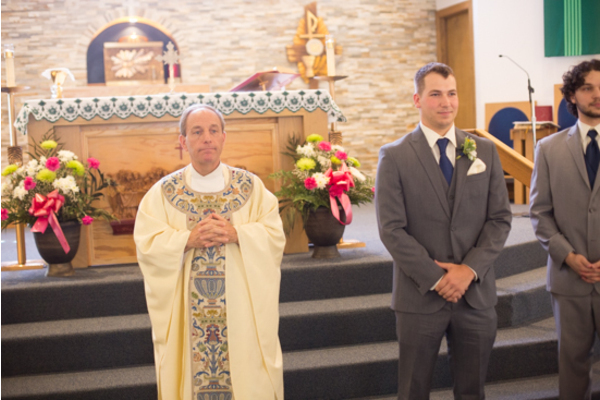 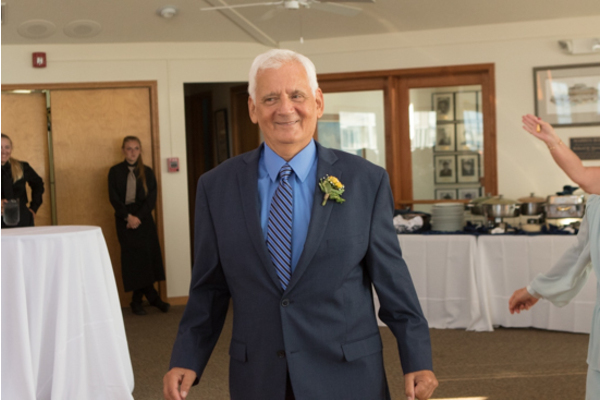 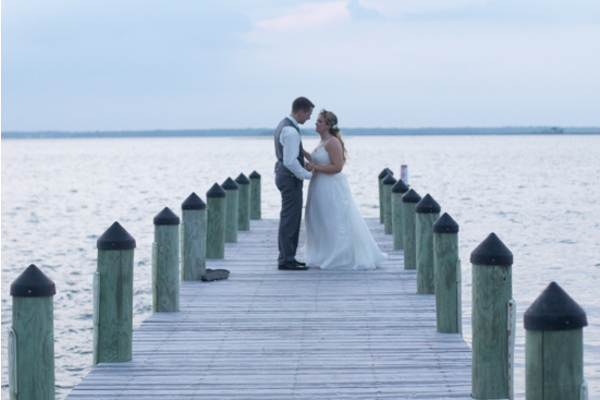 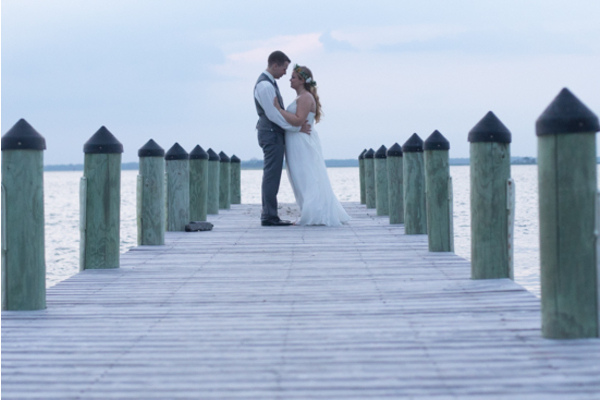 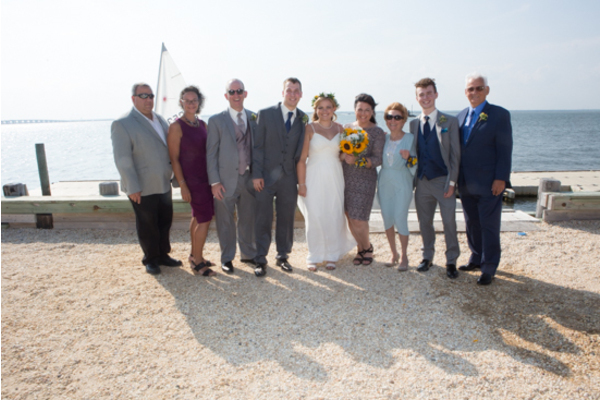 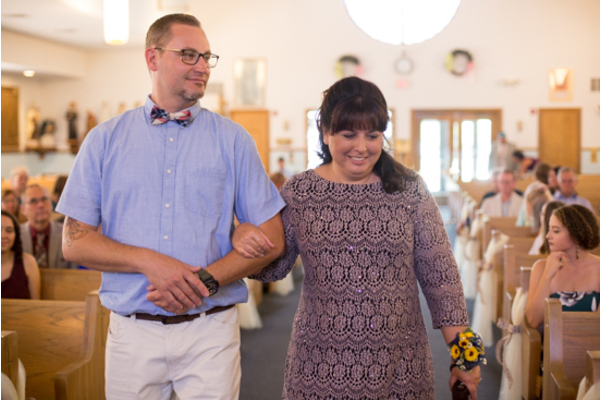 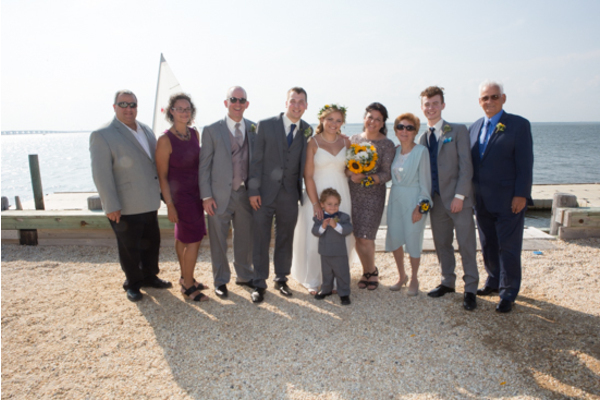 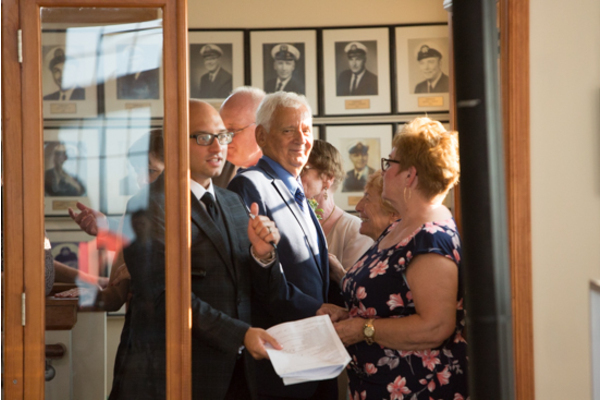 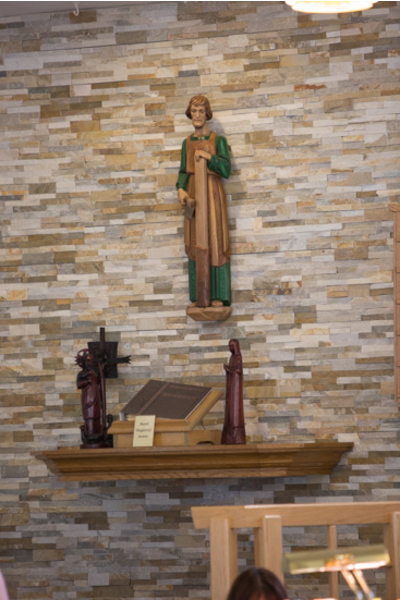 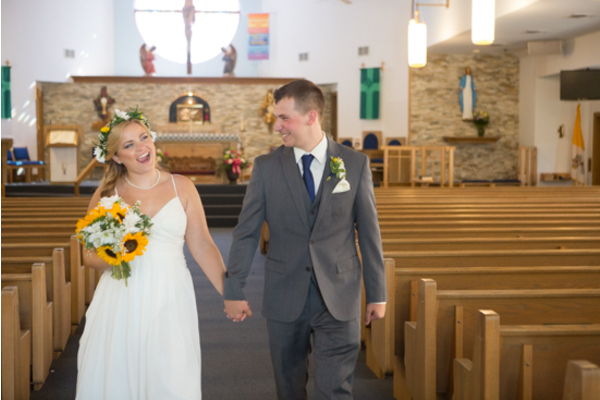 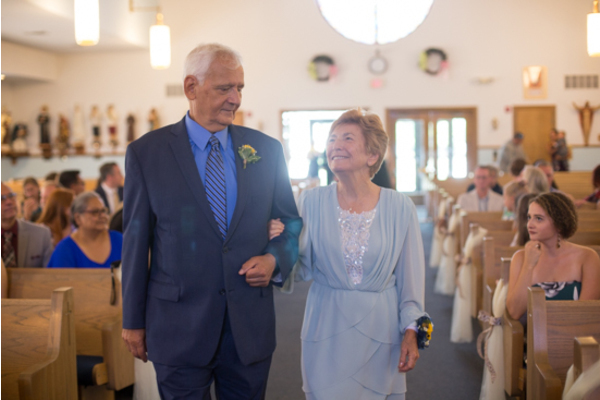 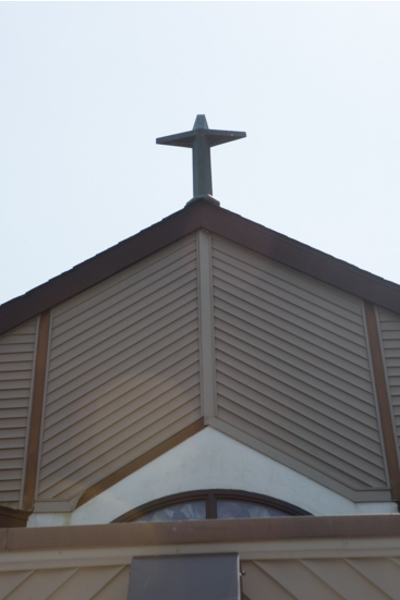 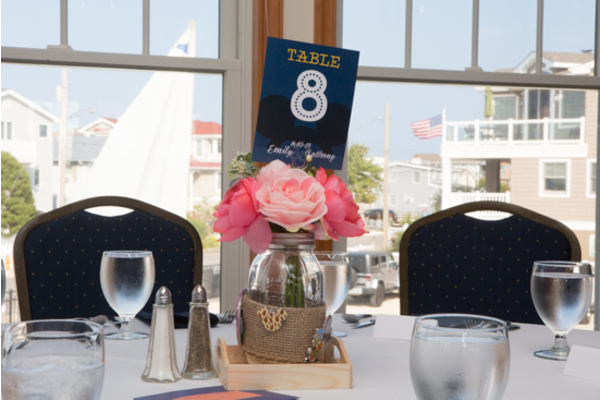 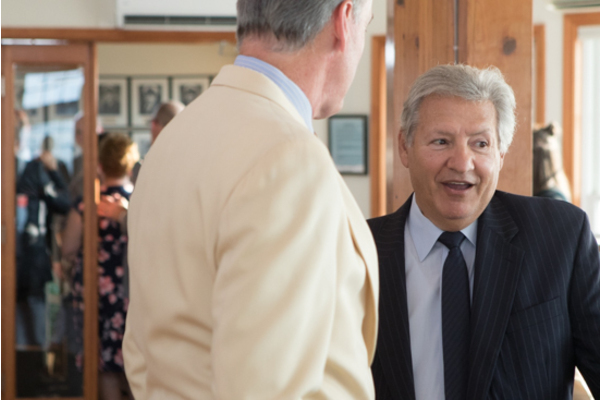 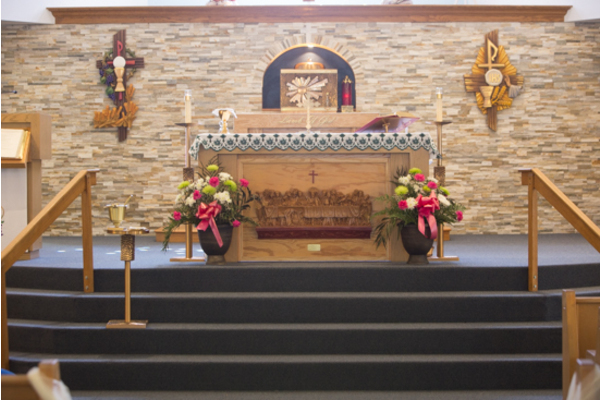 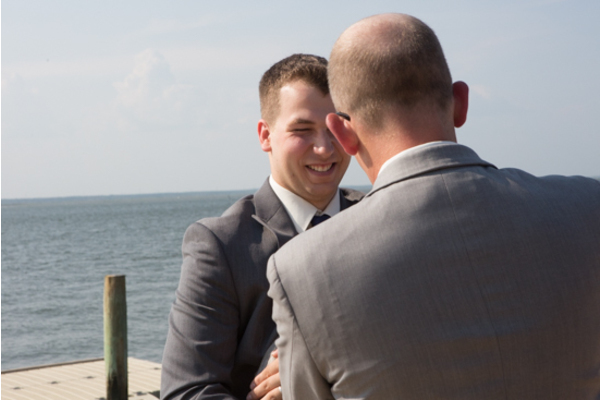 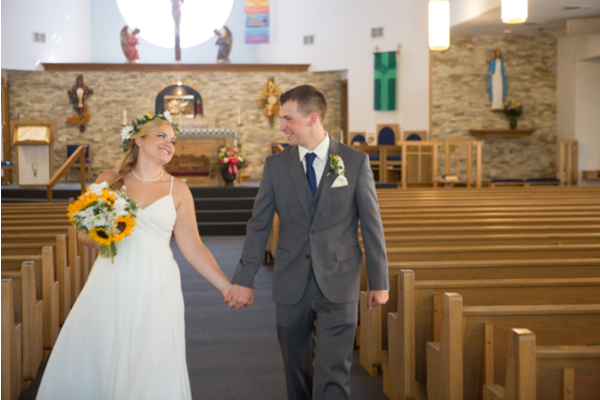 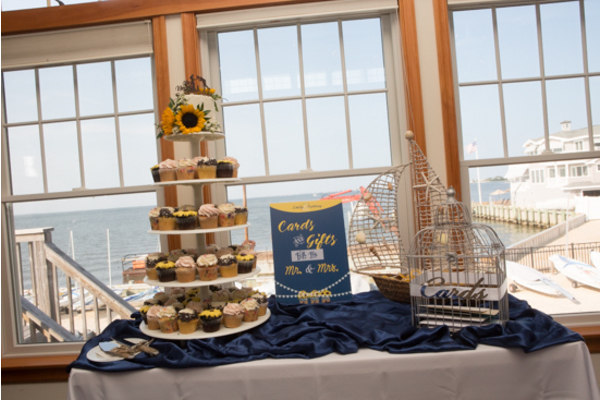 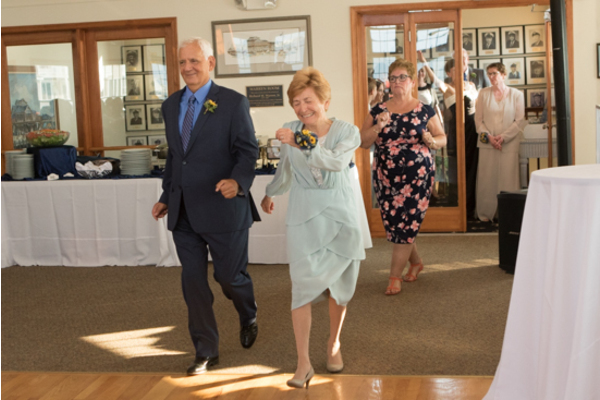 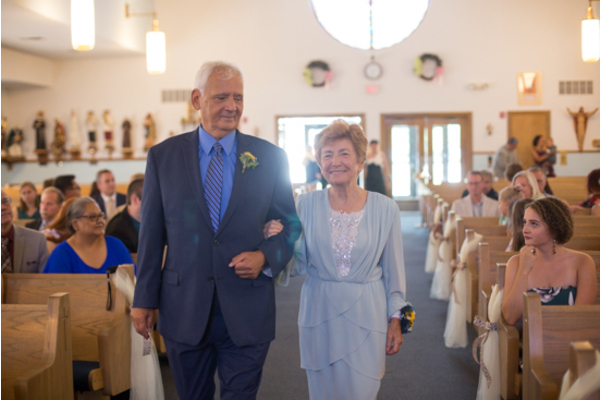 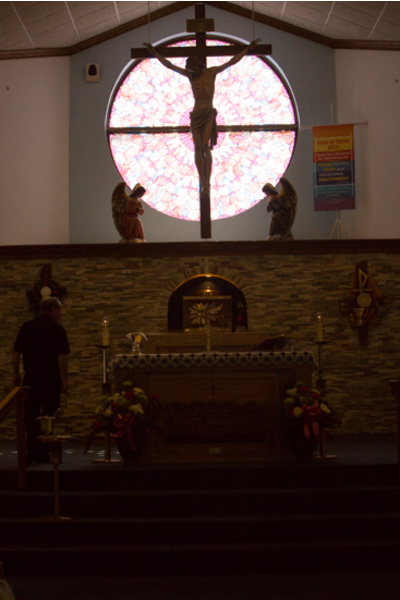 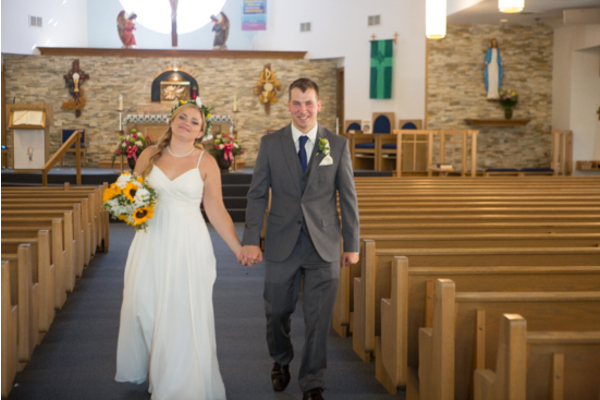 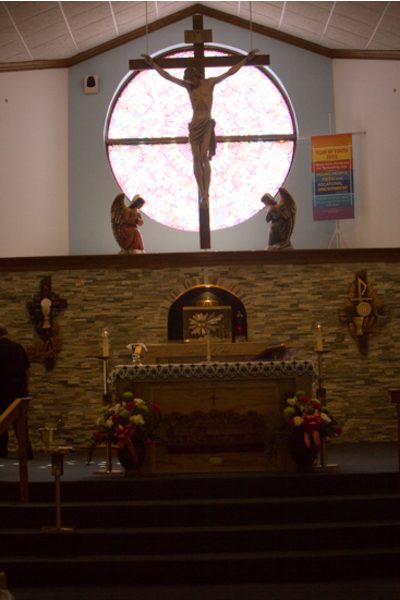 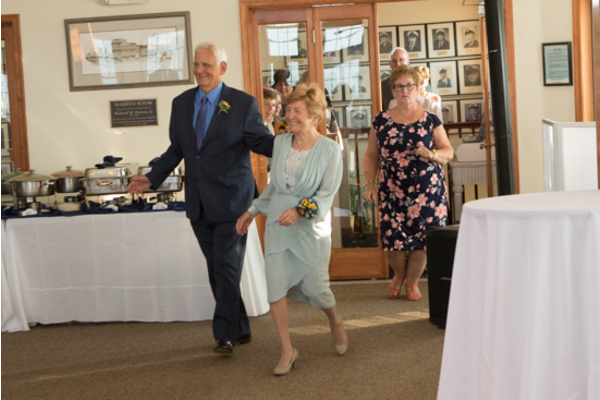 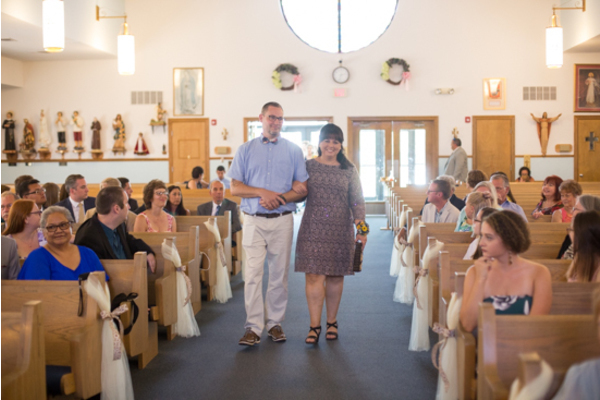 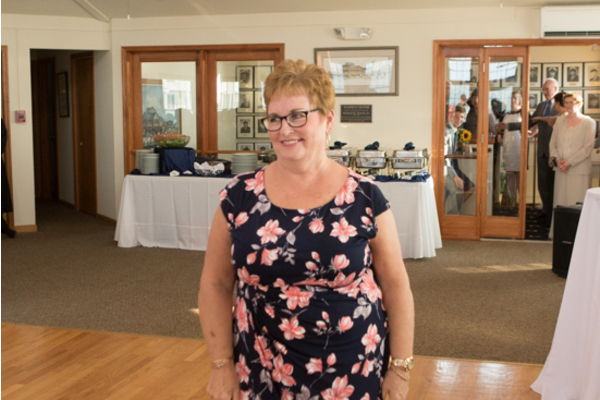 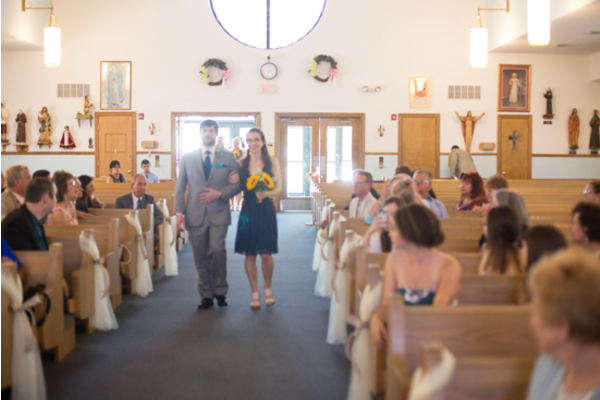 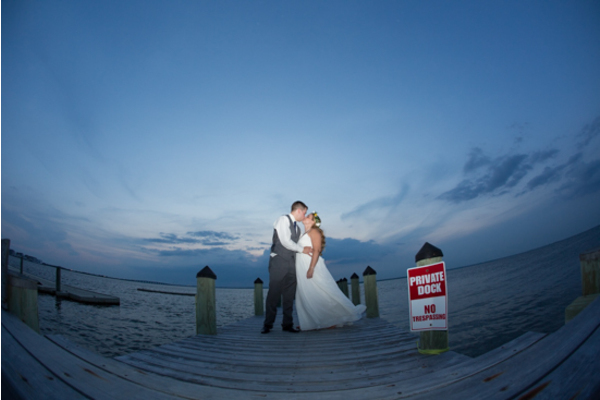 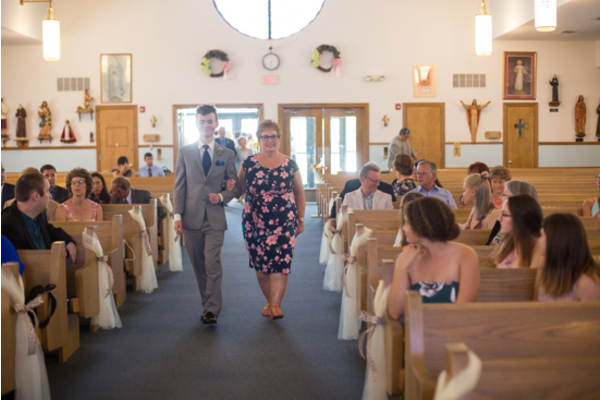 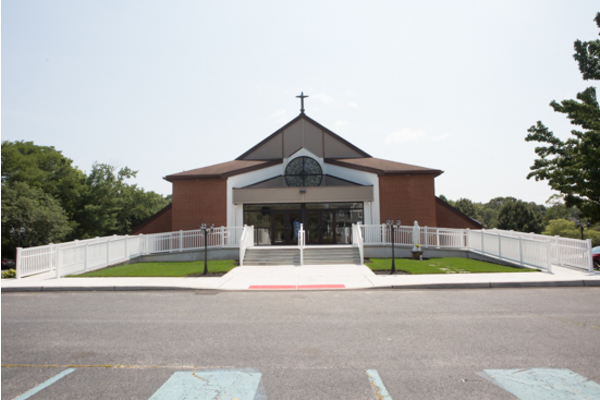 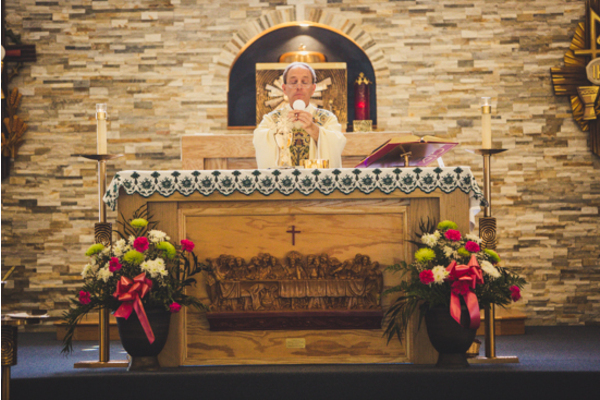 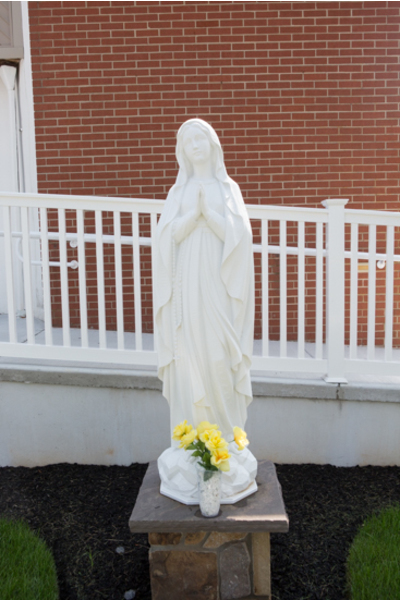 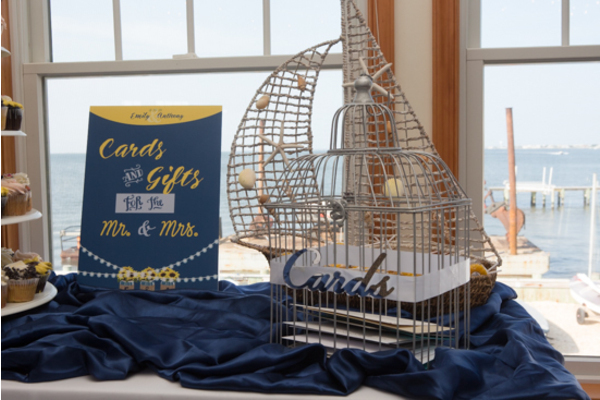 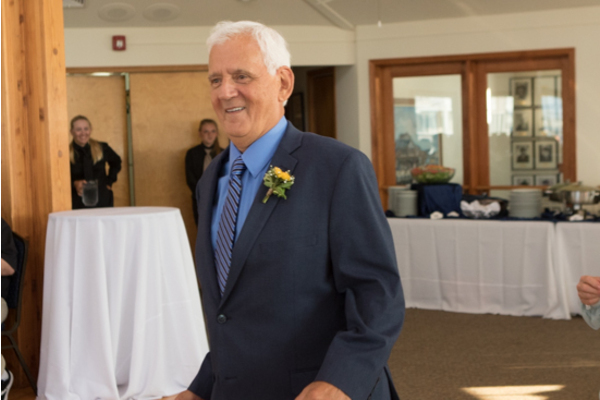 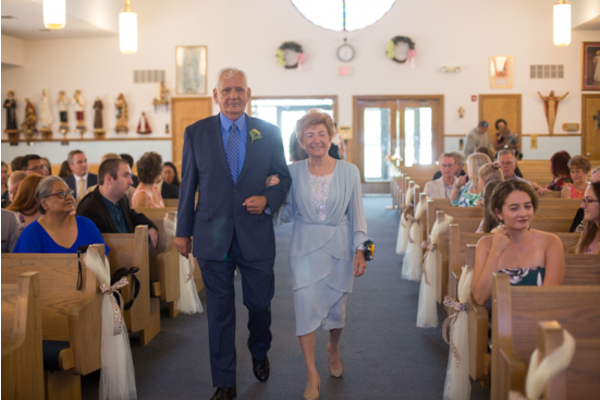 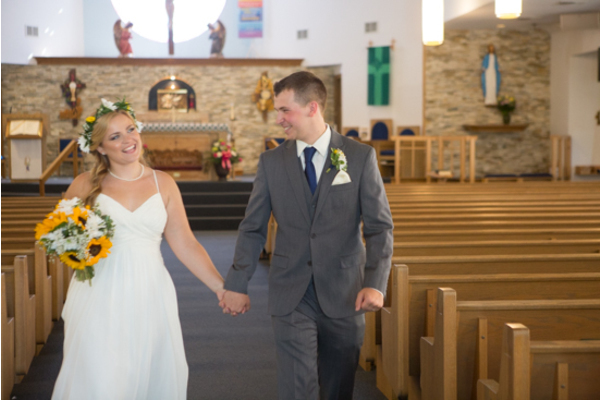 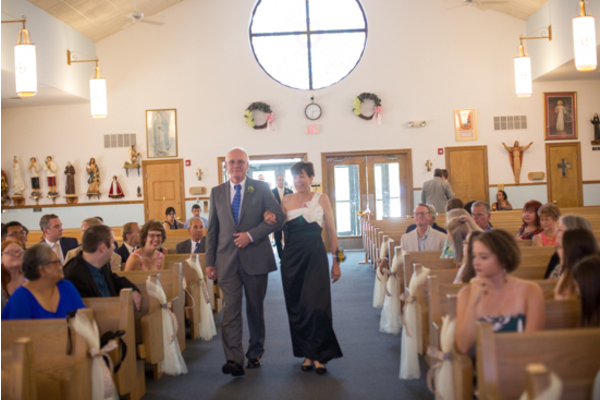 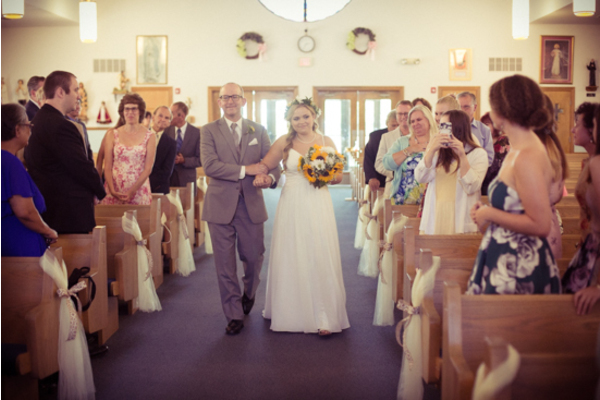 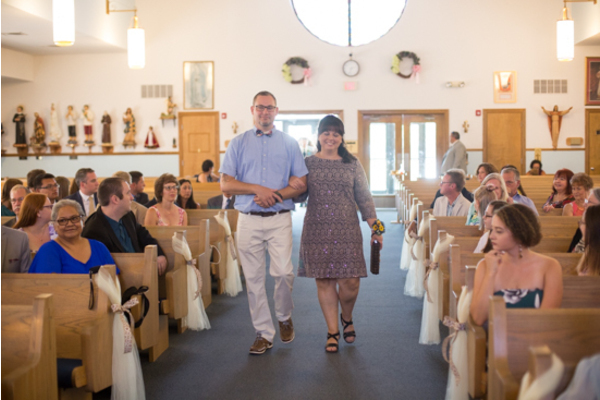 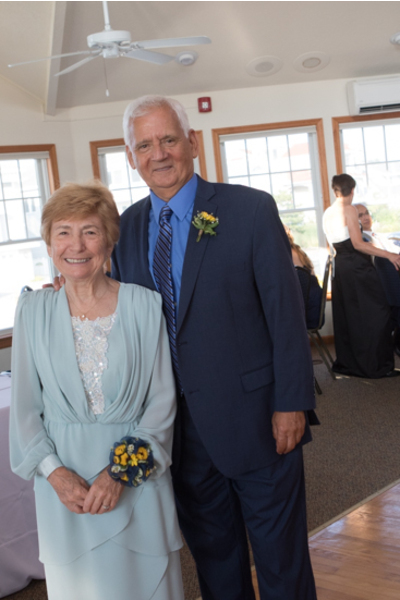 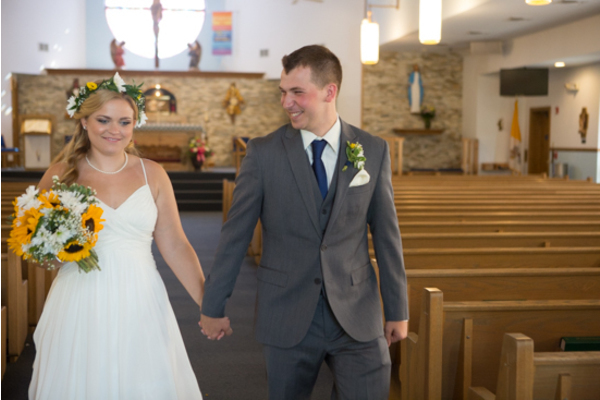 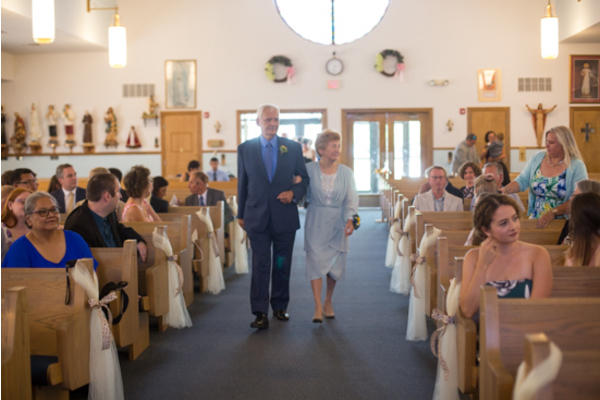 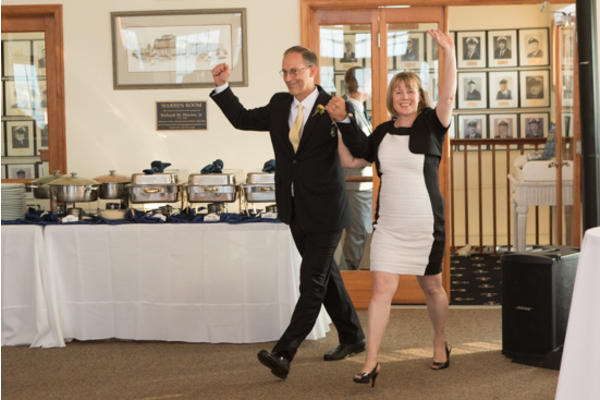 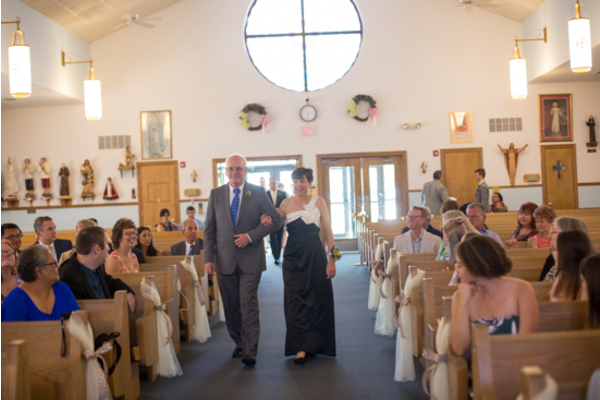 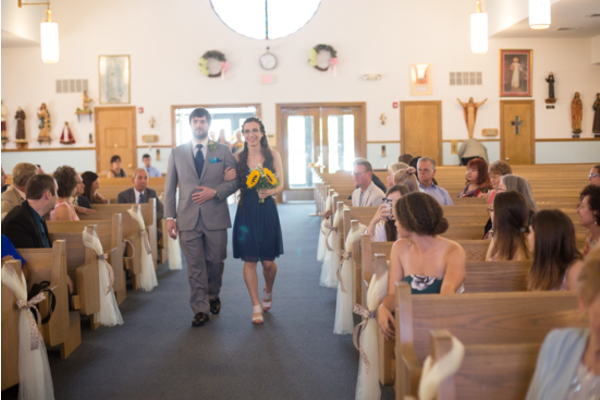 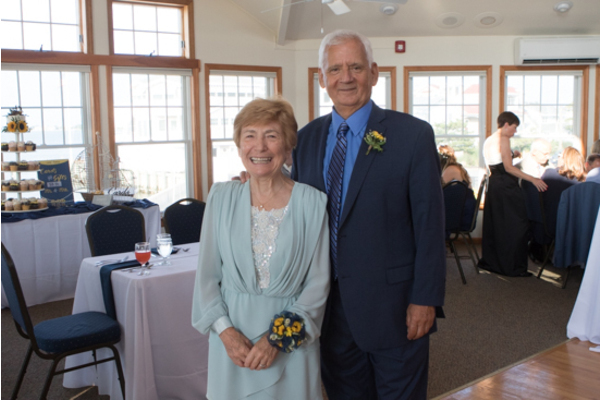 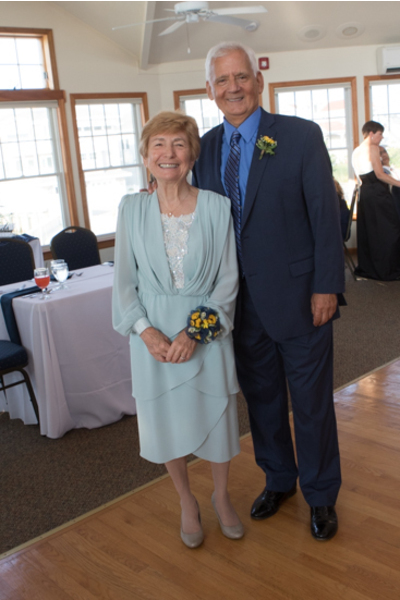 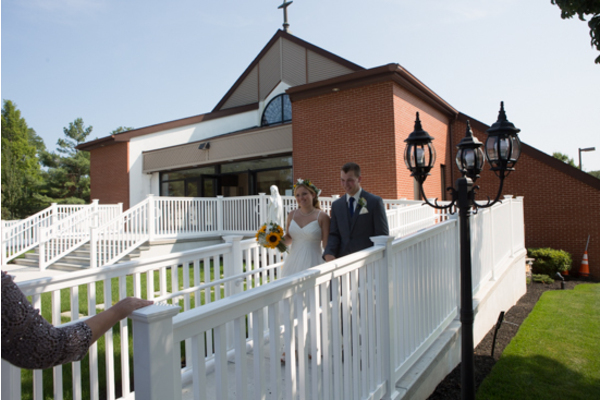 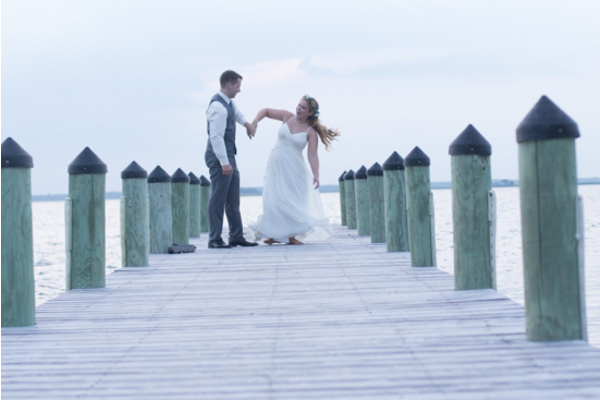 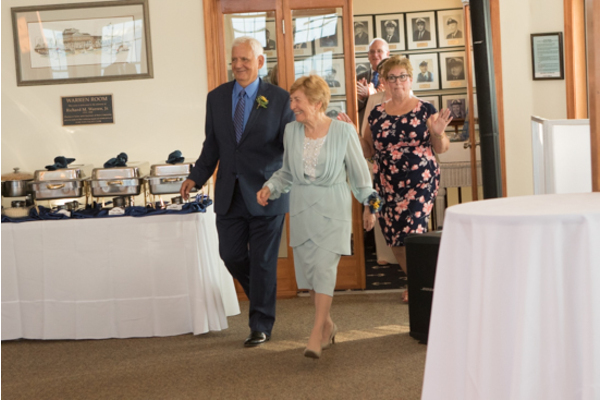 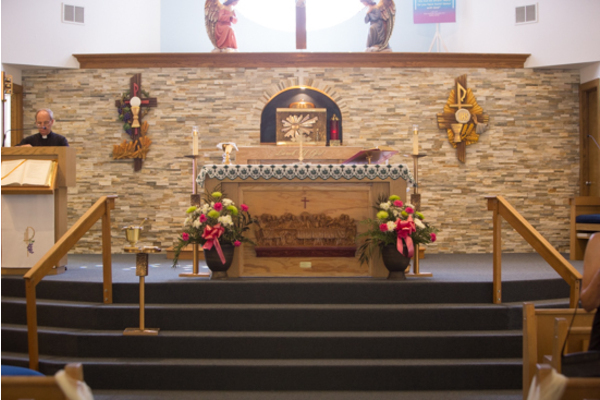 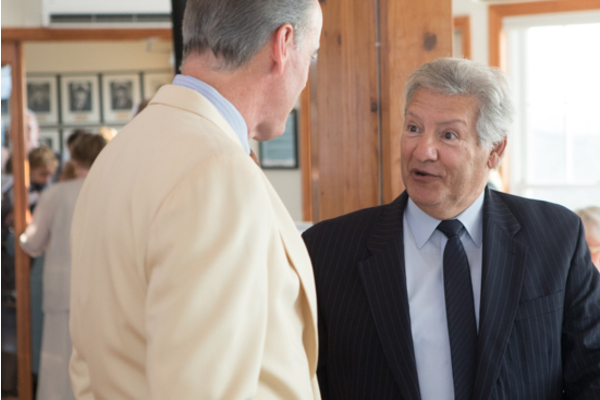 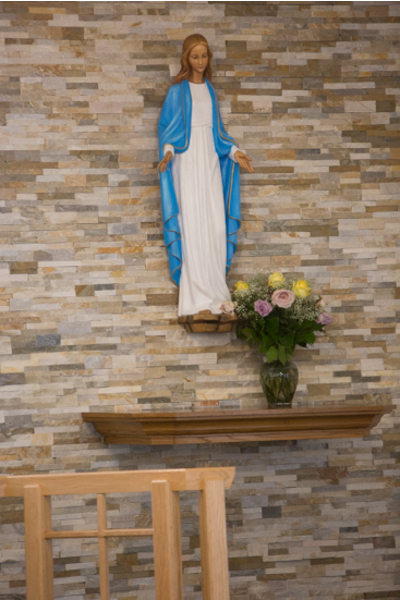 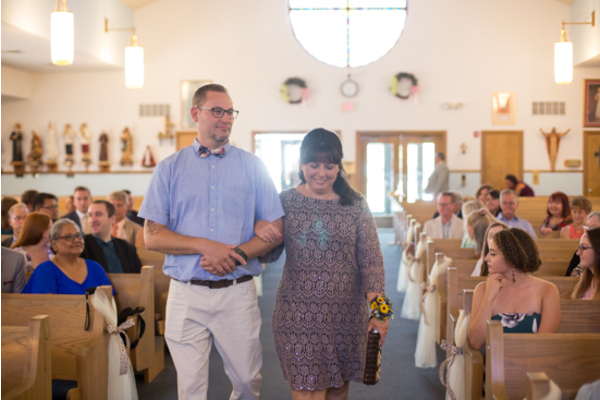 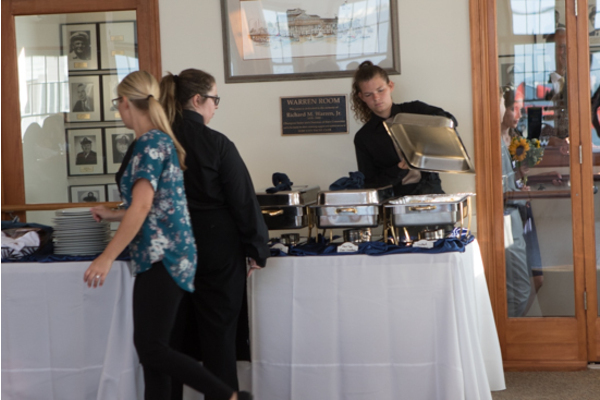 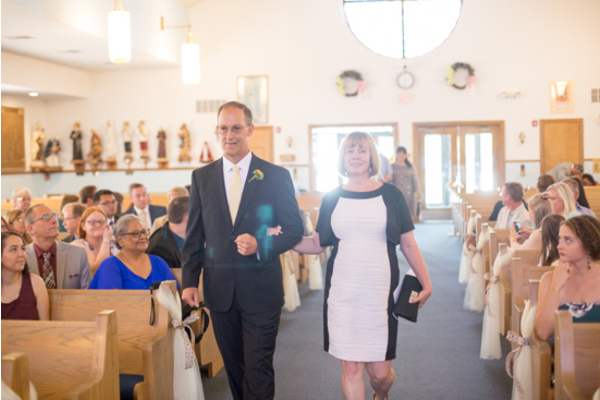 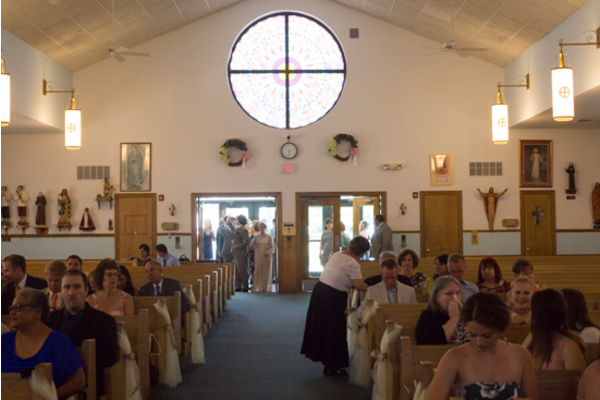 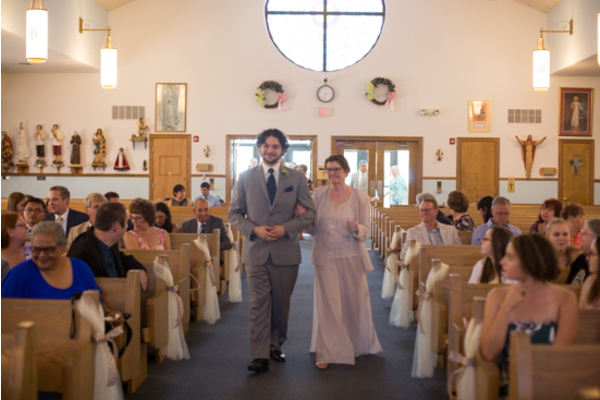 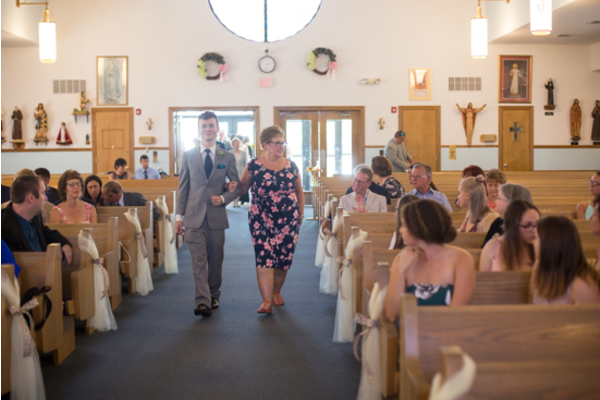 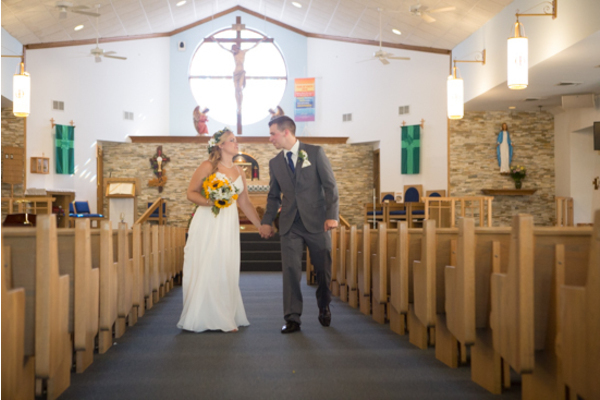 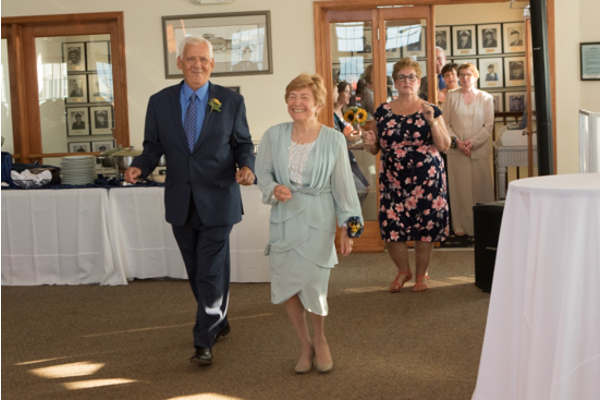 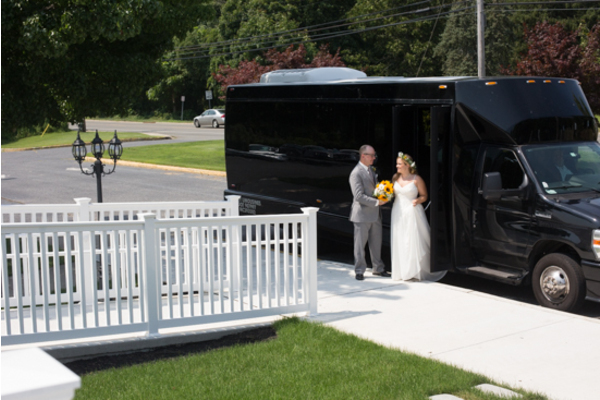 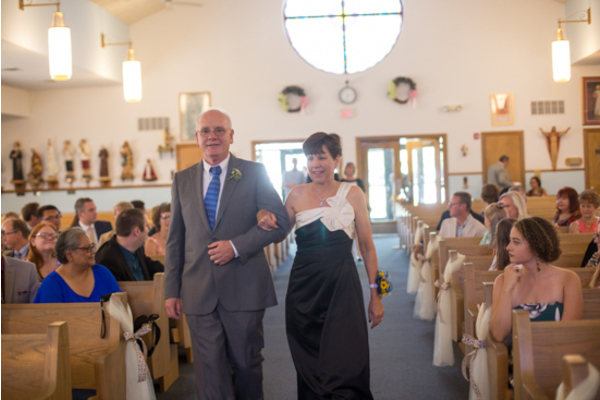 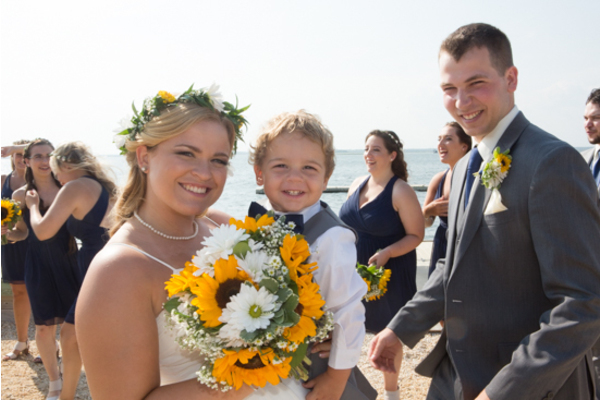 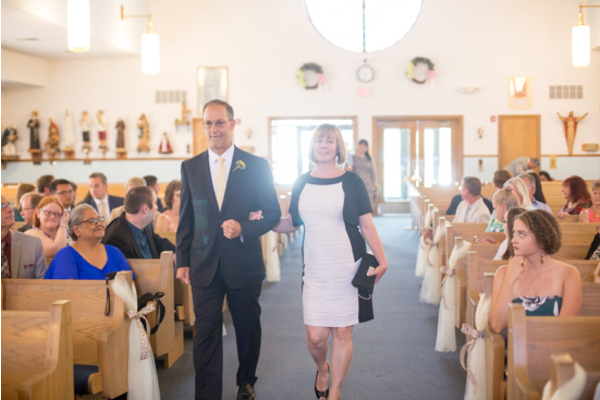 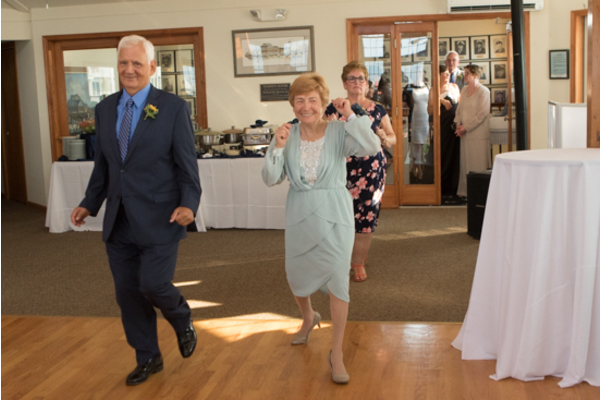 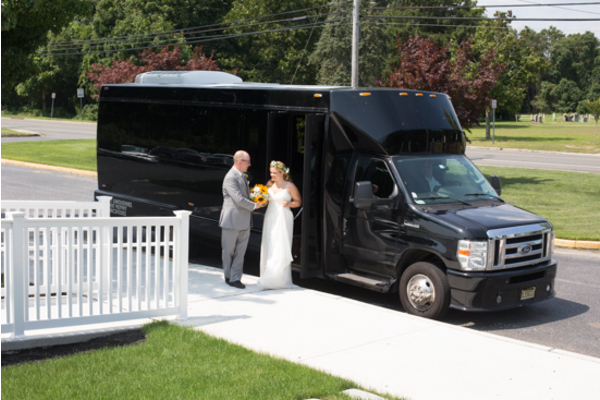 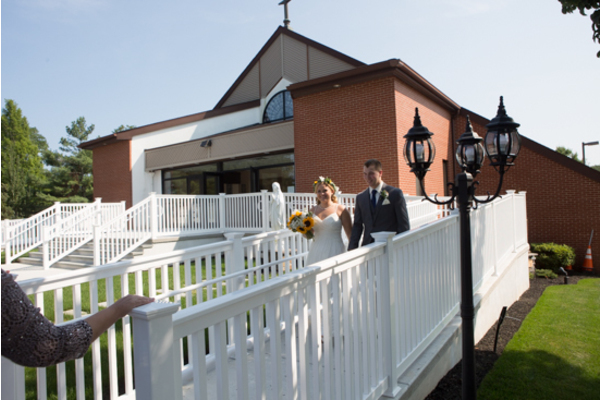 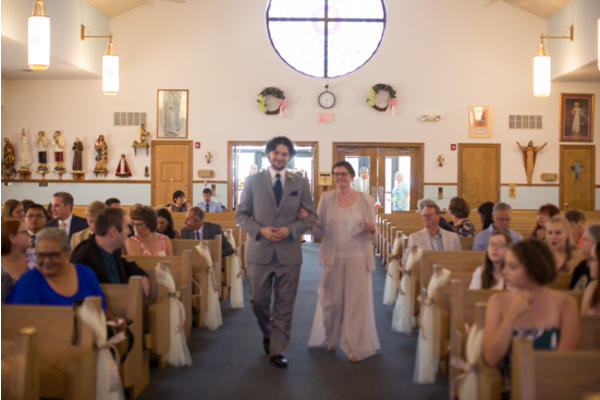 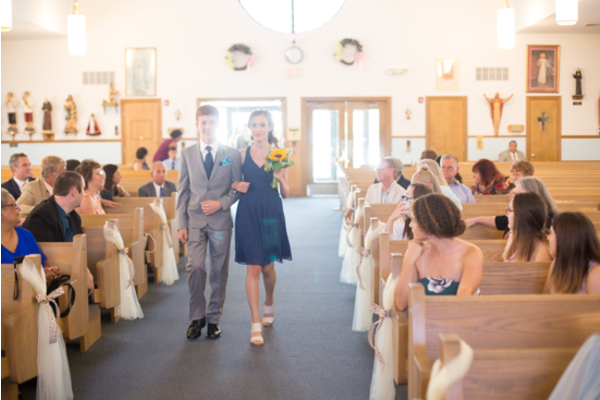 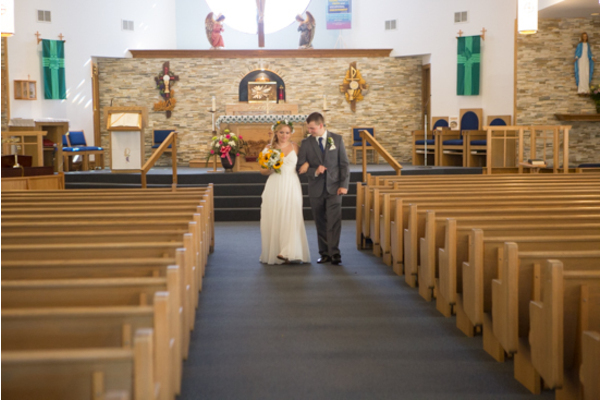 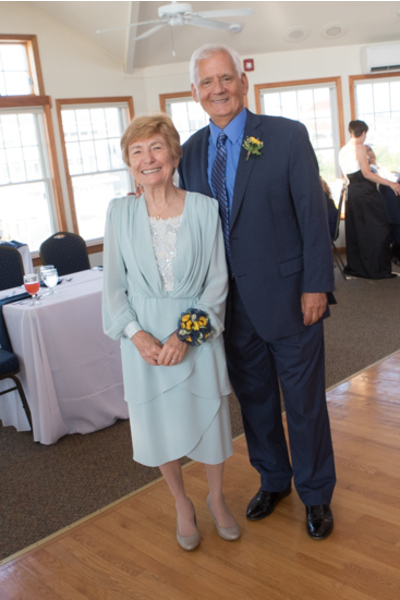 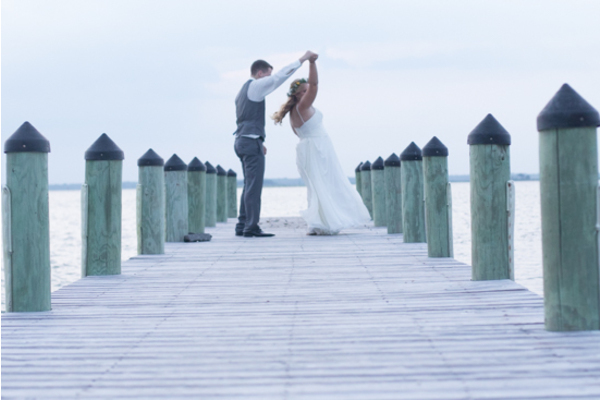 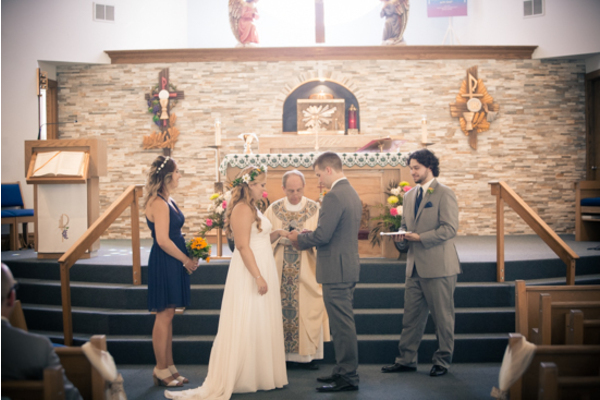 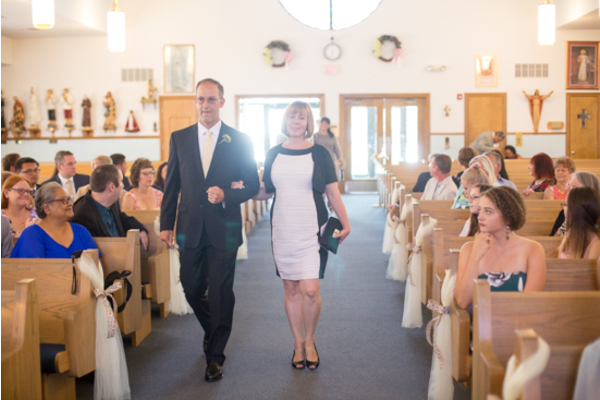 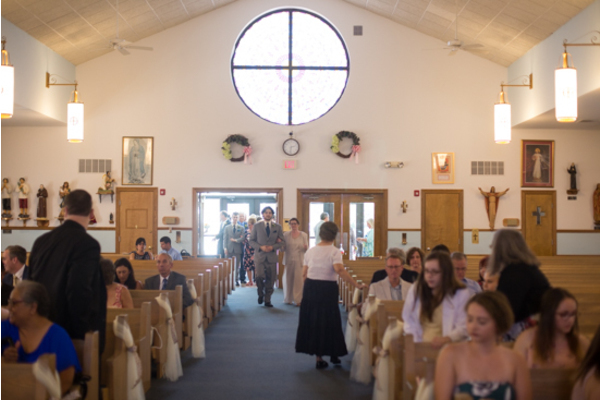 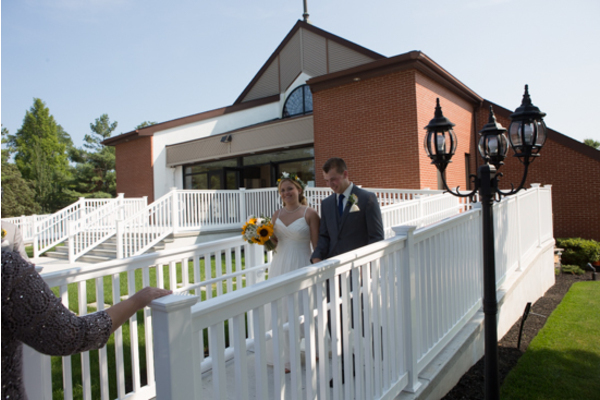 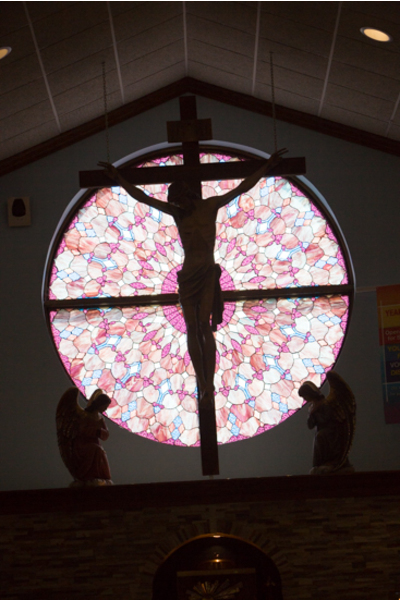 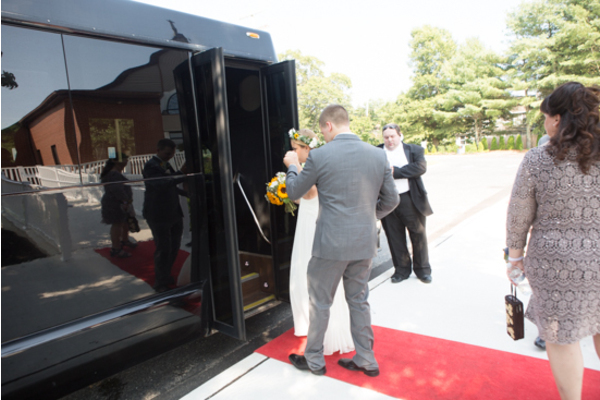 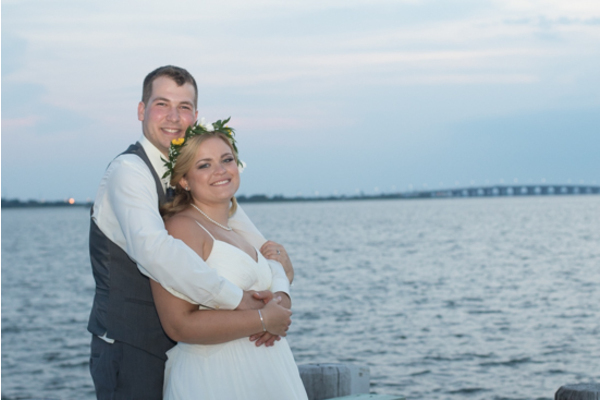 This happy couple tied the knot at St. Mary’s Parish in Barnegat followed by an amazing reception at Surf City Yacht Club in Long Beach Island, NJ. 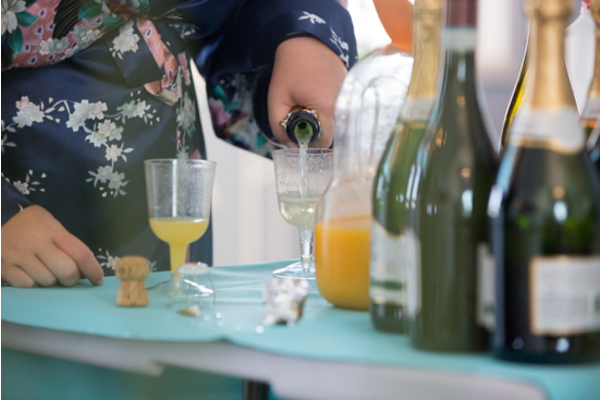 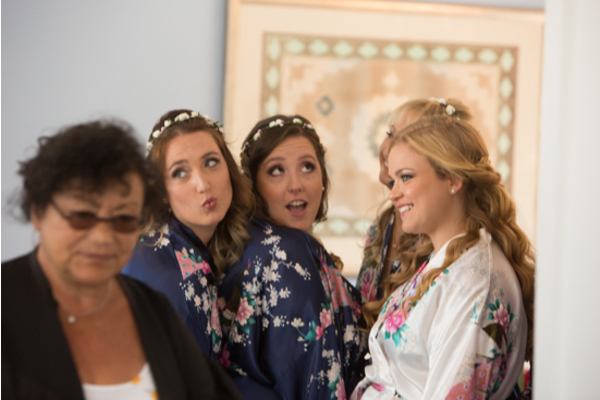 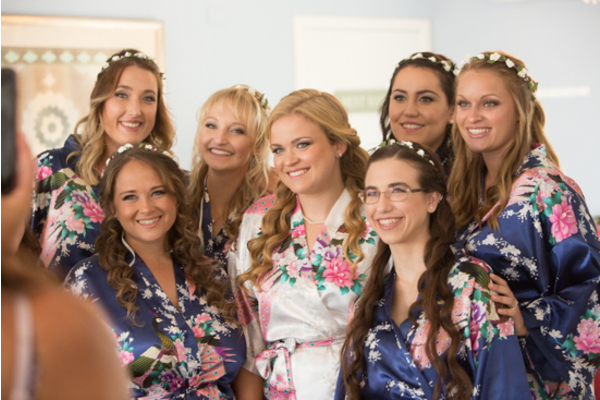 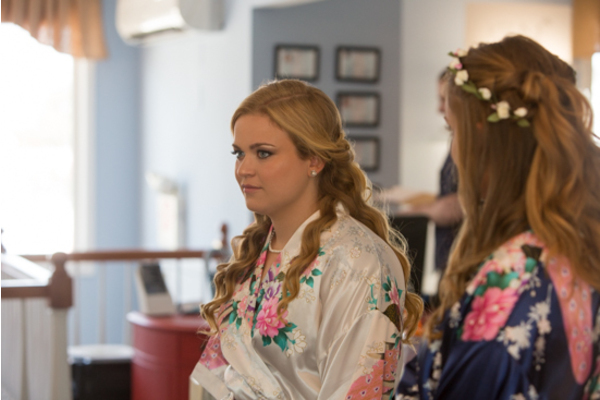 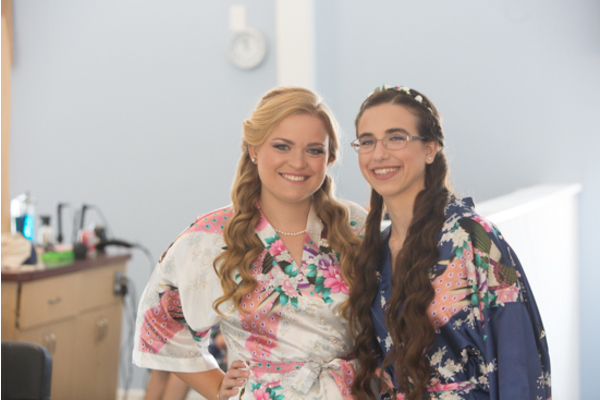 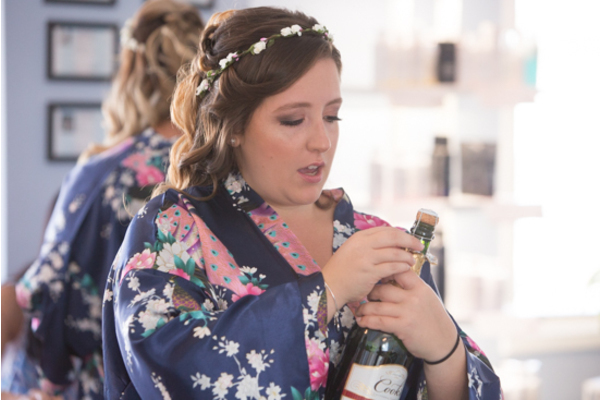 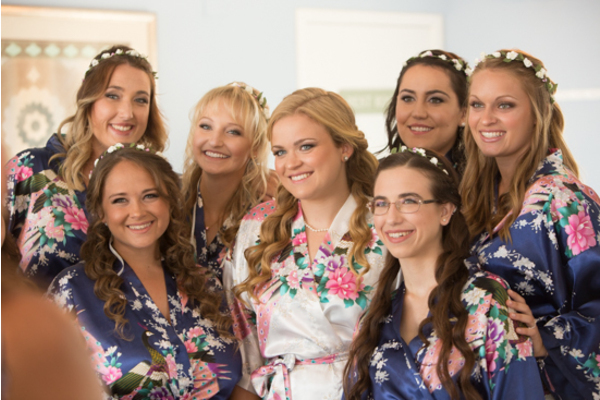 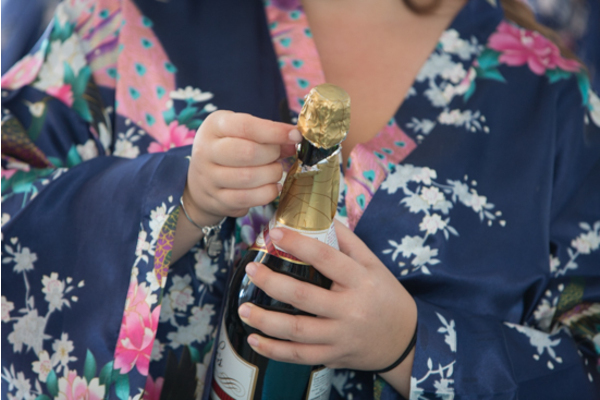 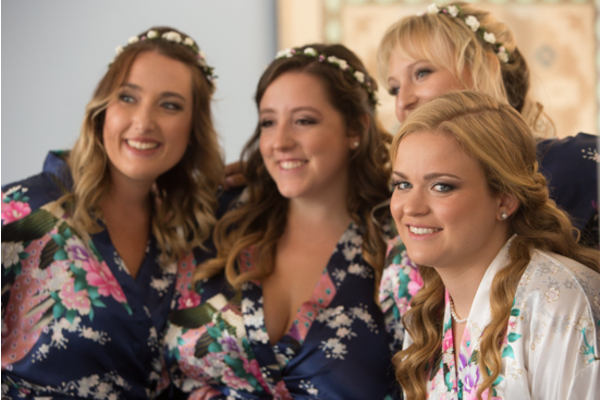 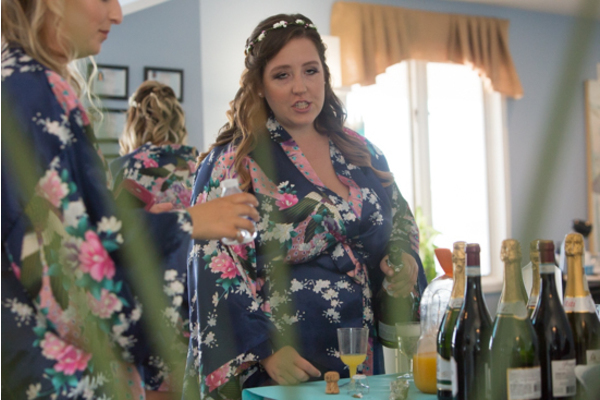 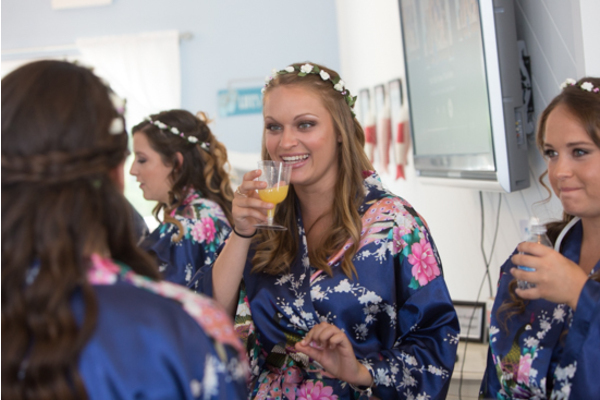 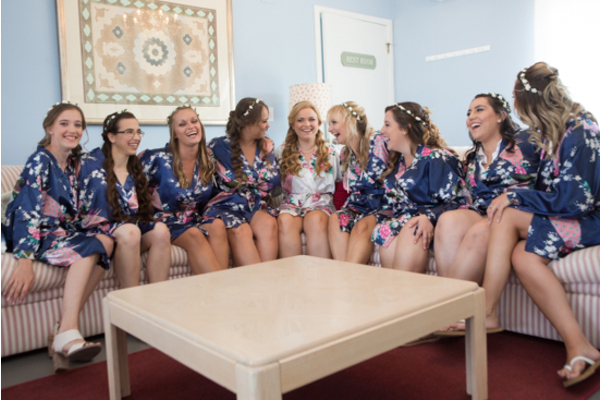 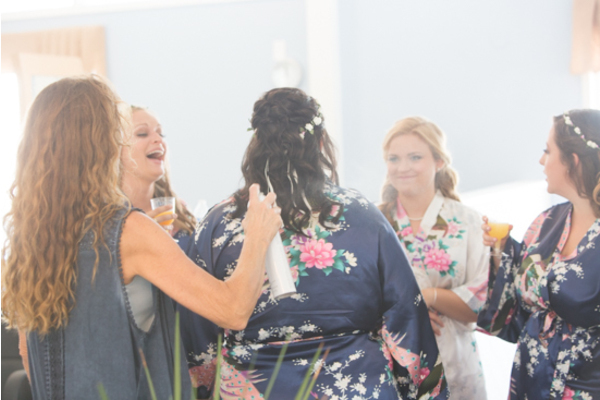 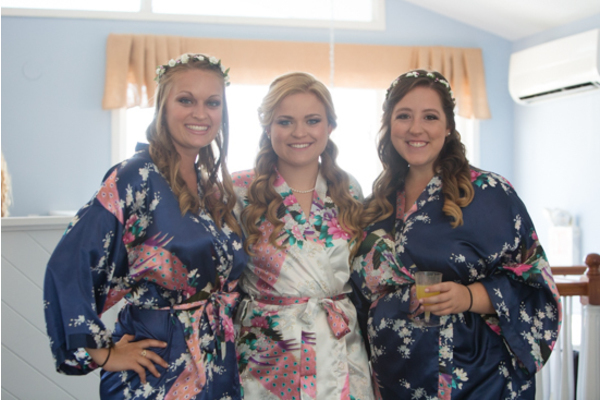 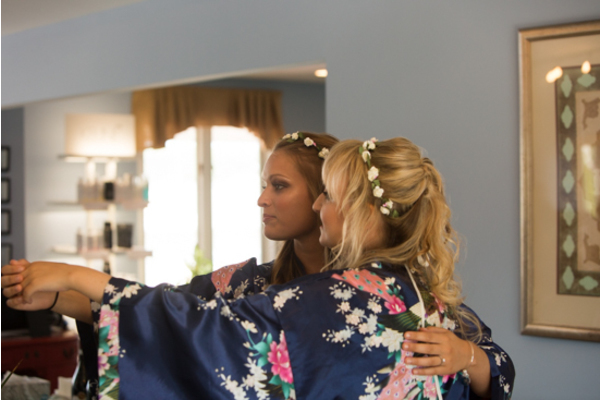 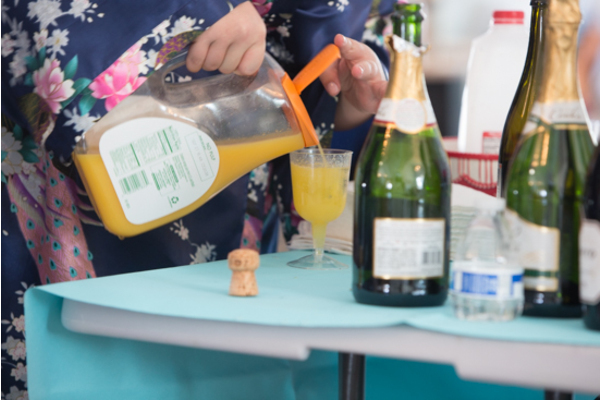 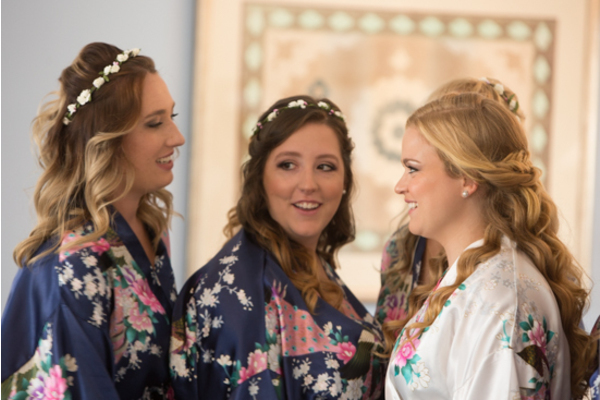 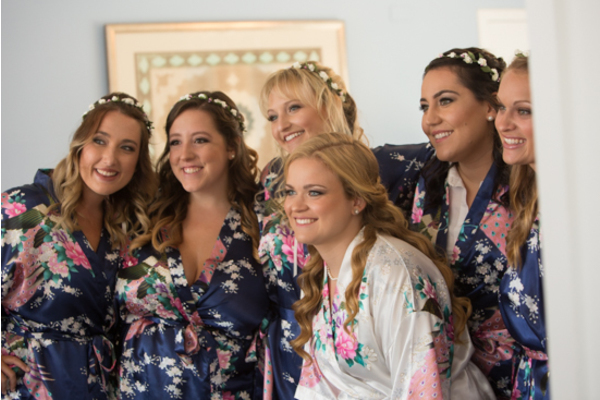 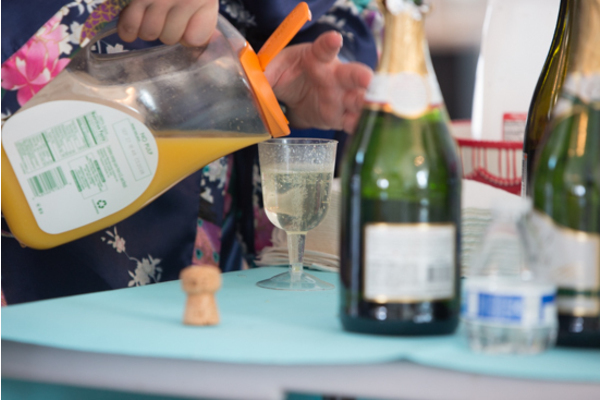 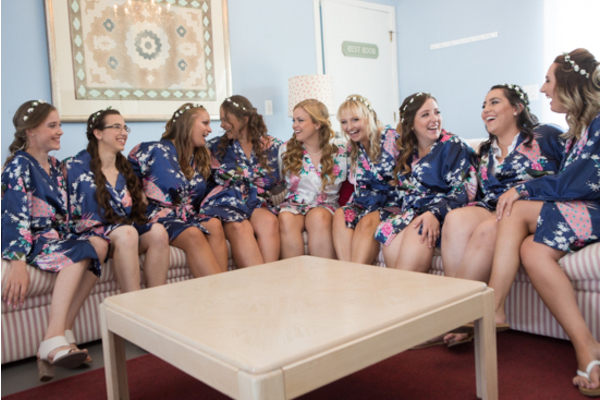 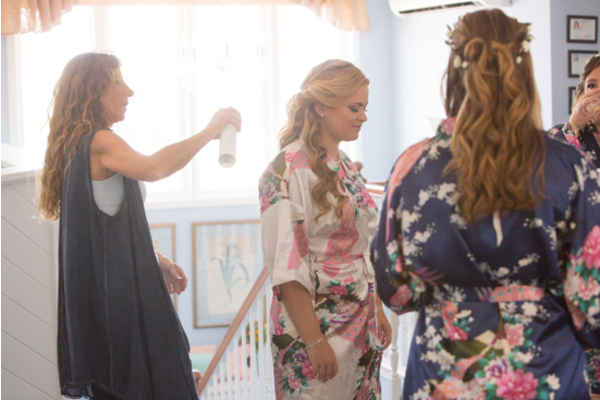 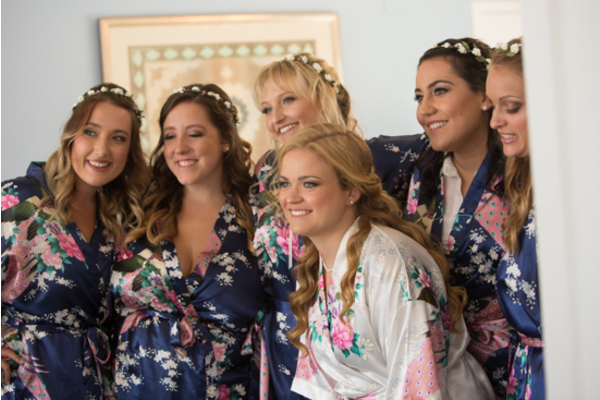 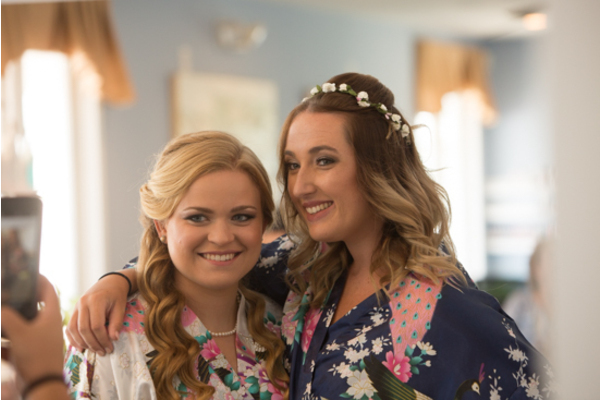 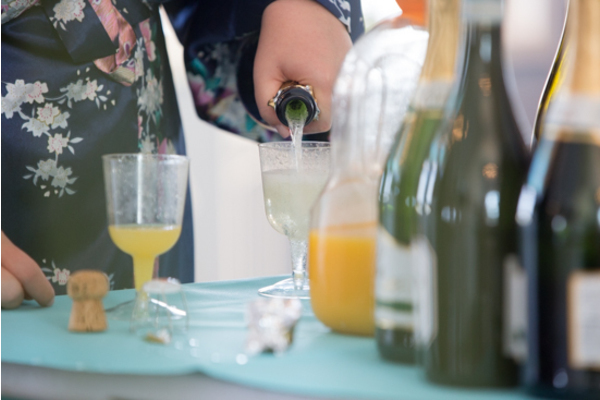 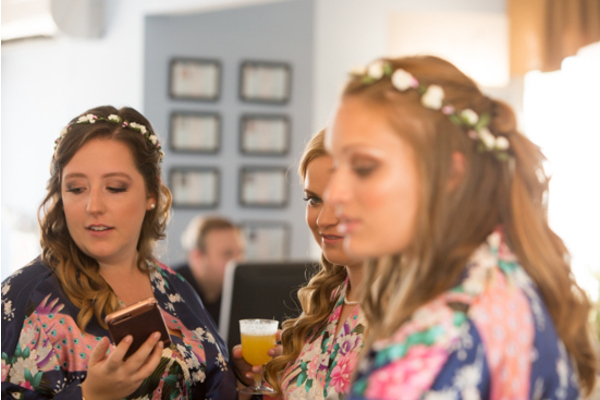 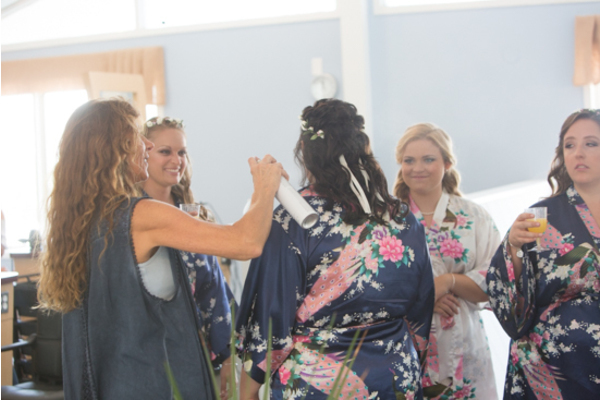 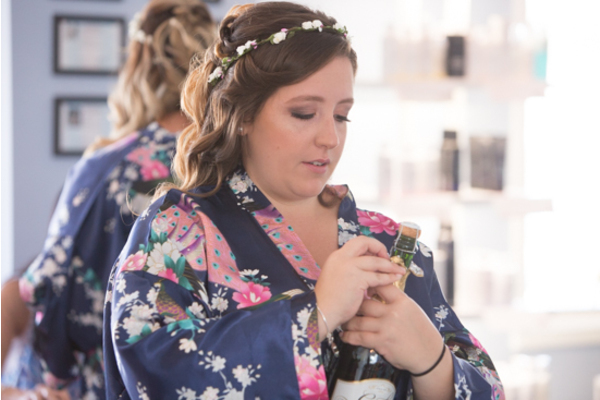 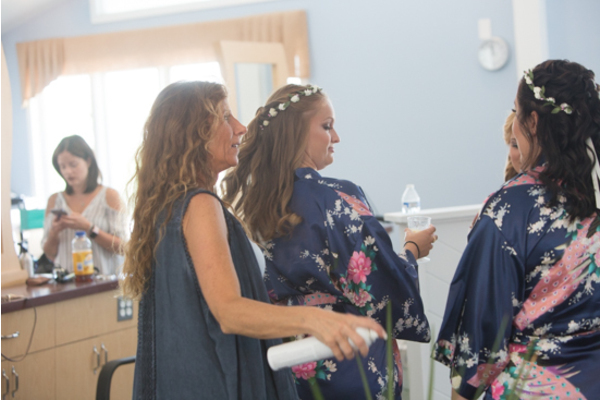 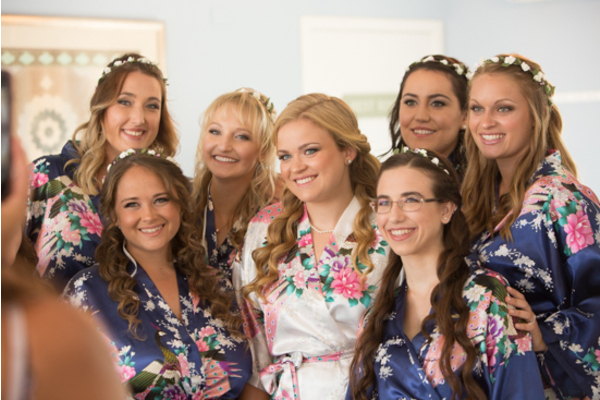 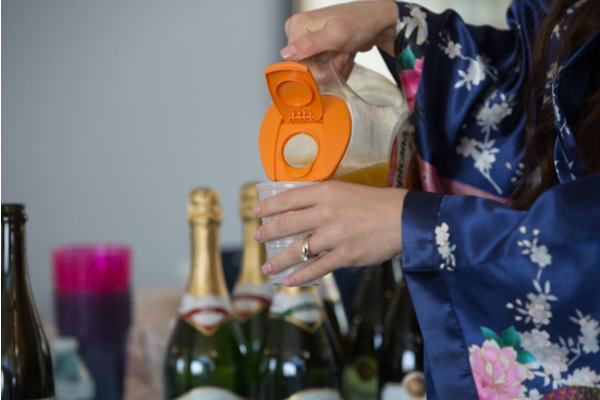 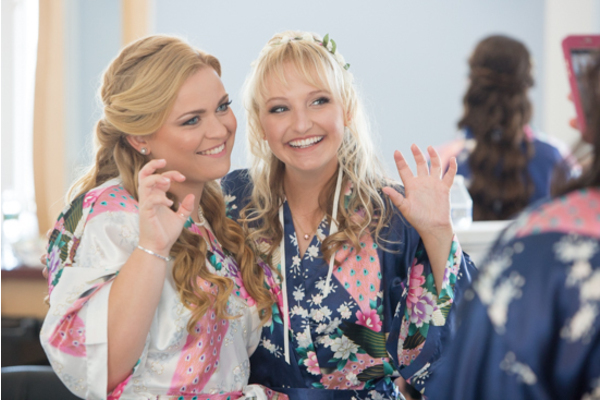 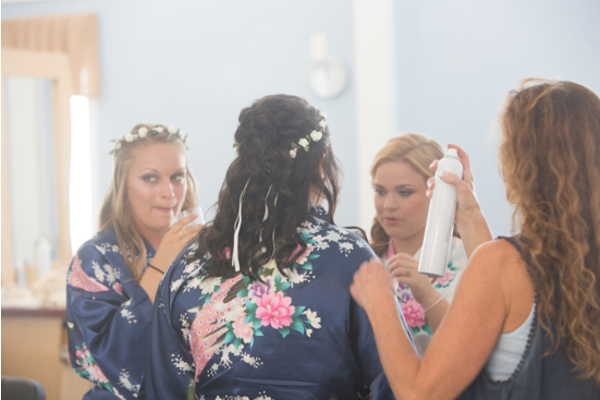 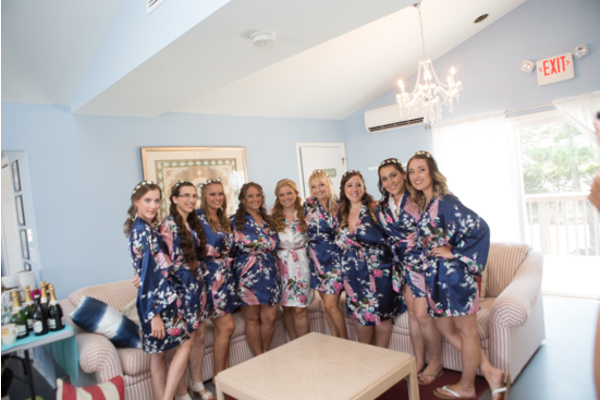 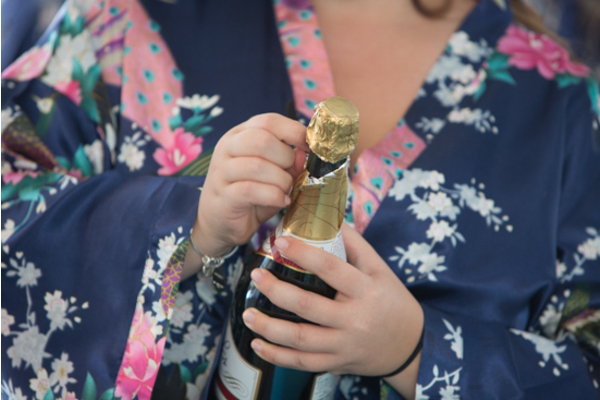 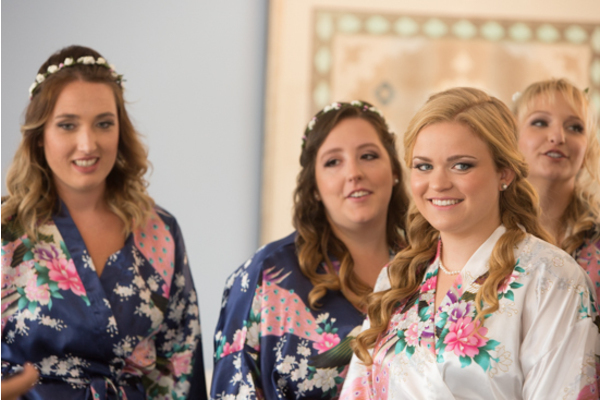 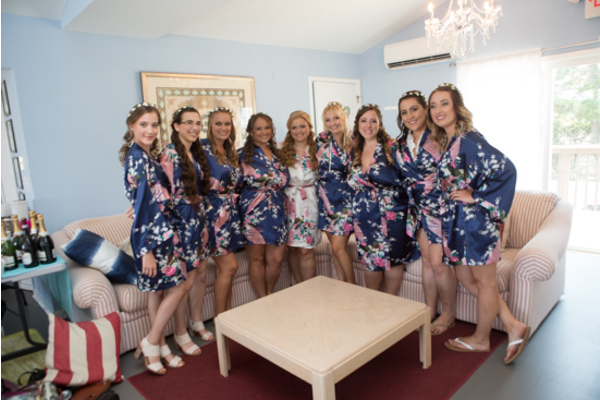 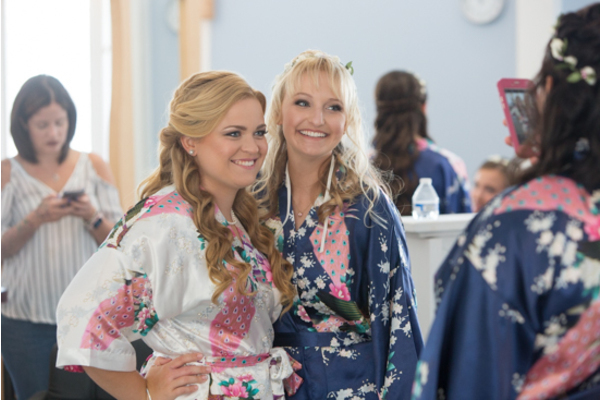 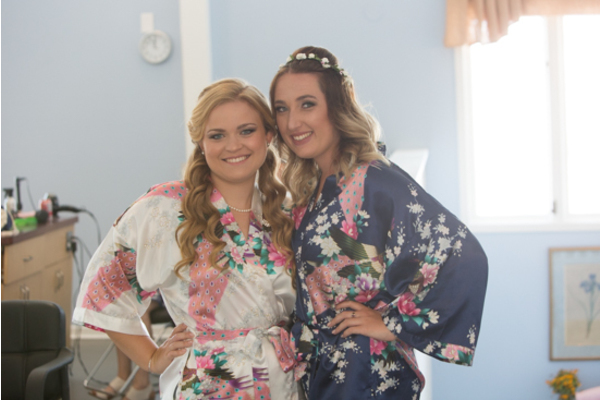 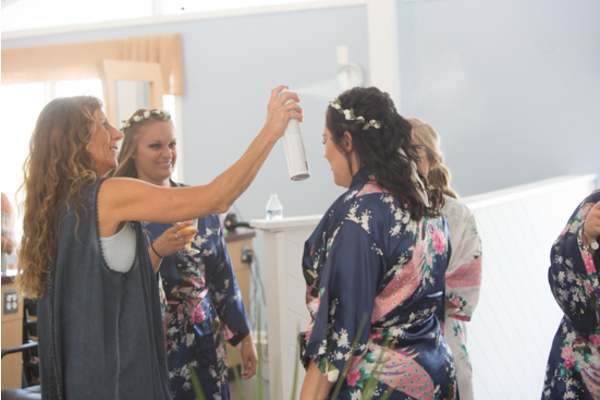 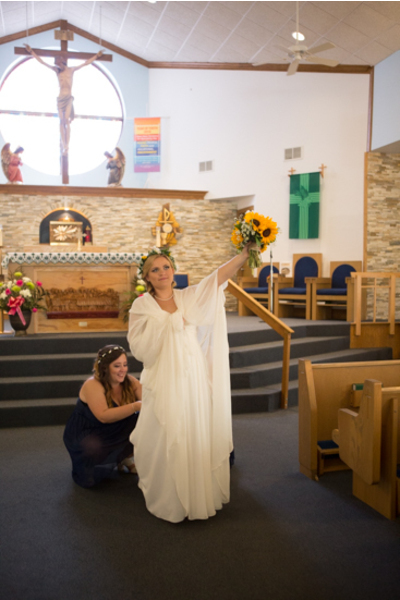 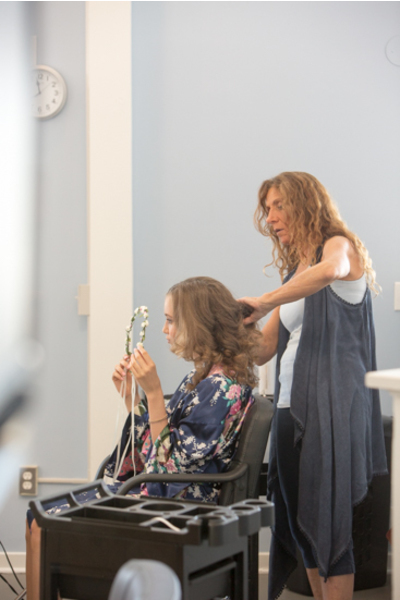 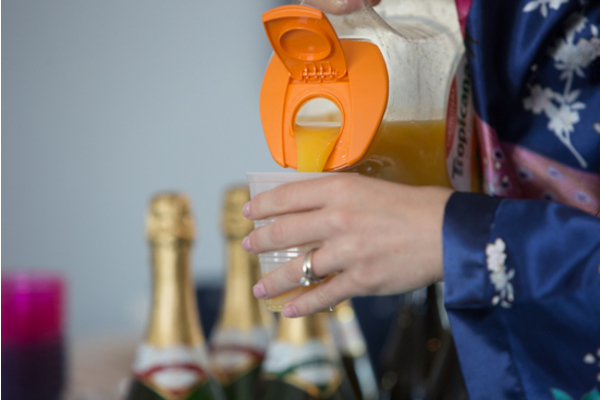 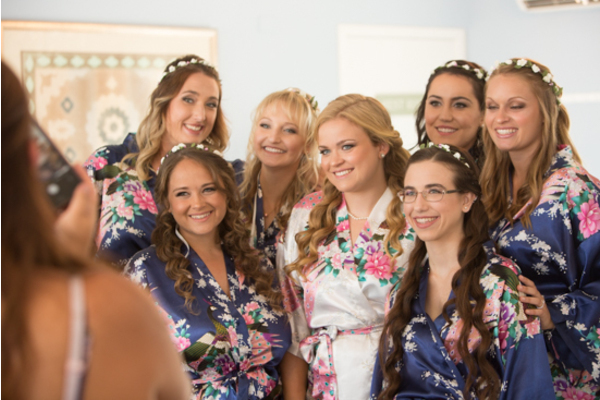 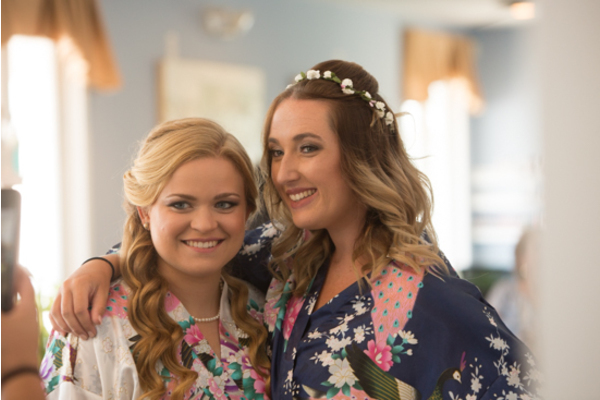 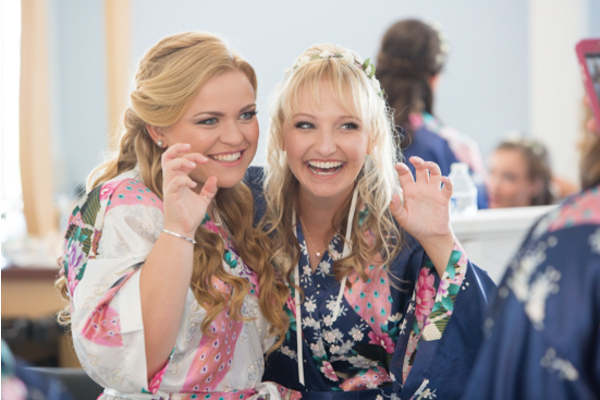 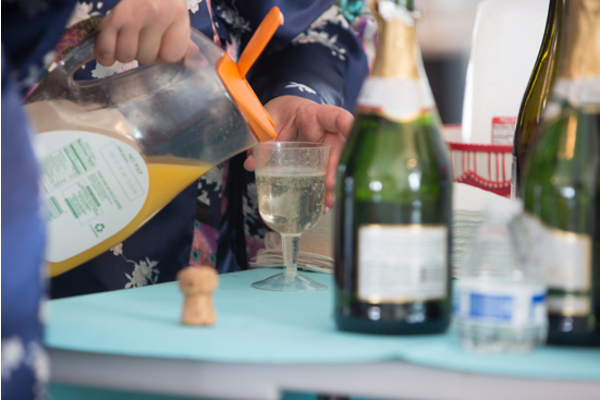 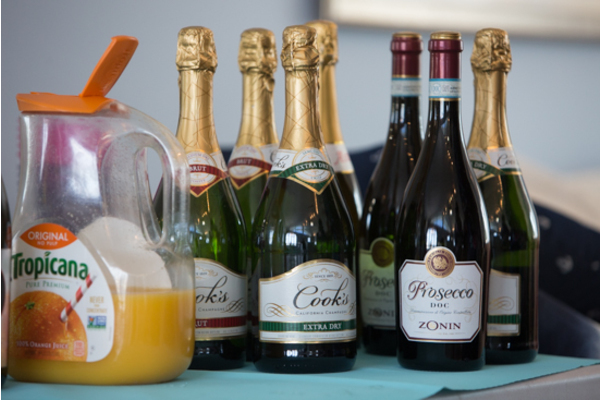 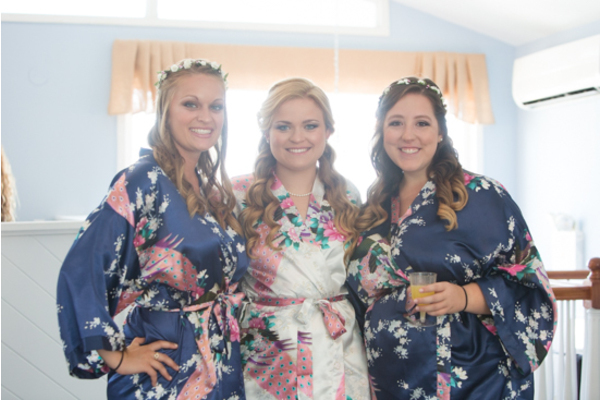 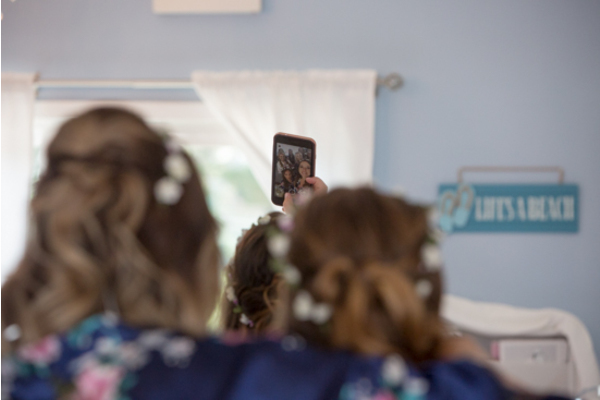 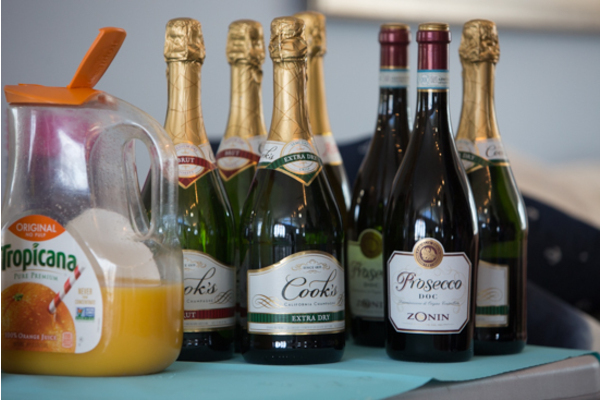 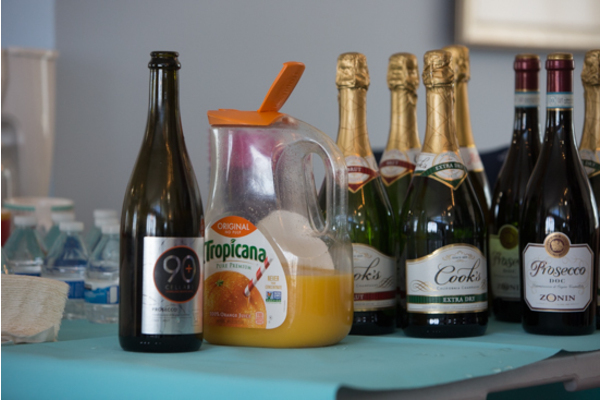 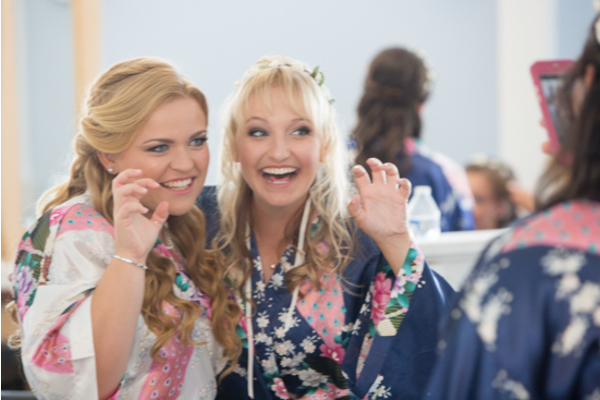 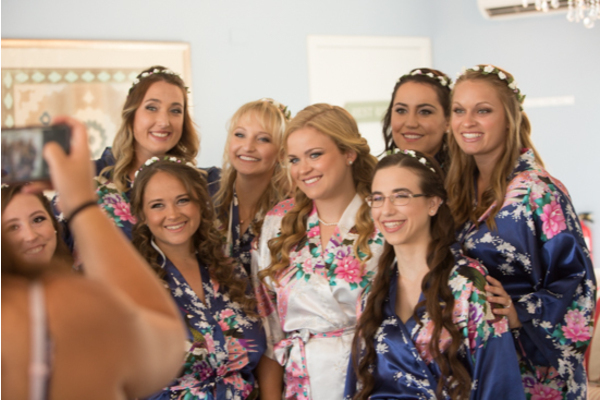 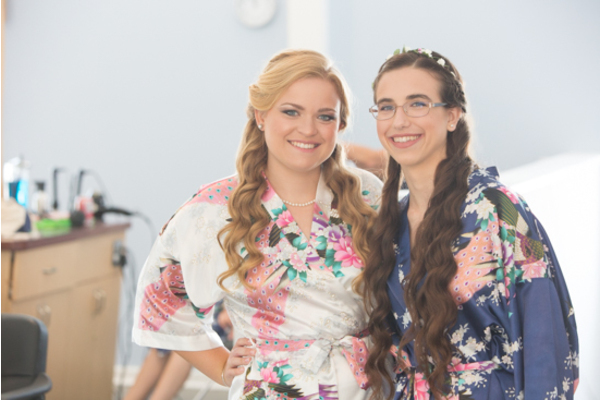 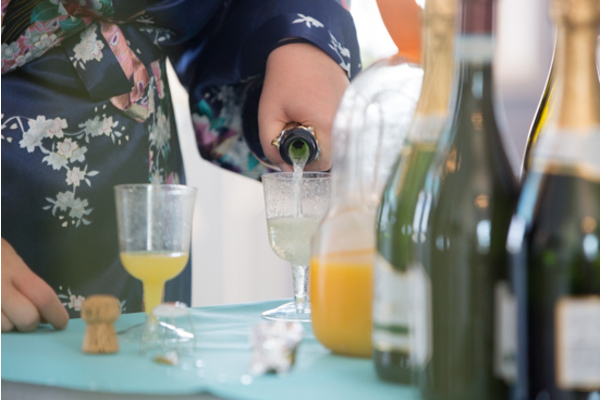 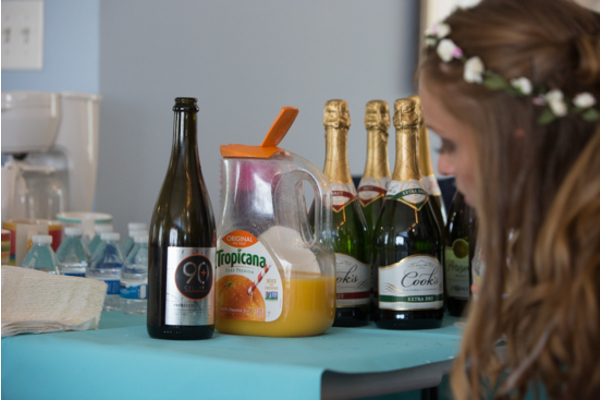 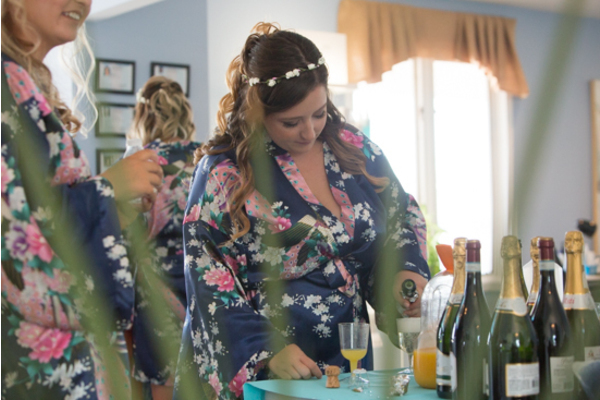 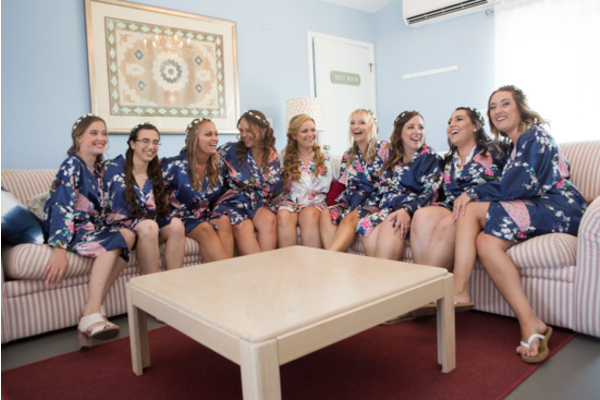 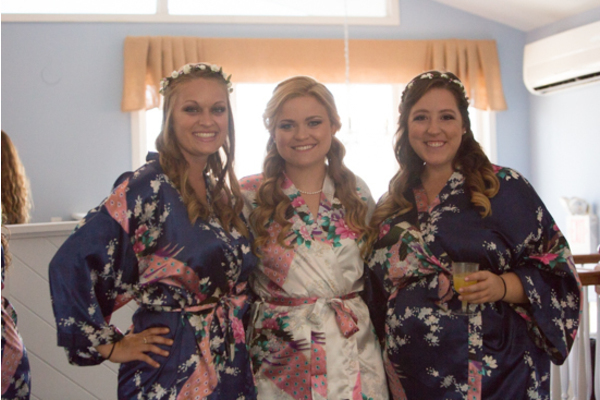 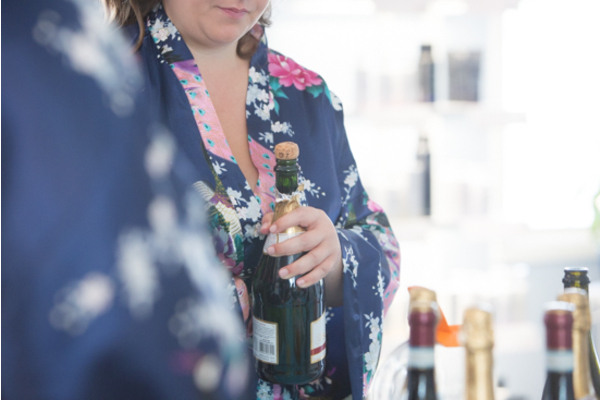 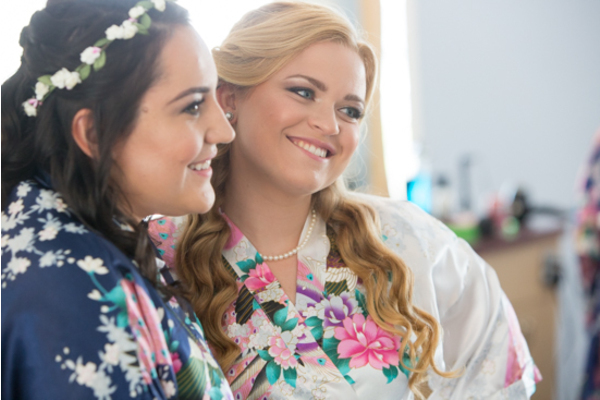 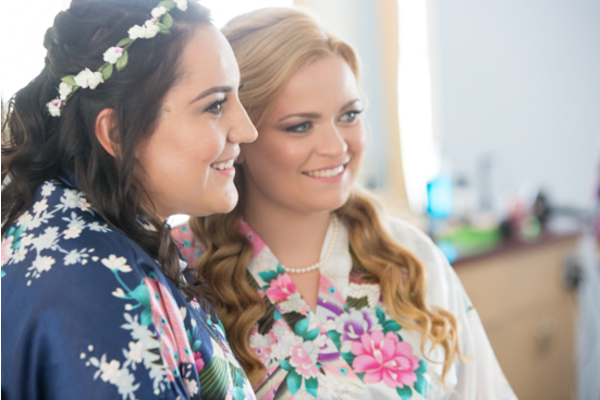 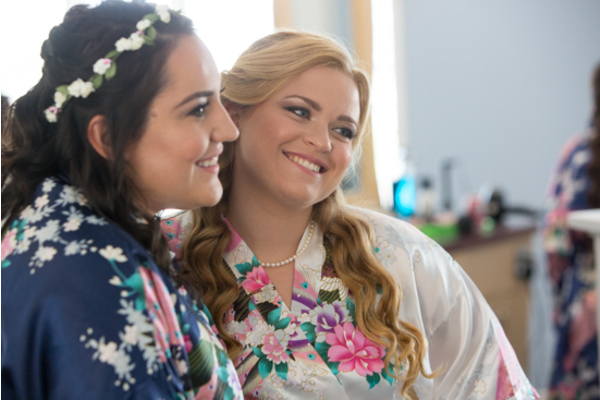 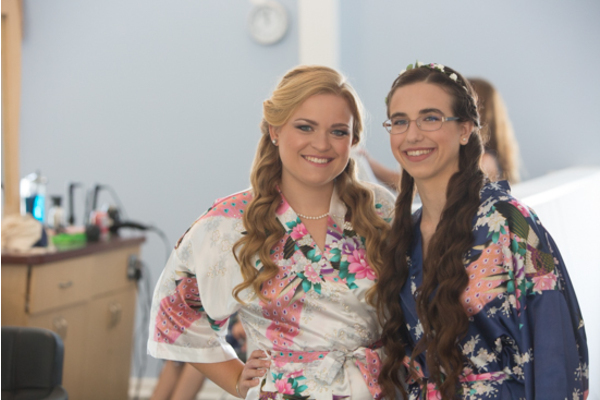 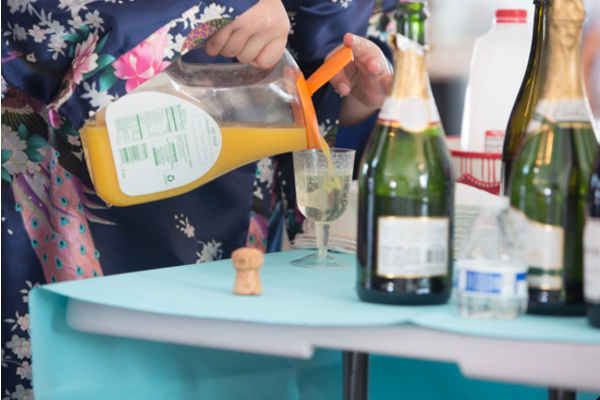 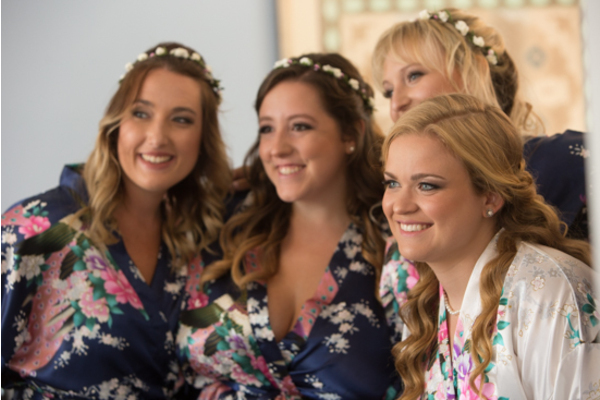 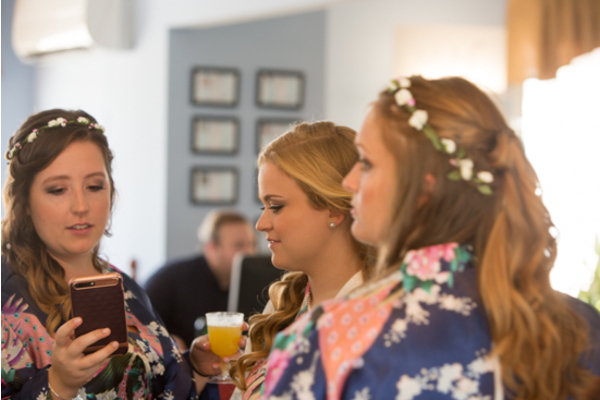 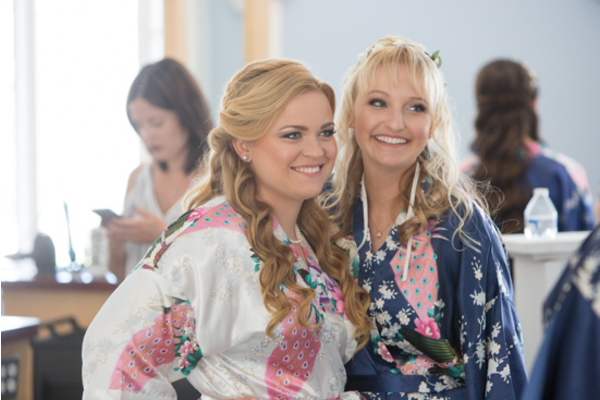 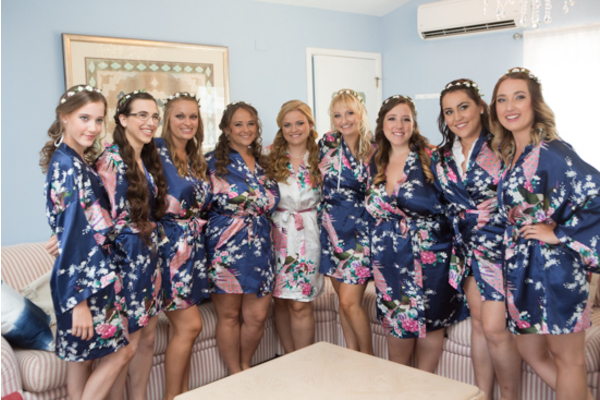 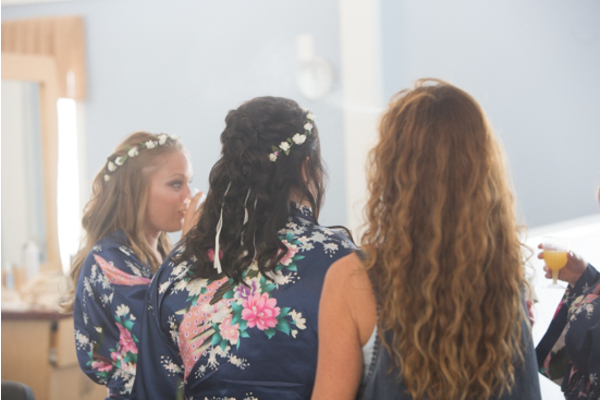 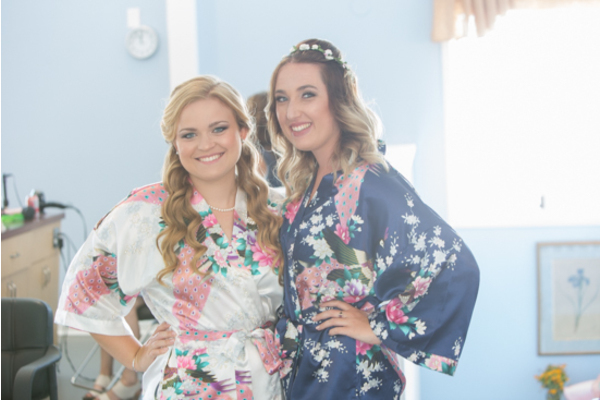 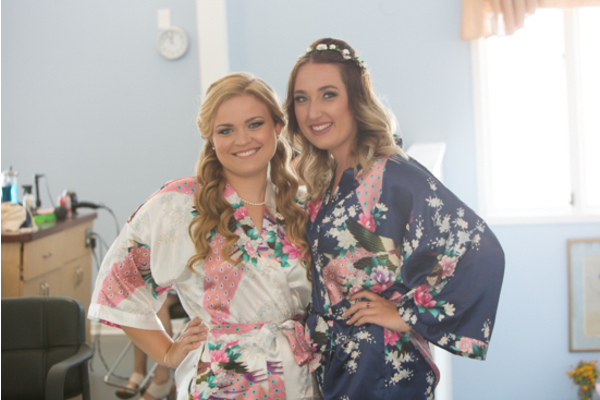 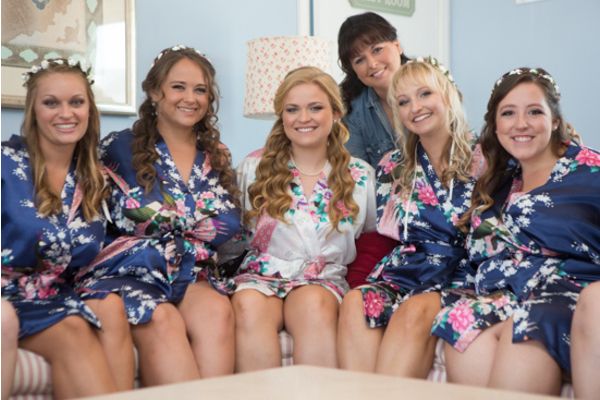 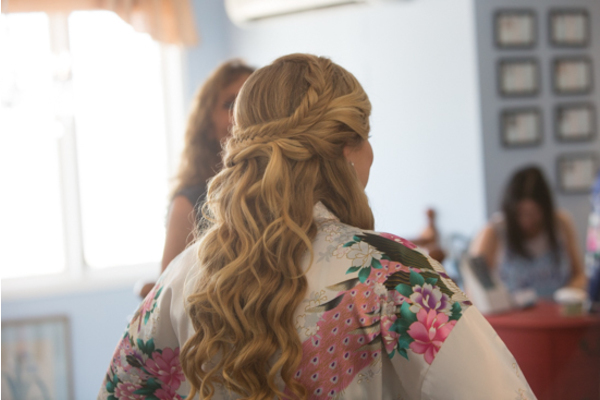 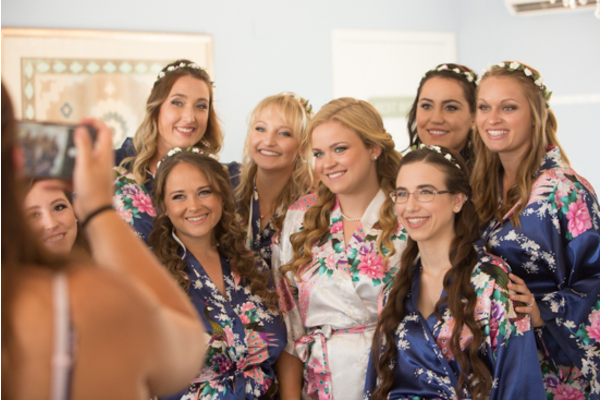 To begin, Emily and her bridesmaid got ready in matching floral silk robes with mimosas in hand! 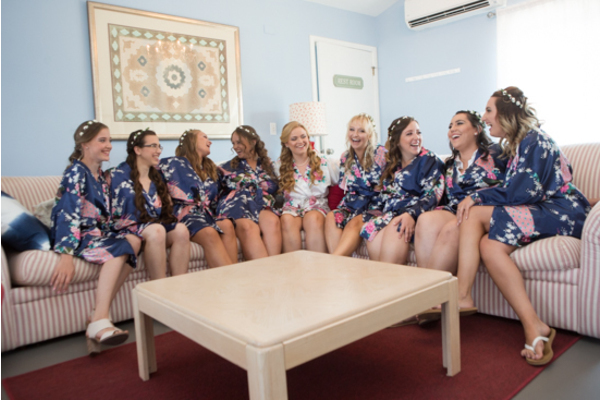 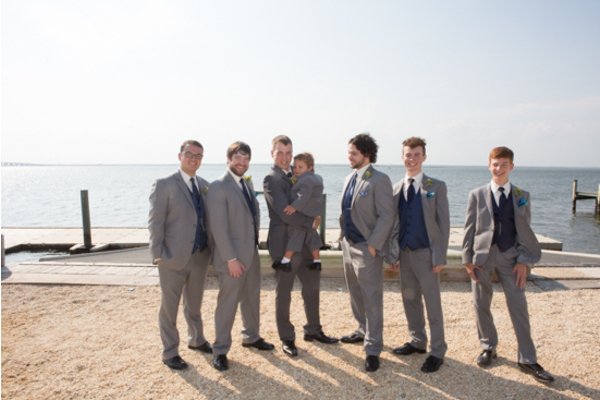 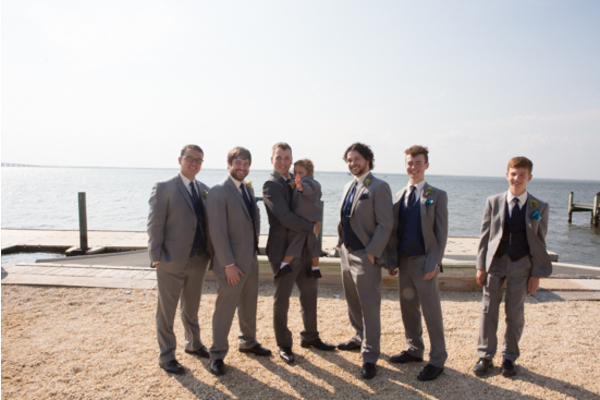 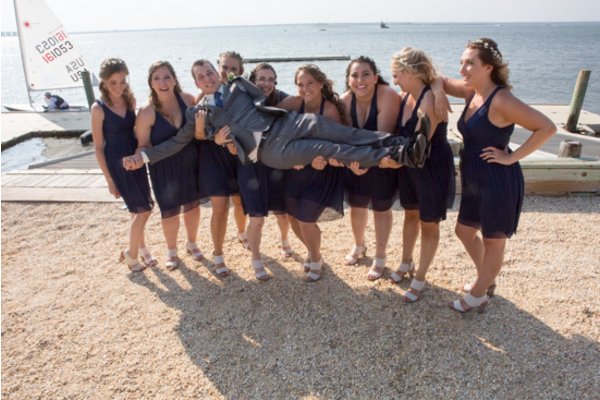 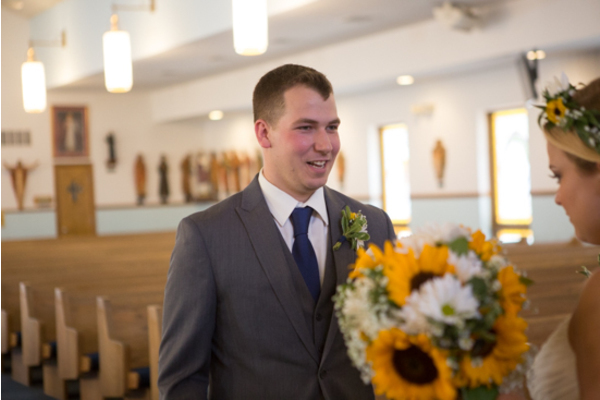 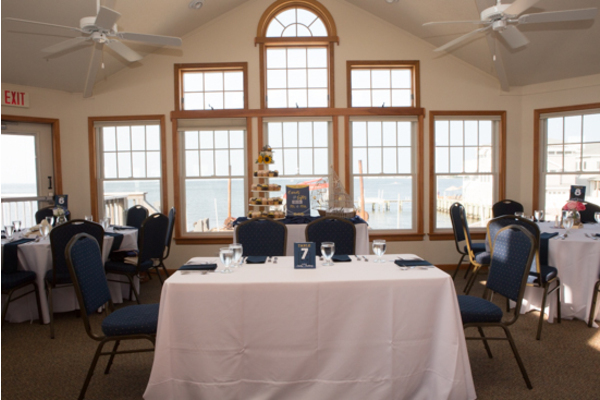 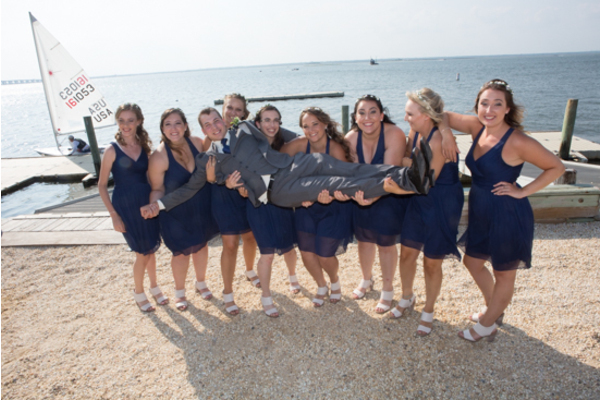 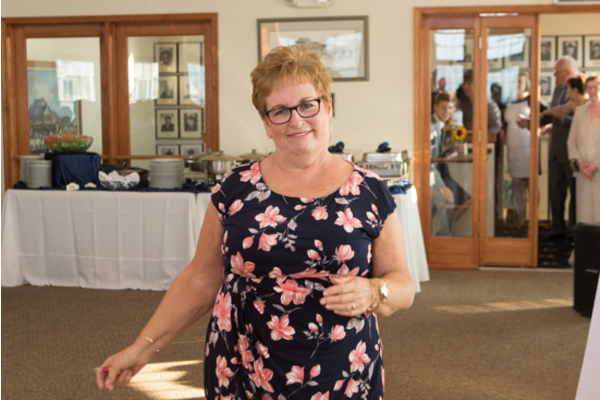 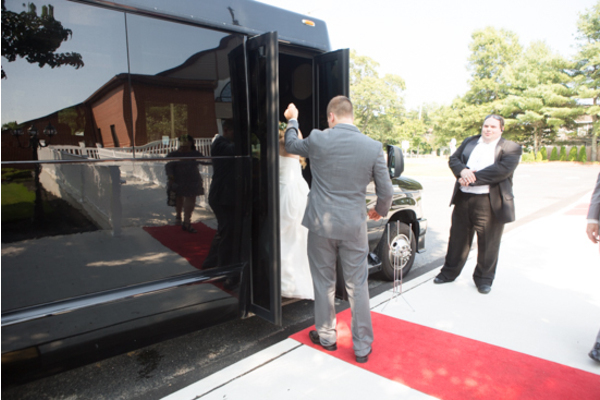 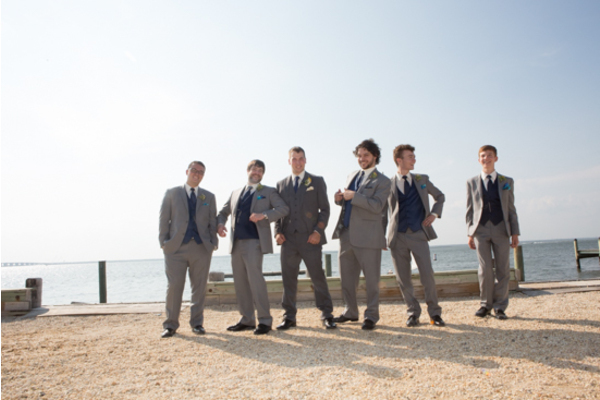 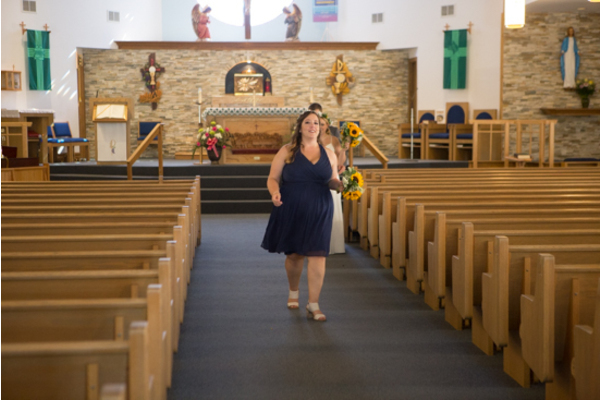 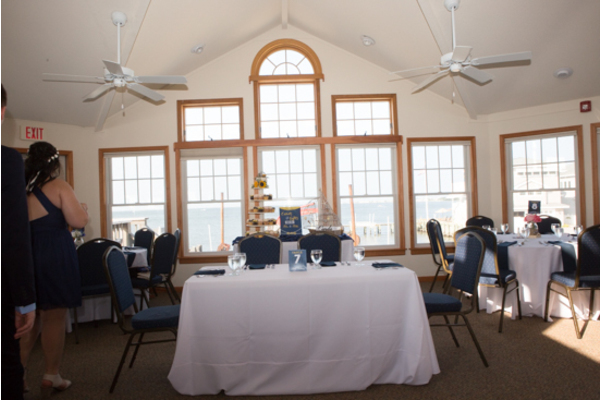 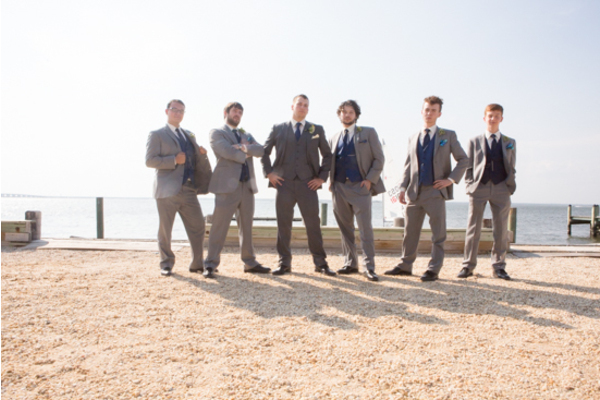 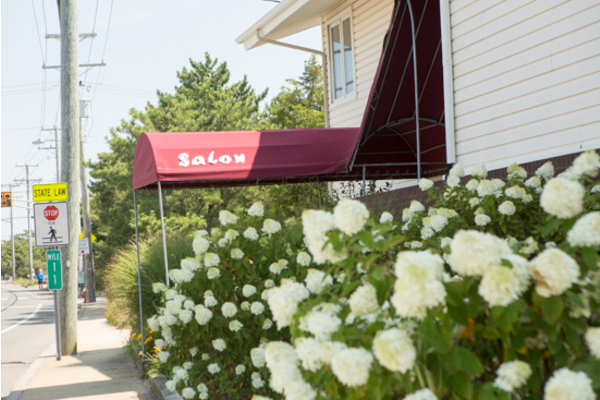 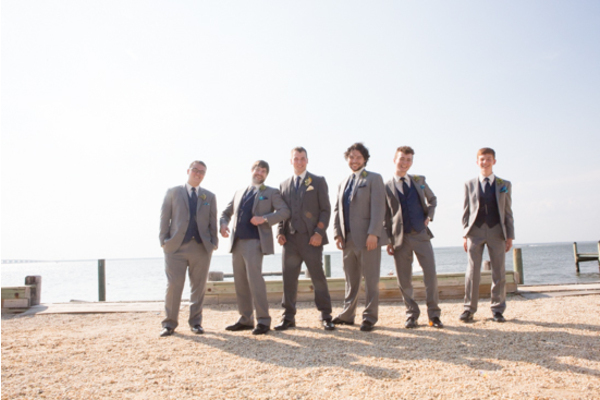 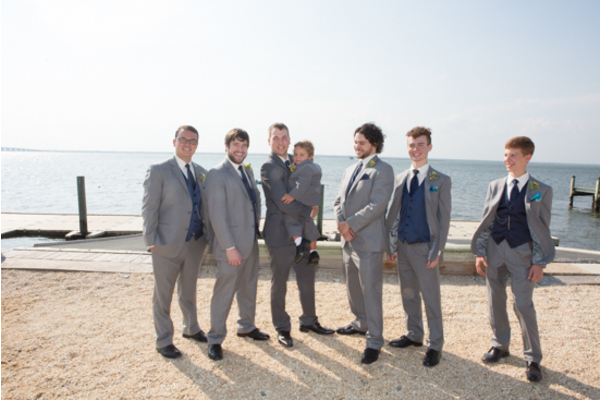 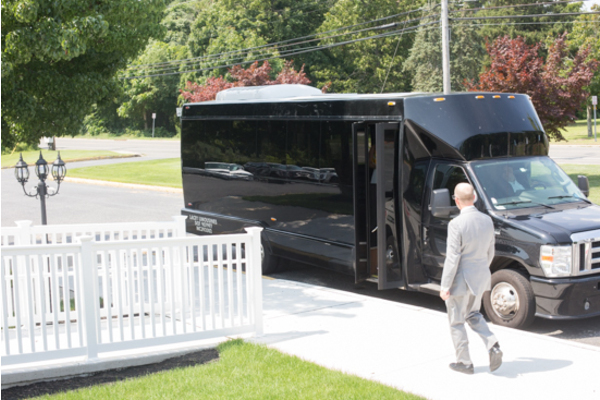 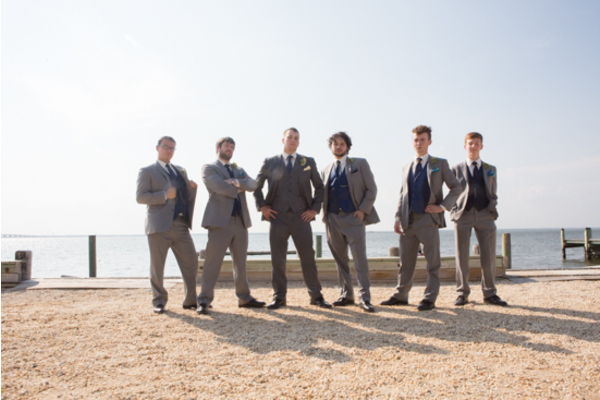 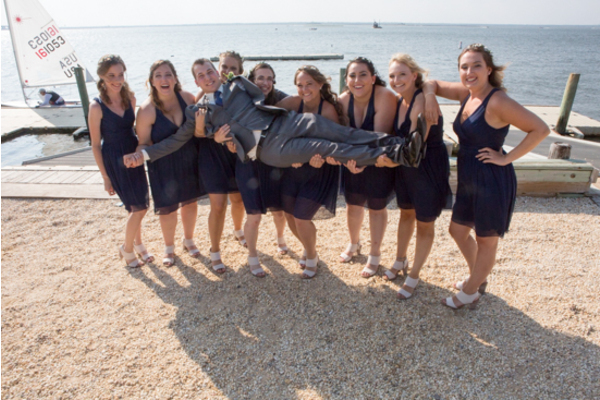 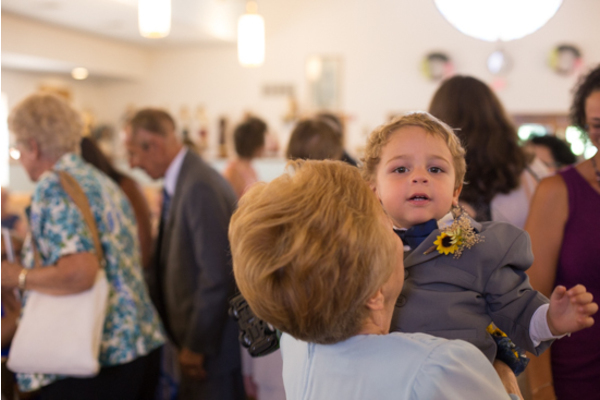 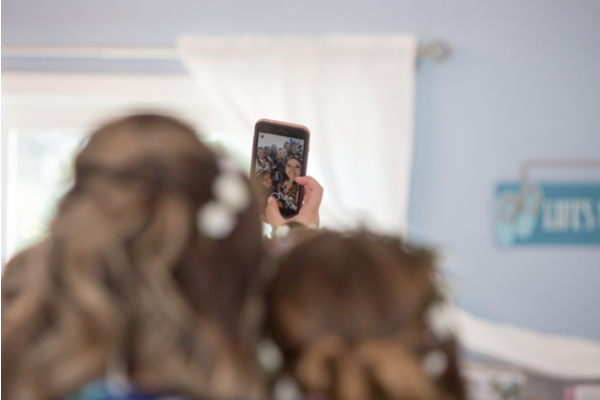 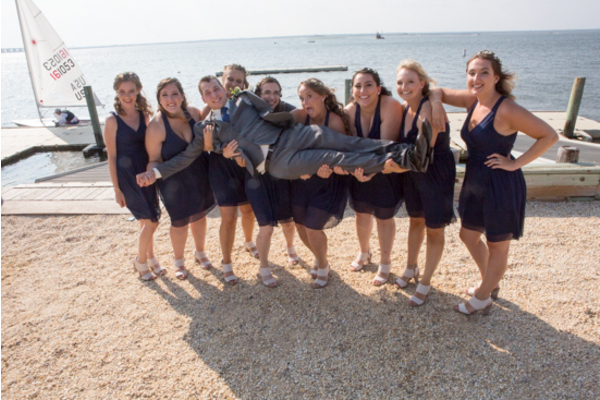 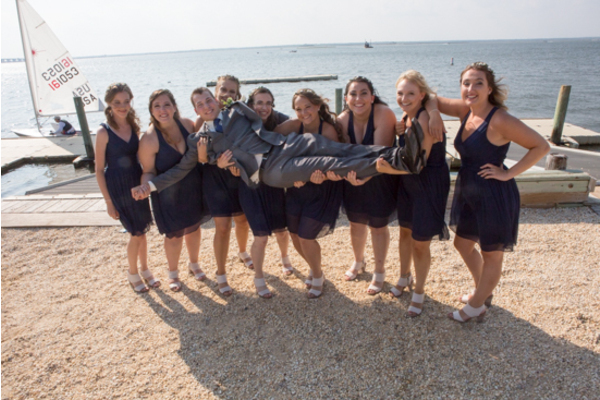 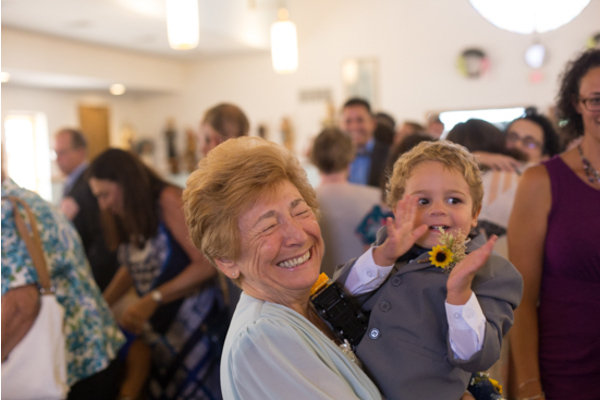 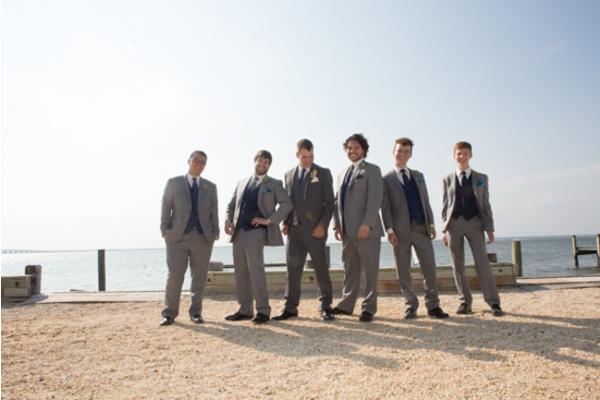 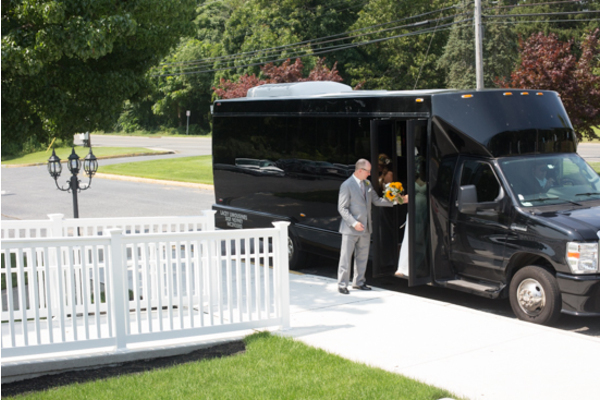 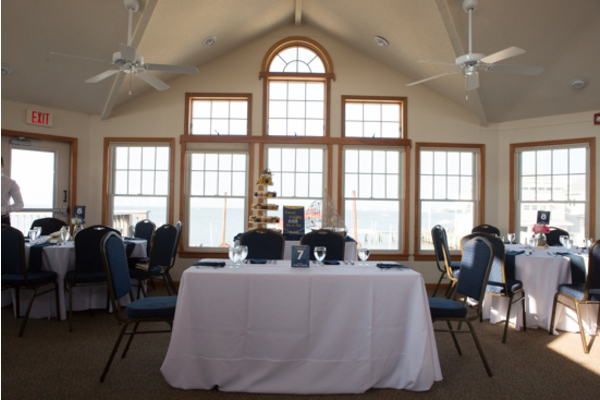 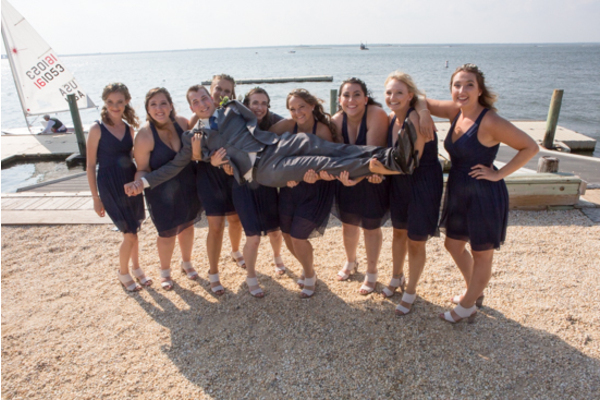 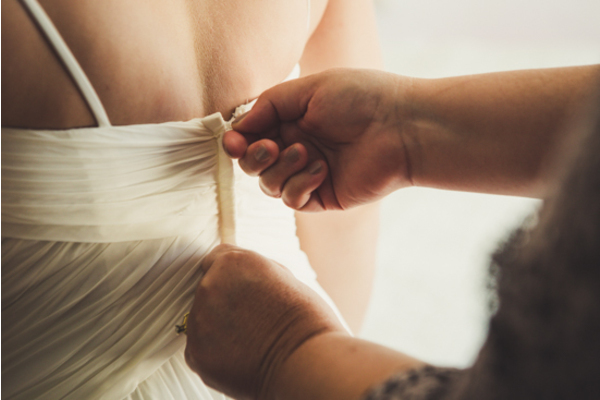 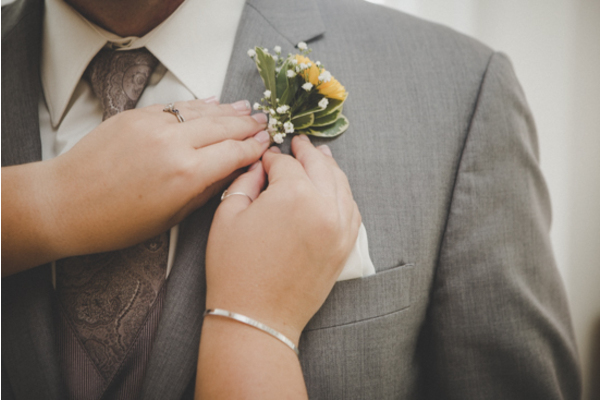 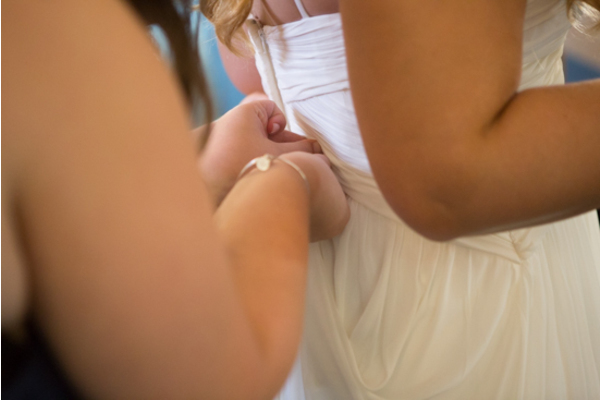 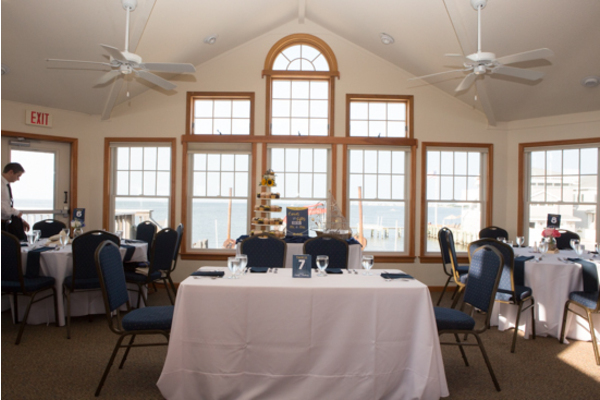 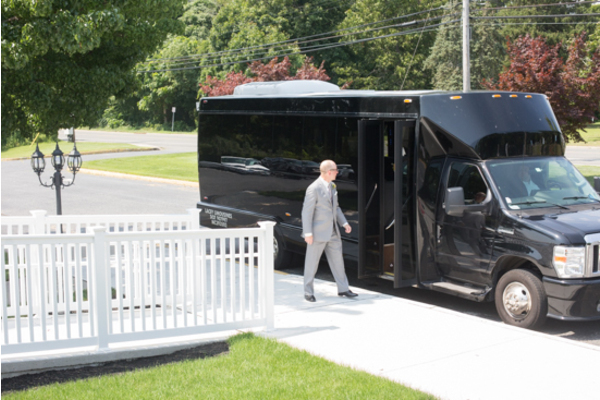 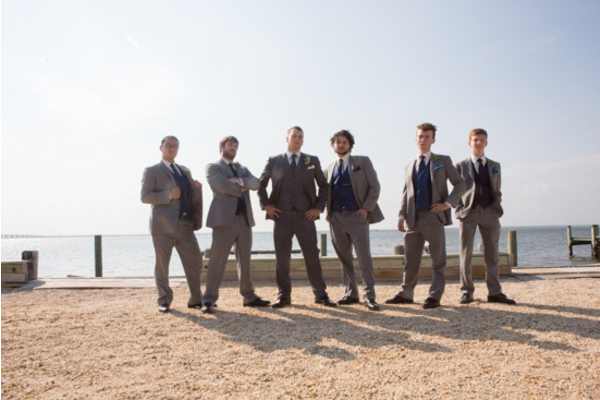 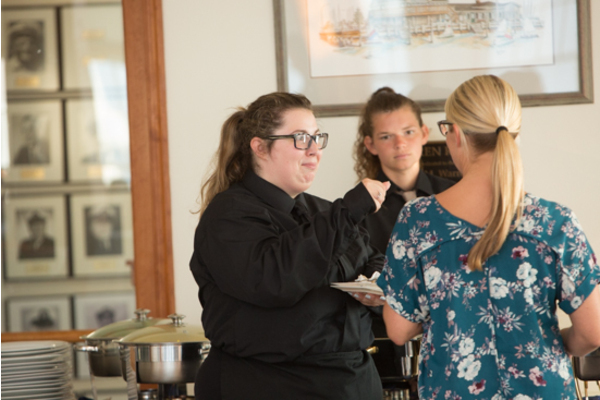 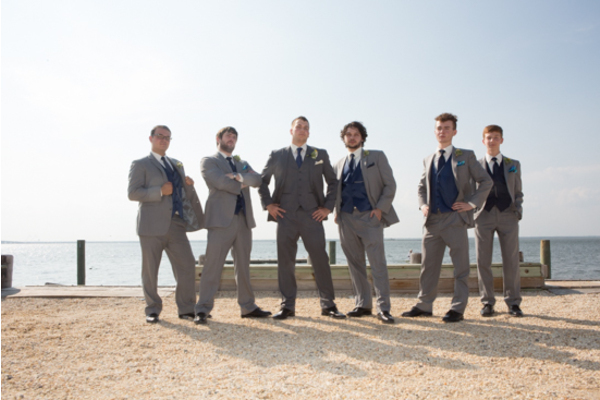 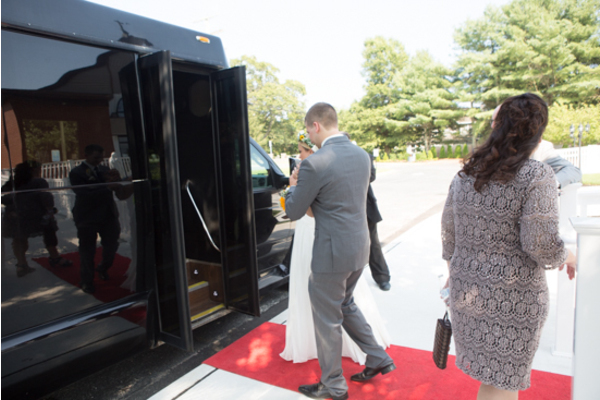 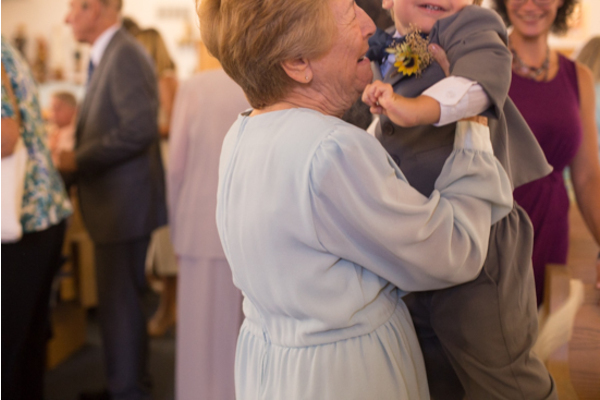 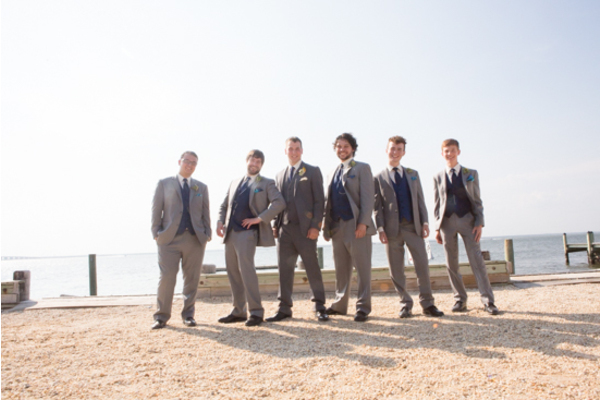 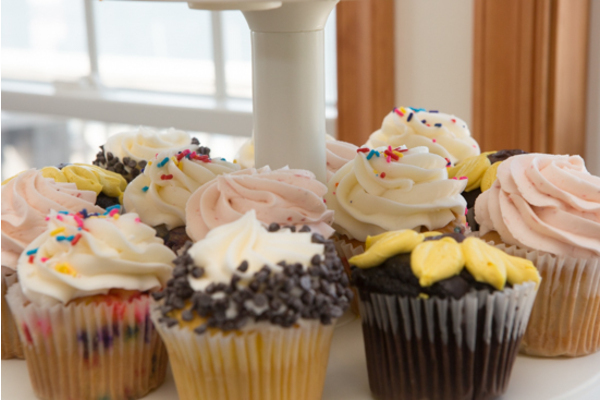 Our NJ Wedding Photographer captured all of the laughs that were had in preparation for the big day. 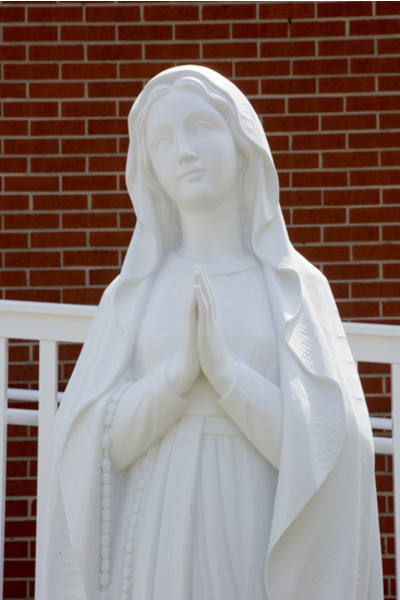 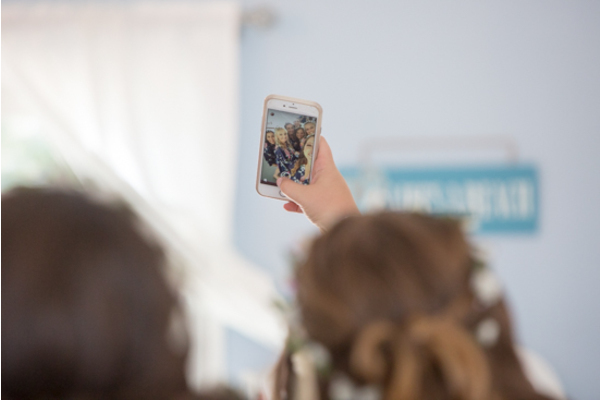 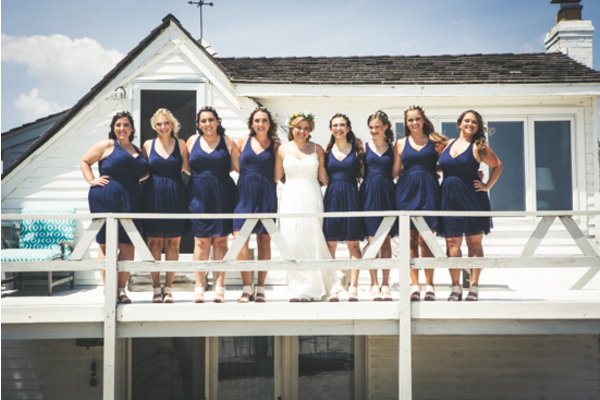 After slipping into her beautiful dress, Emily and her girls took photos on the porch overlooking the beach. 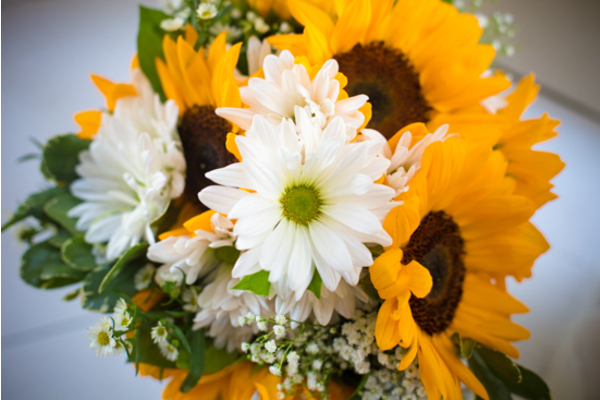 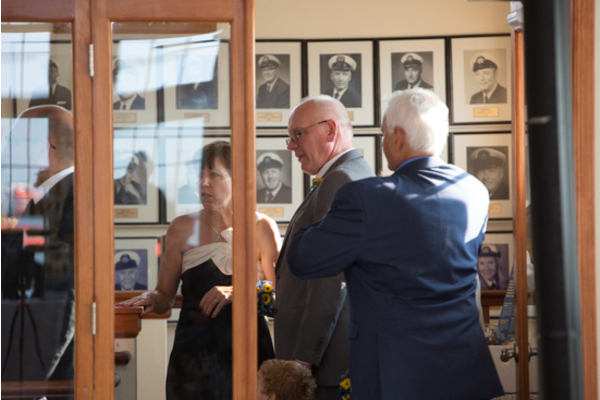 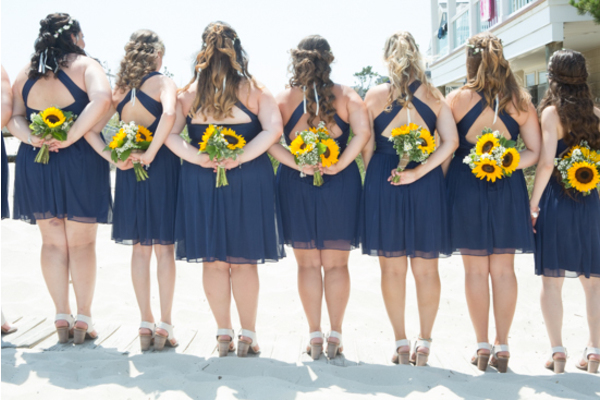 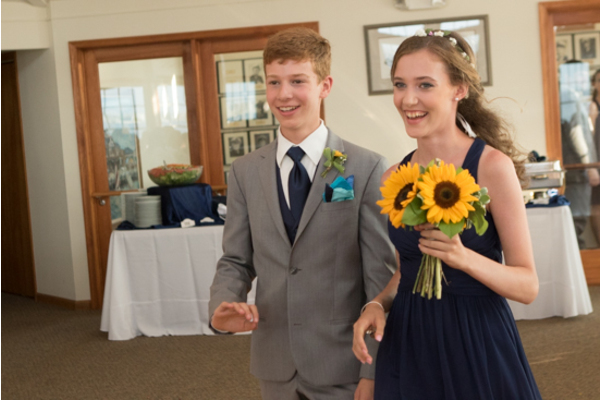 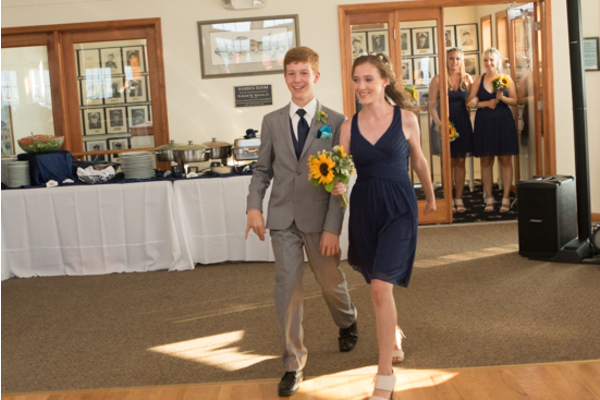 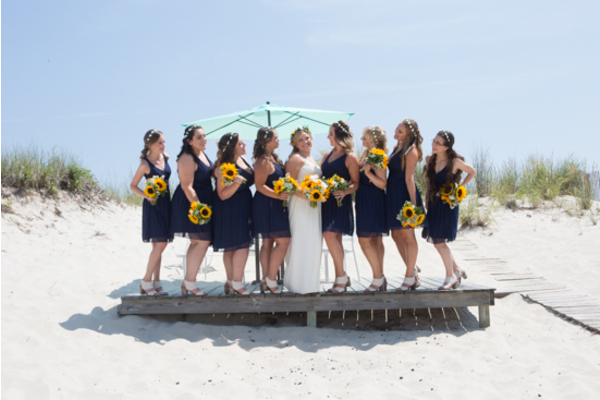 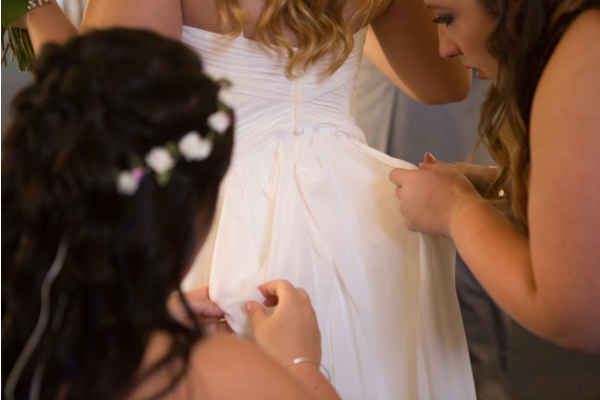 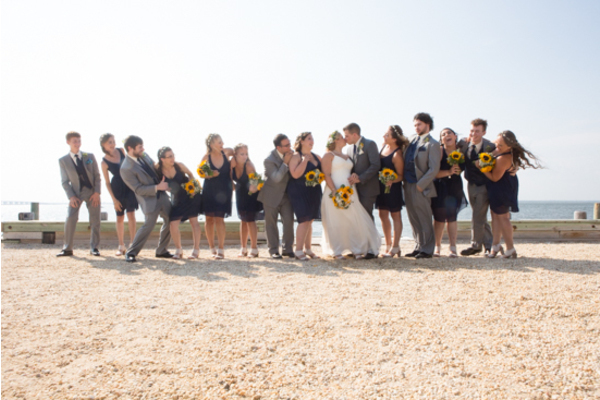 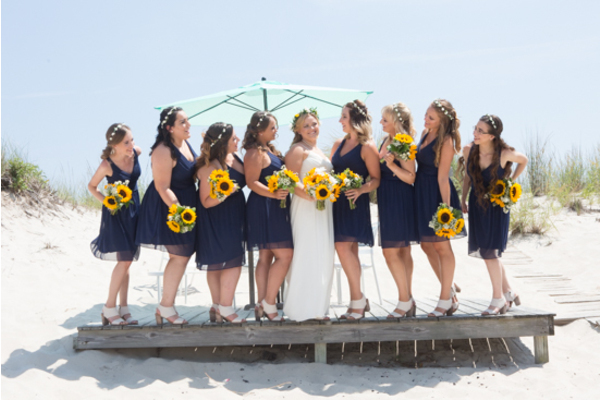 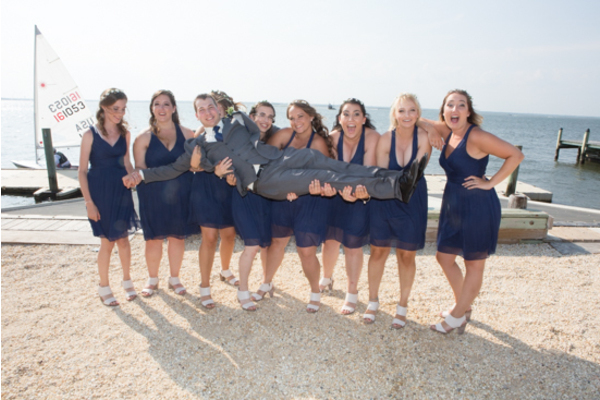 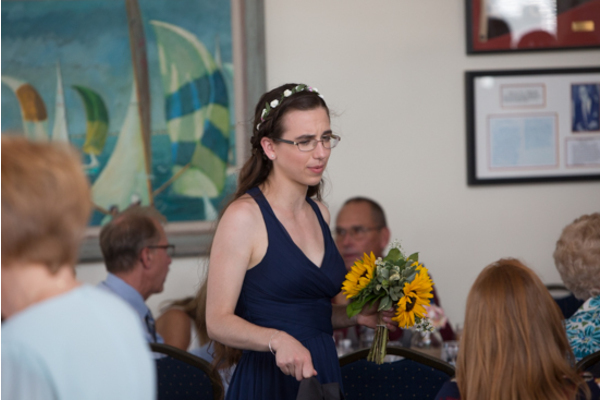 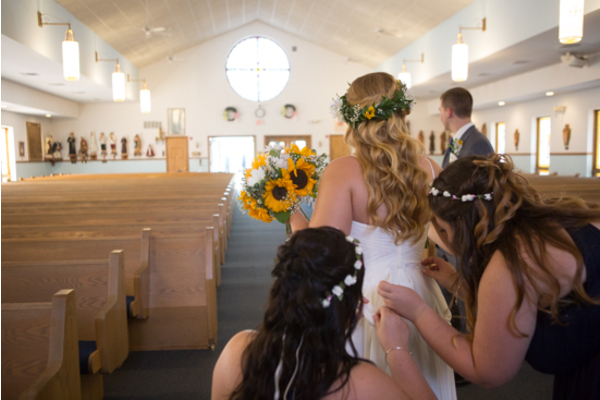 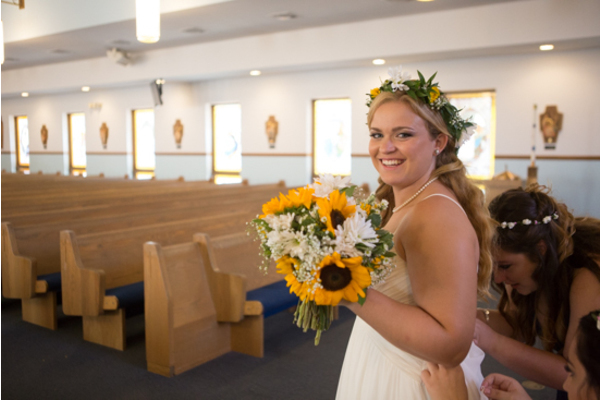 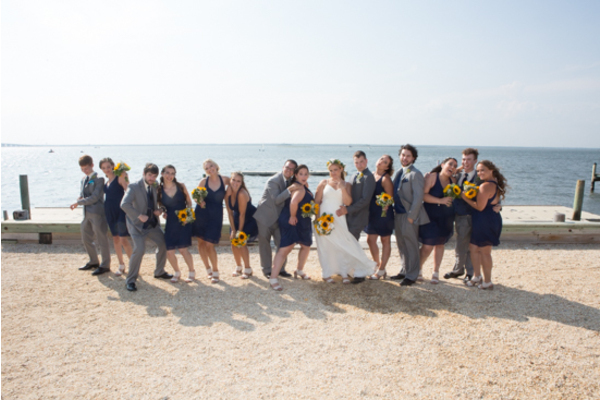 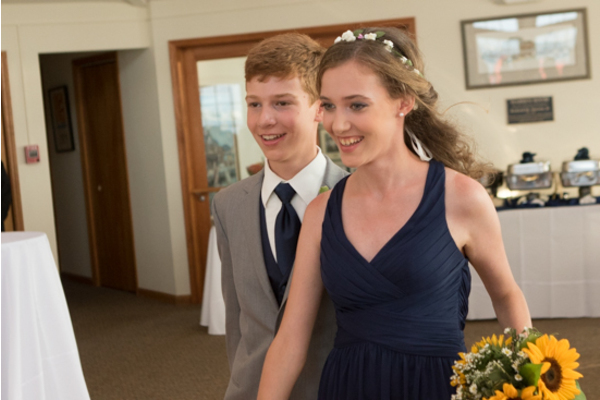 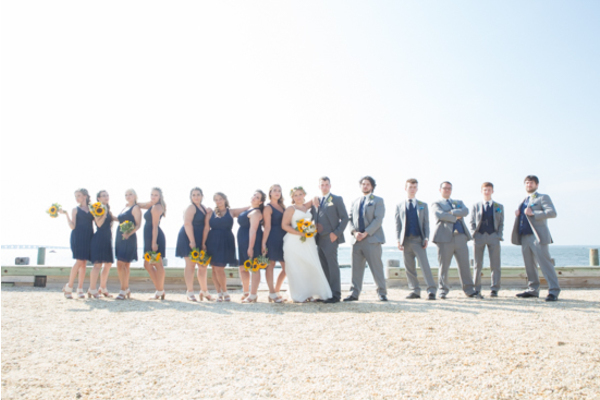 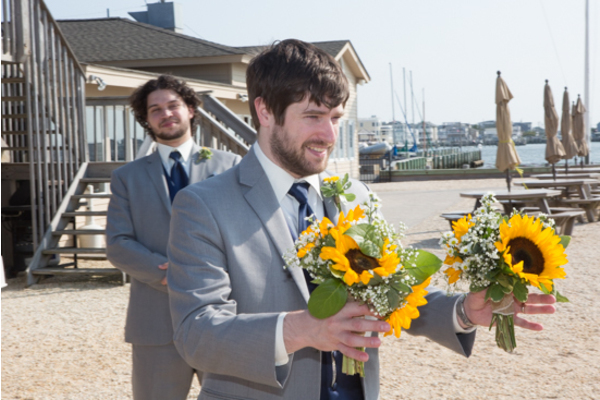 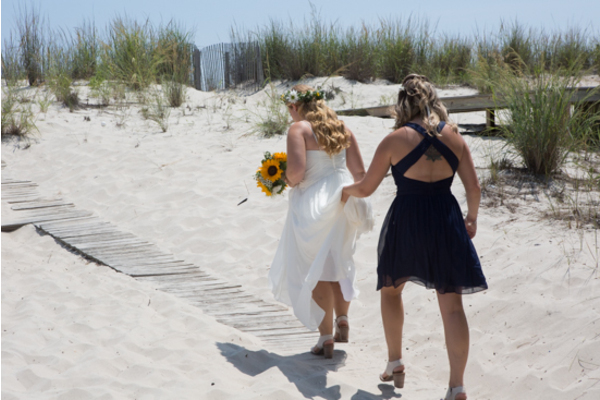 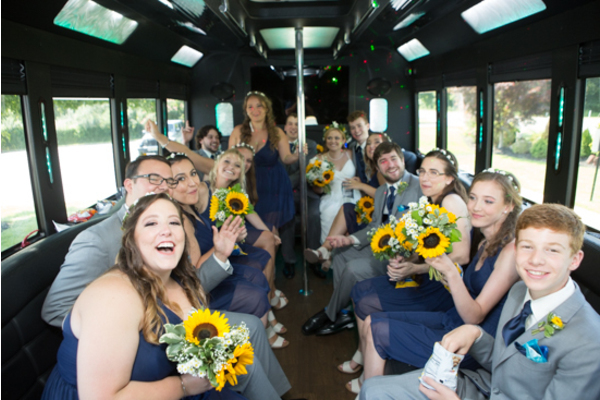 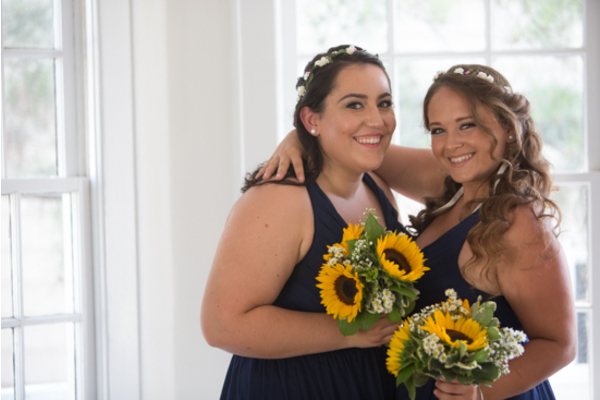 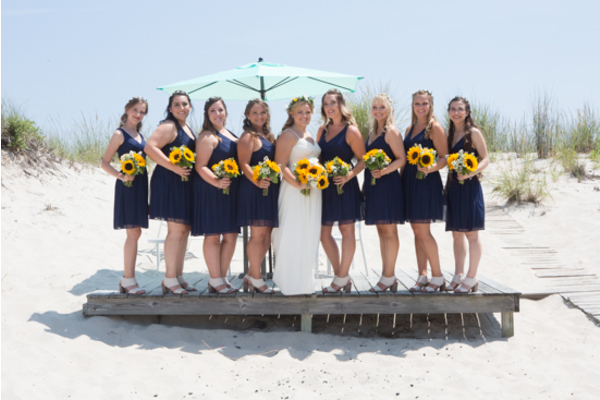 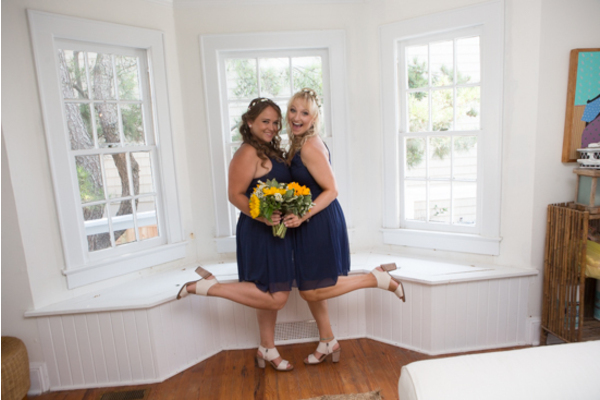 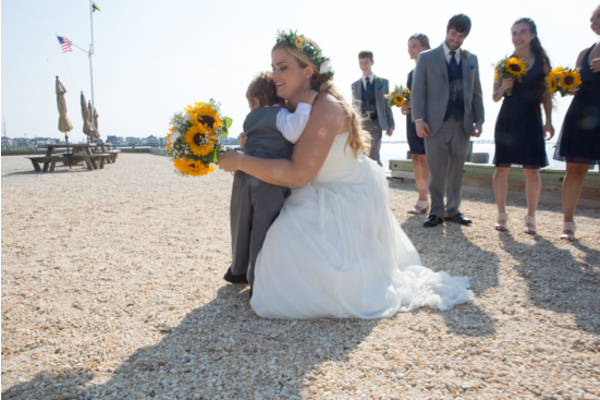 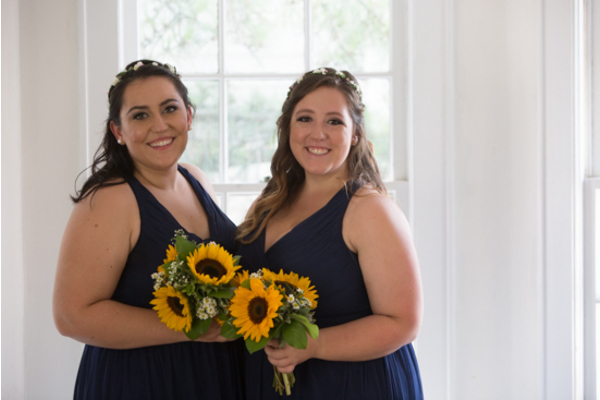 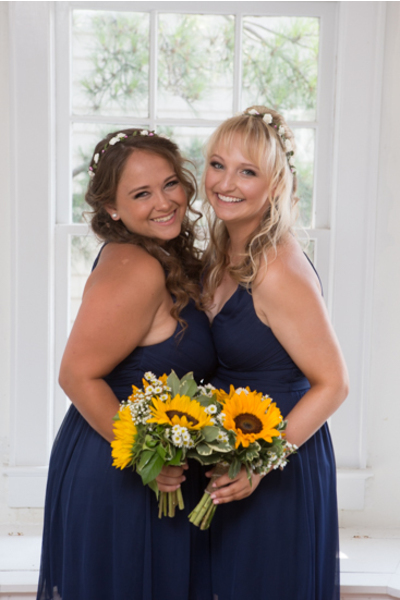 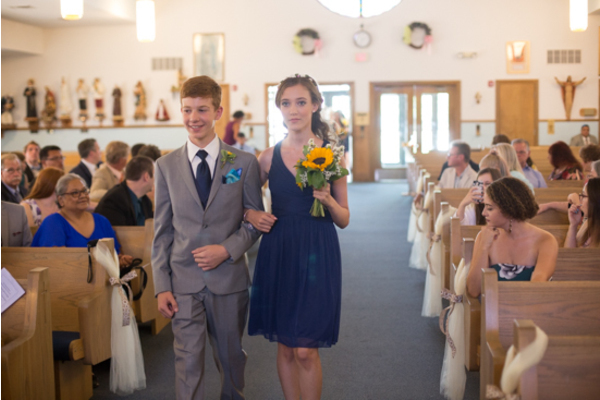 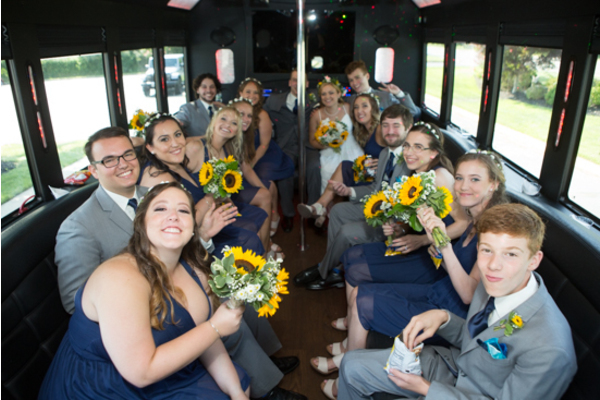 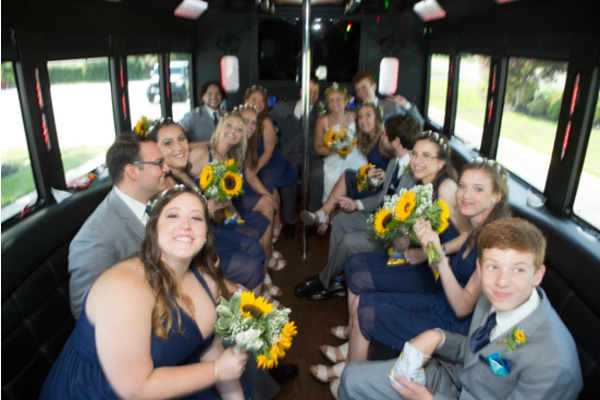 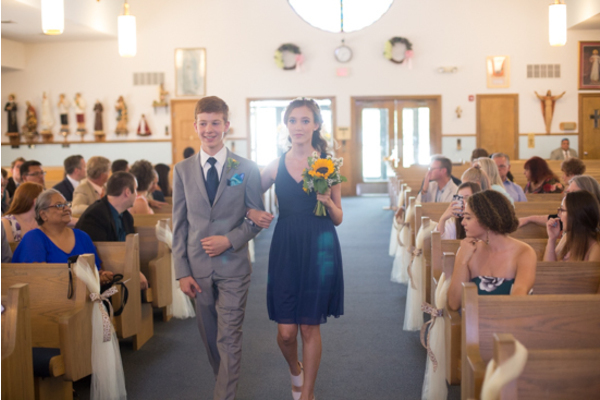 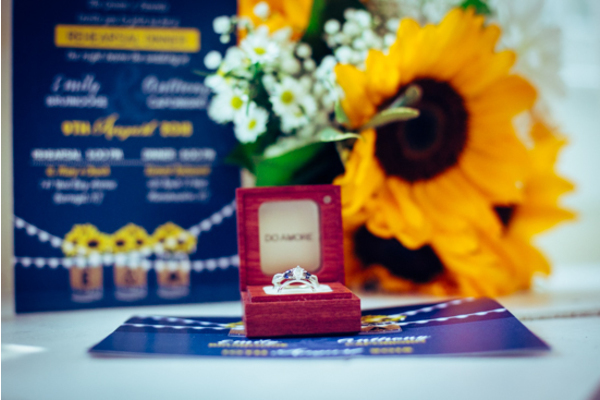 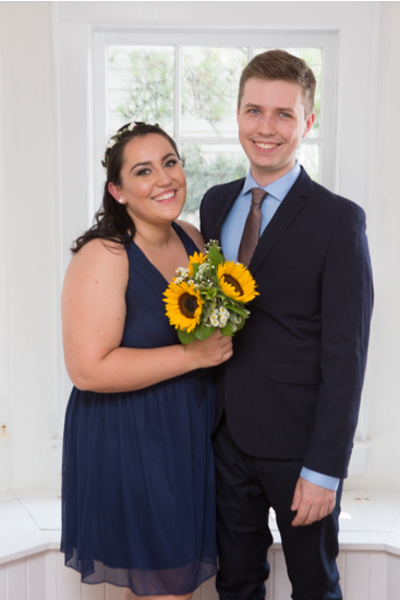 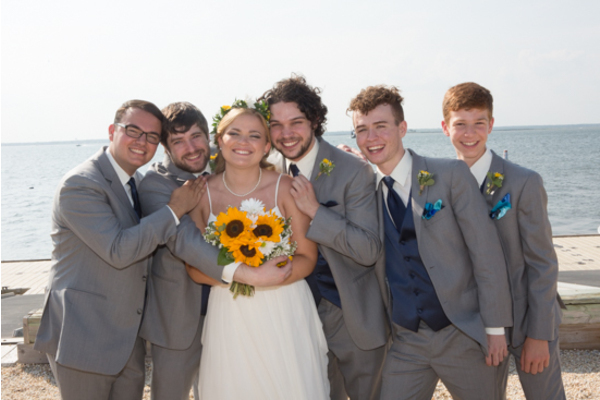 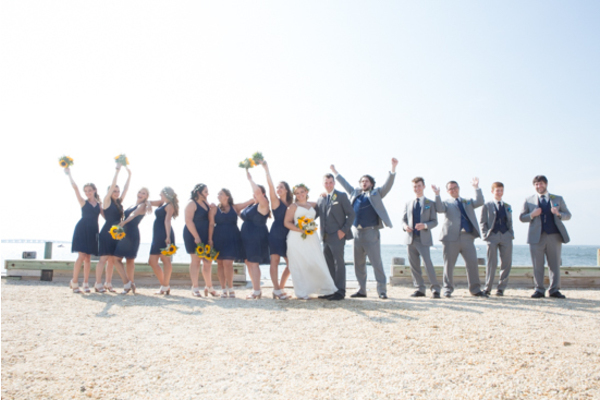 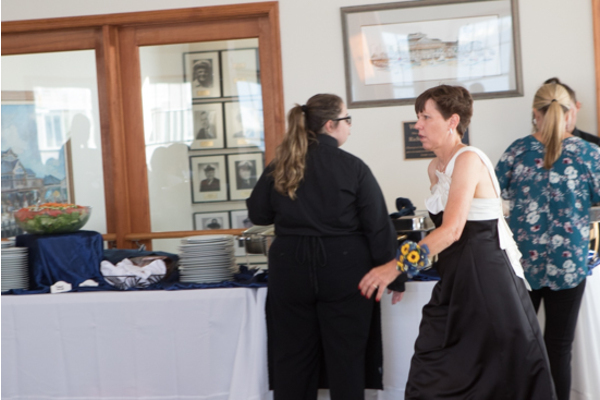 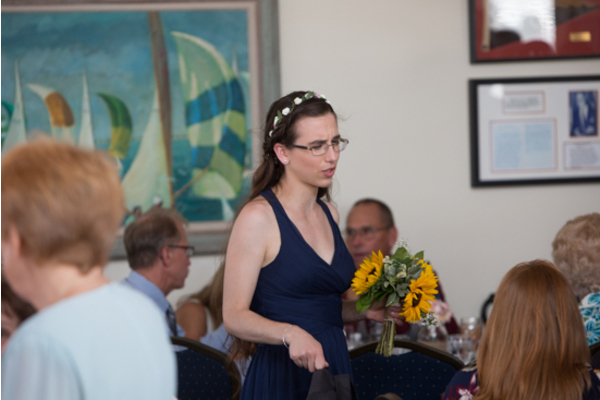 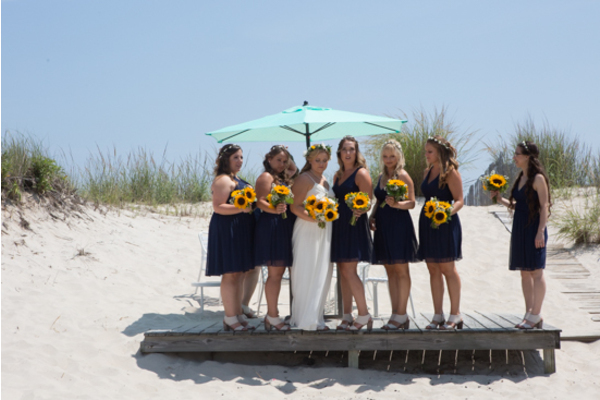 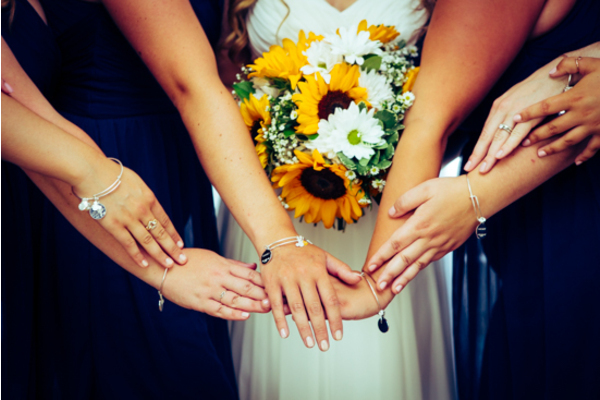 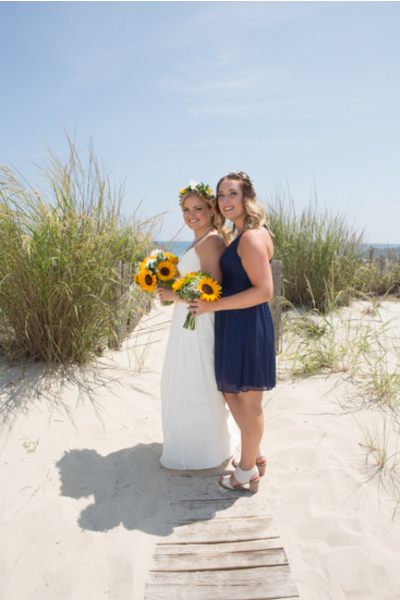 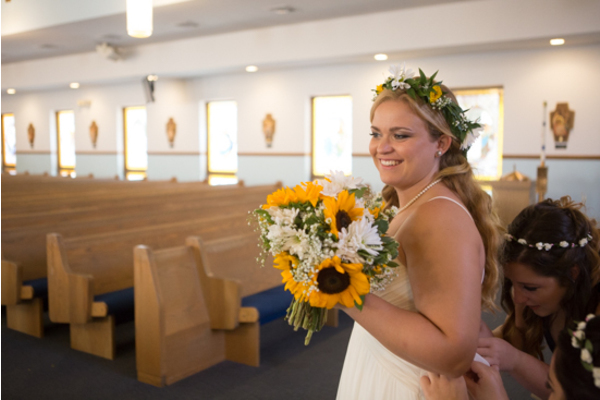 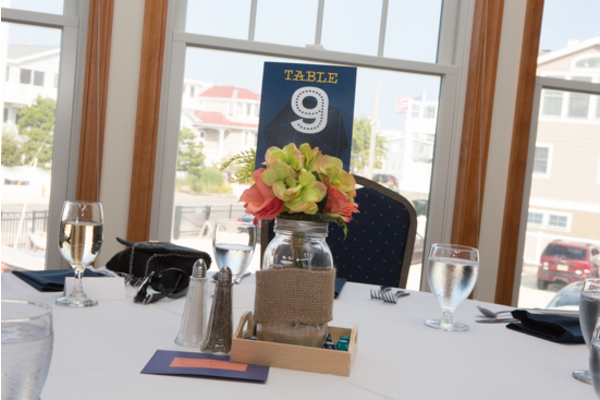 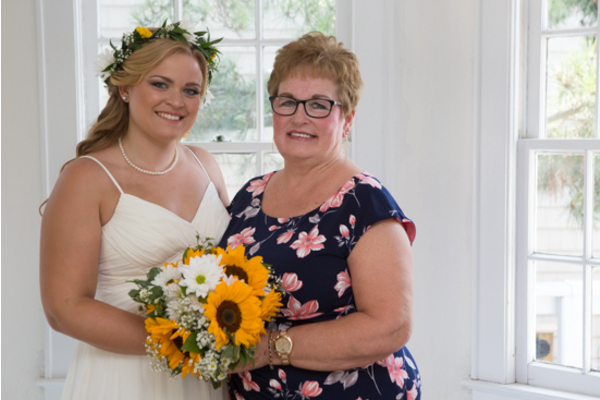 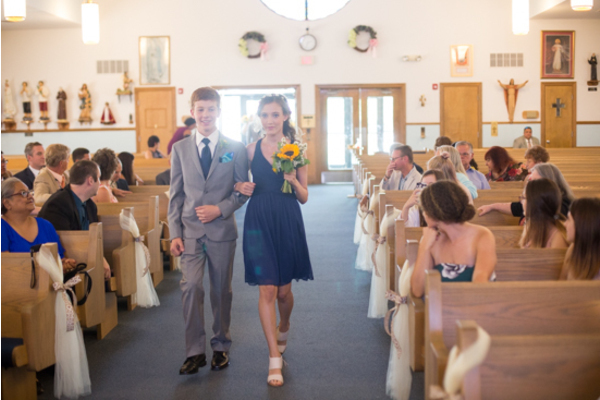 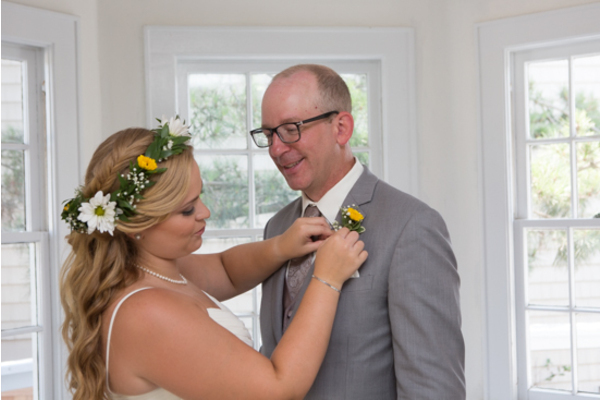 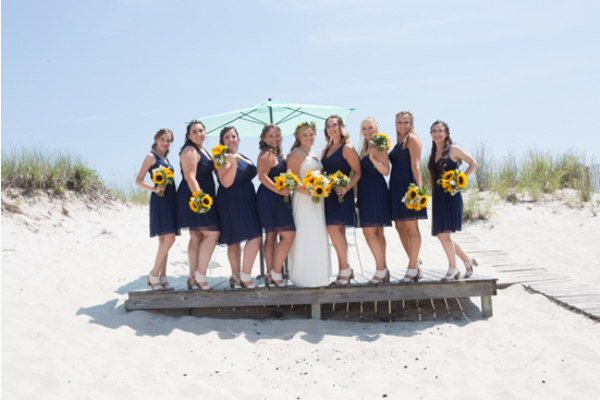 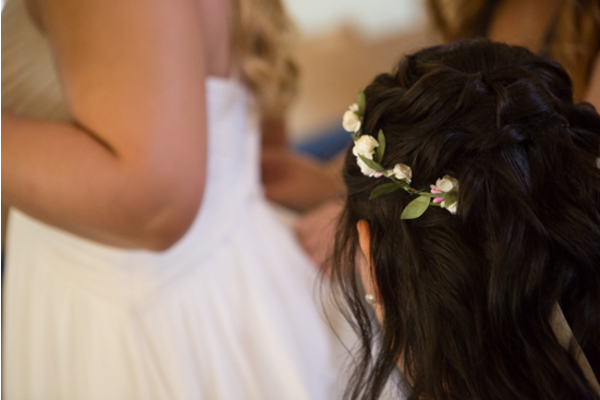 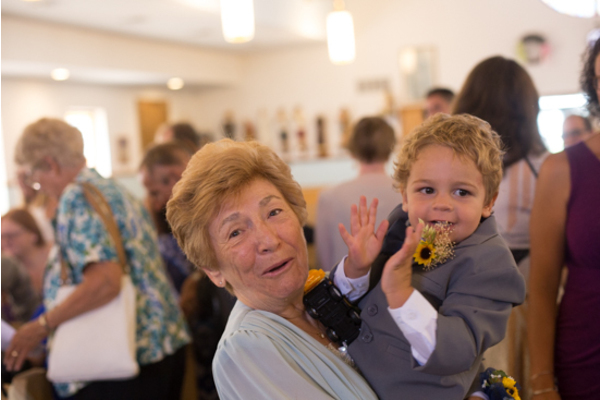 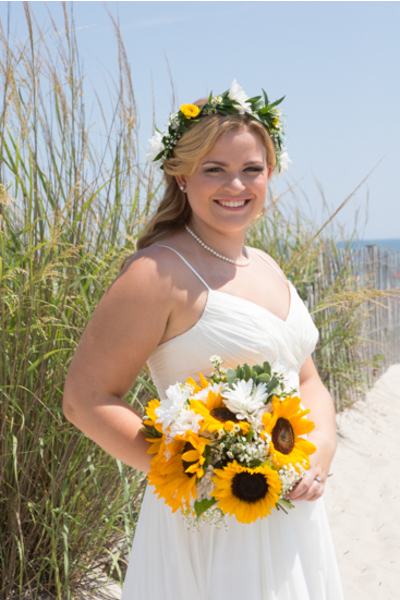 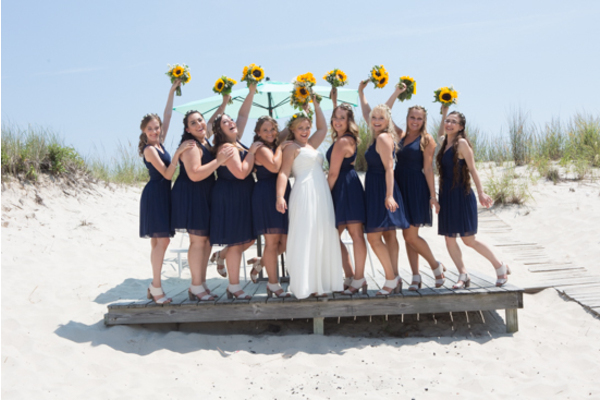 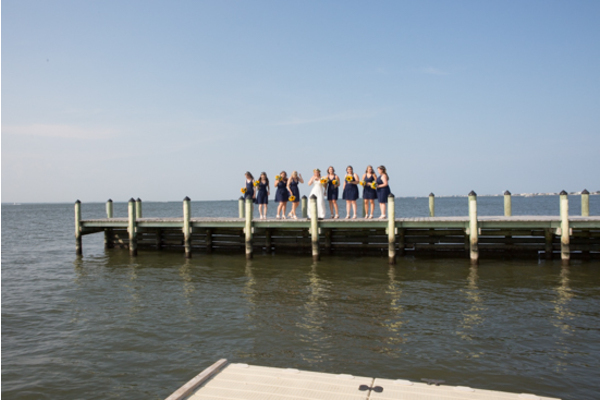 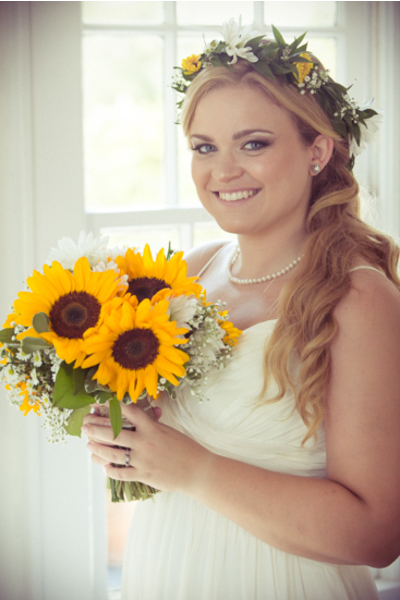 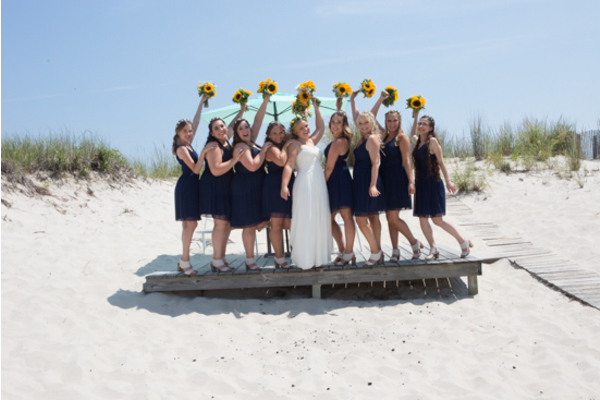 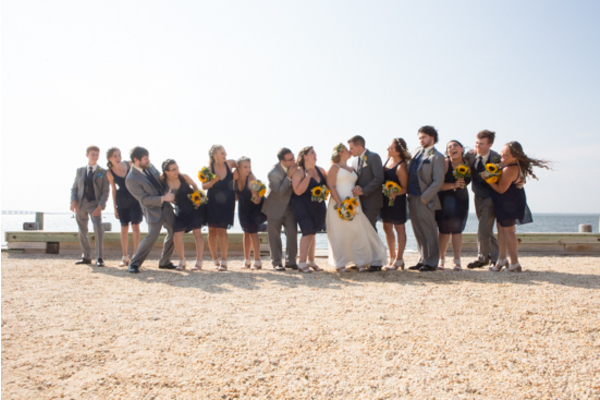 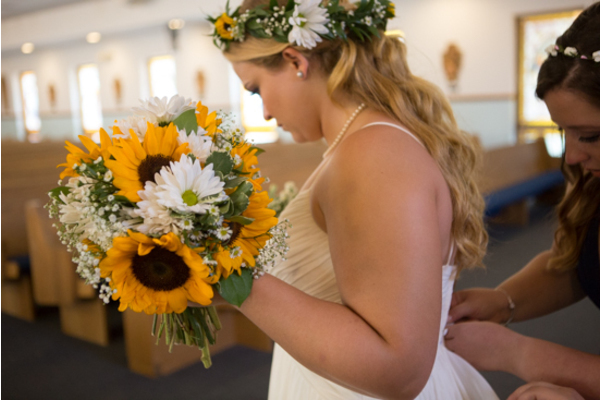 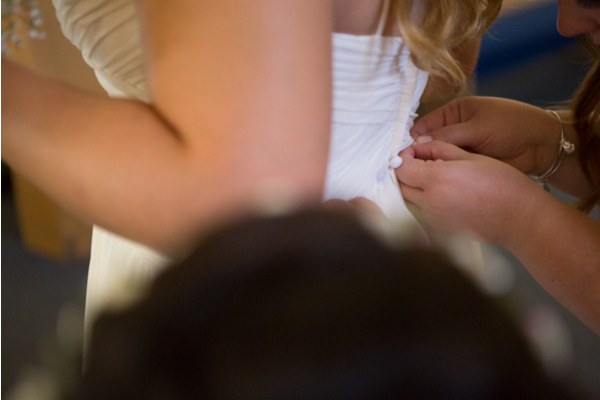 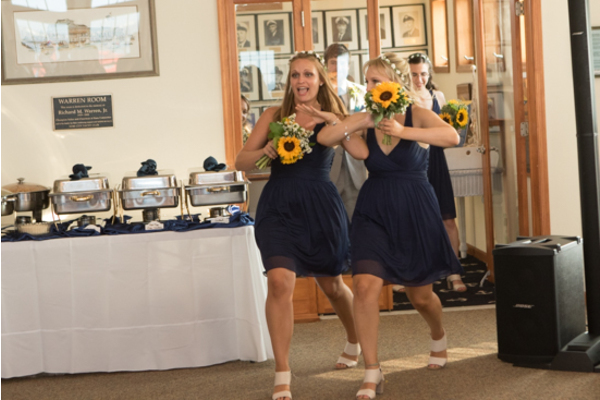 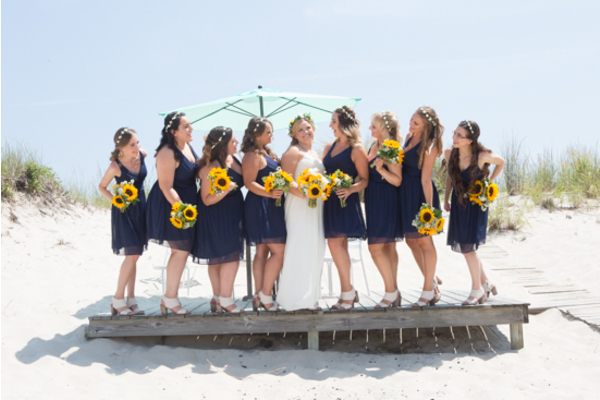 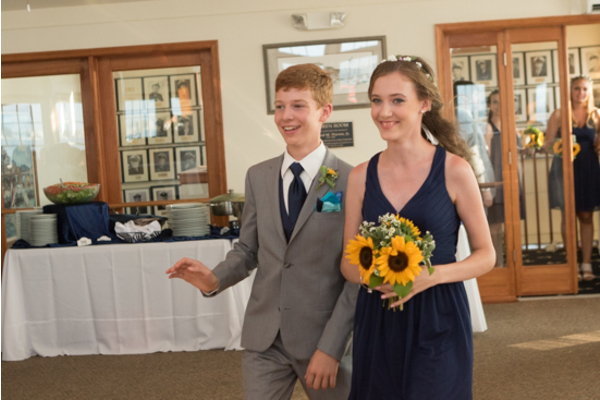 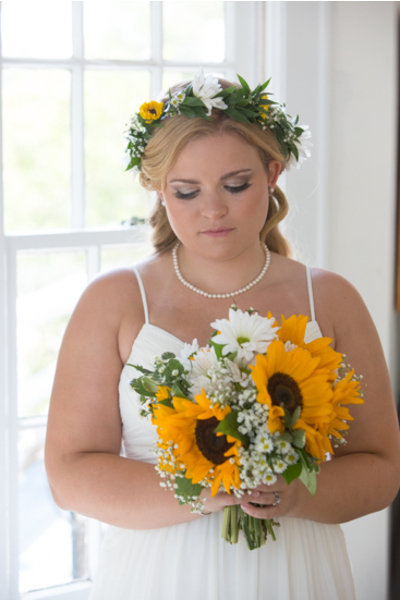 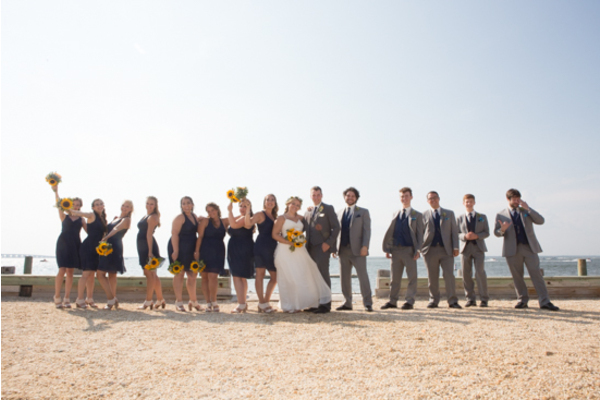 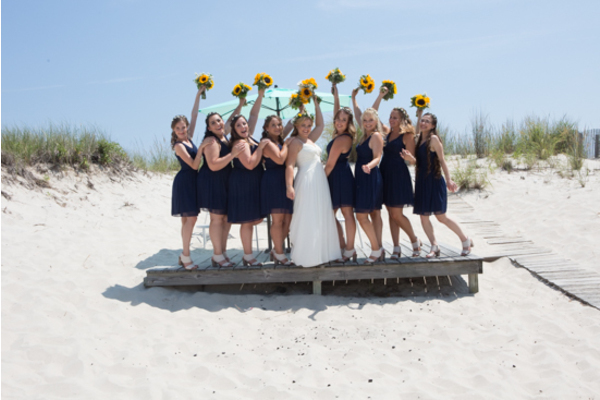 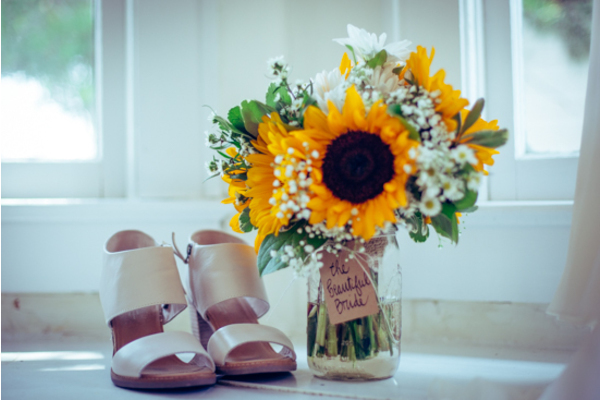 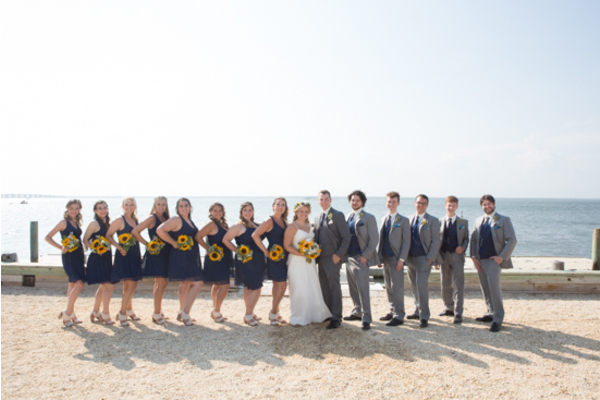 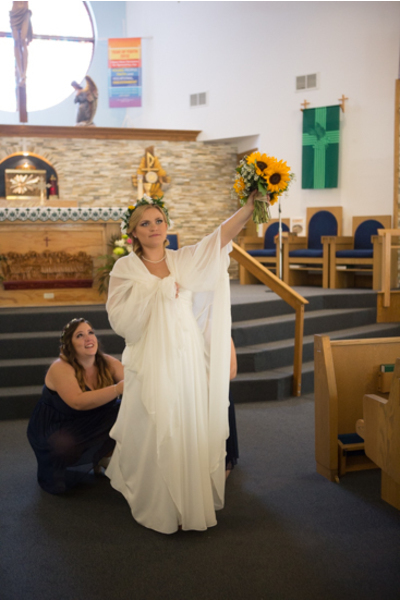 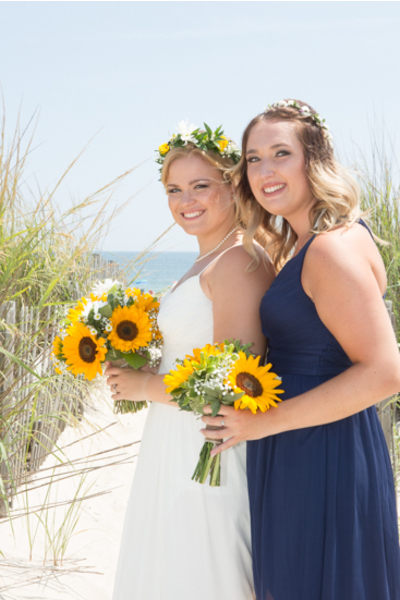 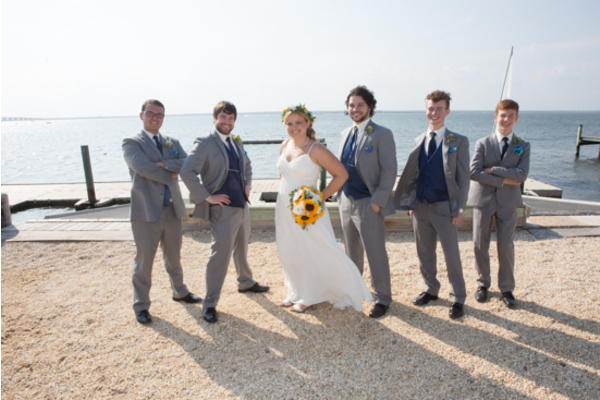 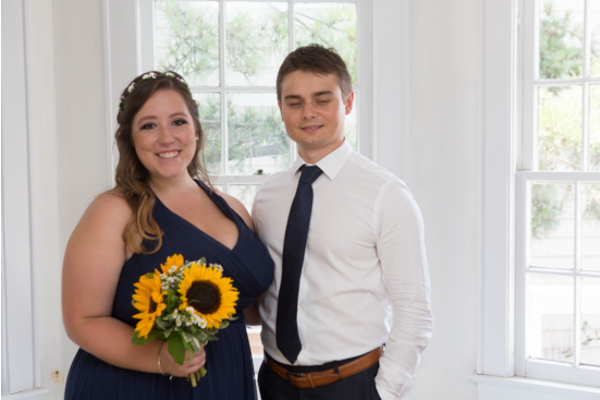 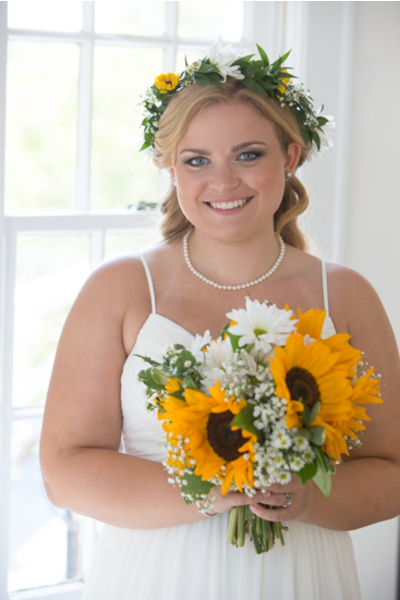 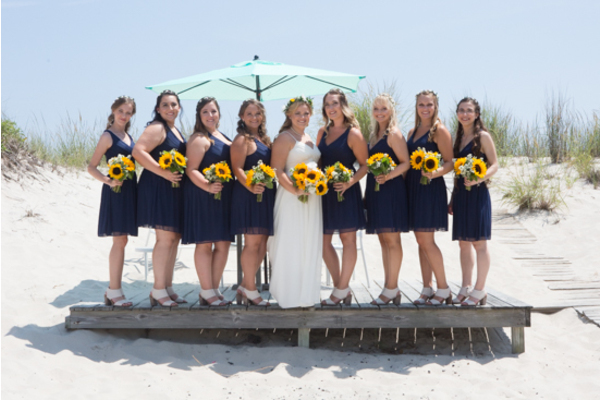 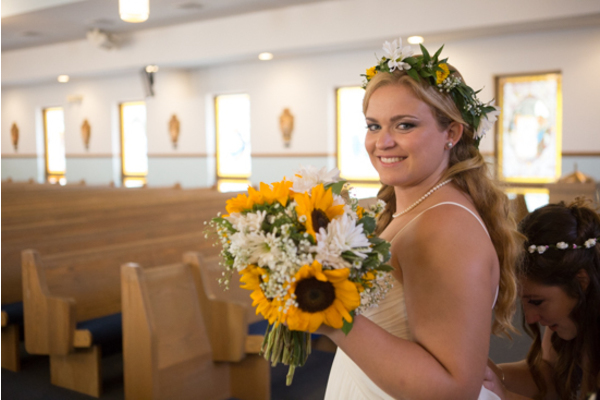 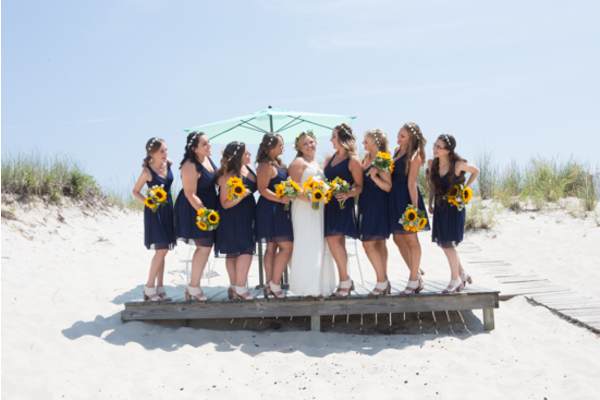 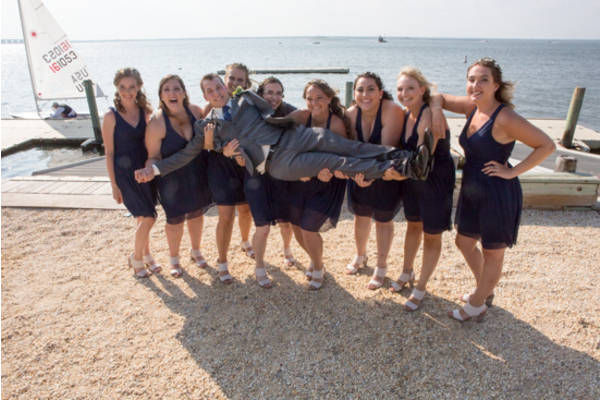 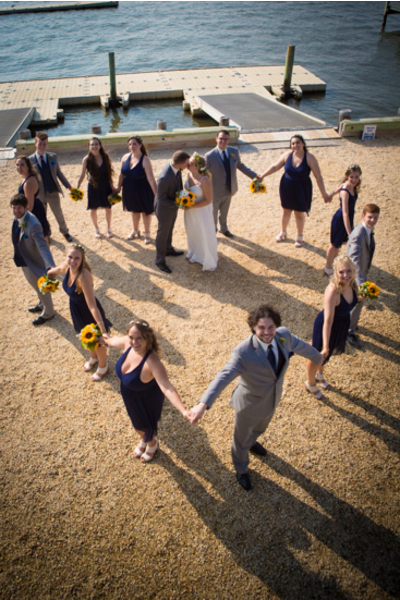 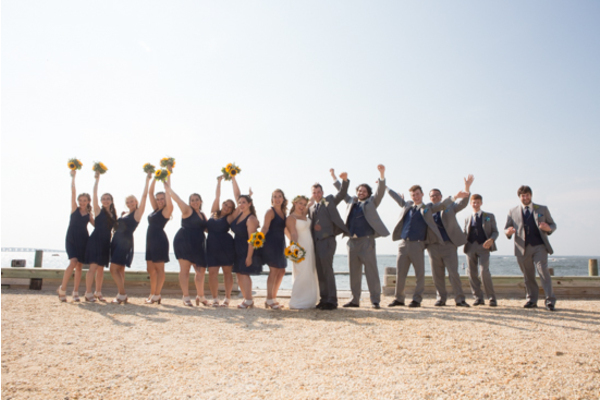 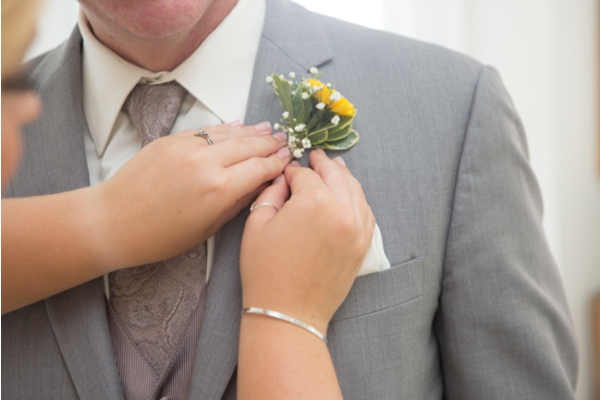 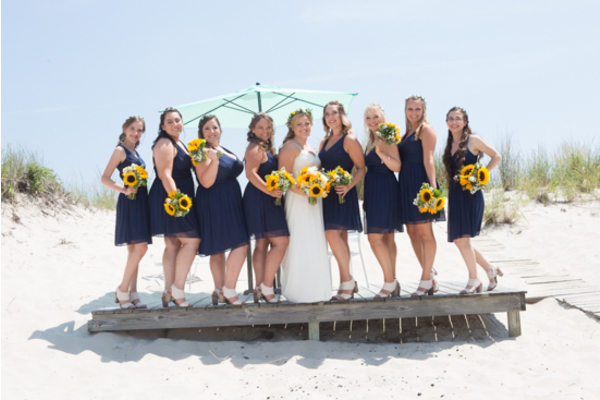 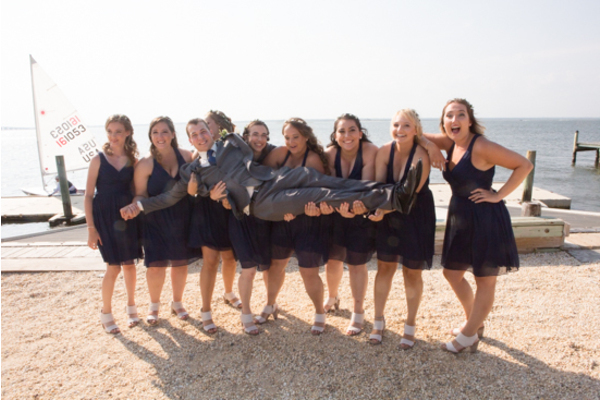 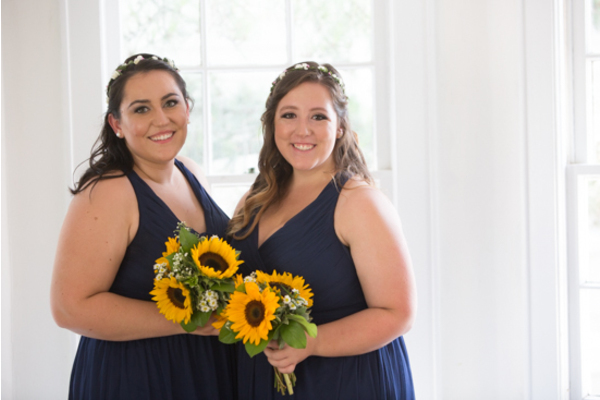 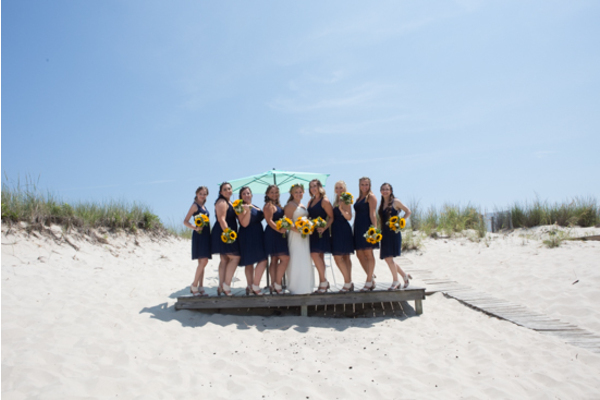 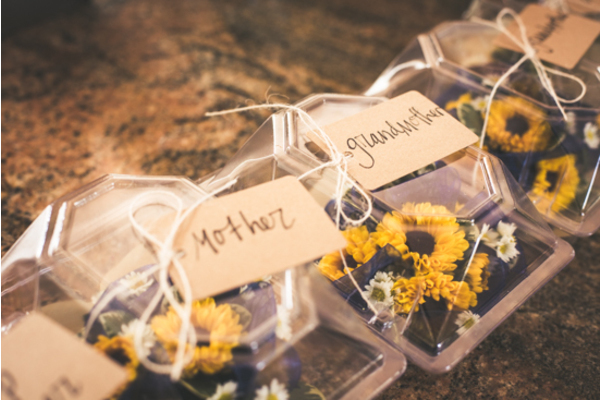 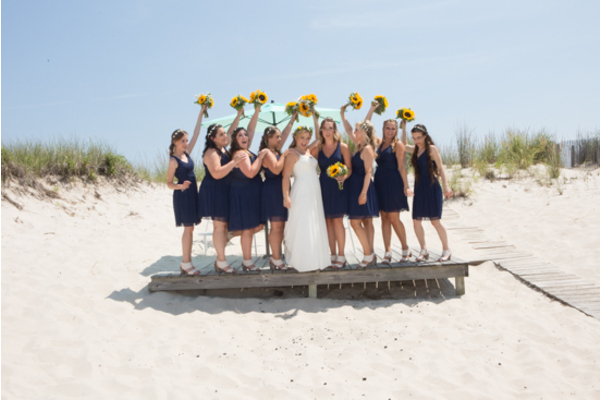 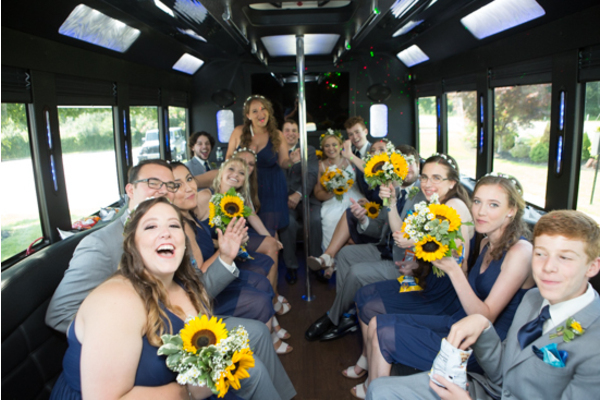 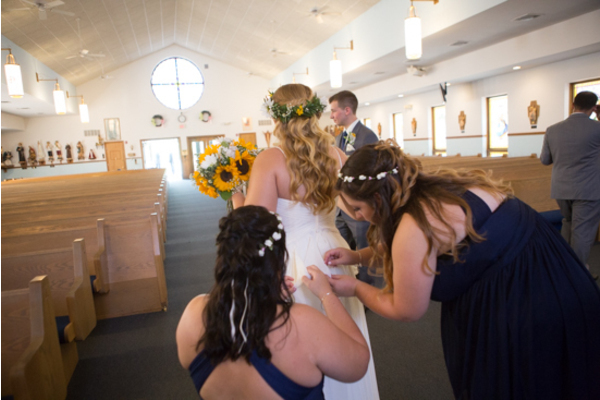 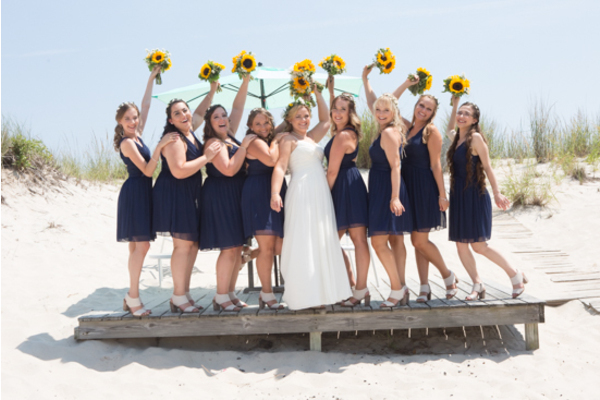 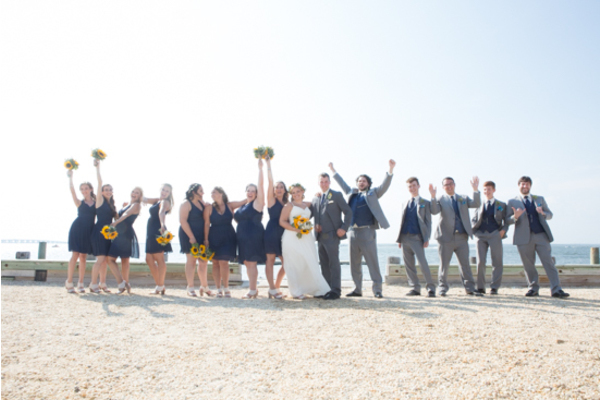 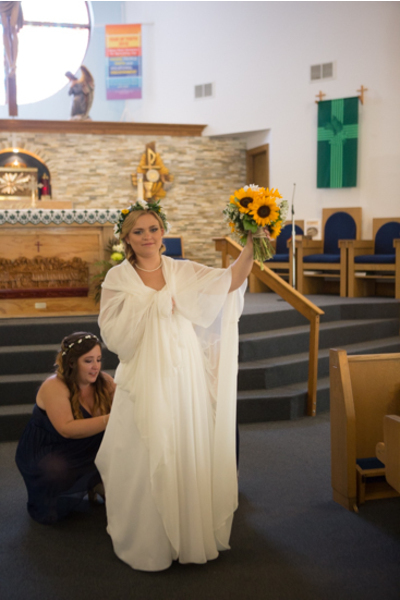 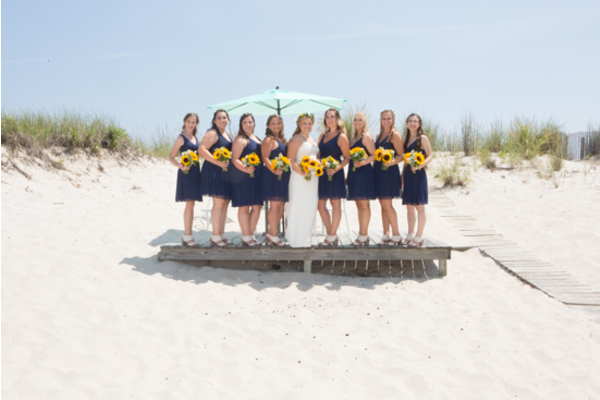 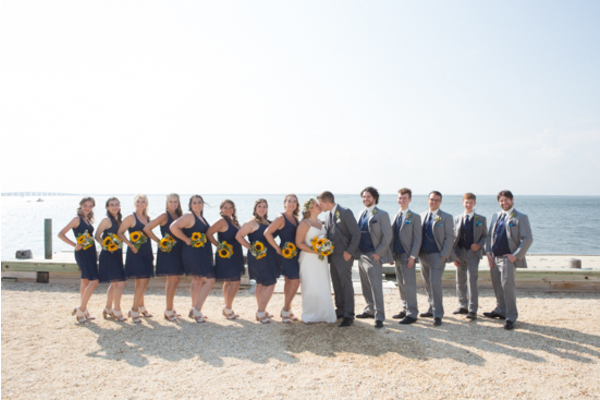 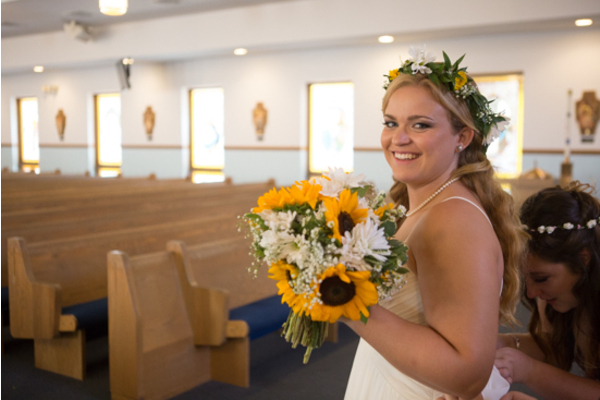 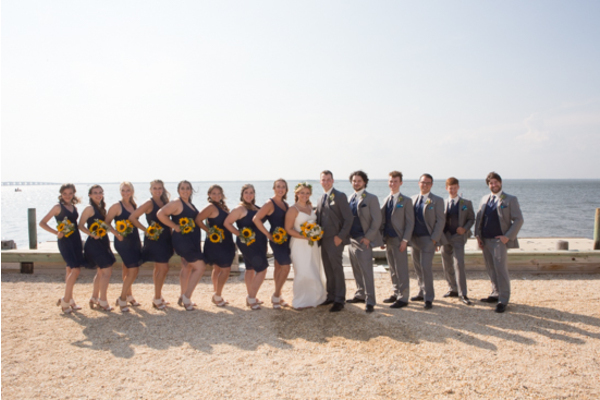 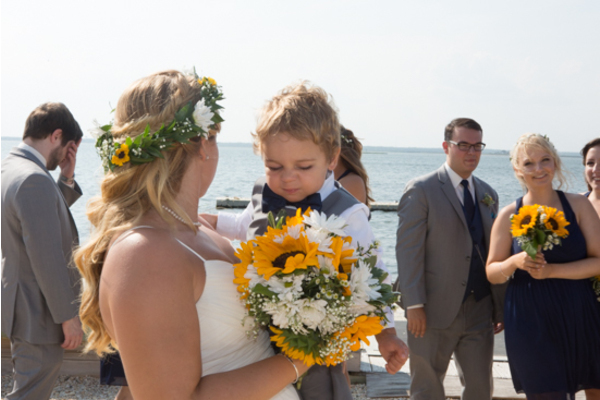 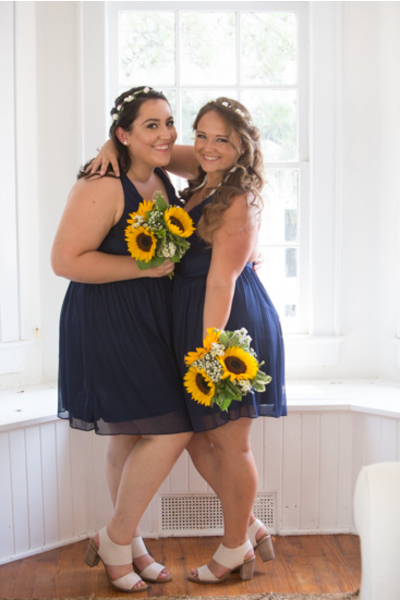 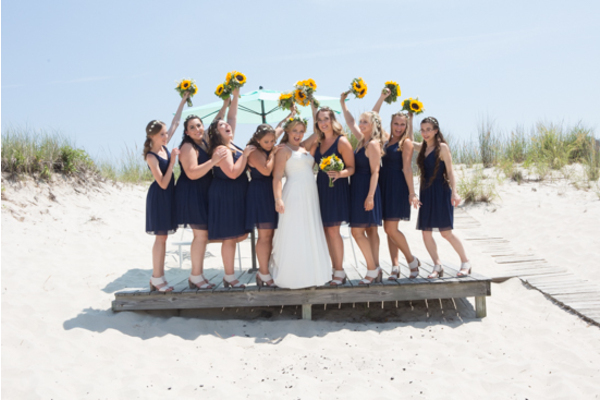 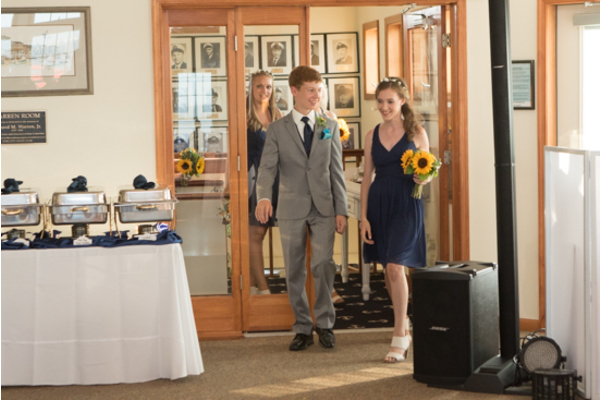 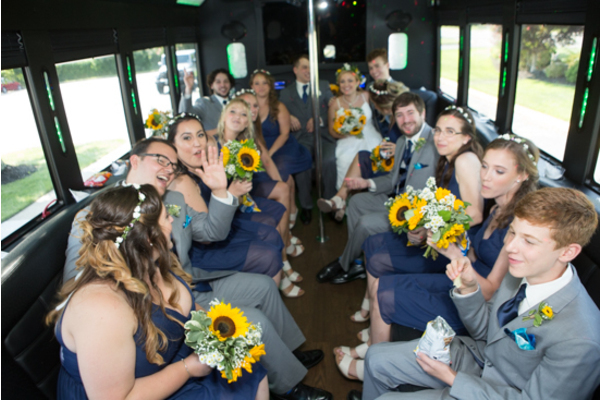 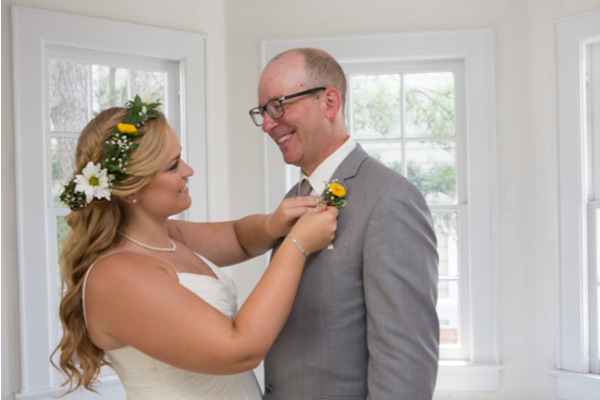 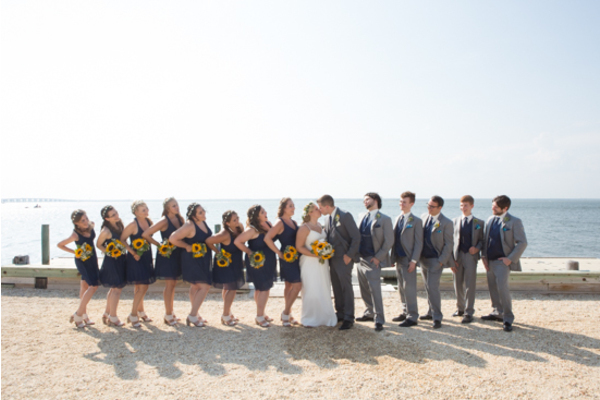 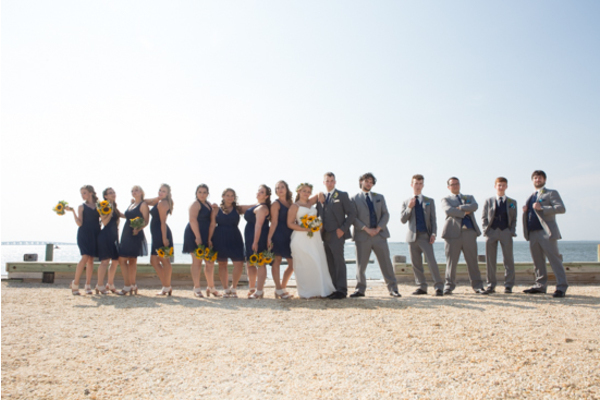 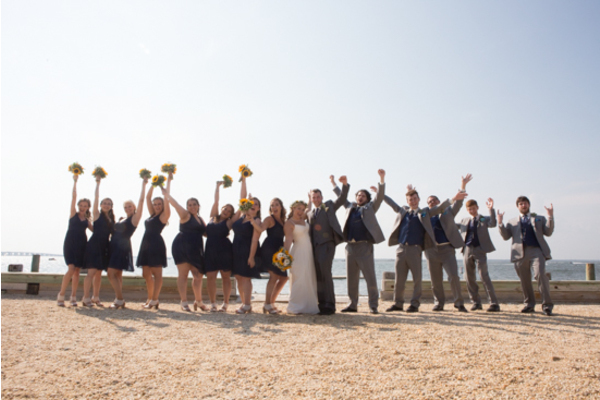 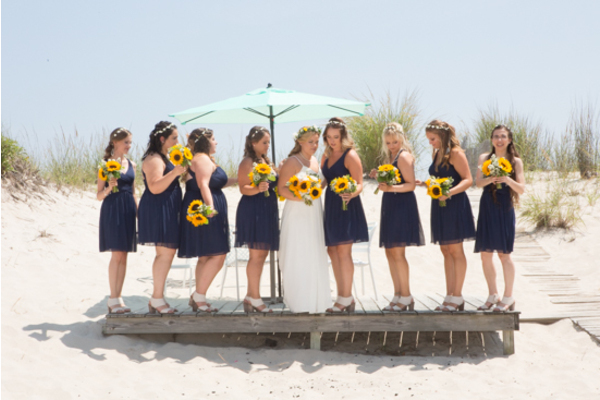 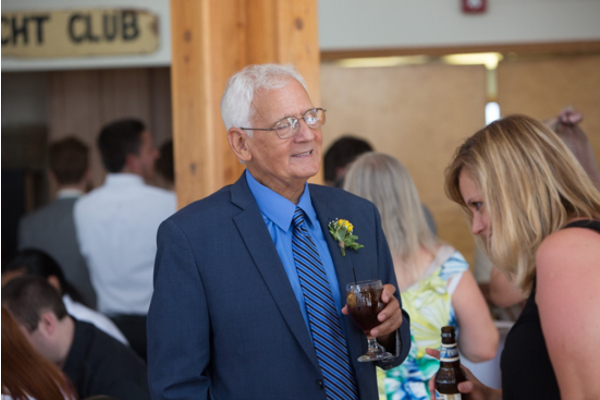 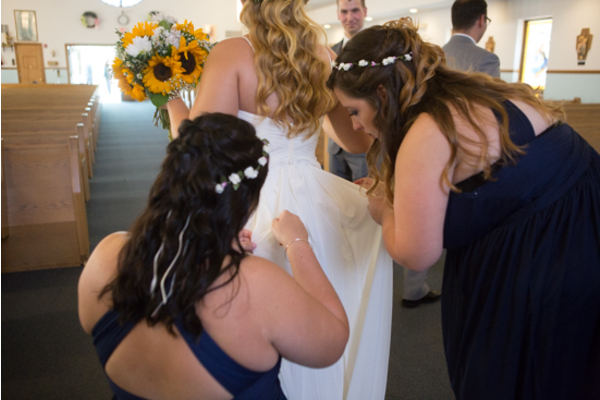 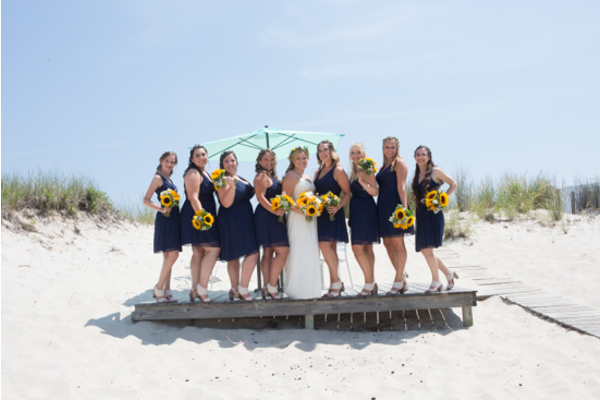 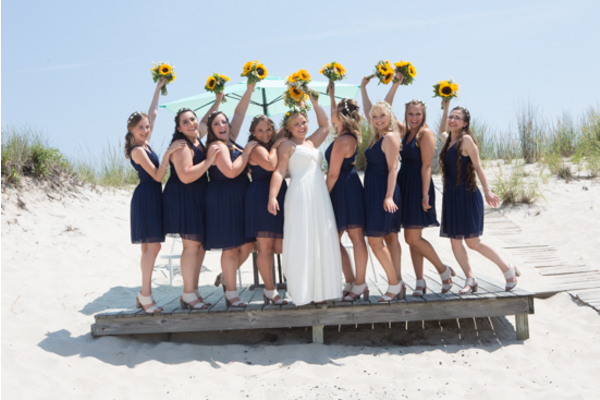 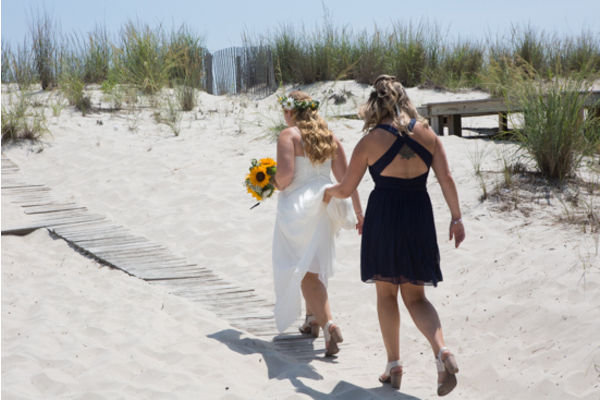 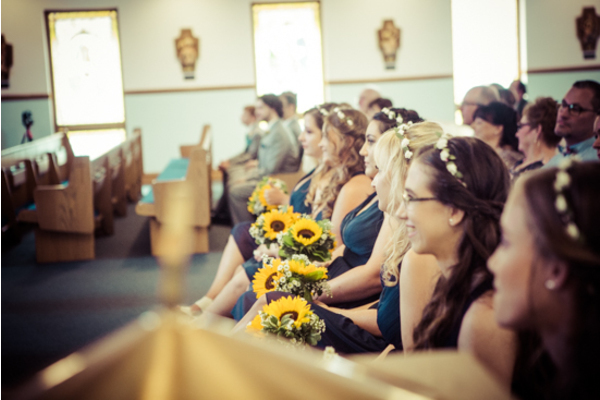 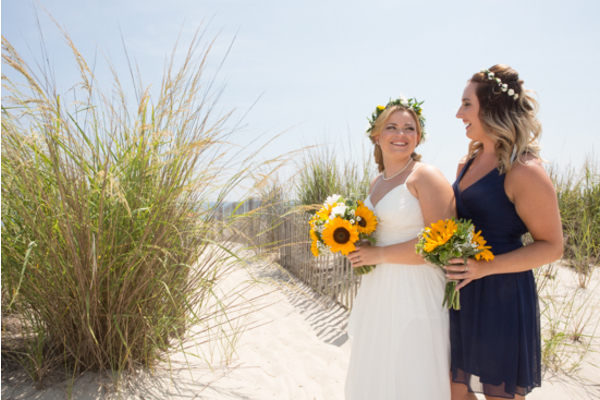 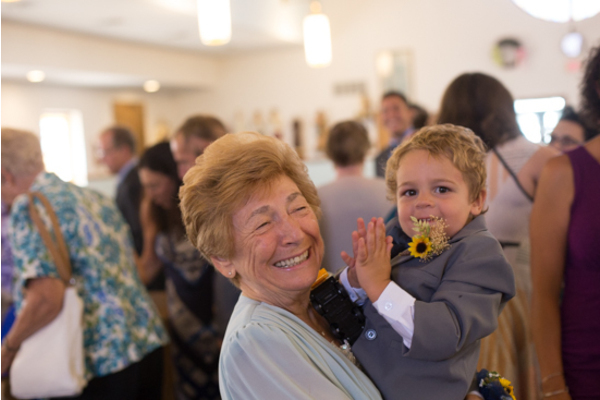 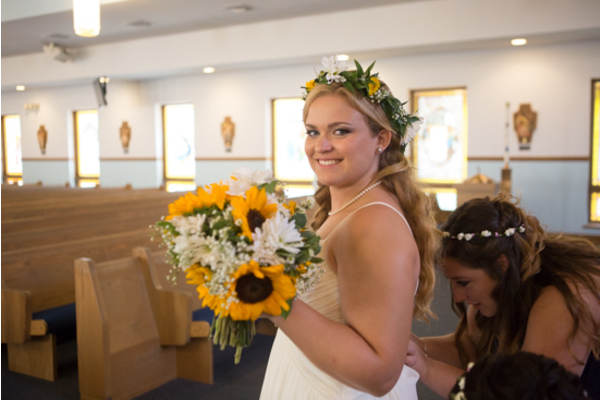 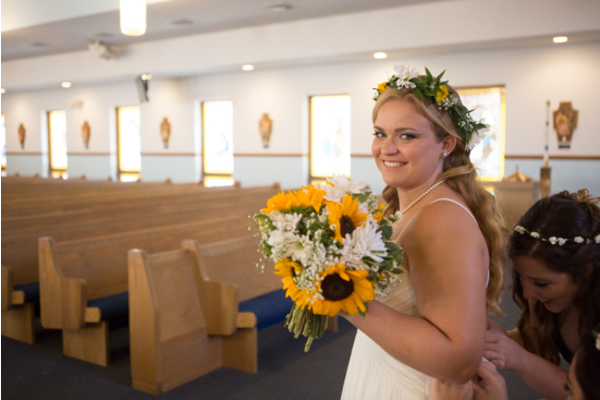 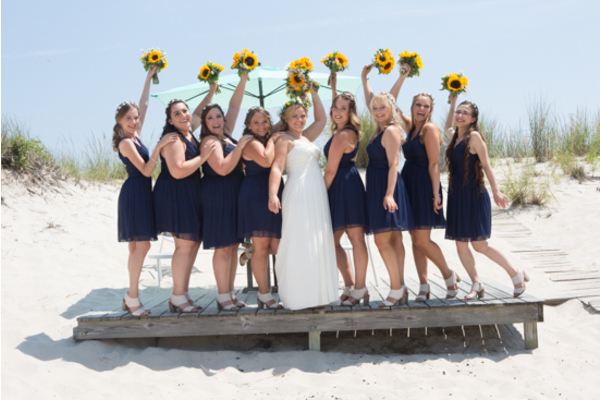 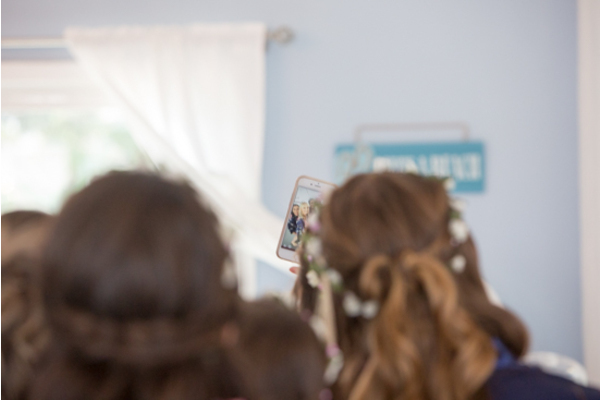 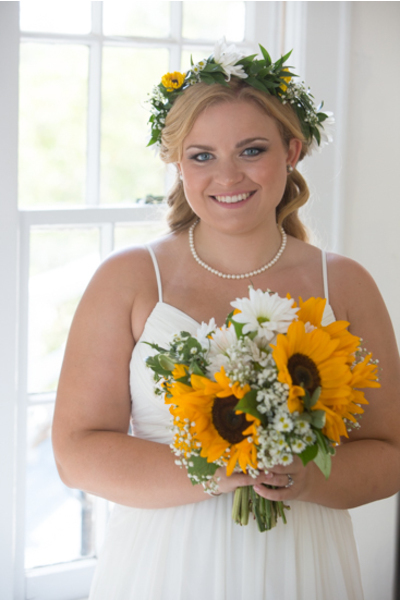 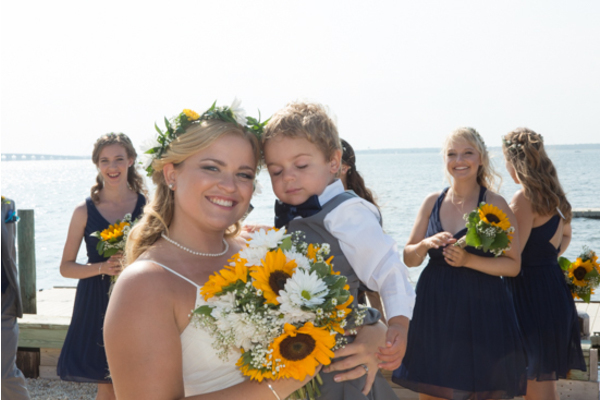 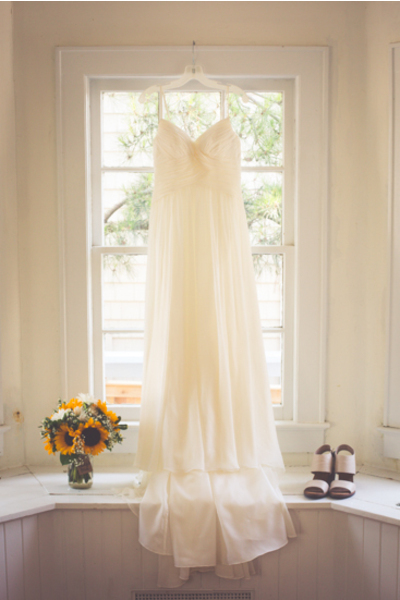 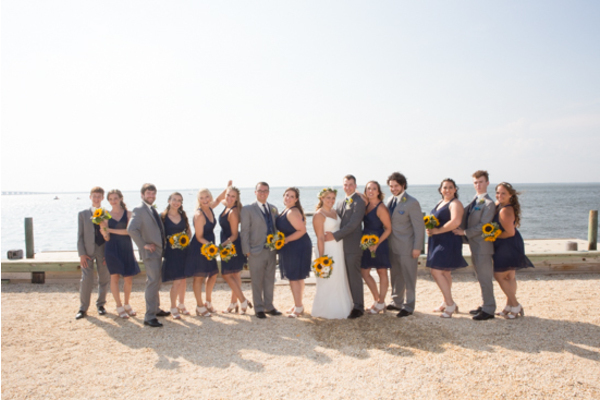 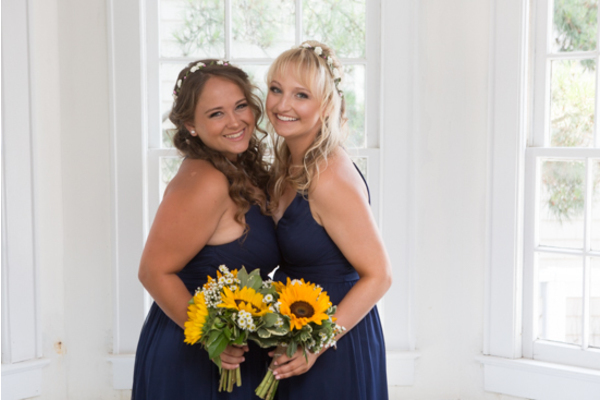 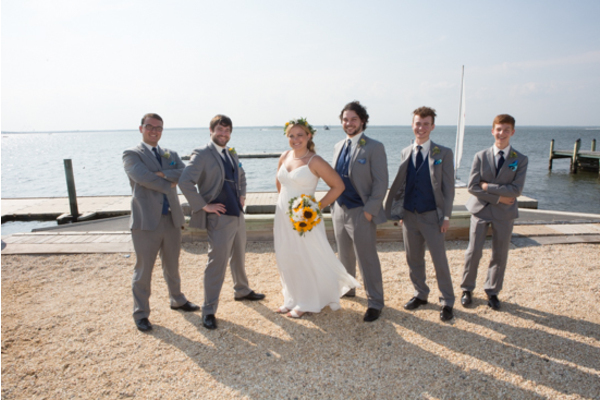 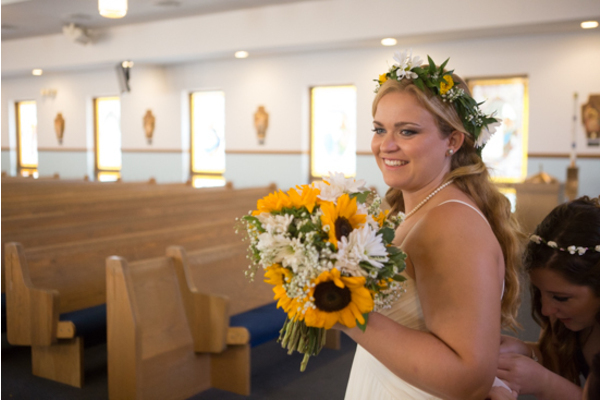 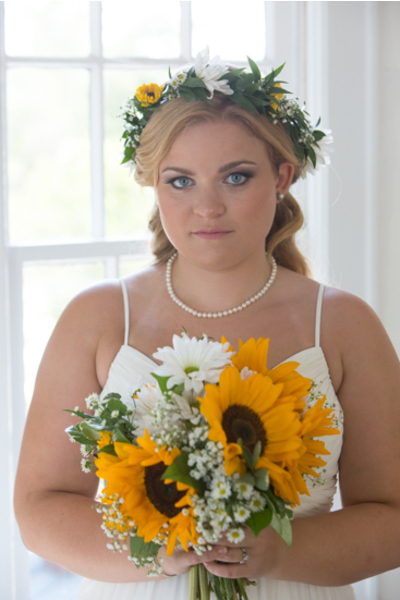 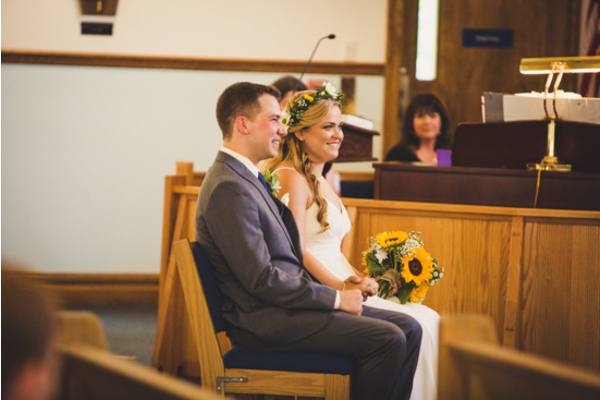 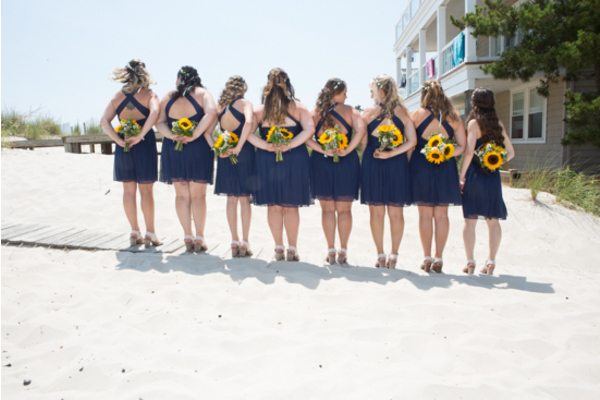 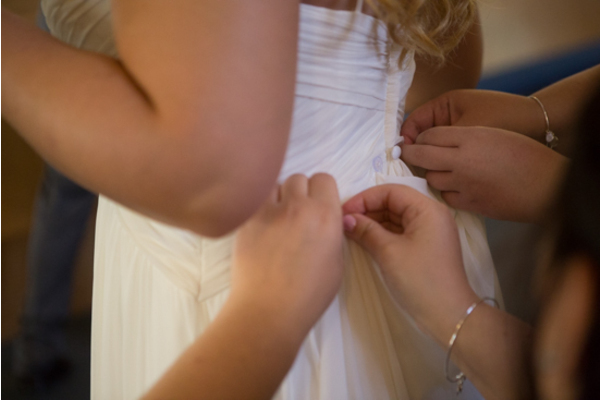 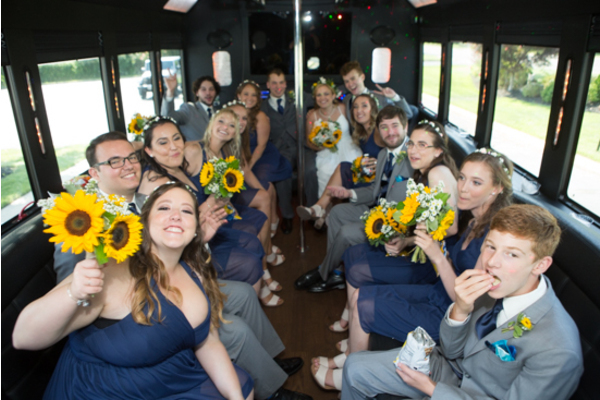 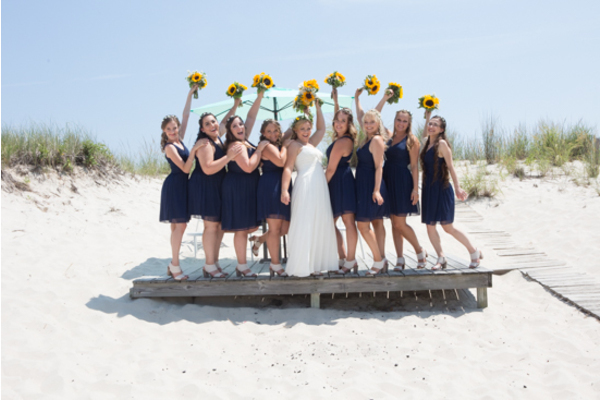 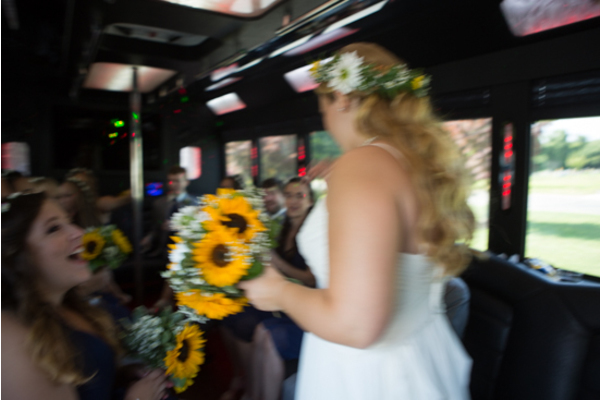 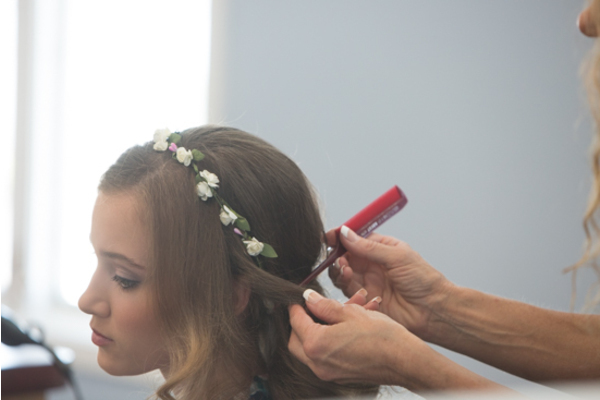 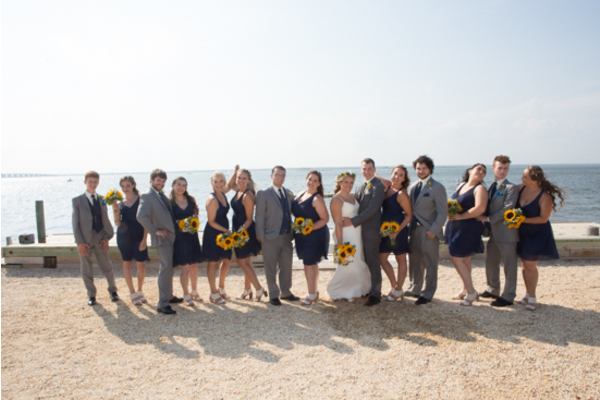 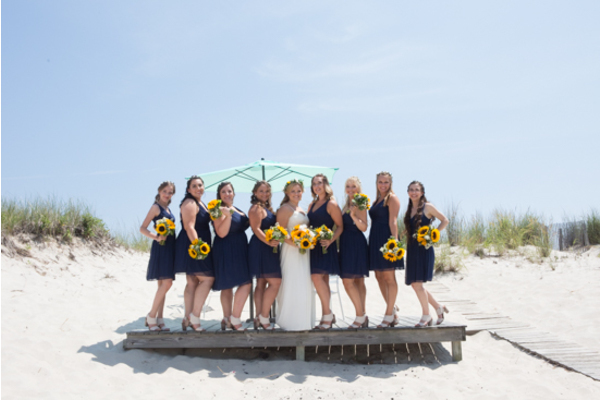 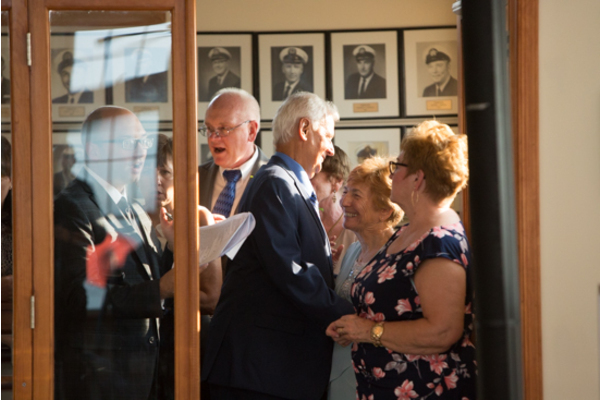 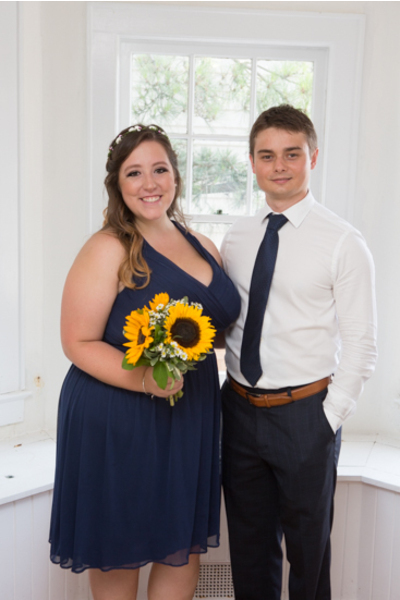 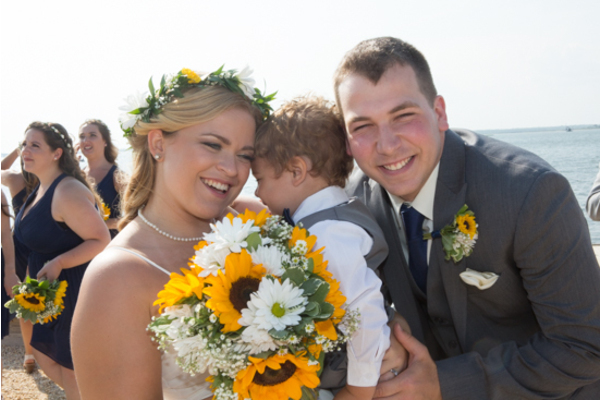 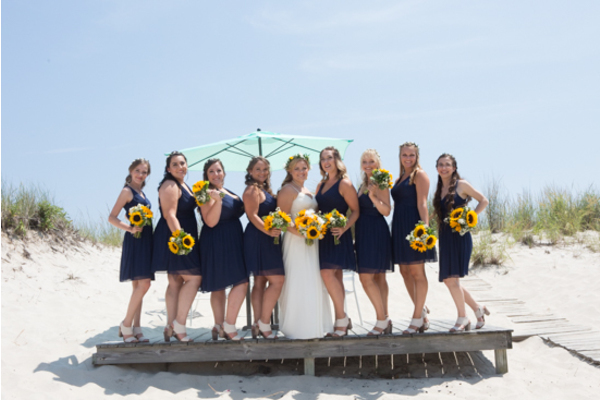 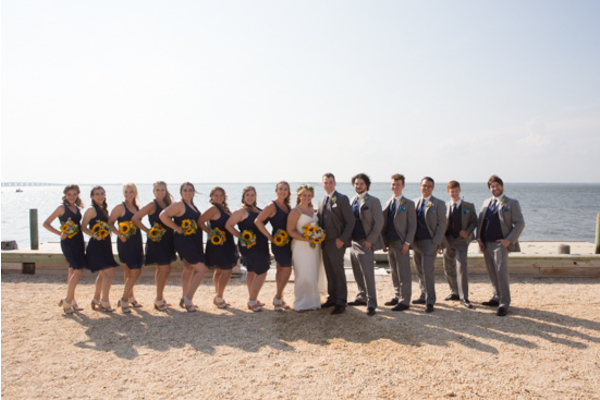 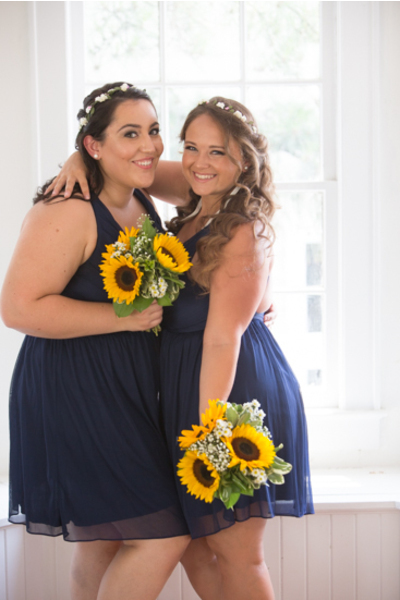 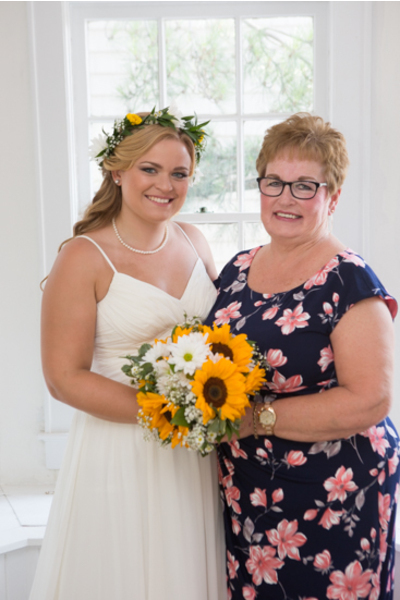 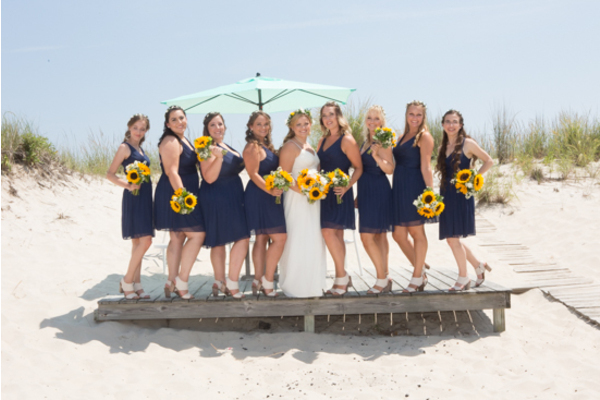 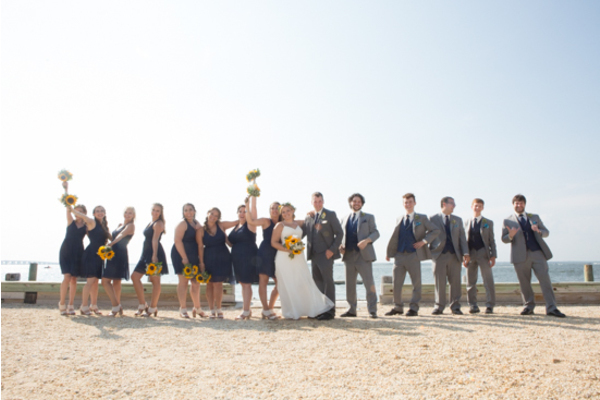 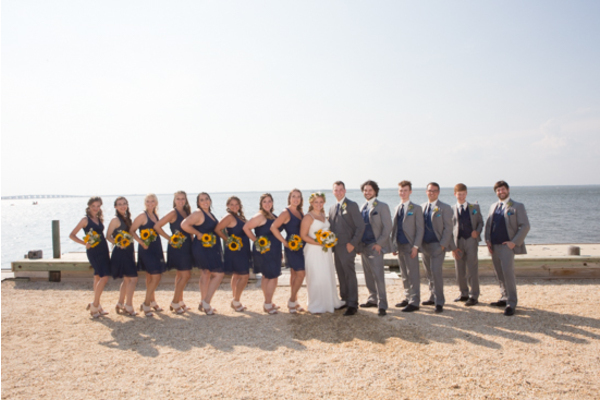 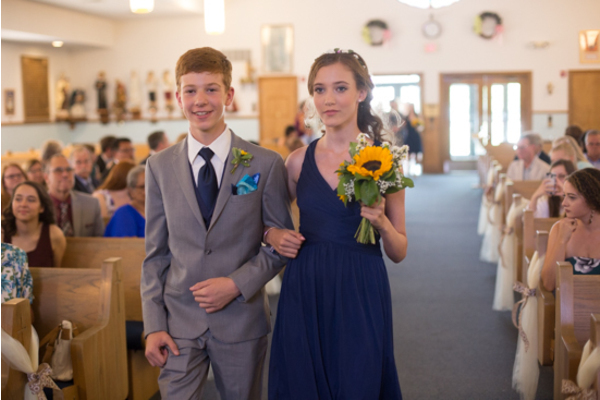 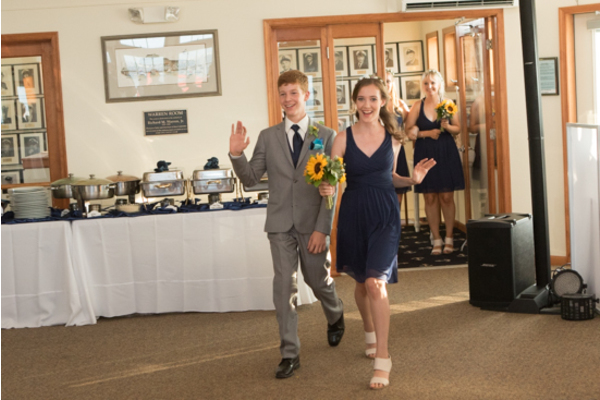 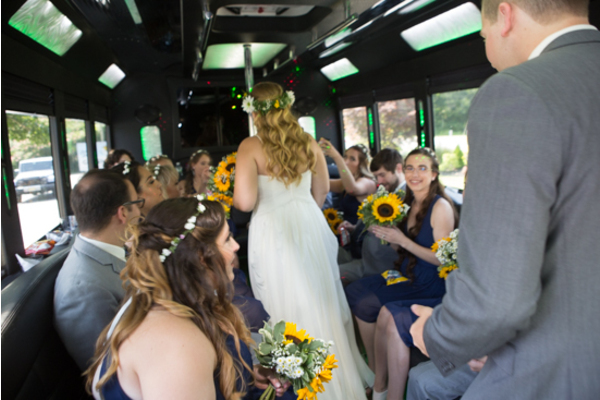 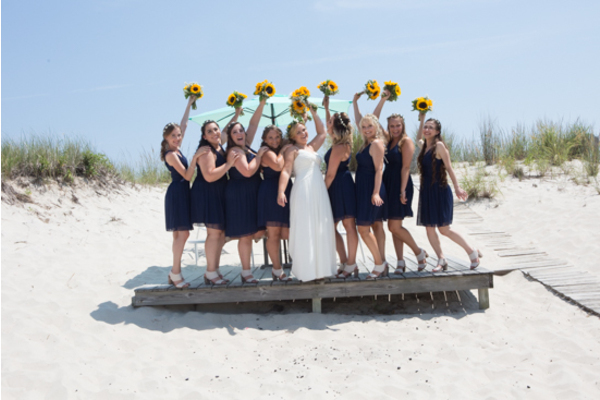 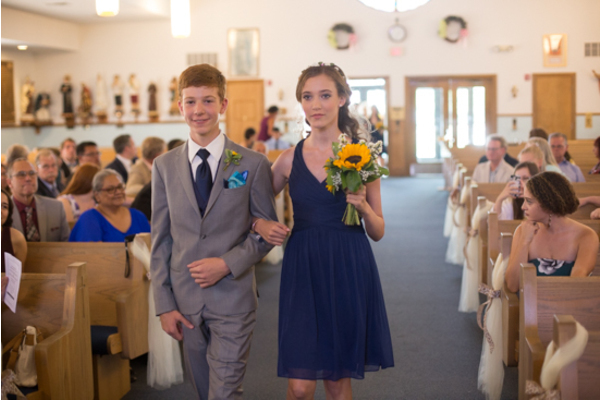 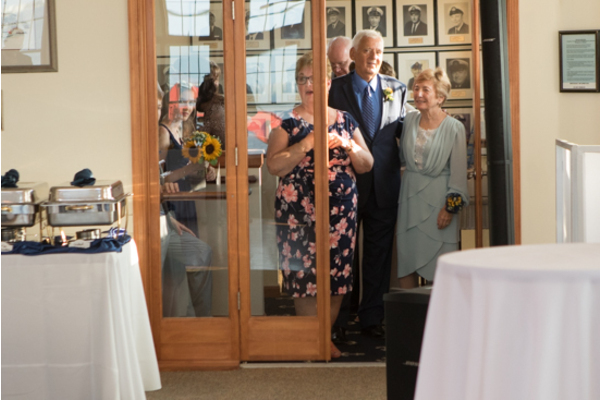 Her bridesmaids wore beautiful navy dress, and breathtaking sunflowers filled Emily’s bouquet. 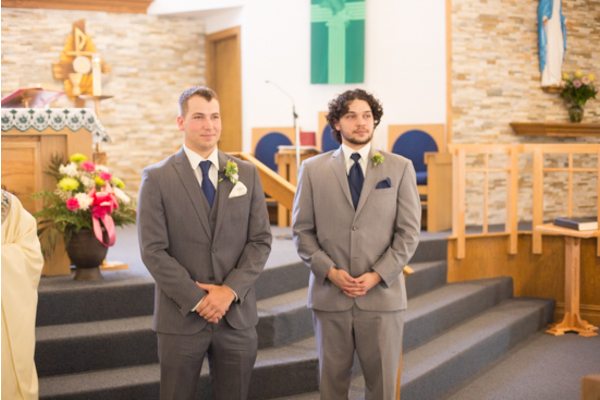 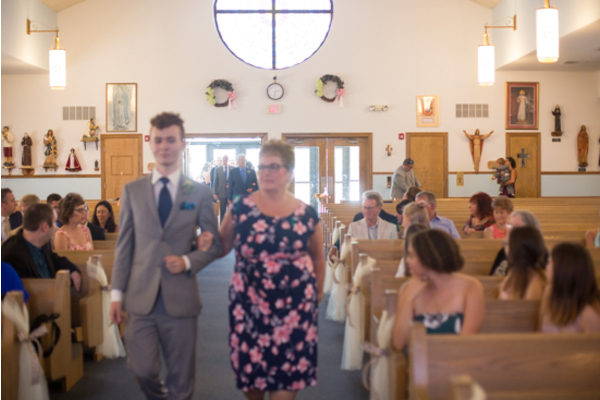 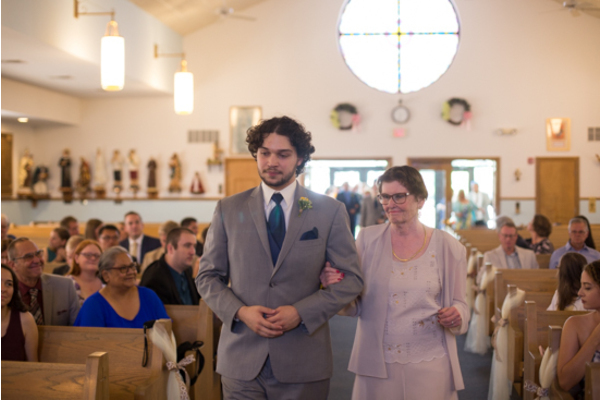 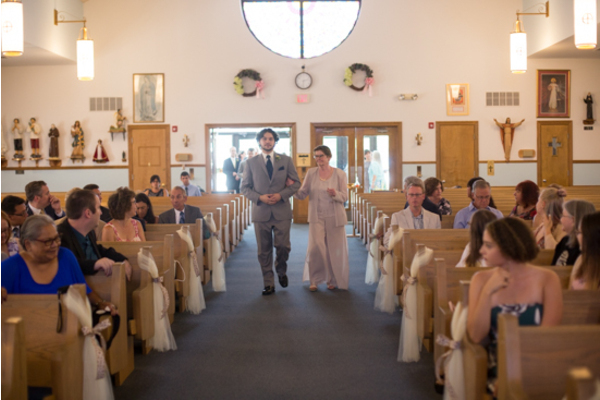 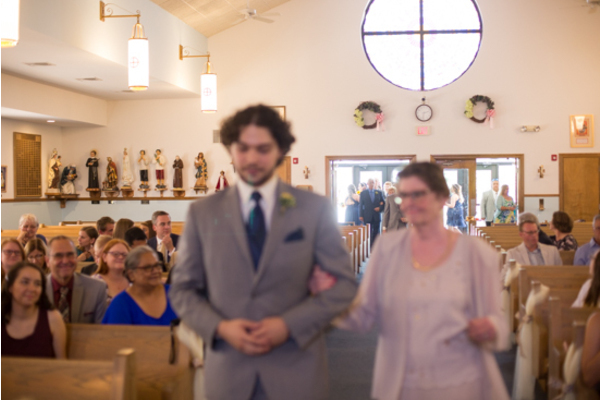 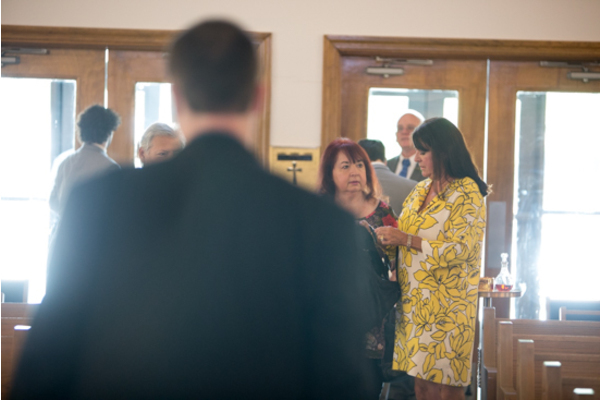 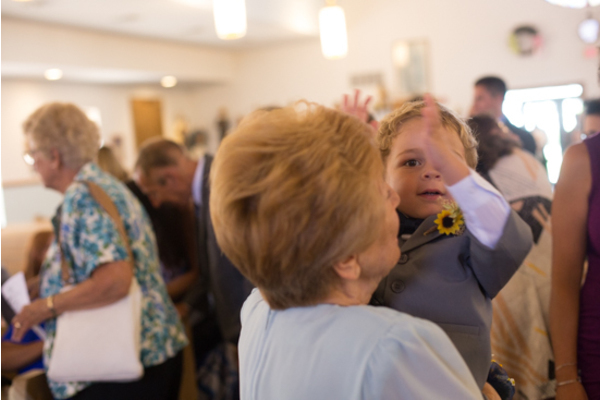 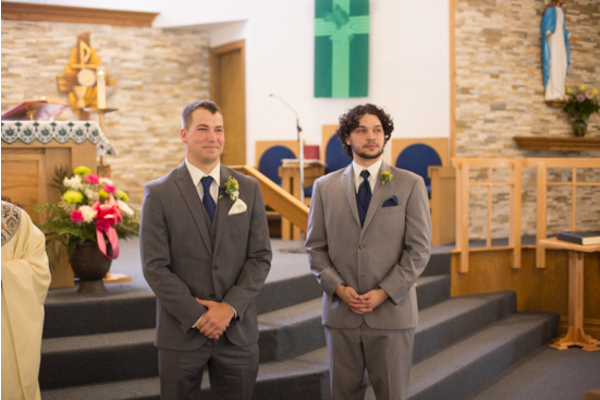 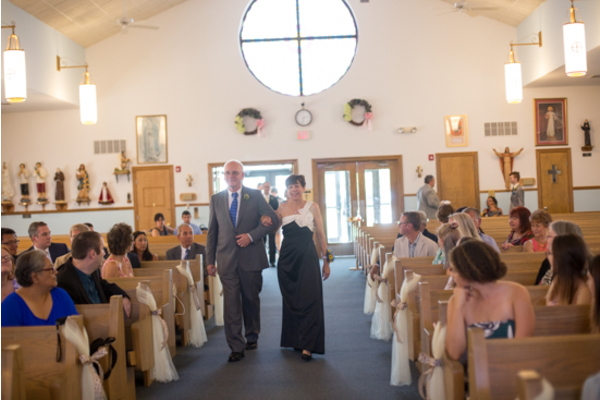 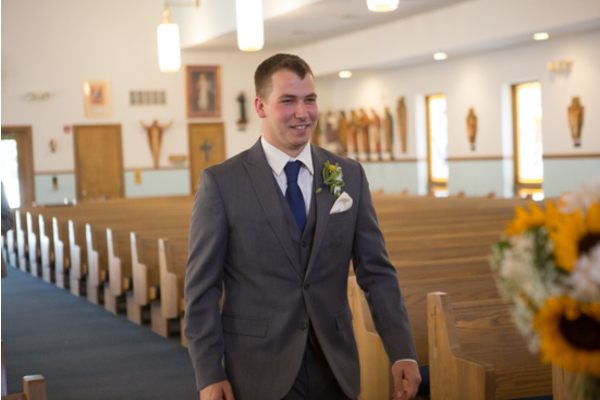 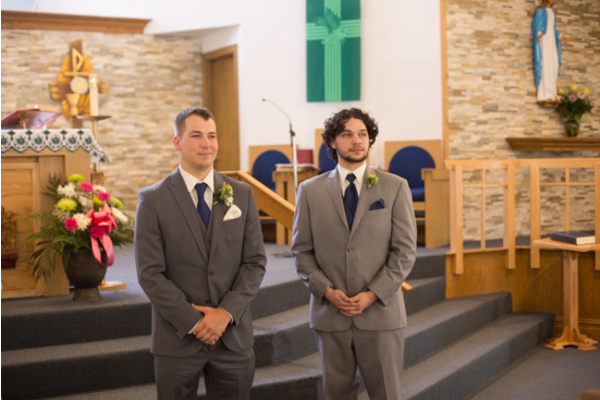 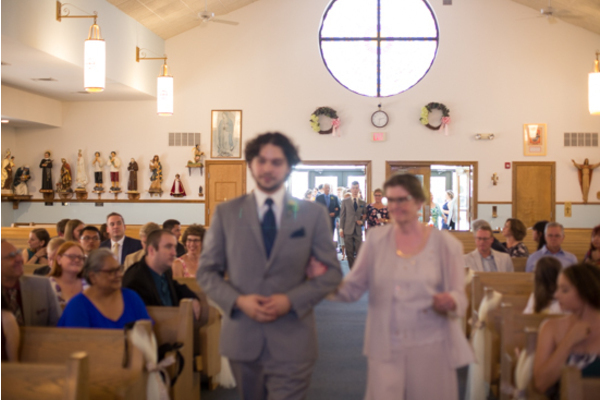 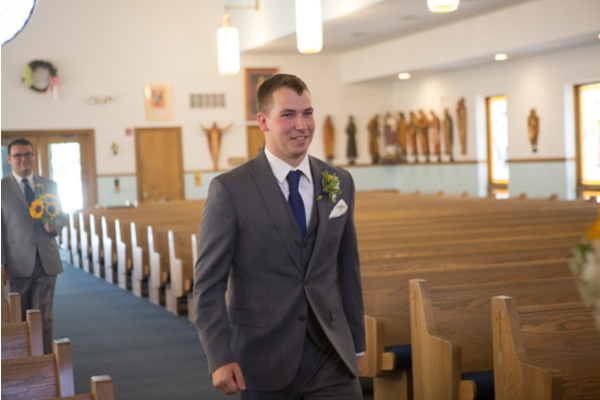 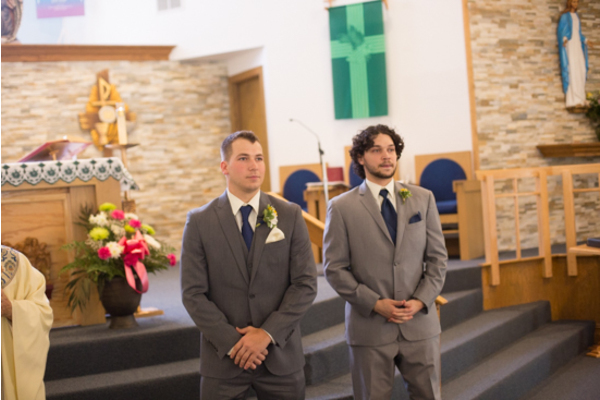 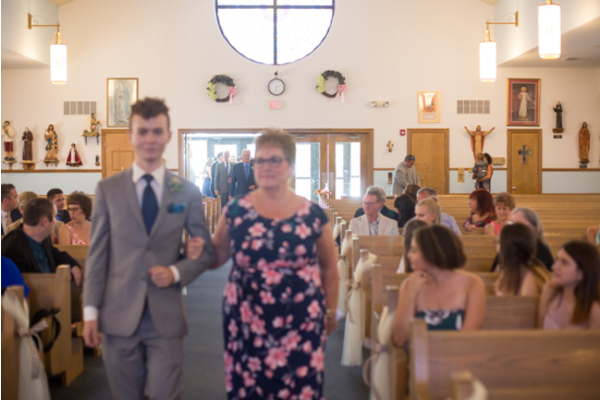 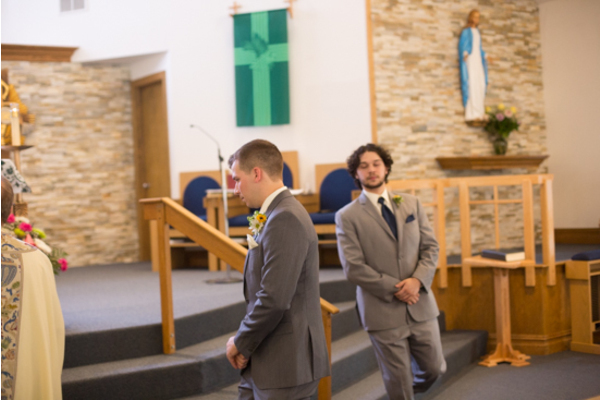 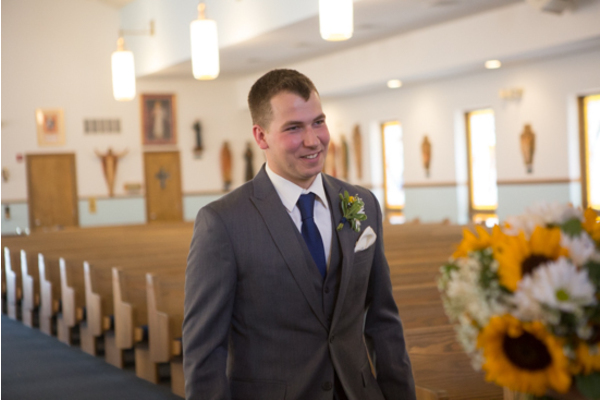 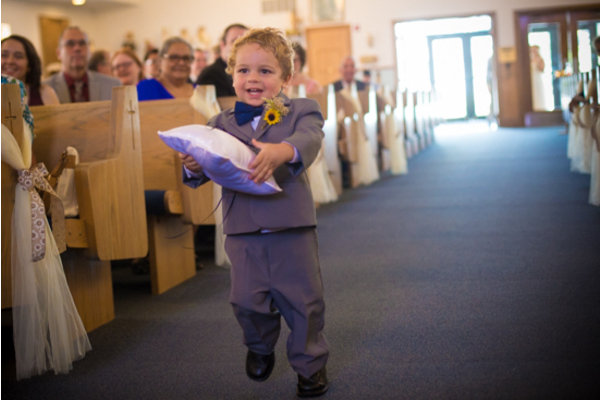 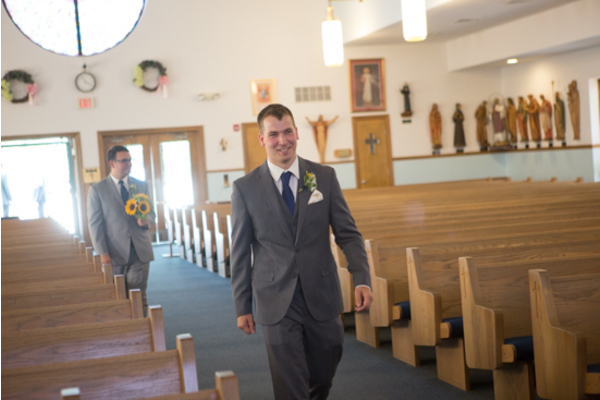 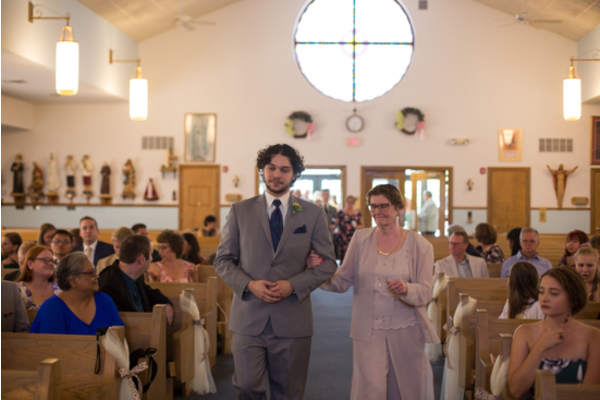 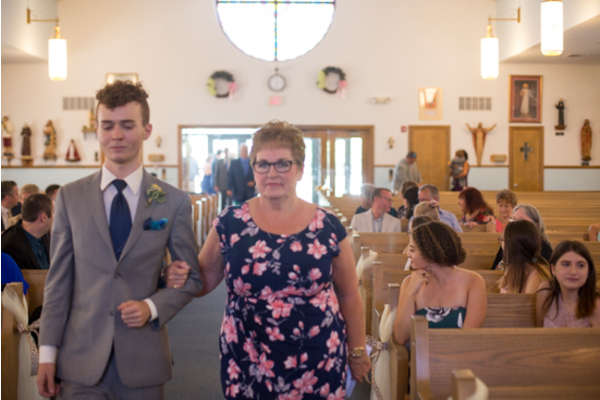 Meanwhile, Anthony waited for his stunning bride at the end of the aisle. You could tell that these two were destined to be soul mates! 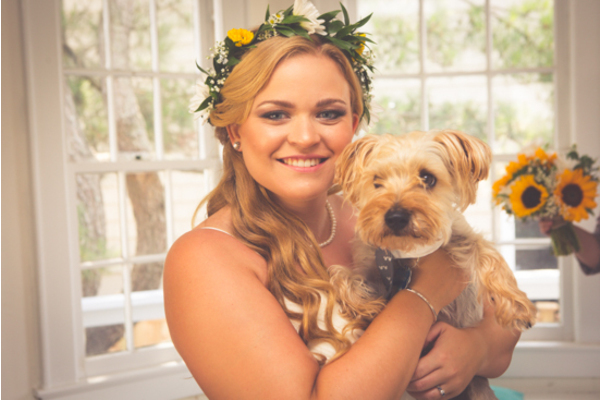 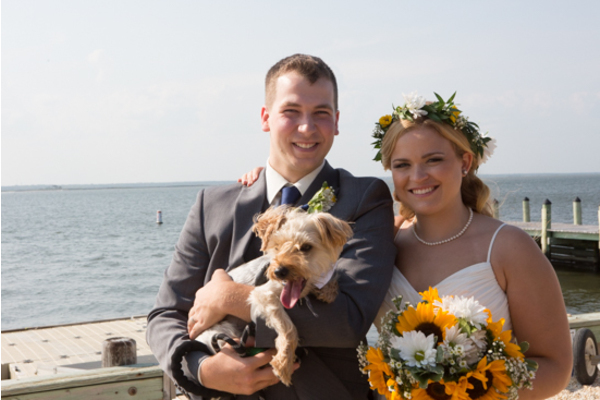 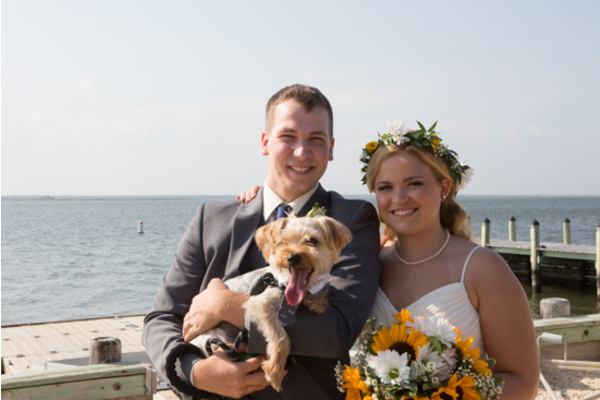 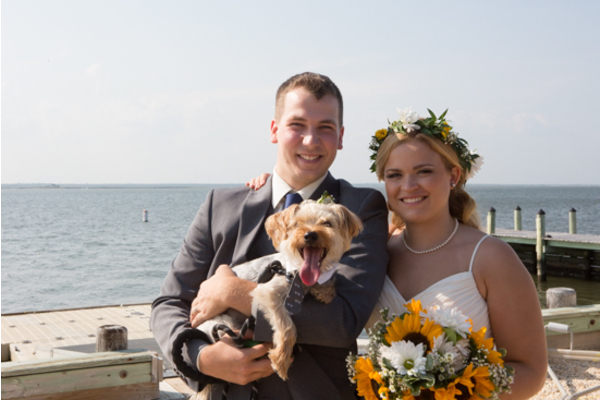 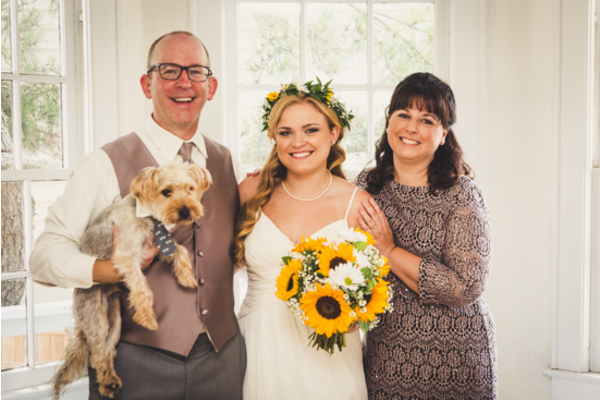 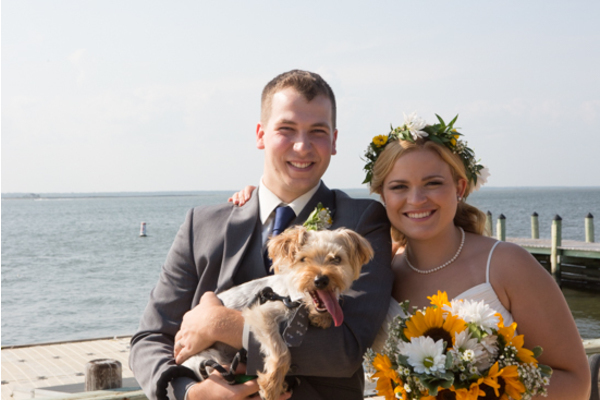 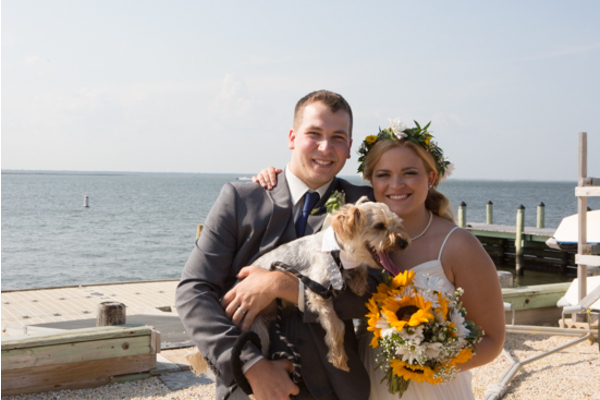 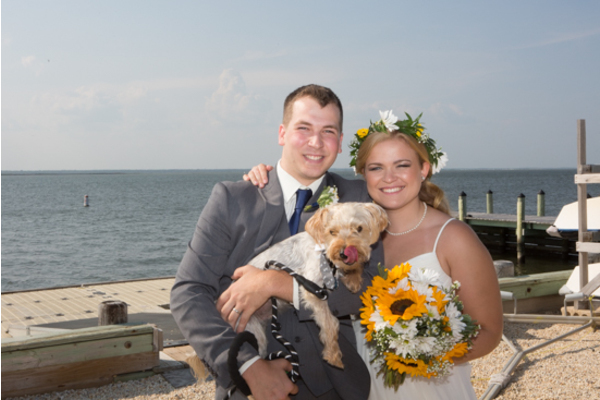 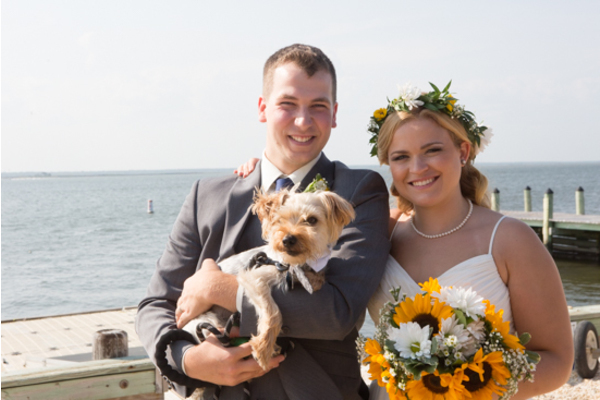 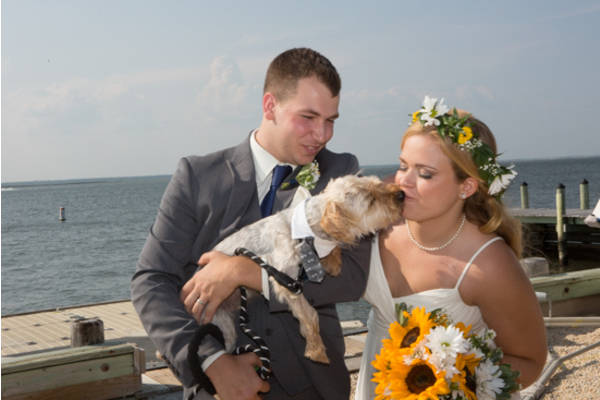 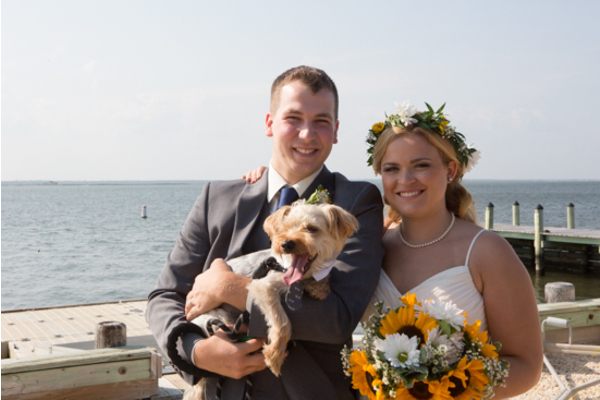 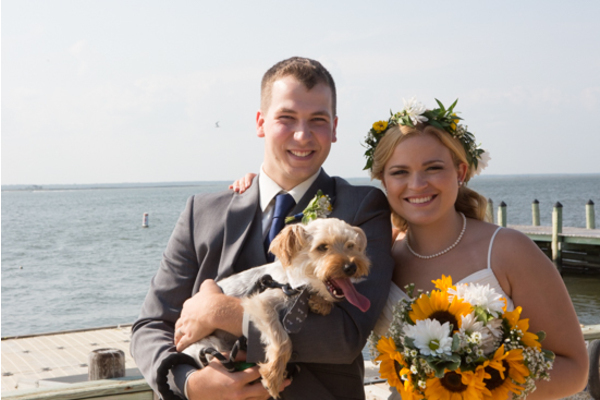 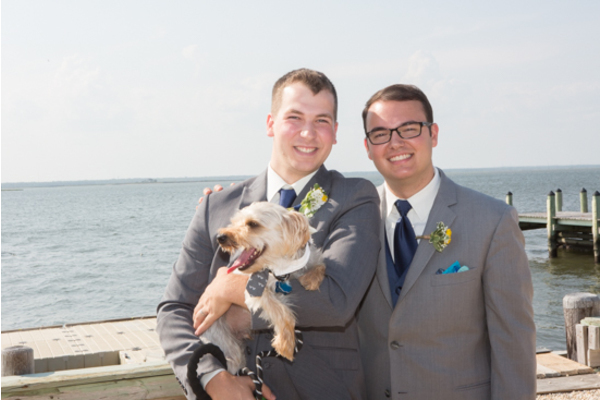 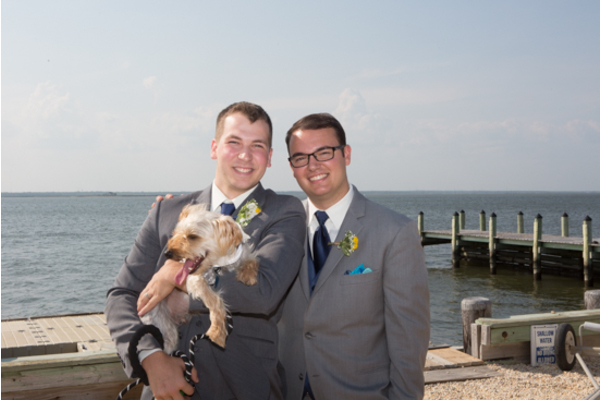 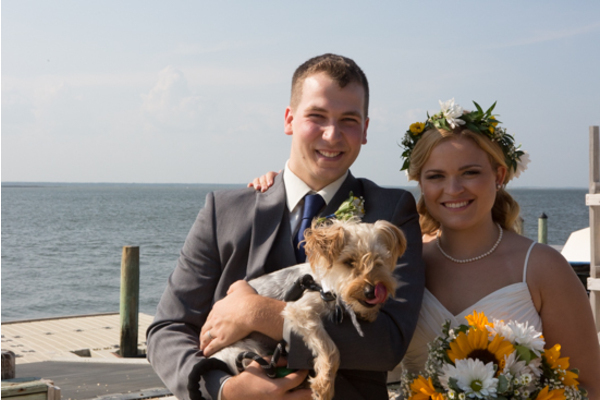 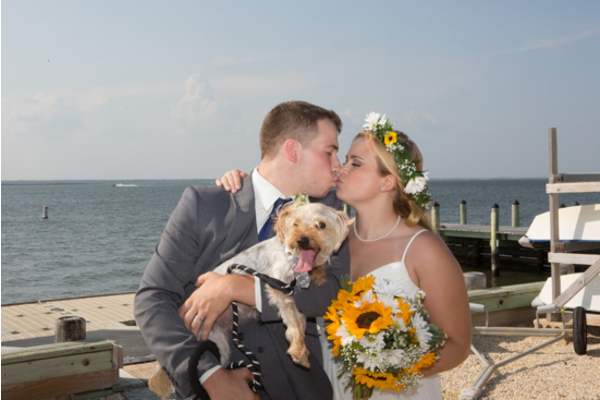 After the marriage was sealed with a kiss, our NJ Wedding Photographer captured the bride and groom posing with their dog. 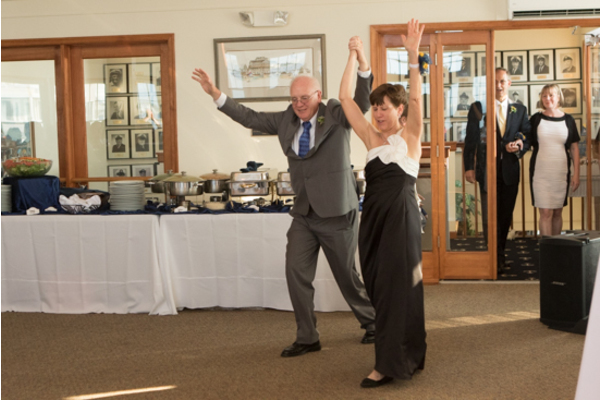 Nothing but good times were to be had all night! 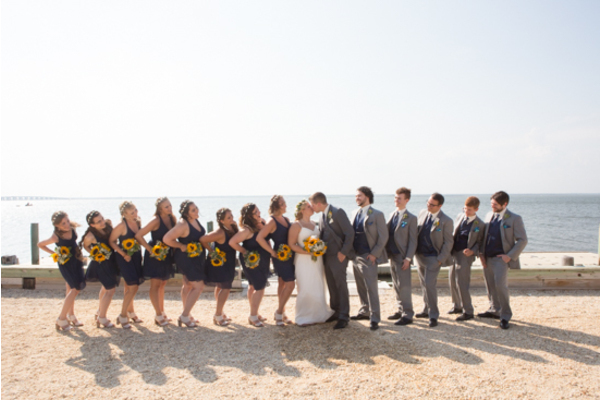 The couple made their entrance together in style, while the bridal party made an arch with their bouquets! 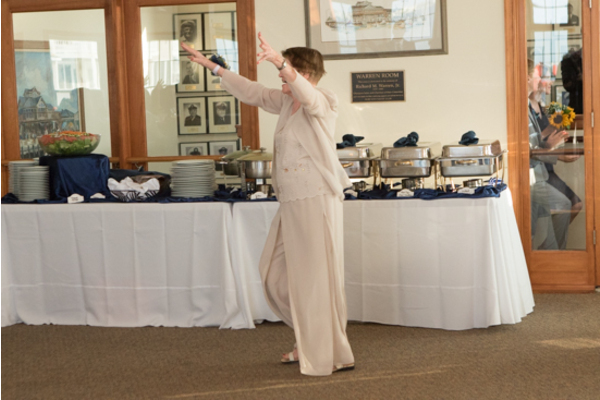 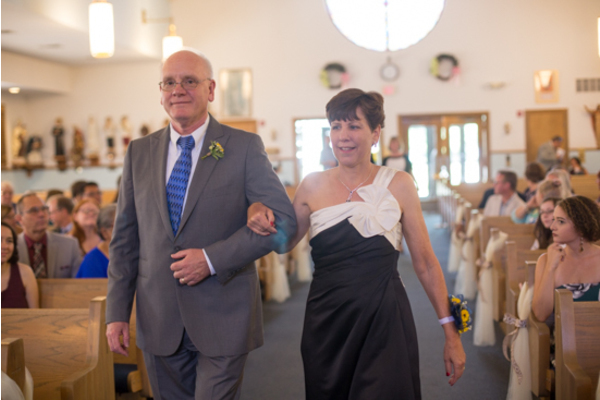 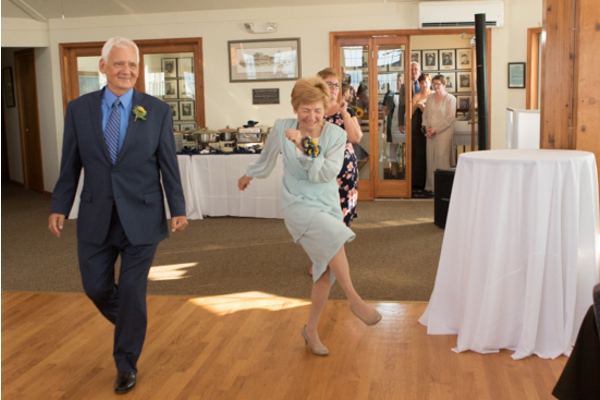 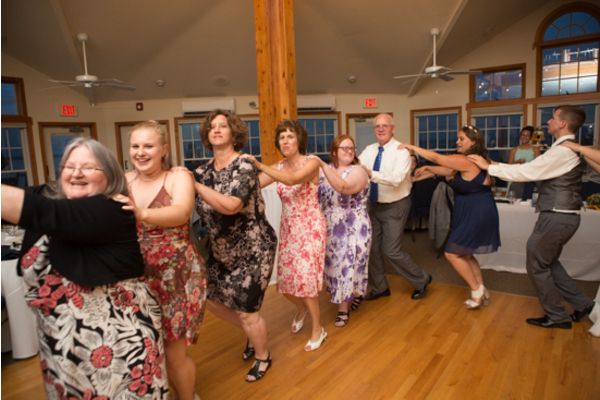 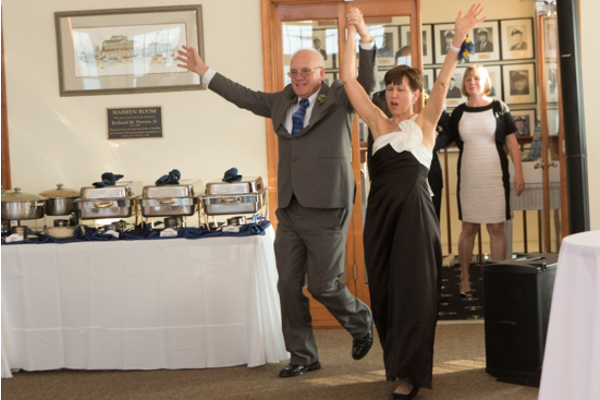 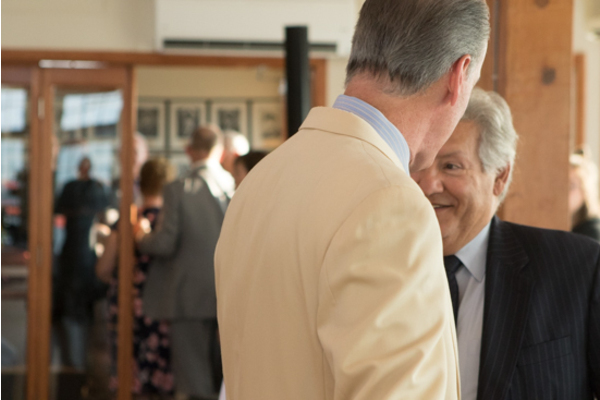 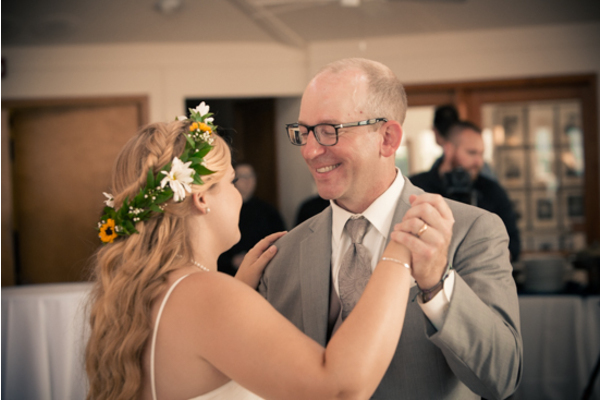 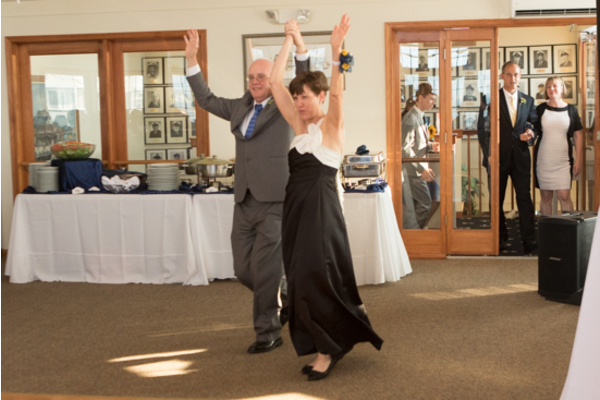 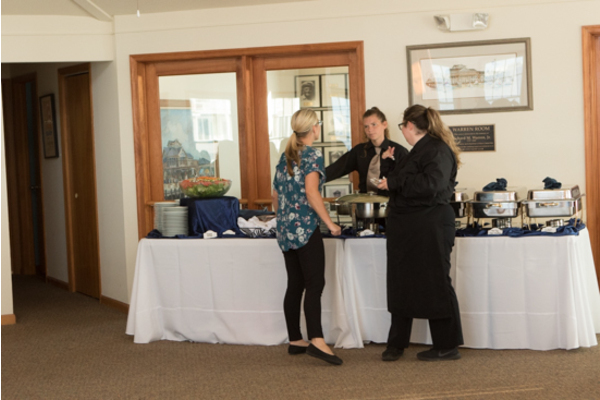 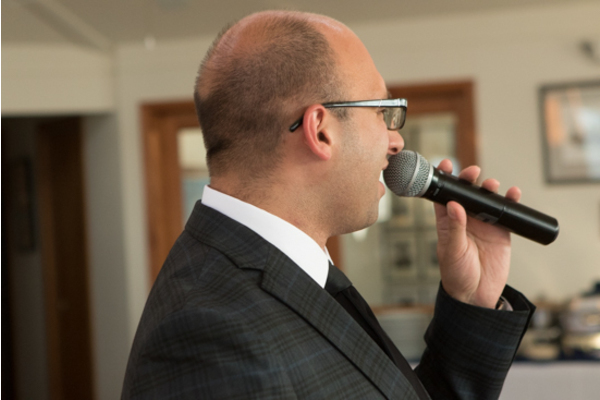 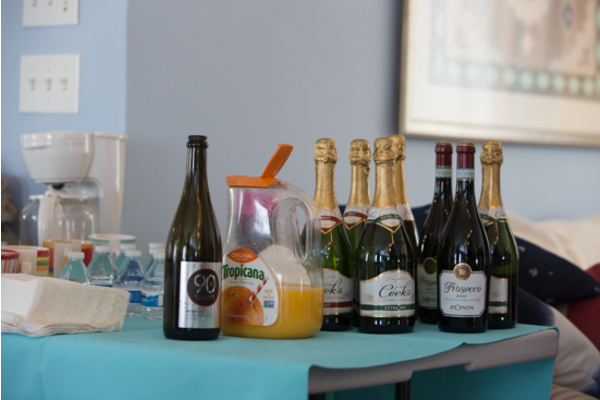 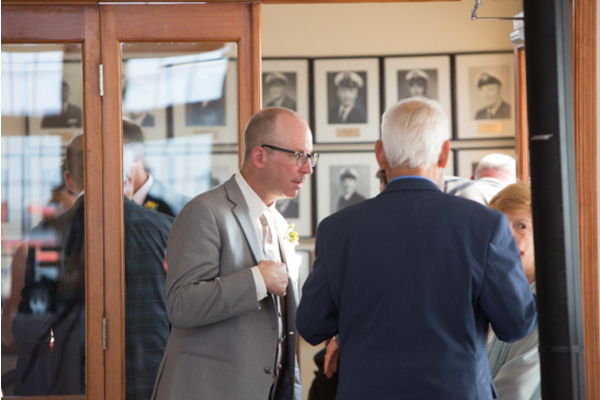 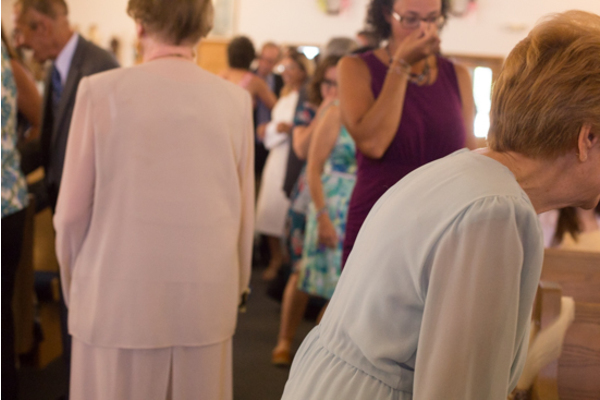 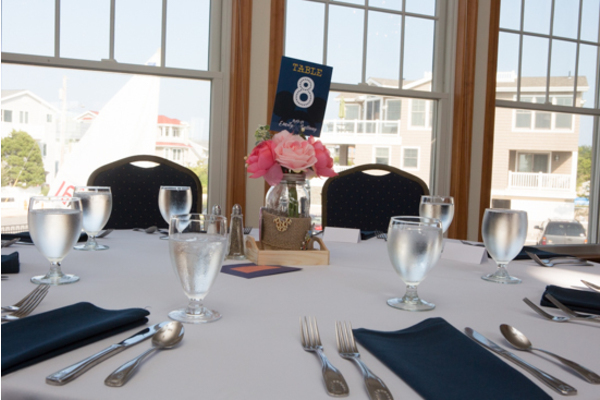 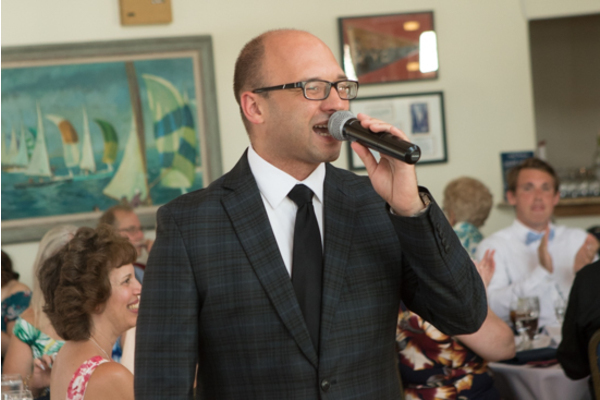 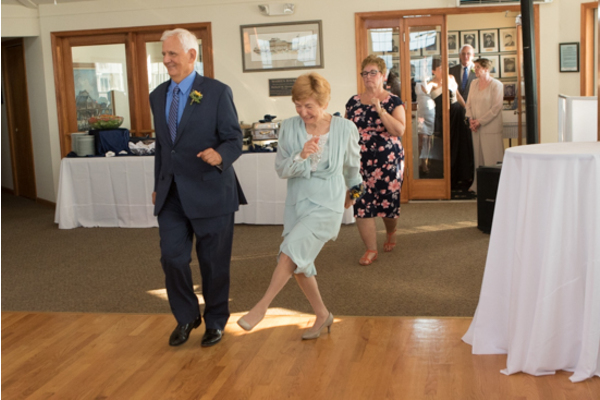 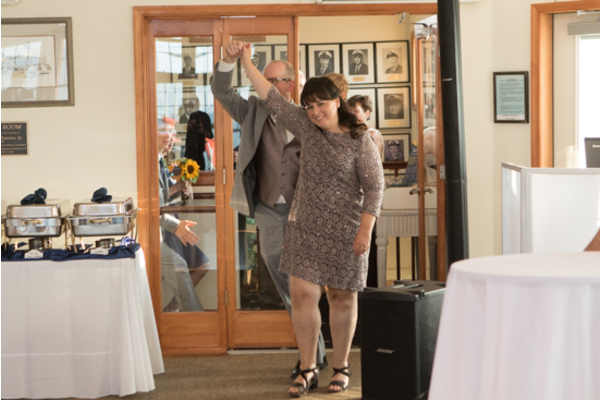 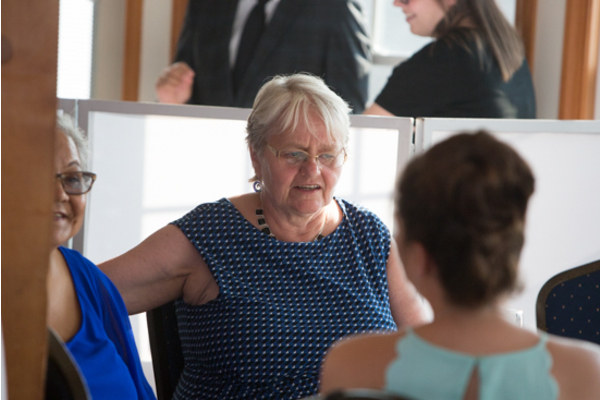 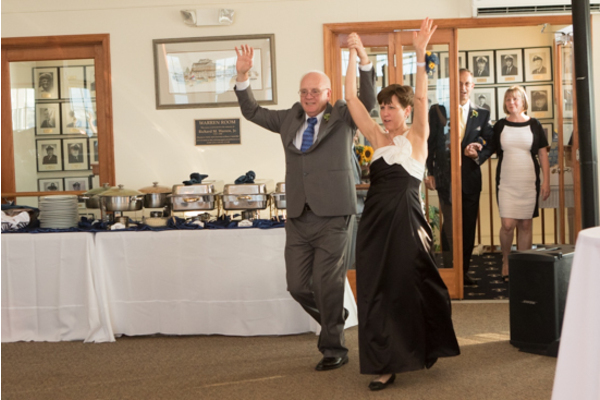 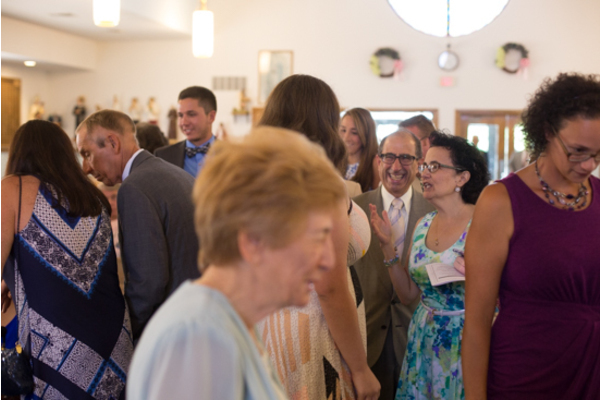 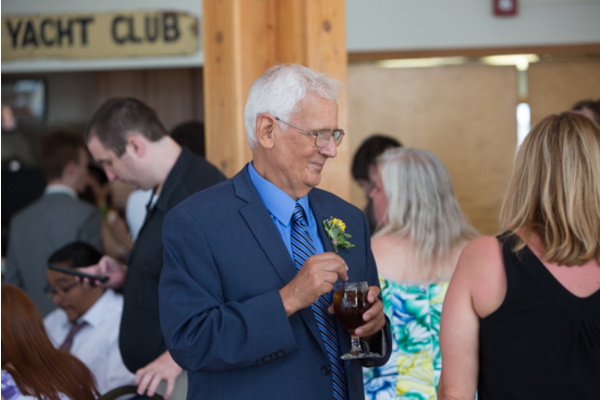 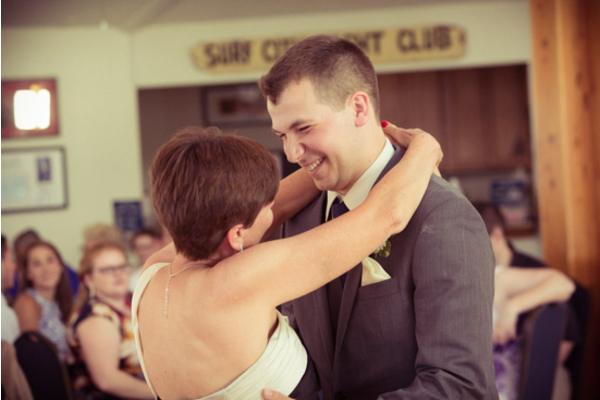 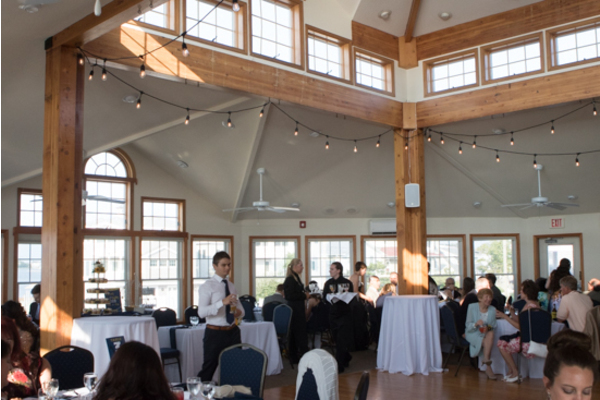 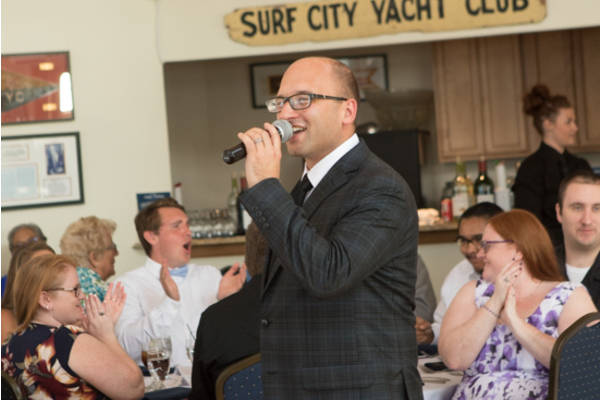 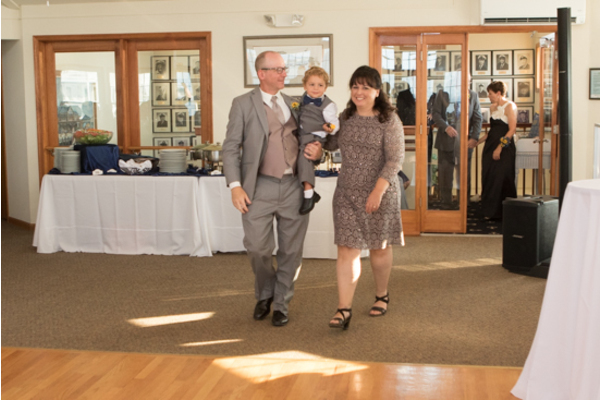 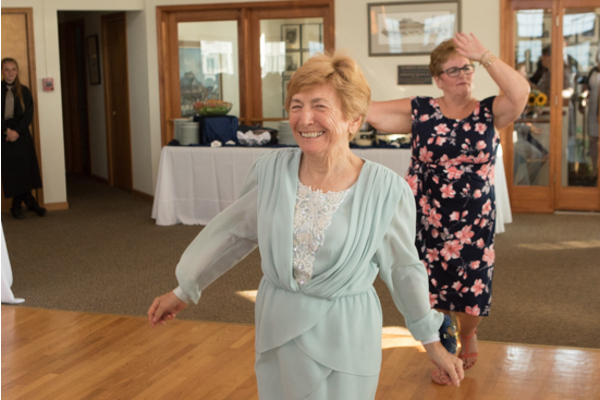 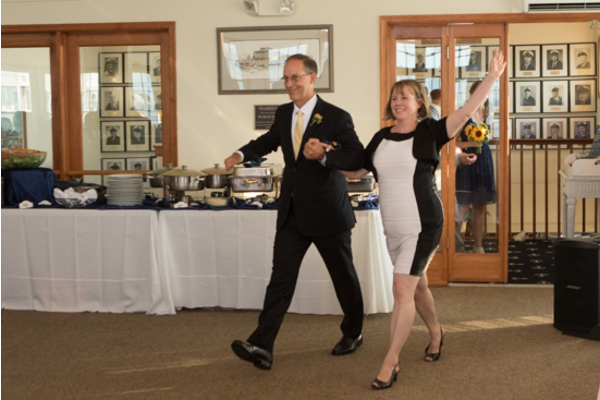 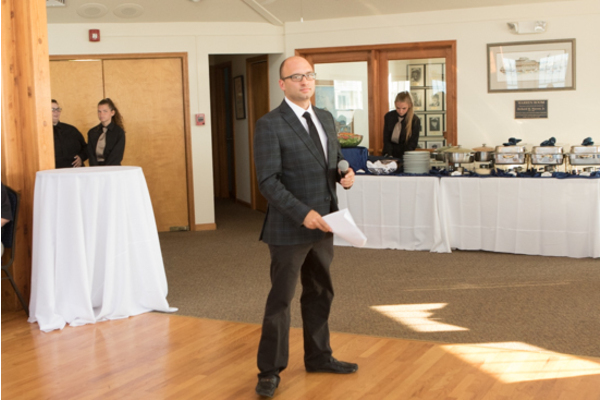 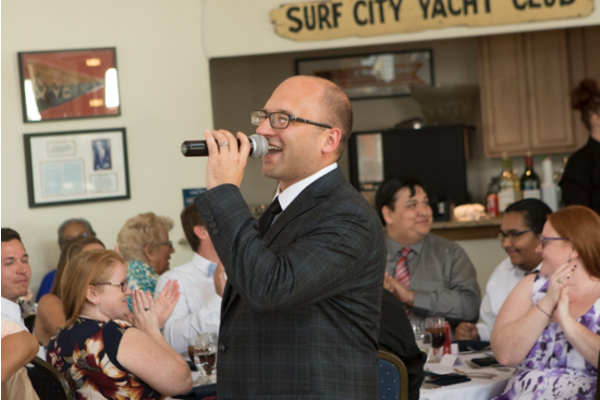 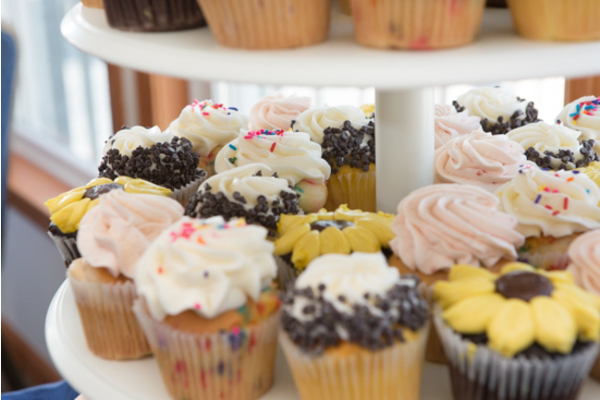 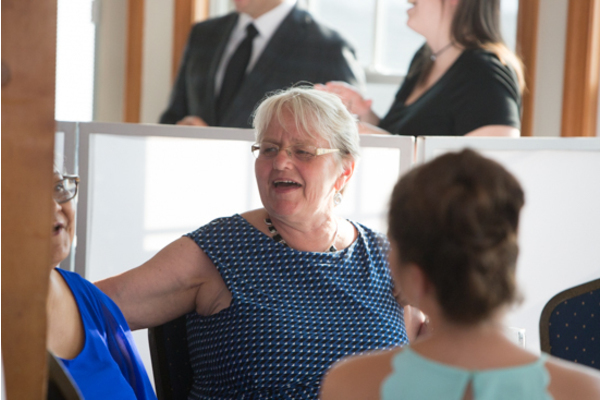 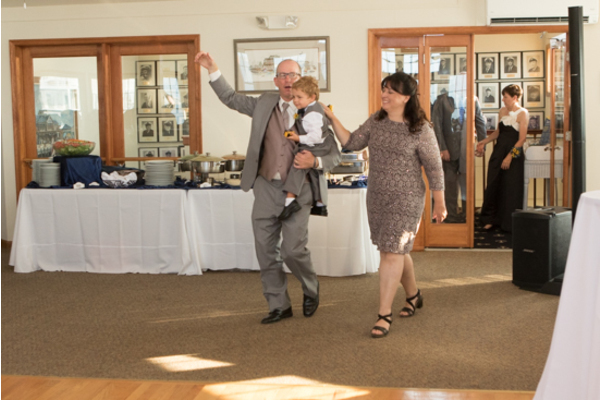 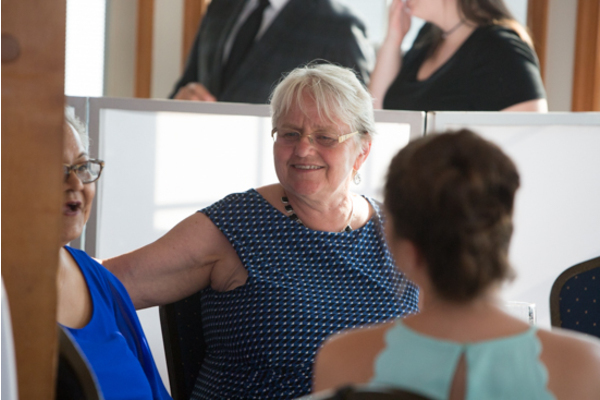 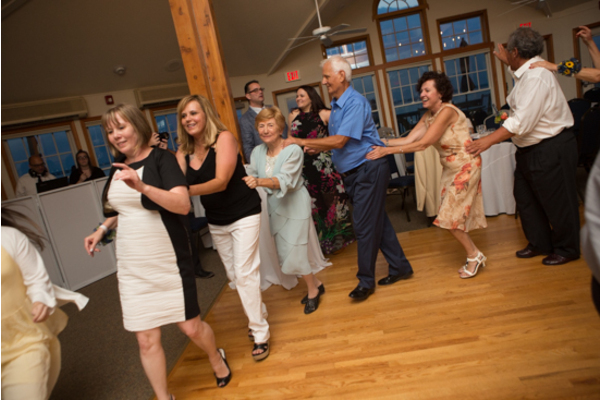 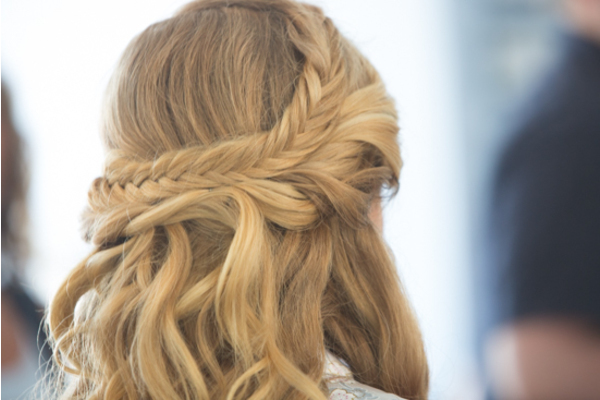 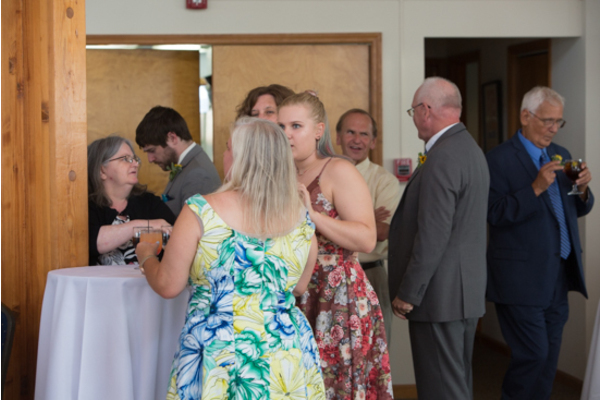 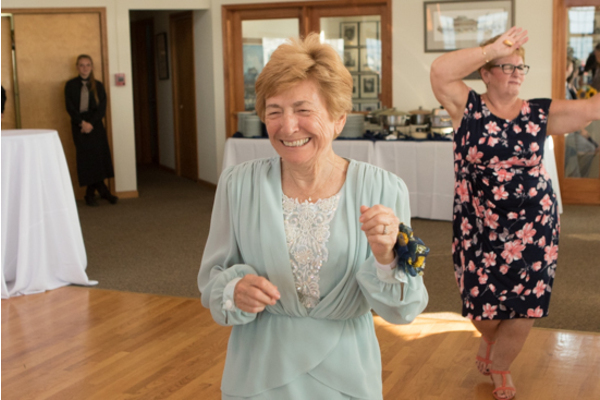 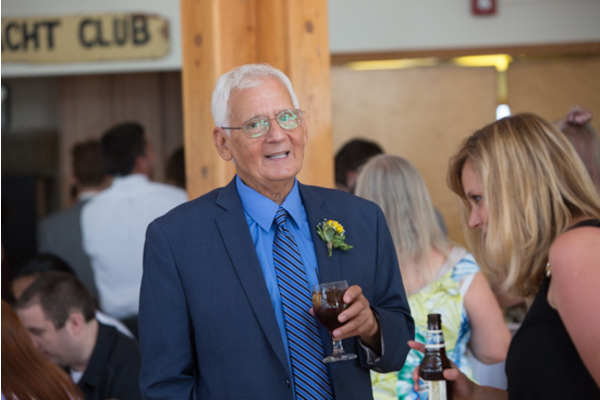 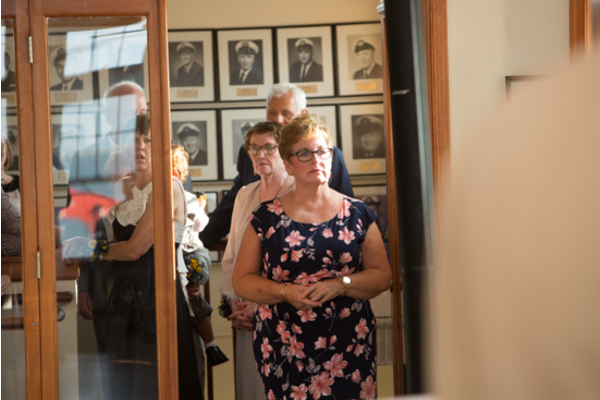 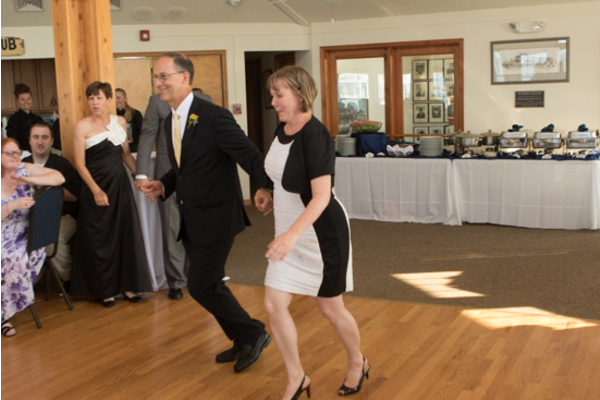 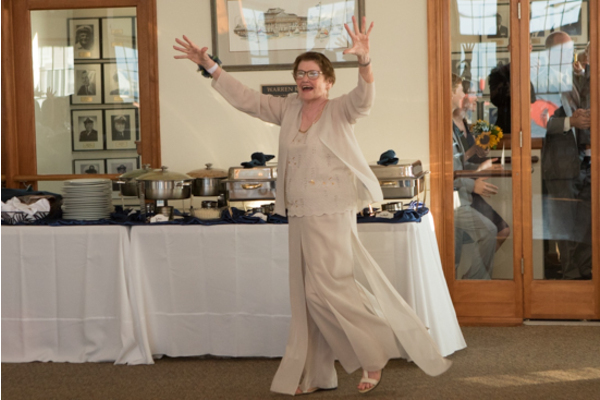 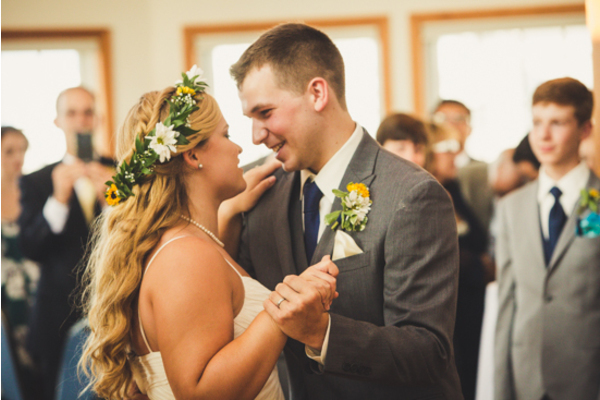 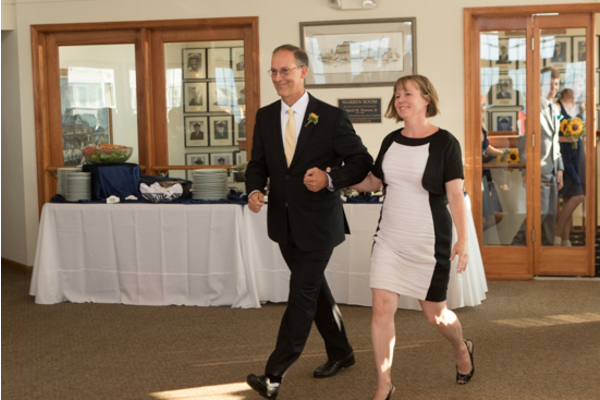 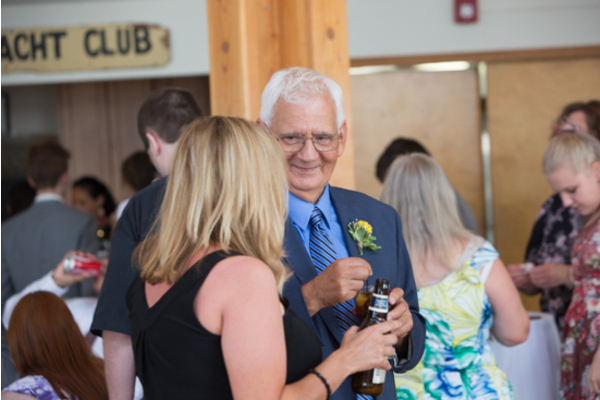 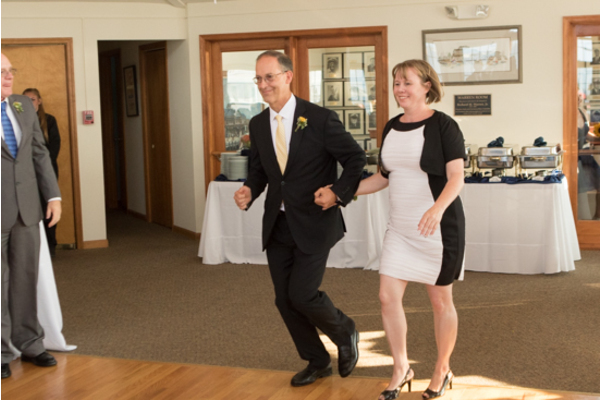 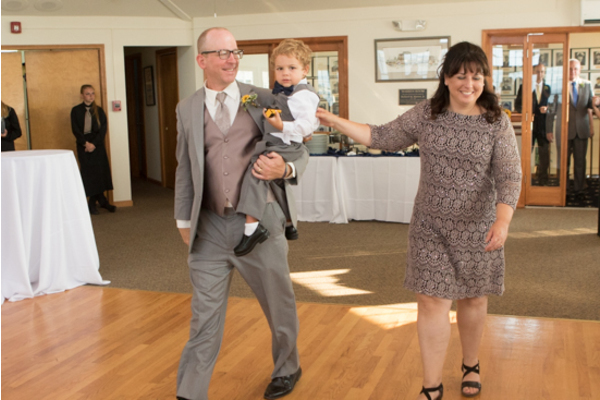 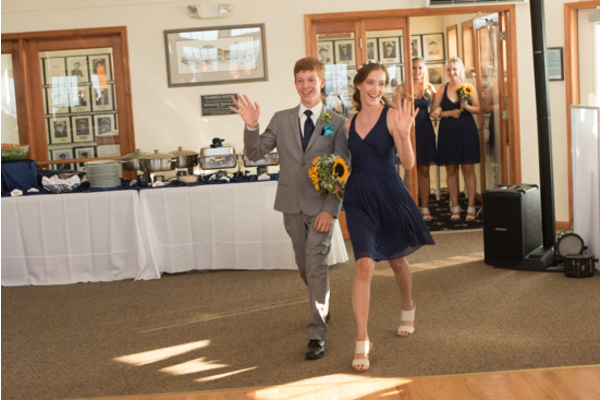 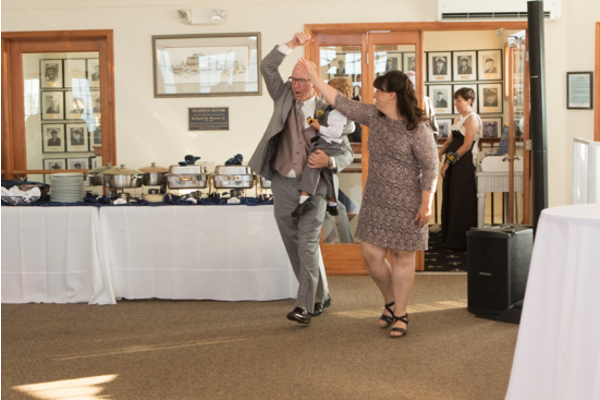 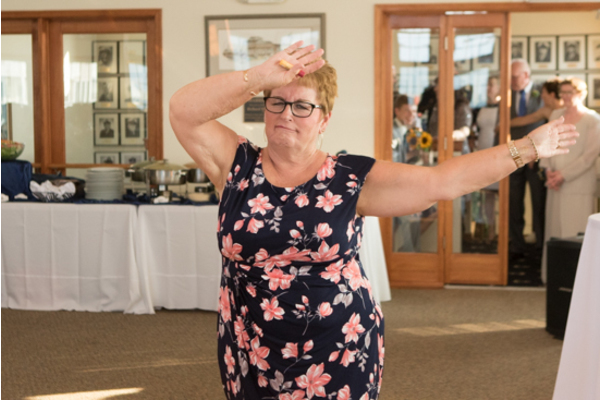 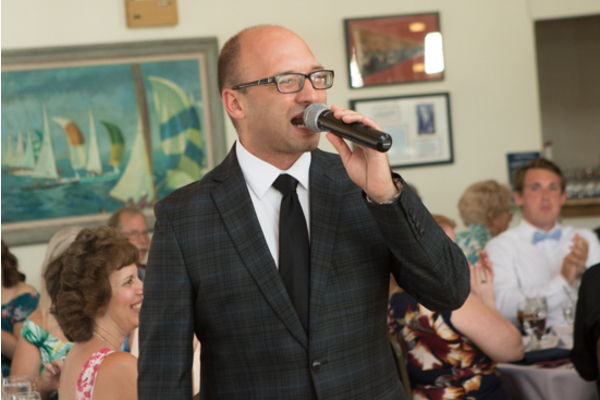 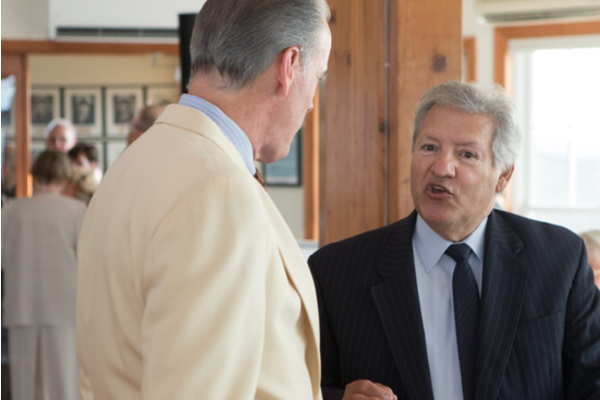 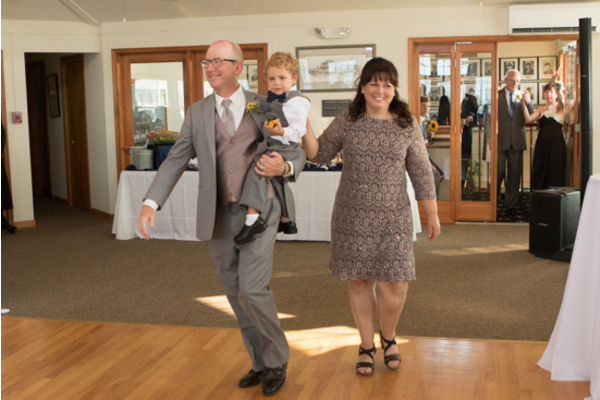 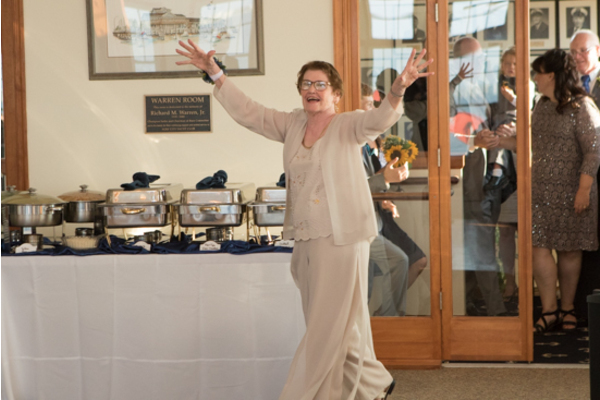 The reception was nothing short of a perfect night full of speeches, toasts, and dancing! 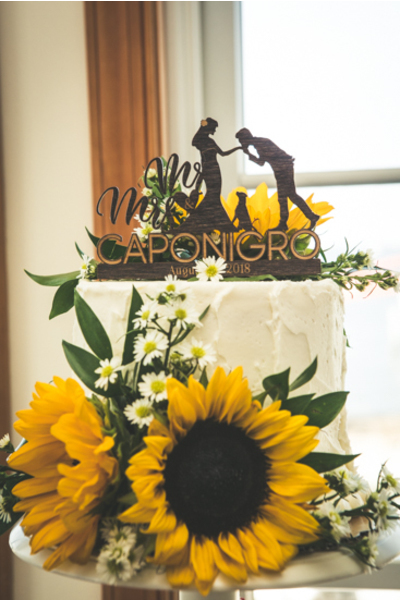 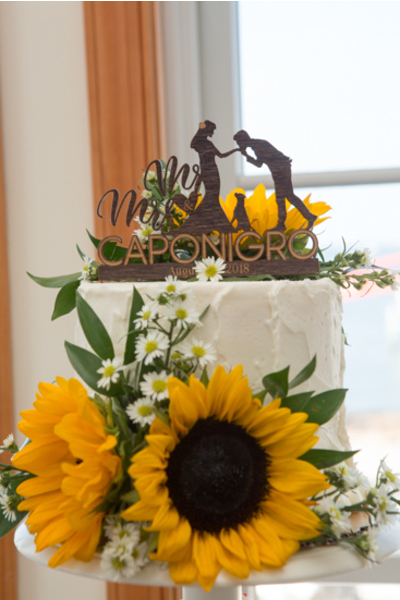 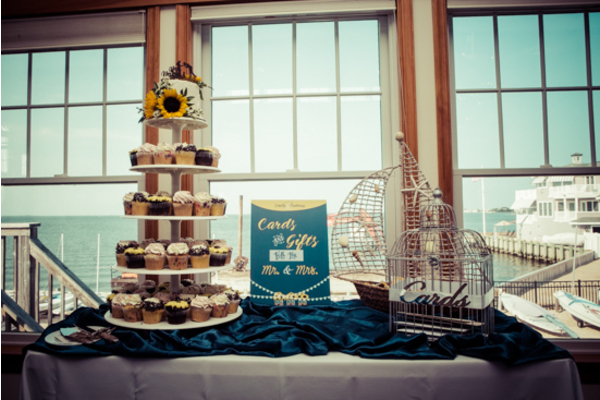 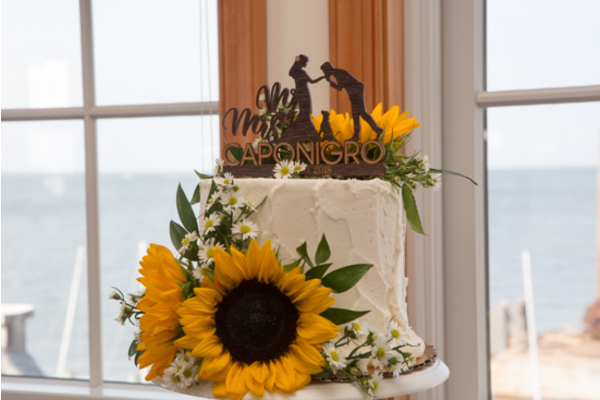 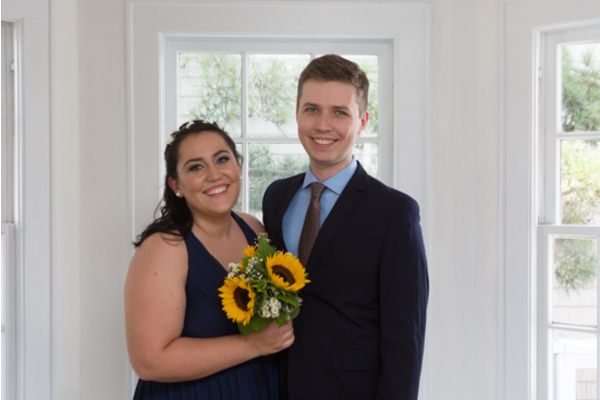 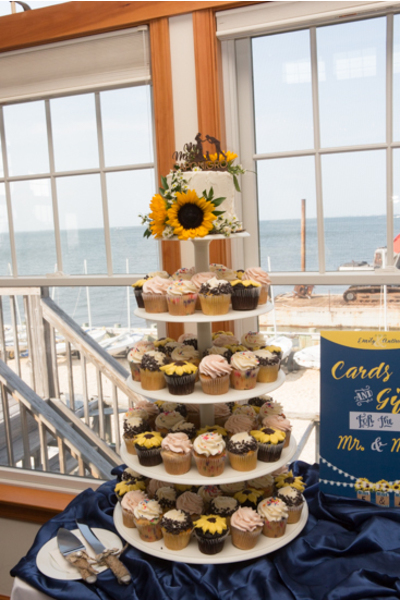 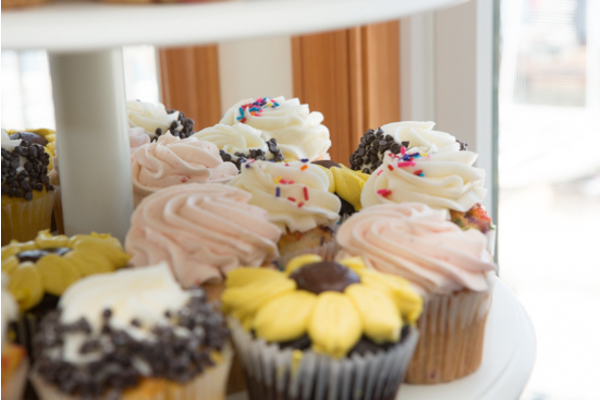 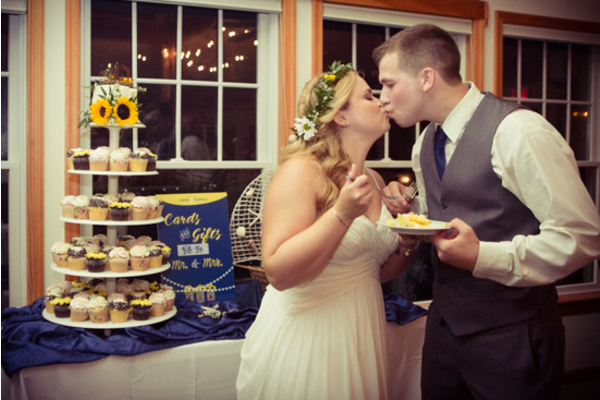 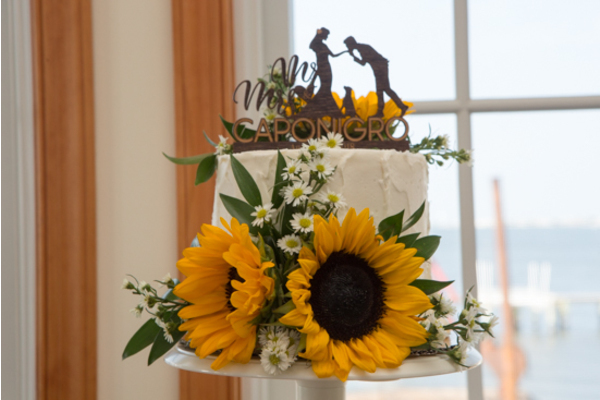 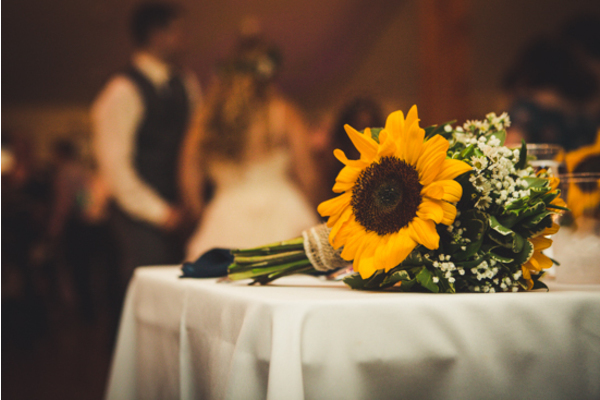 The couple had a gorgeous sunflower cake. 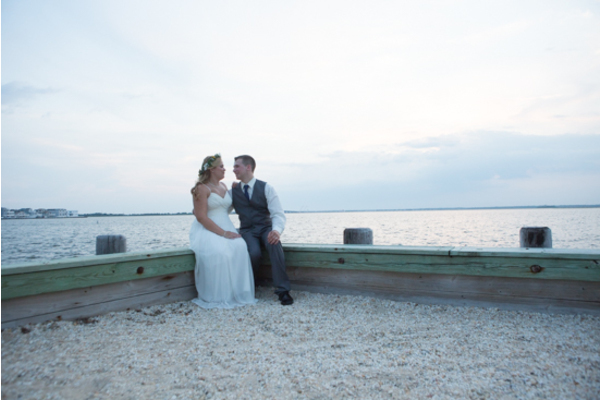 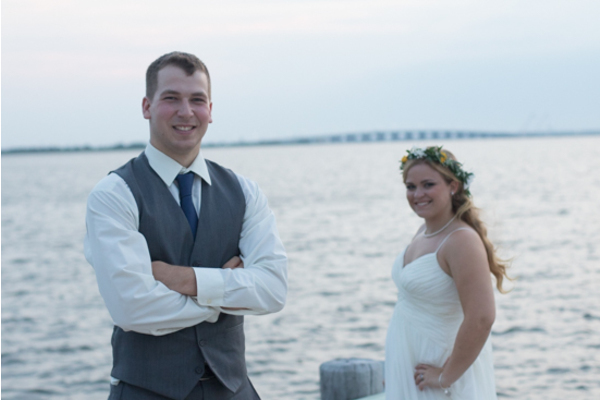 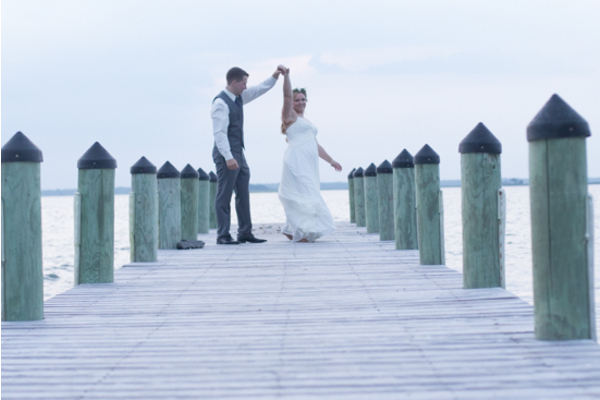 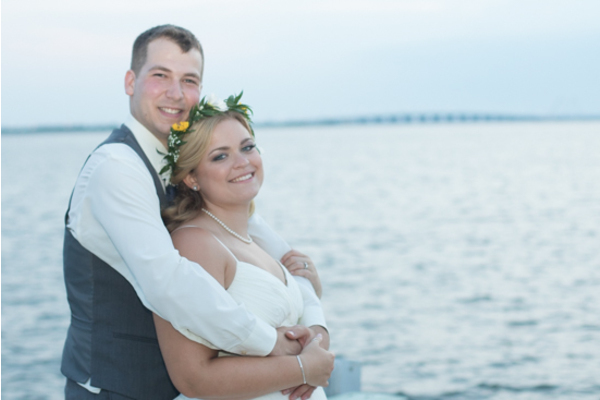 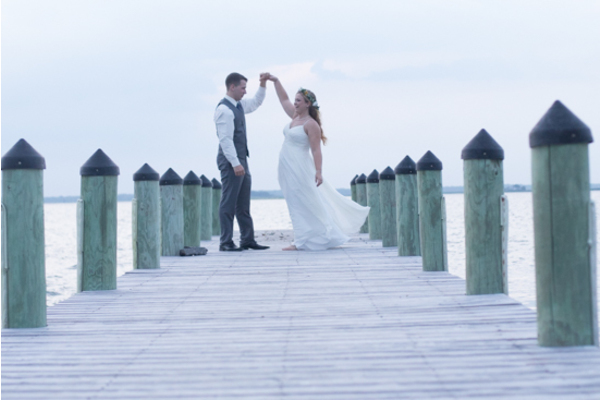 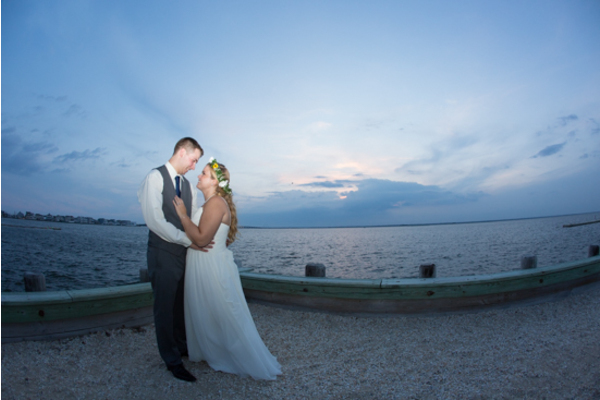 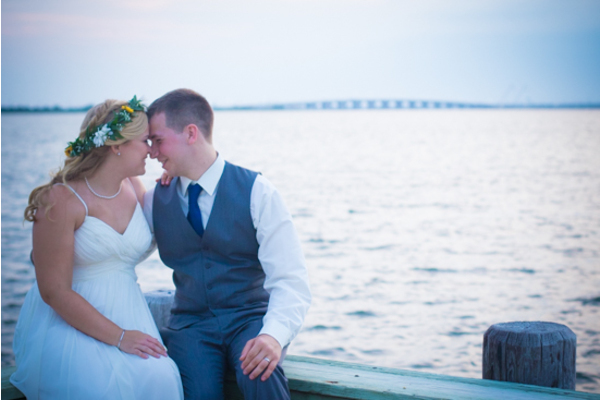 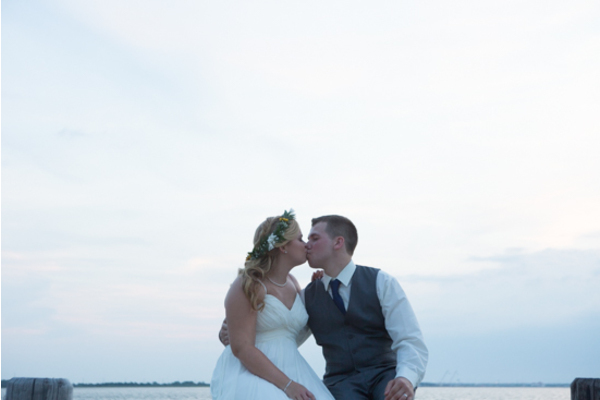 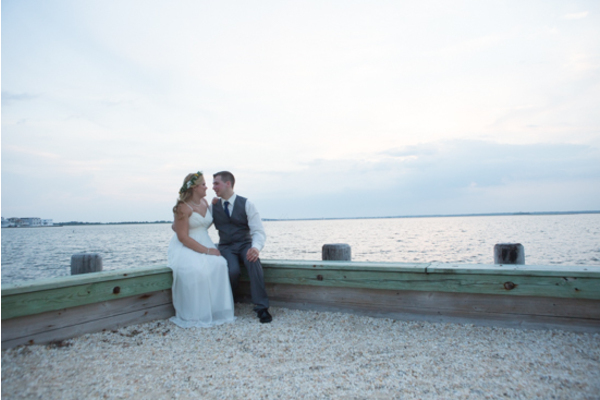 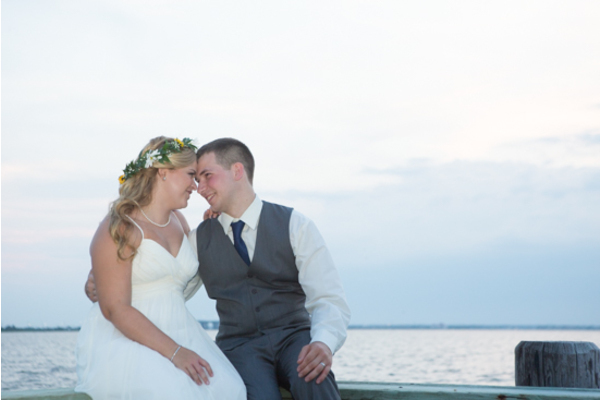 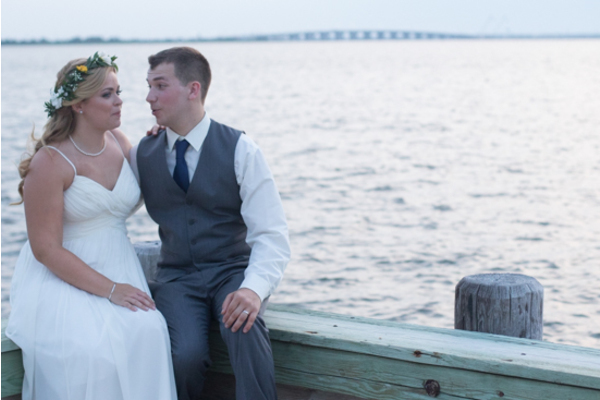 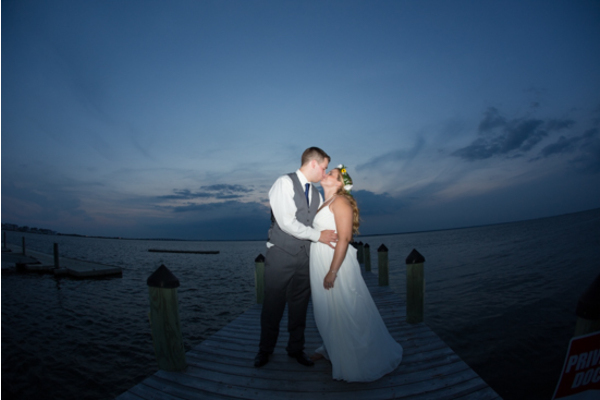 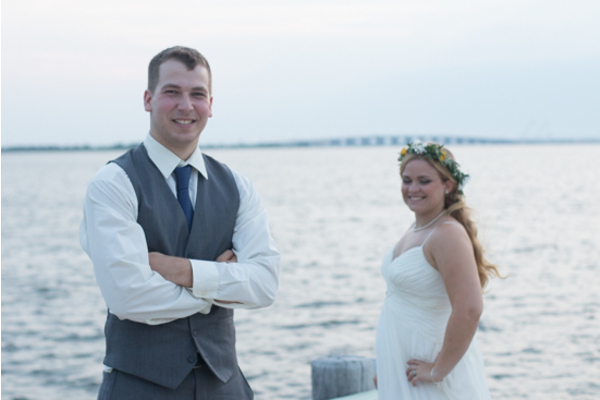 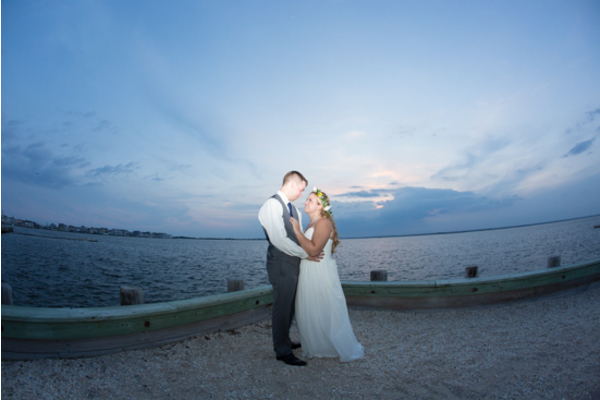 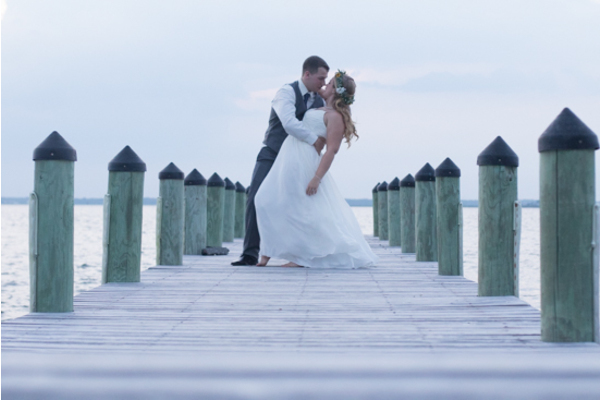 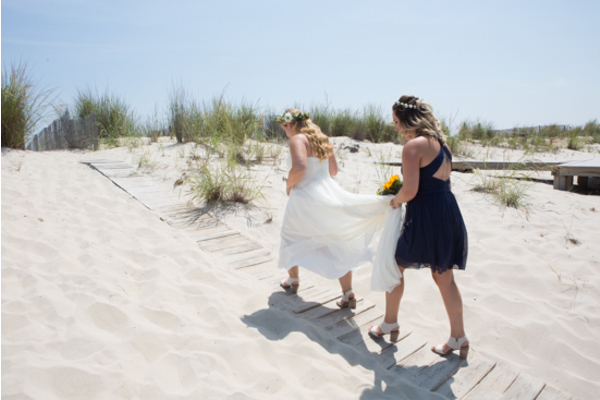 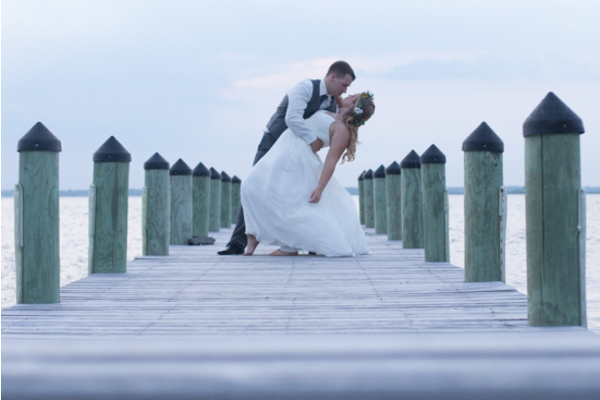 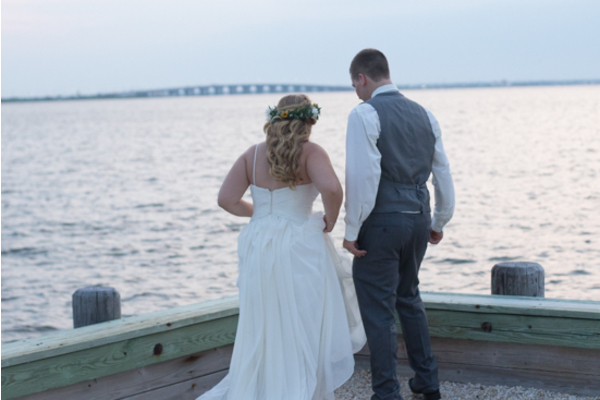 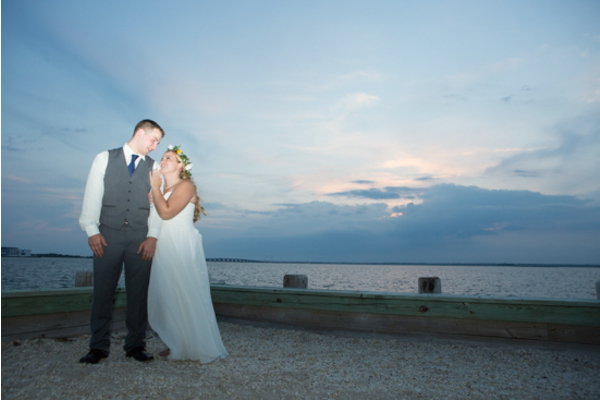 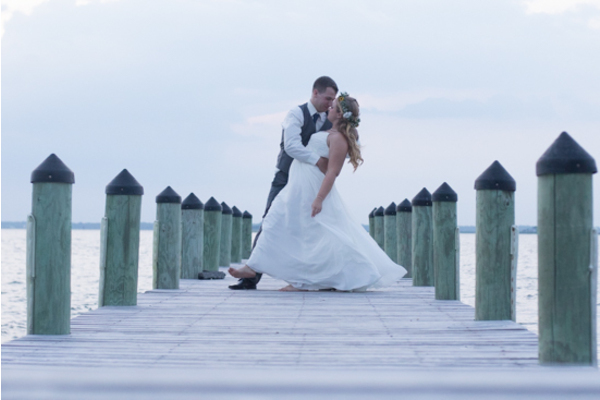 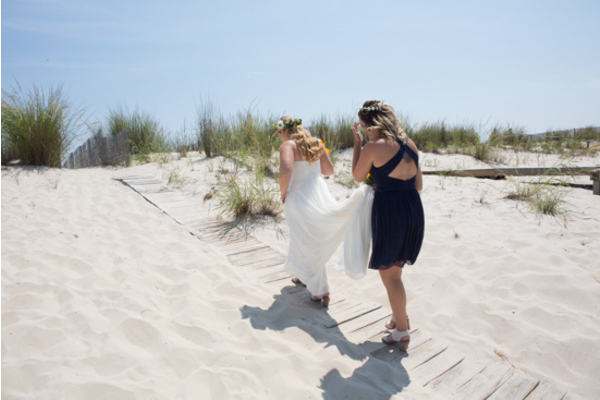 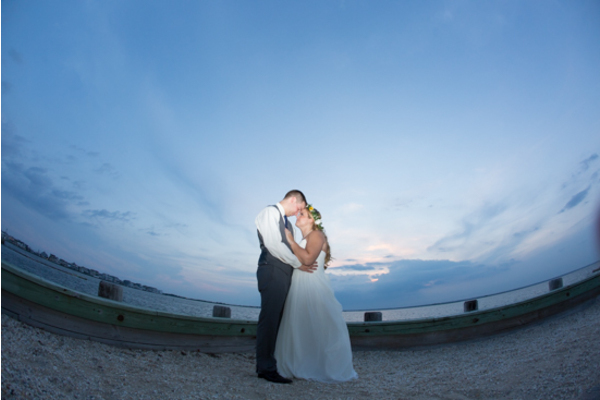 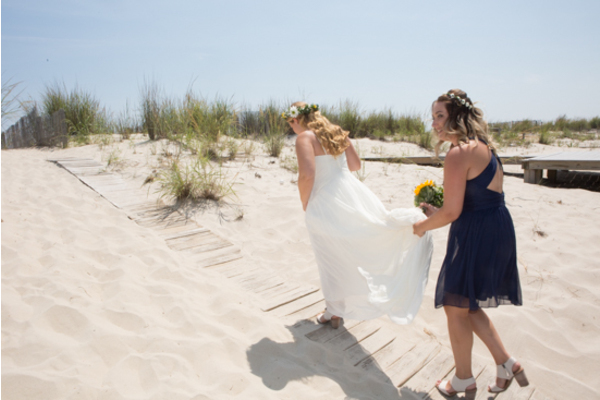 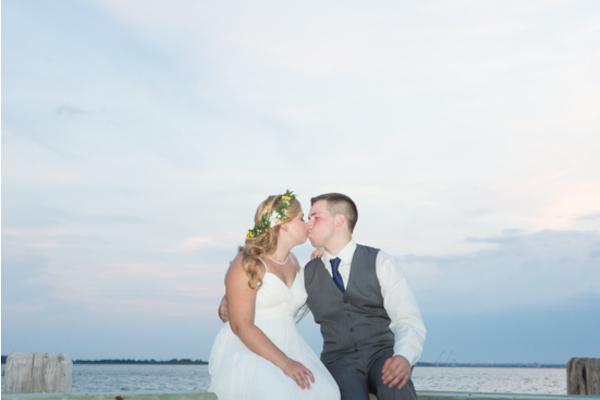 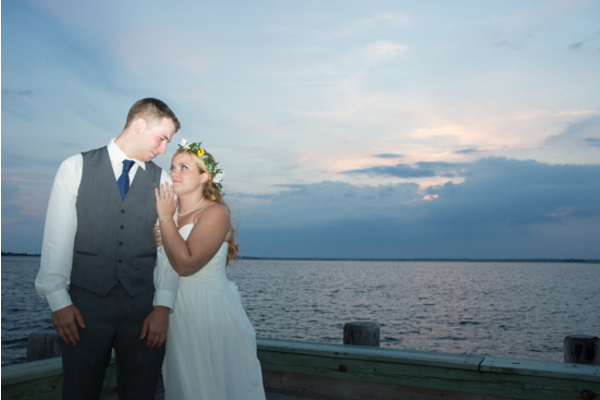 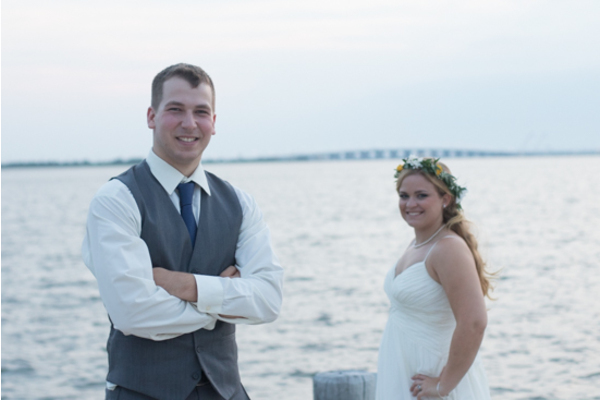 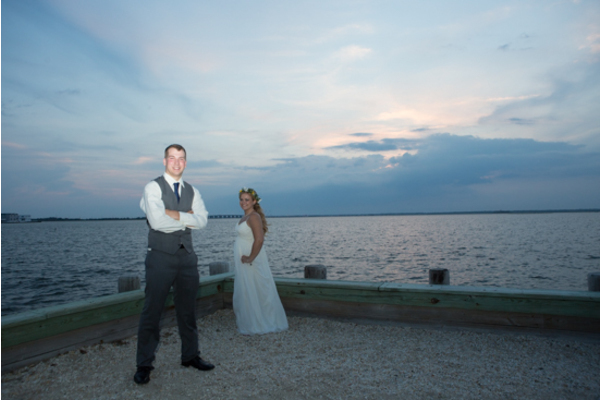 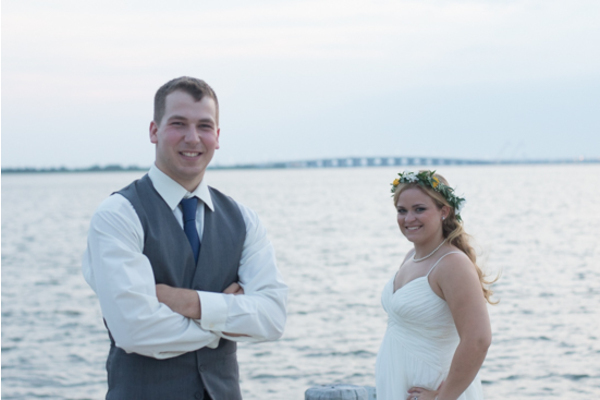 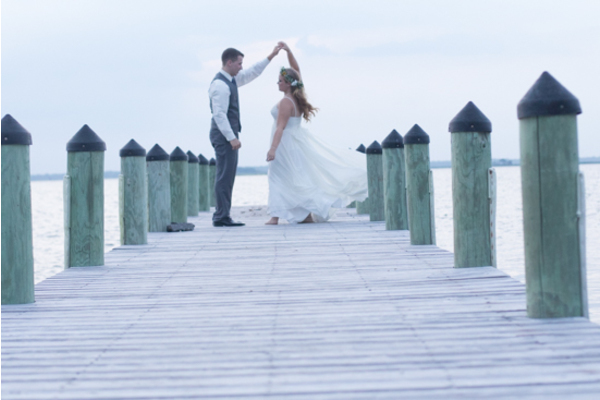 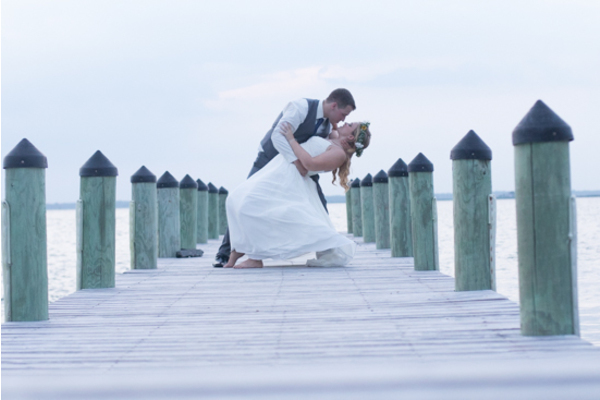 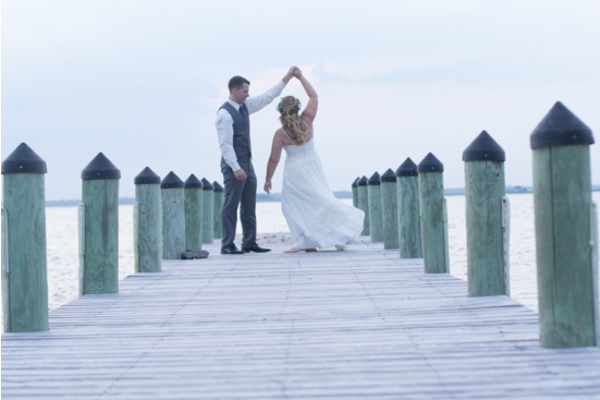 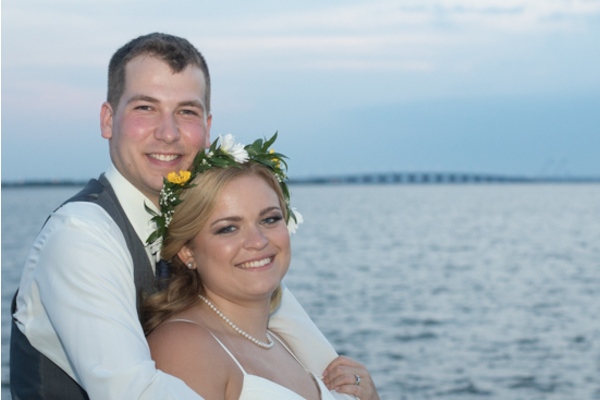 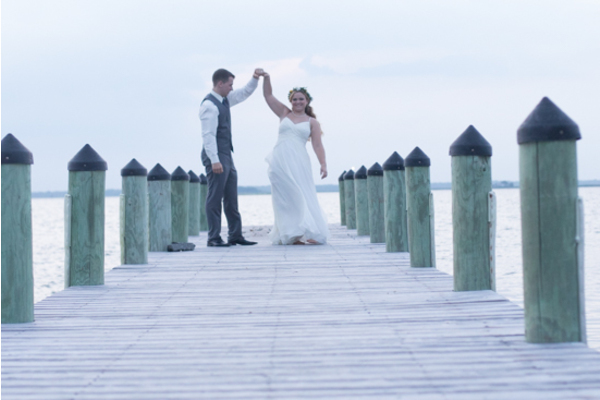 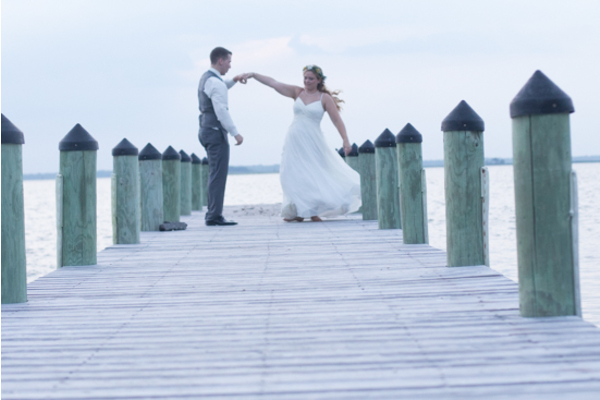 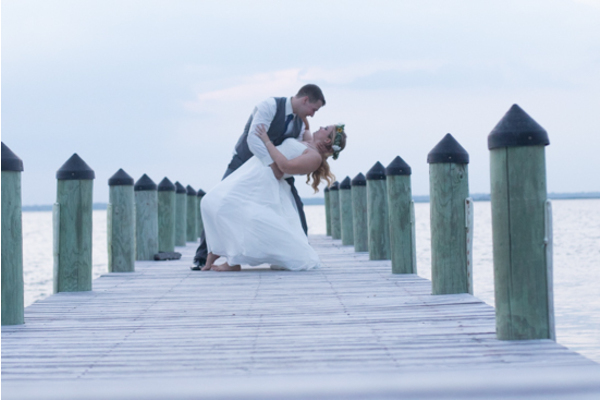 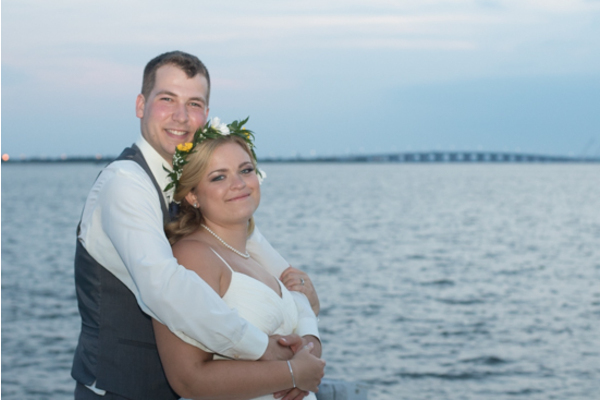 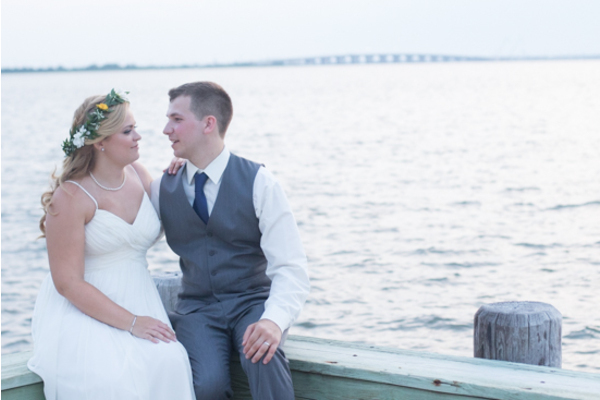 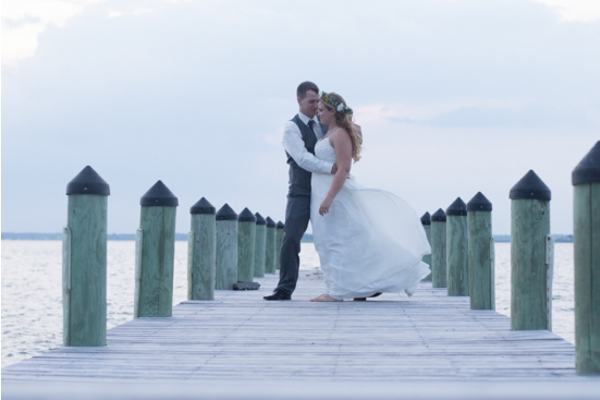 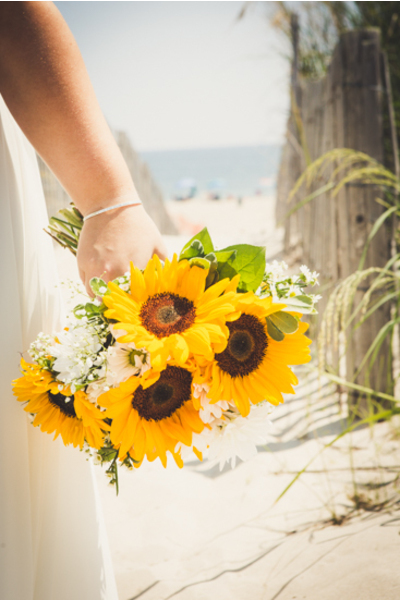 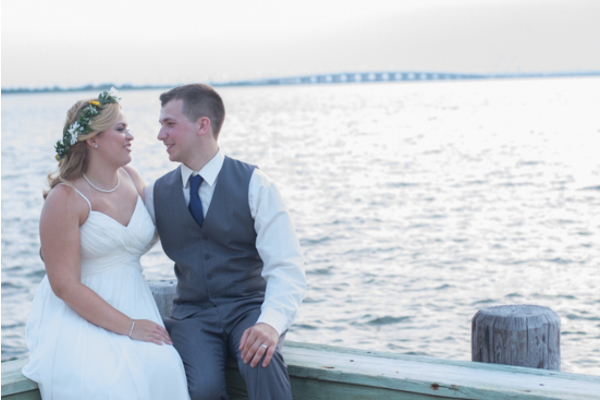 Before the sun was setting on their magical day, the newlyweds were photographed by our NJ Wedding Photographer at the beach. 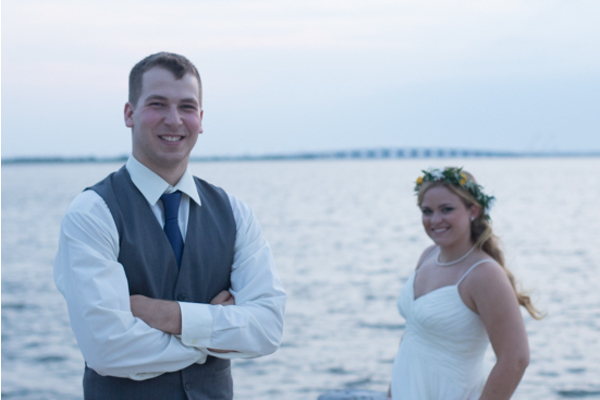 Congrats again to this beautiful couple. 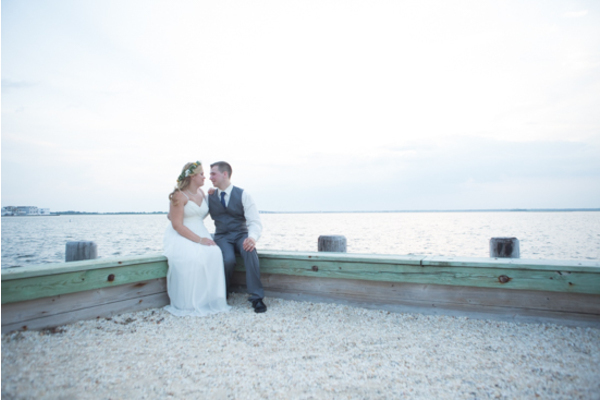 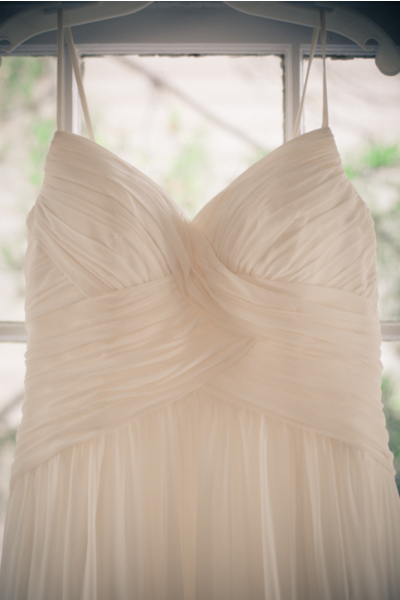 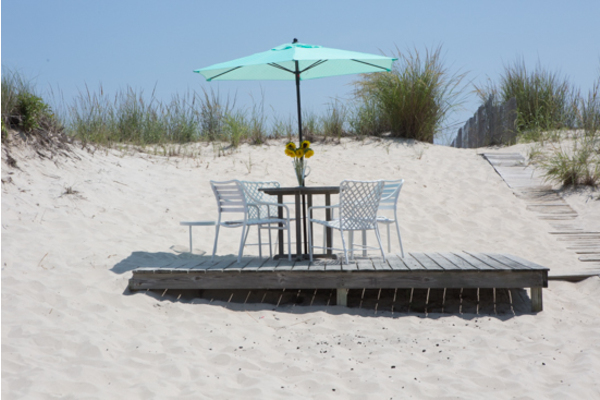 We wish you a forever love as wide as the beaches!